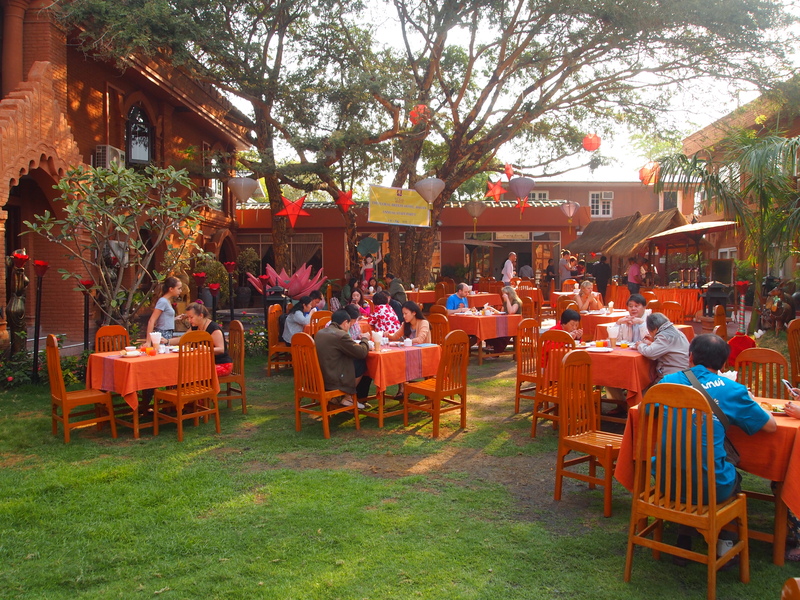 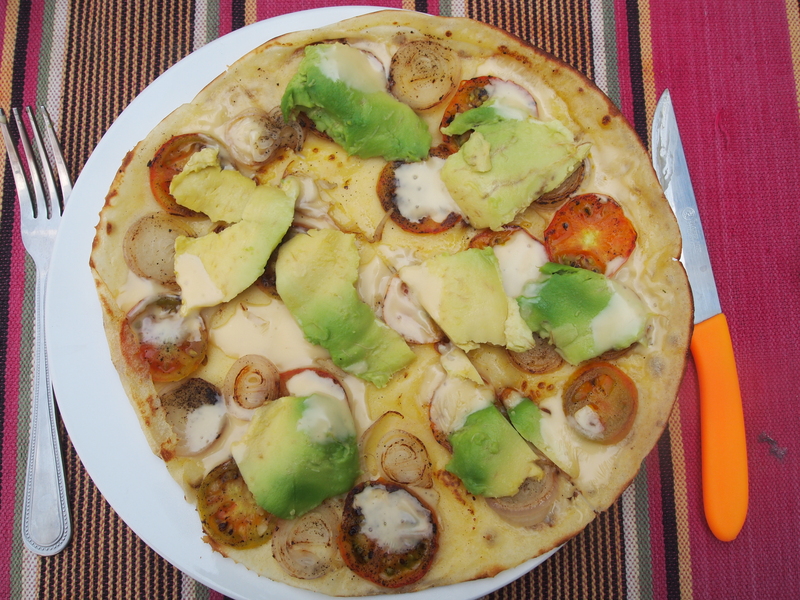 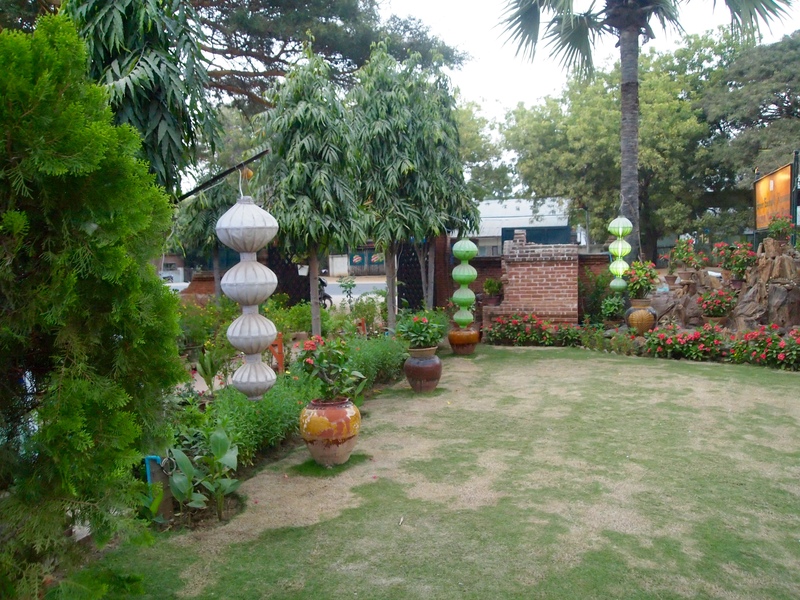 Thursday, February 19: This morning, I enjoy a buffet breakfast in the courtyard of my hotel, the Floral Breeze. 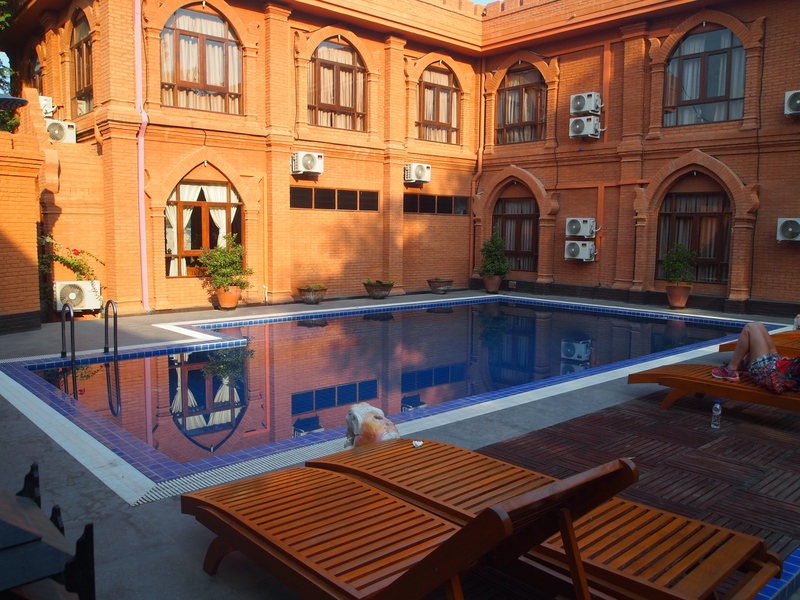 It’s a lovely spot with a pool and gardens, and luckily it’s not too hot at this time of year. 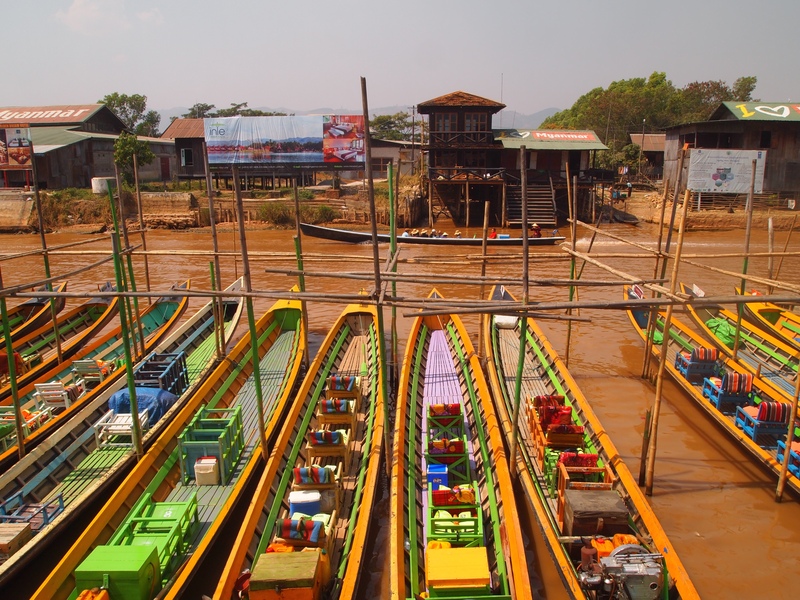 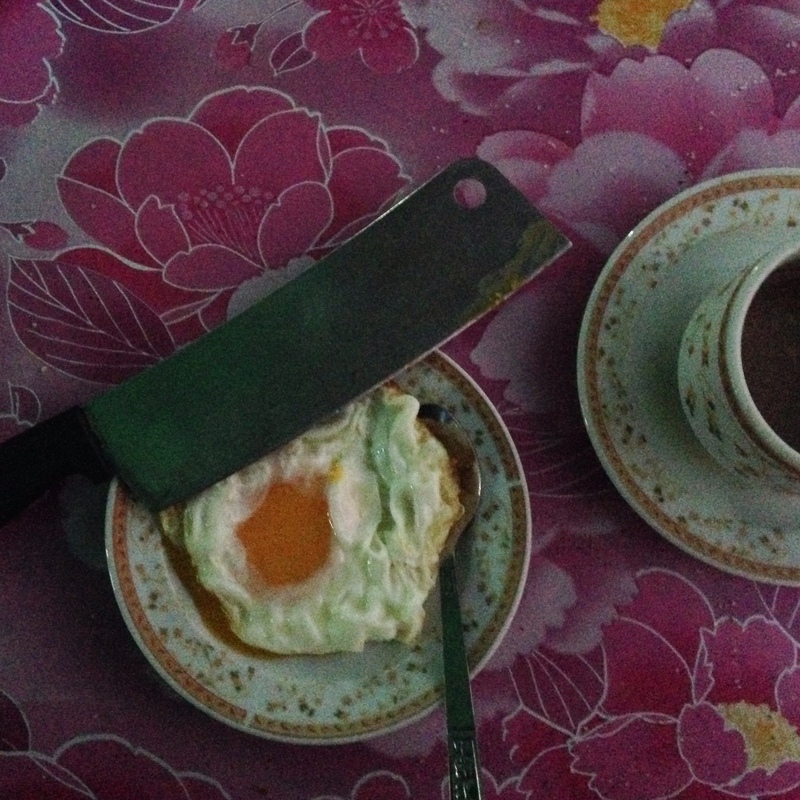 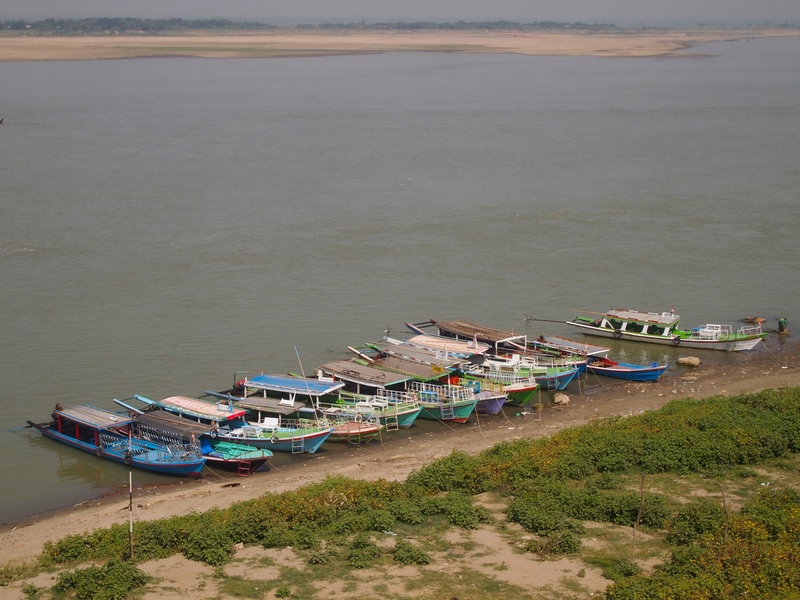 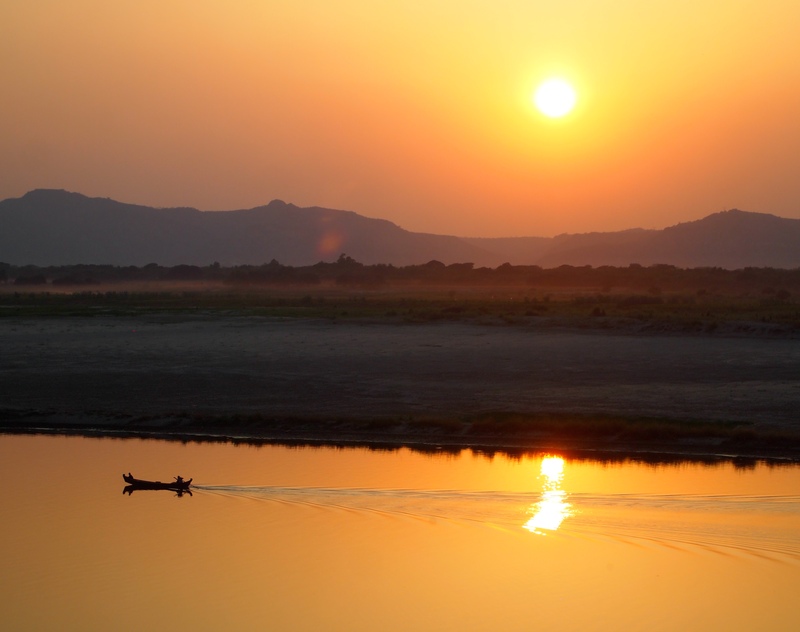 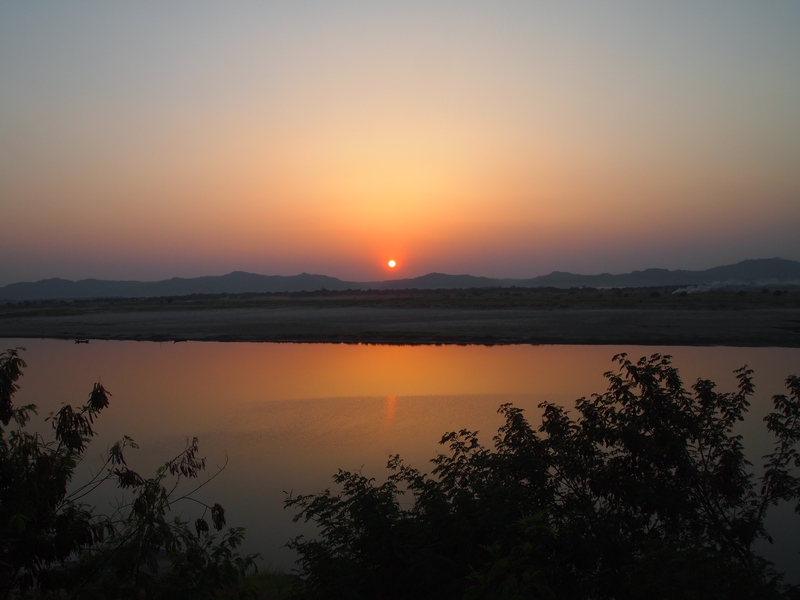 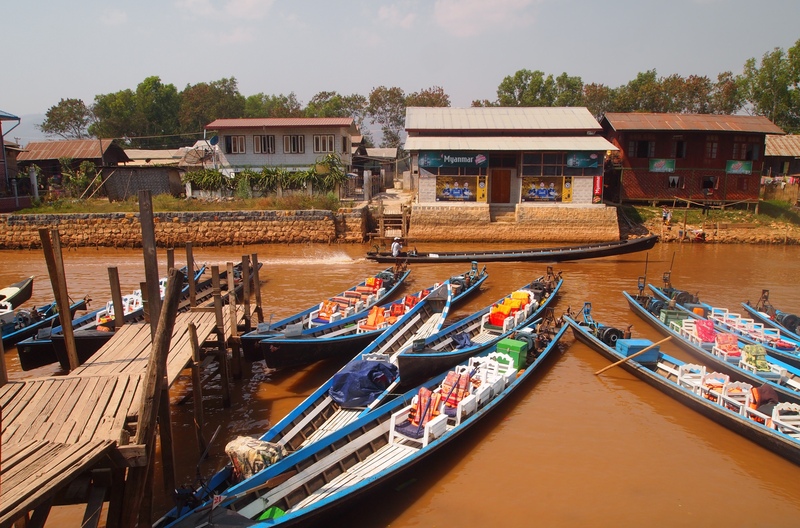 At breakfast, I see a couple of groups from yesterday’s 12-hour boat ride down the Ayeyarwady, and we acknowledge each other as having shared a common experience. 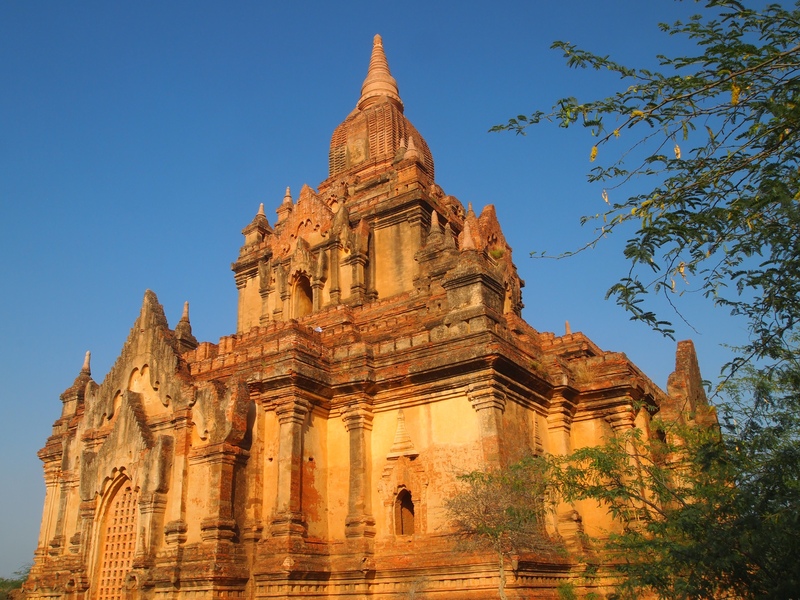 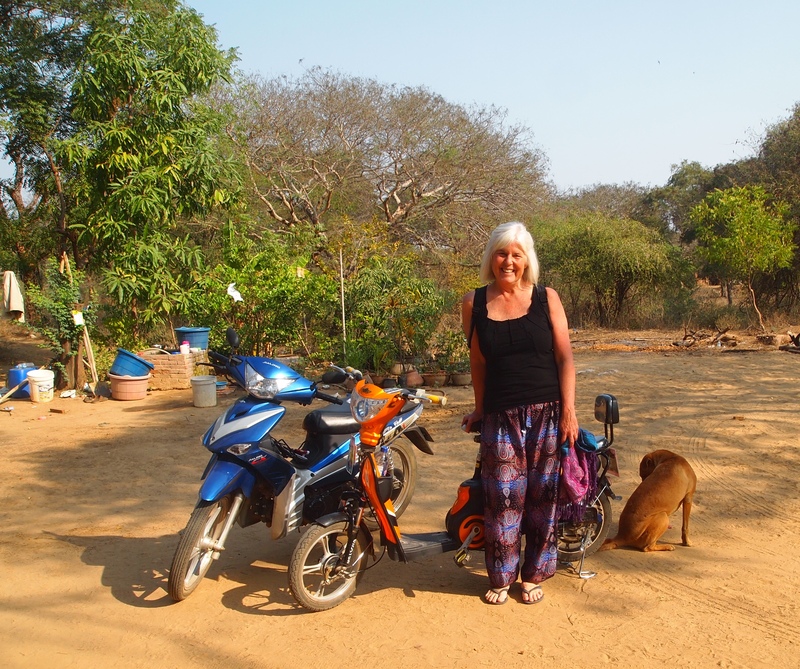 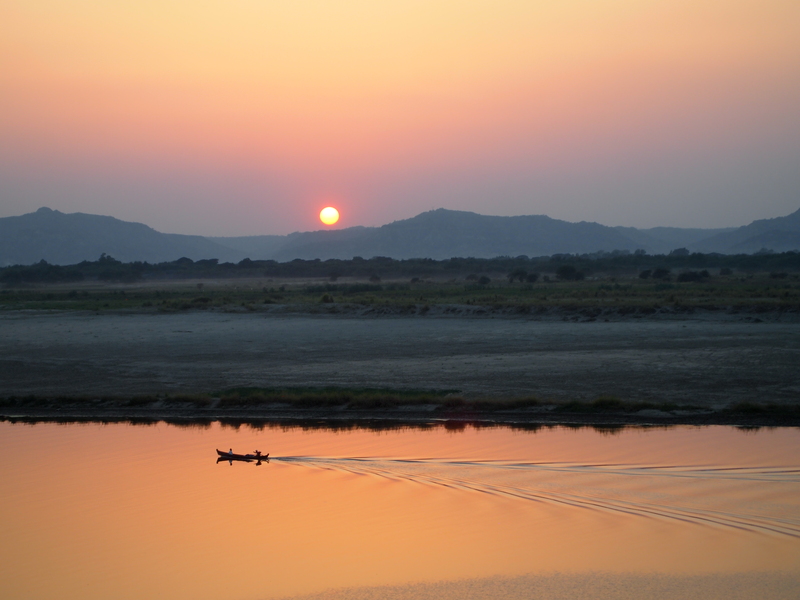 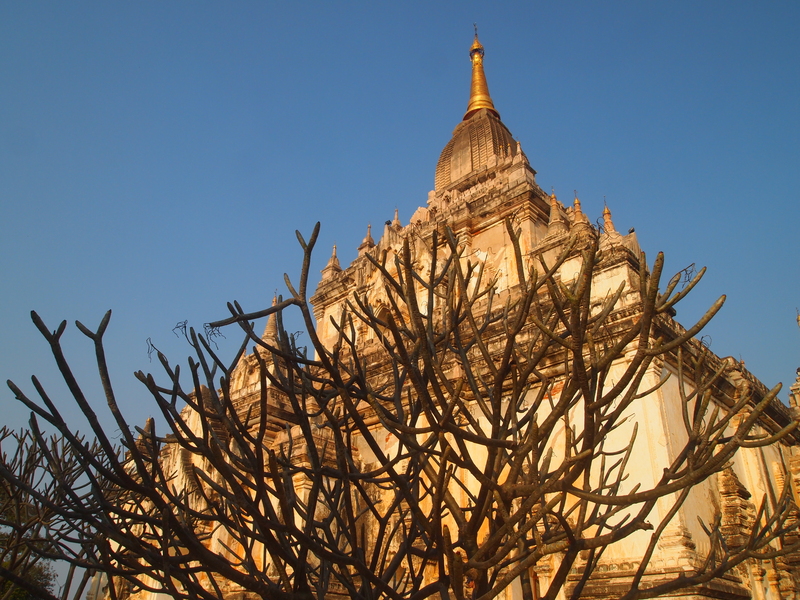 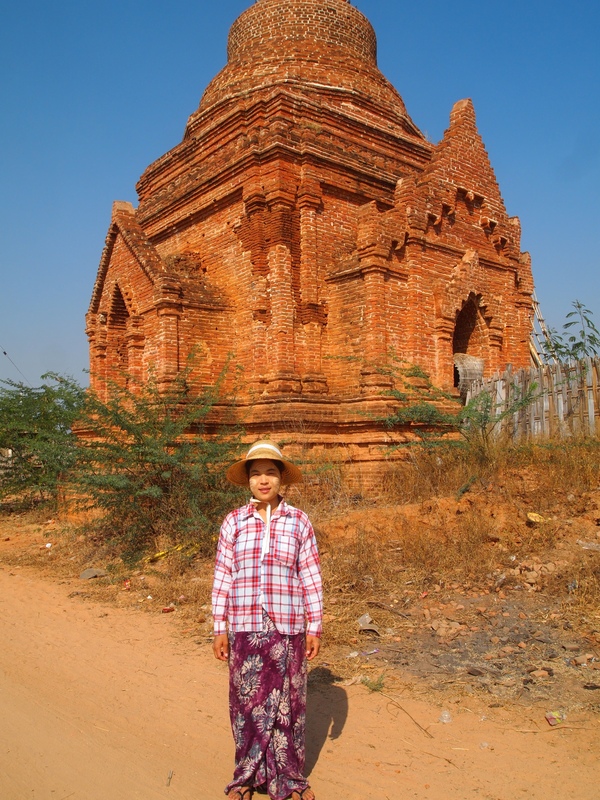 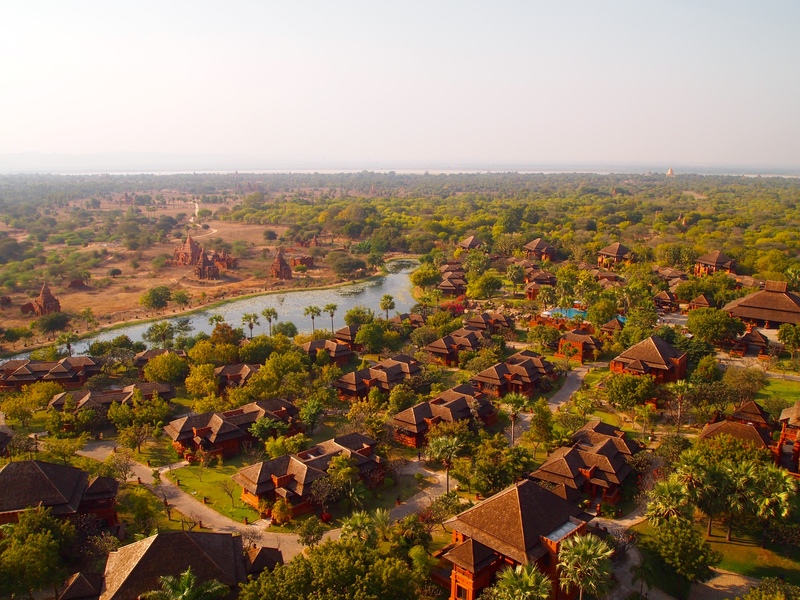 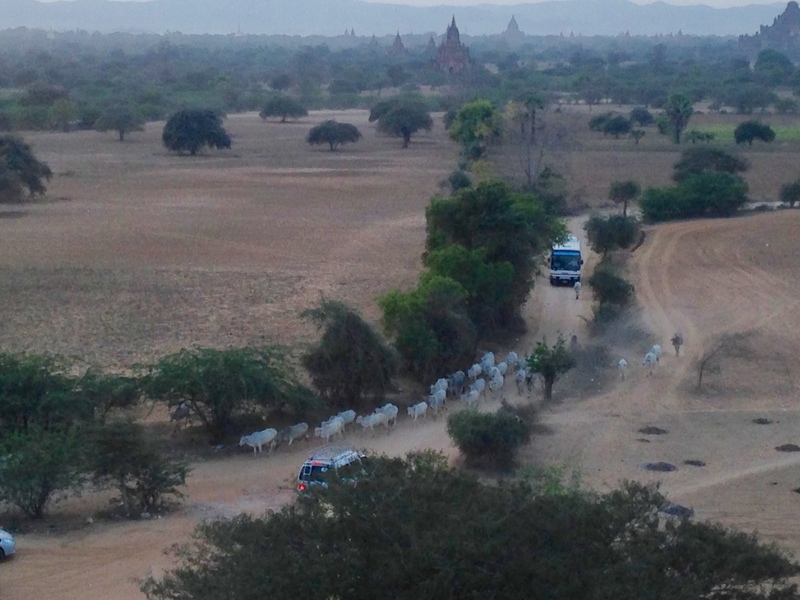 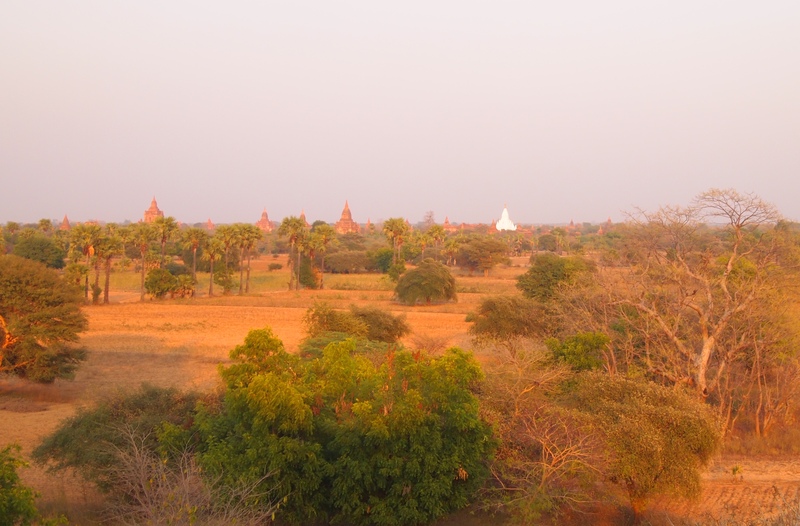 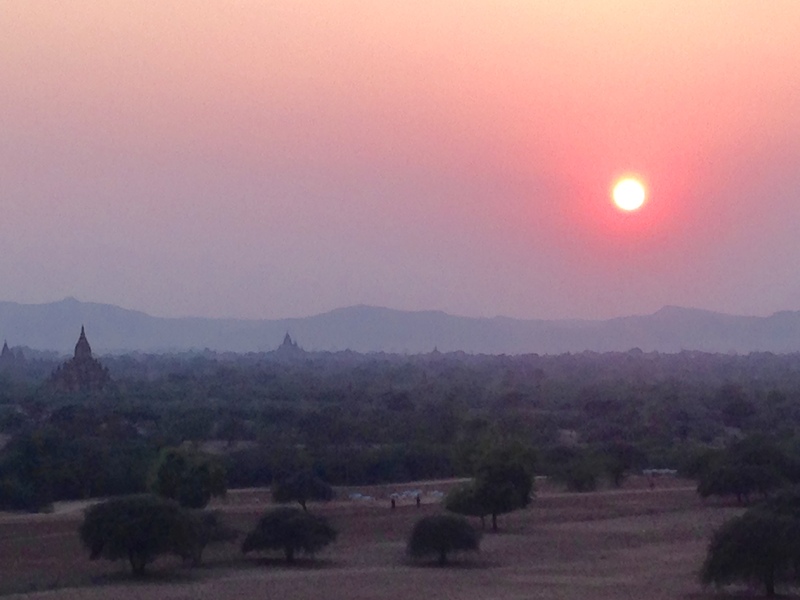 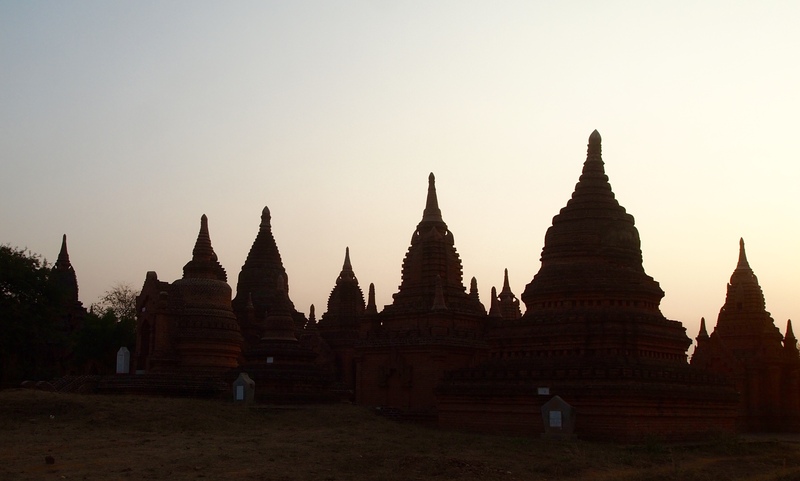 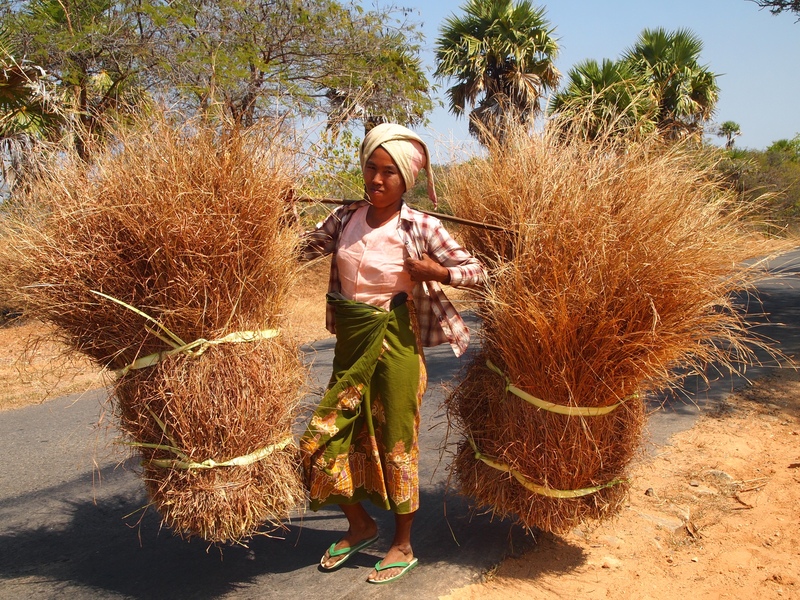 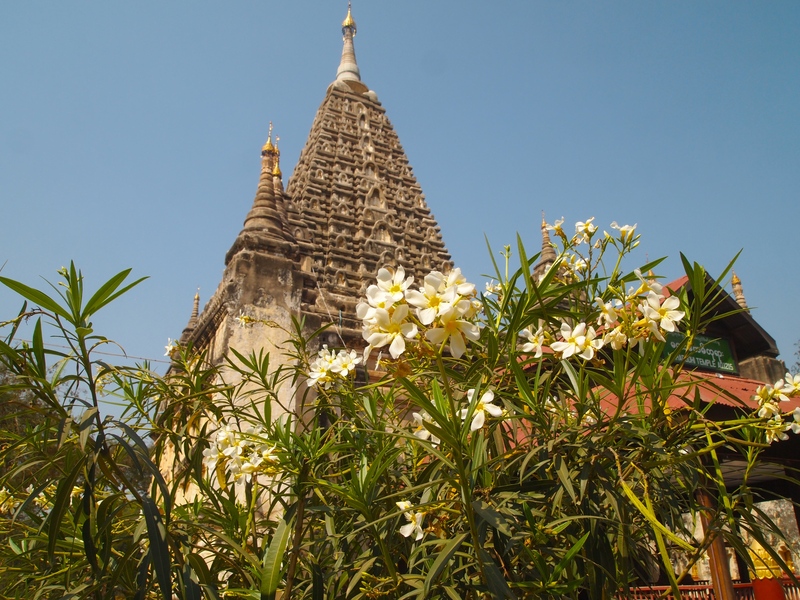 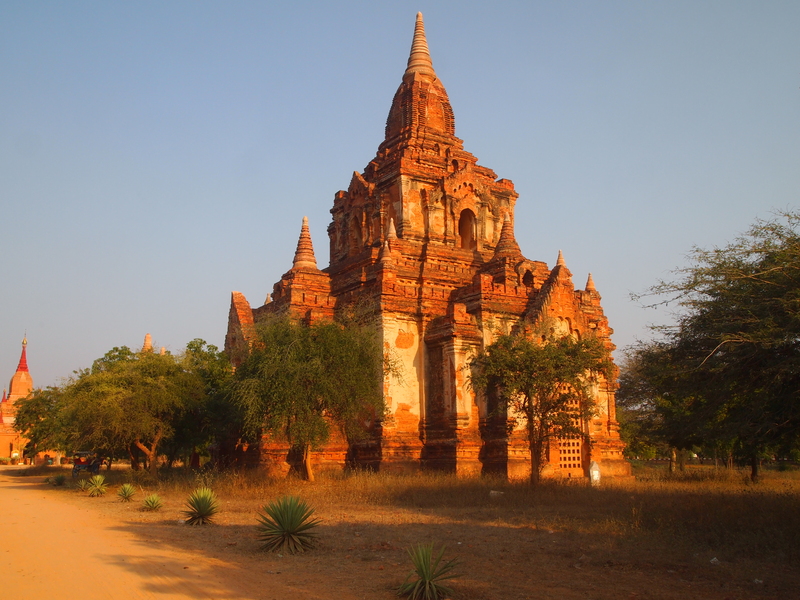 I hire a car from the hotel to take me to the most important temples in Bagan from 9 a.m. until after sunset. 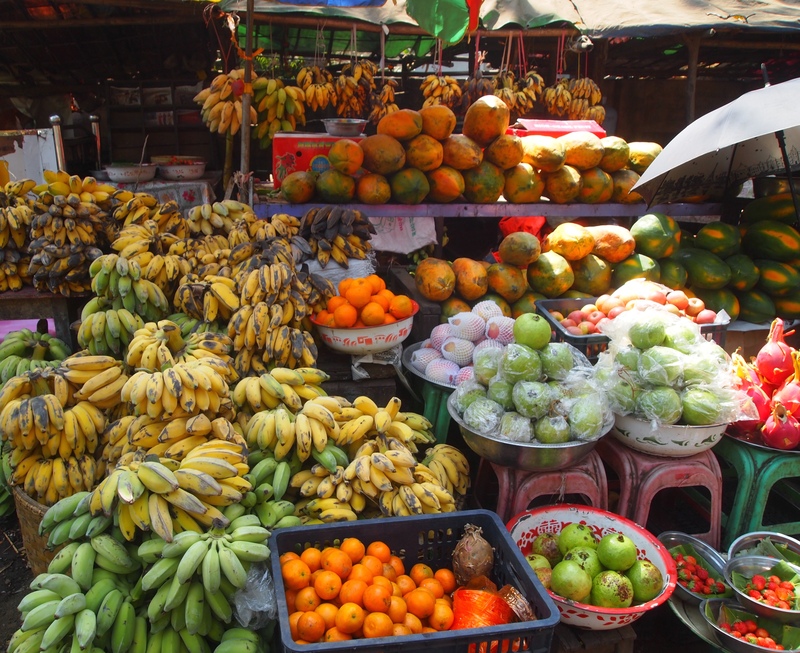 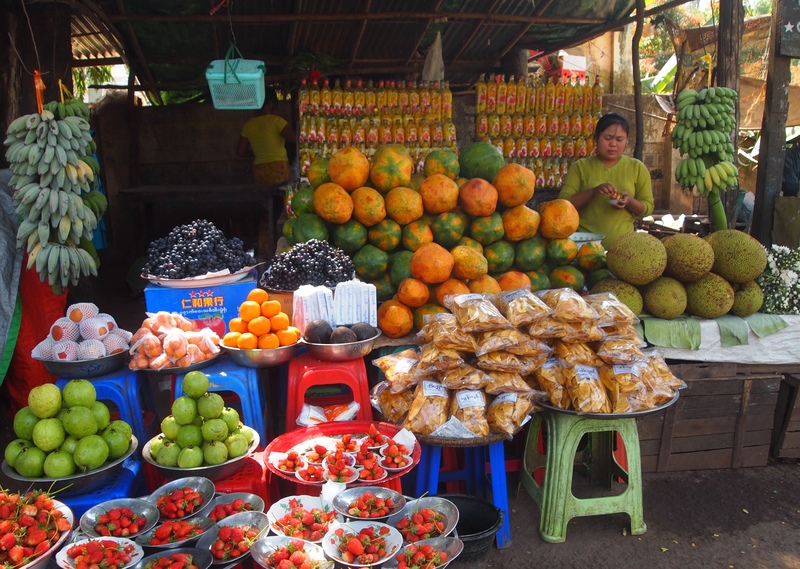 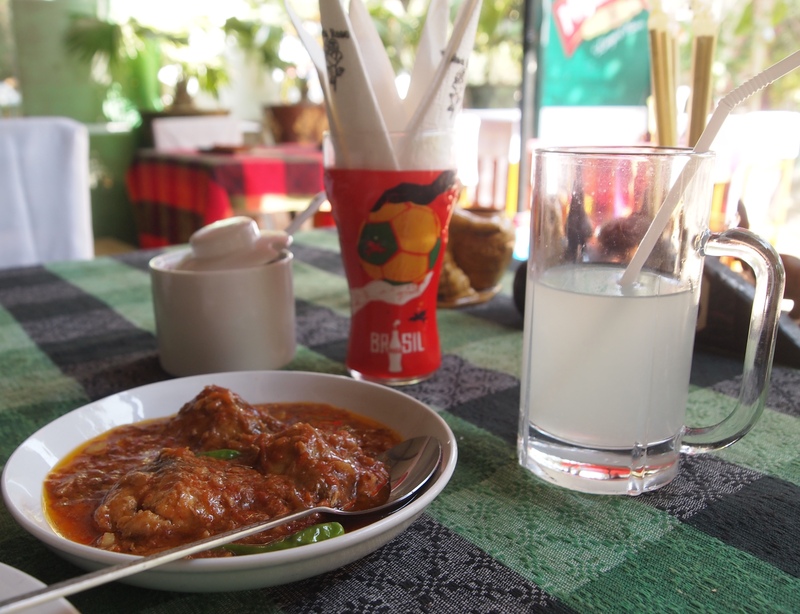 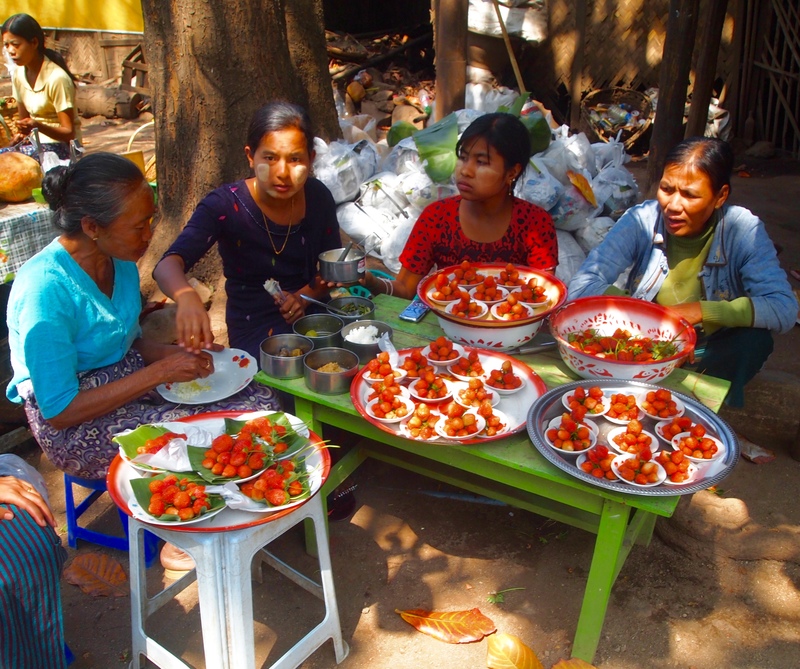 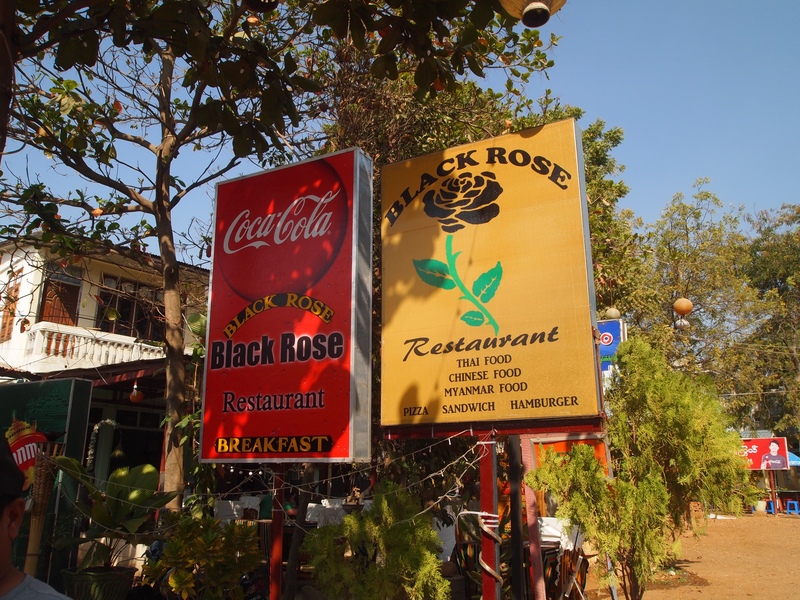 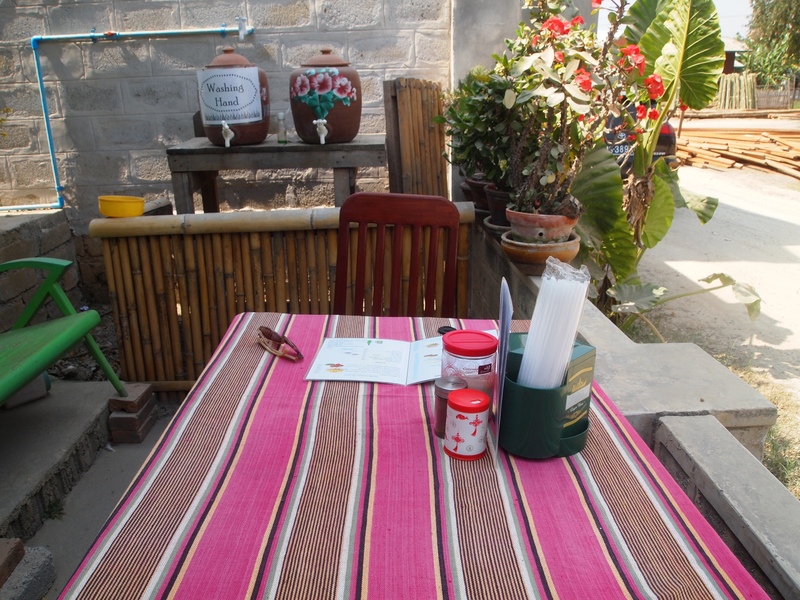 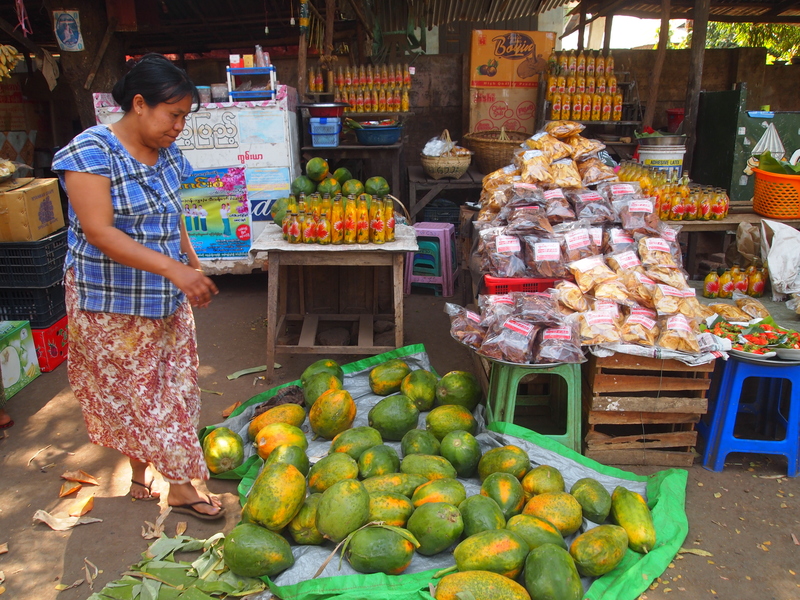 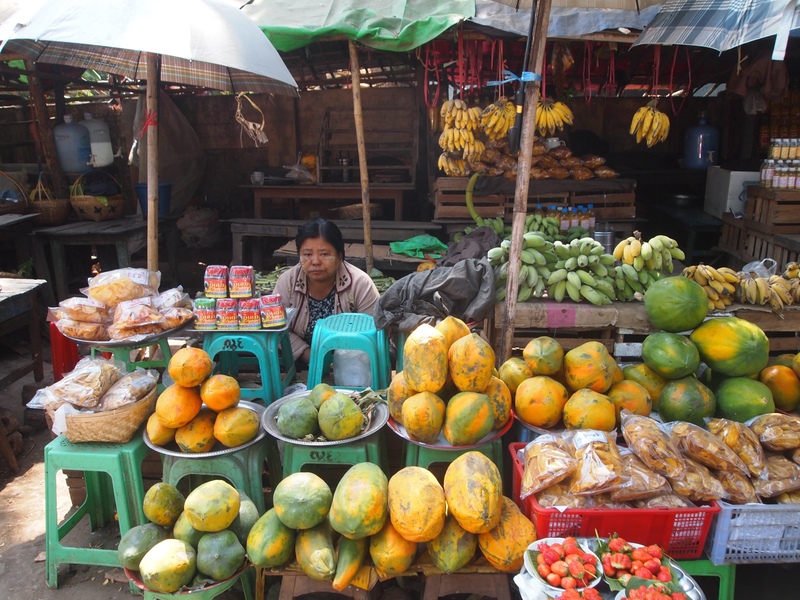 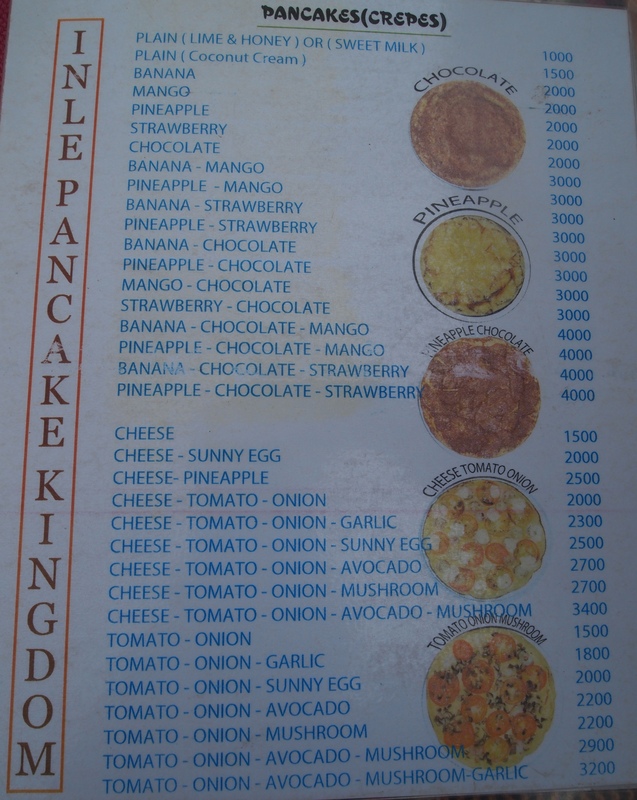 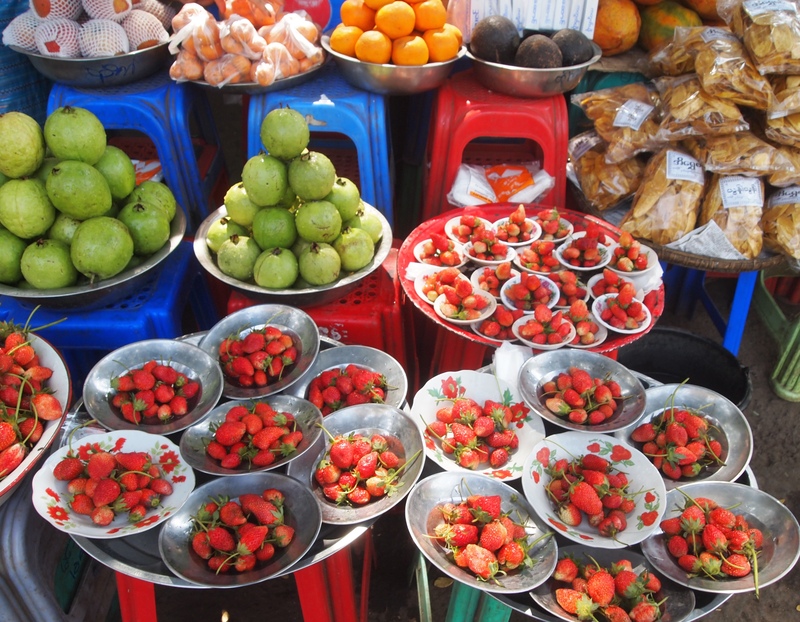 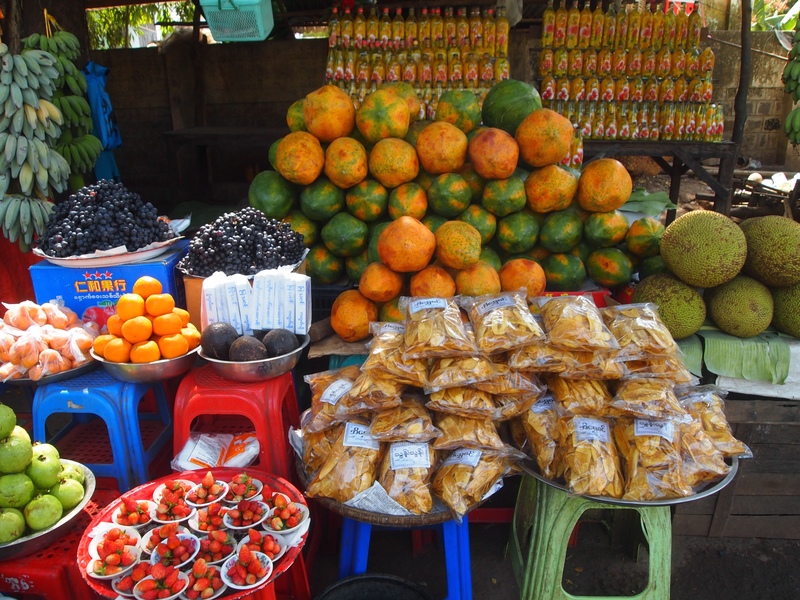 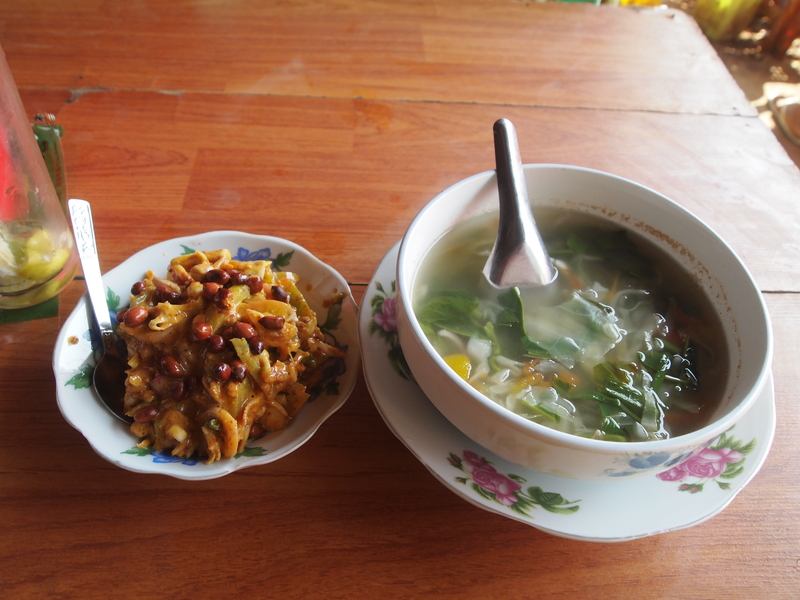 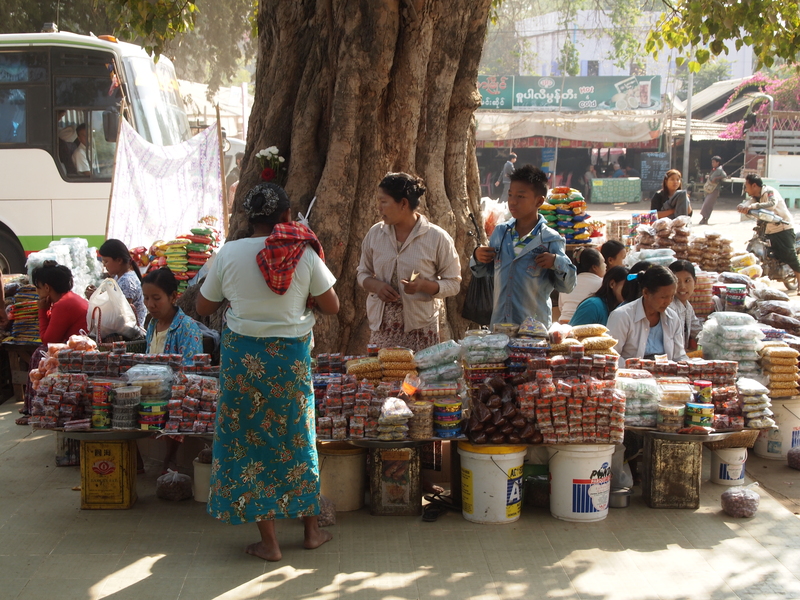 The charge is 35,000 kyat, around $35. 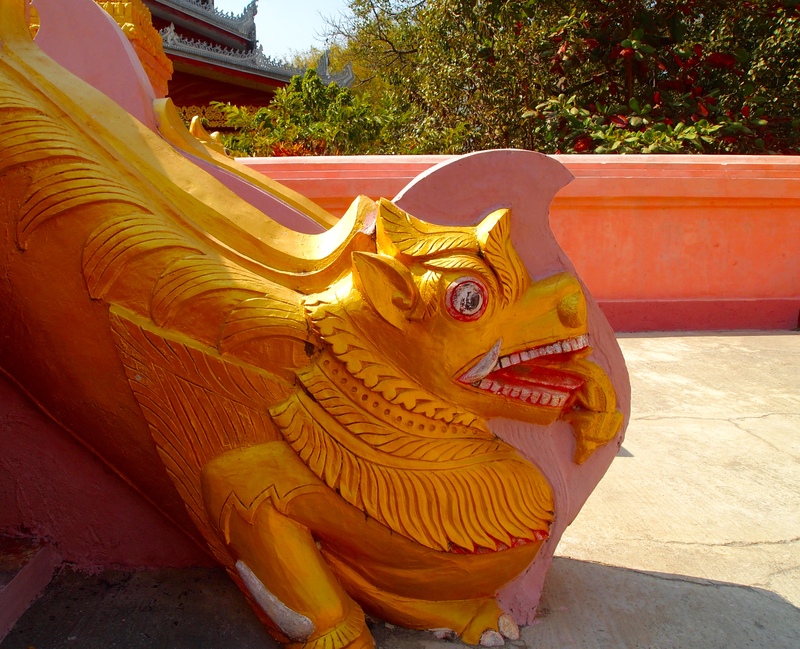 Little do I know we will be on the go all day and I will stop at 20 temples. 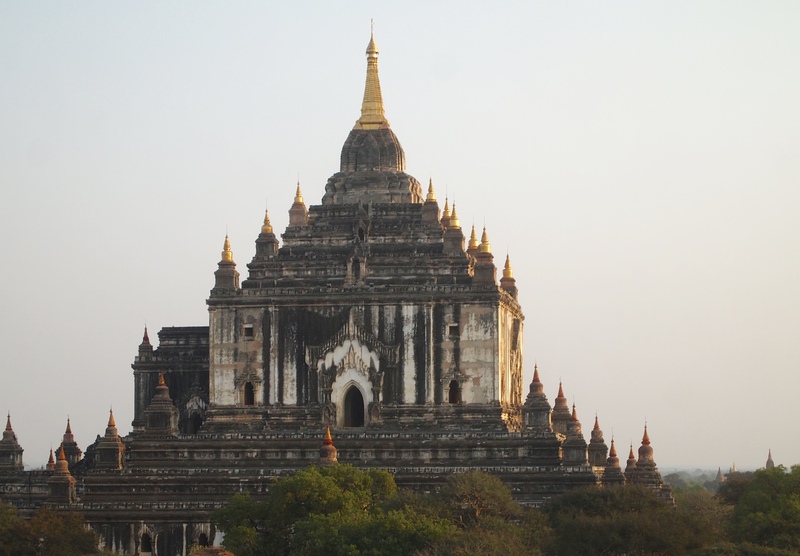 I don’t mind because I want to make sure I see the most famous temples. 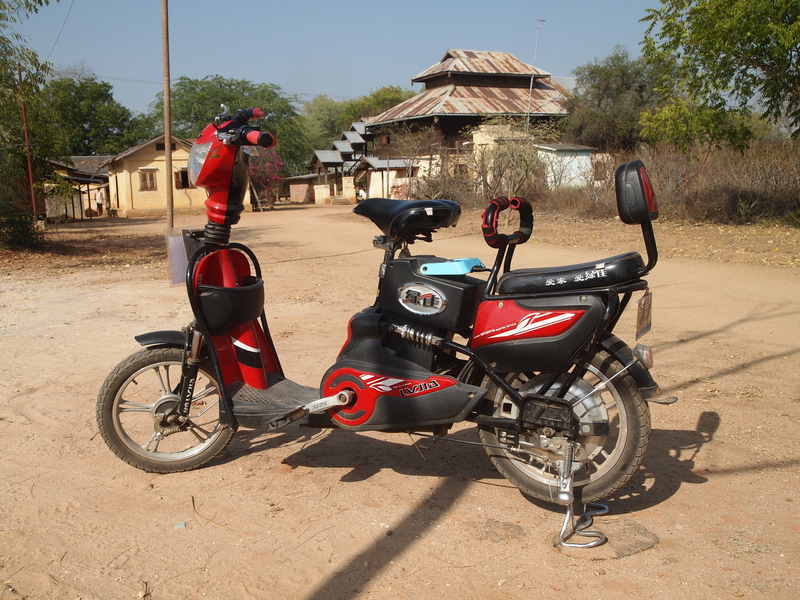 Tomorrow, I plan to rent an electric bike and ride in a more leisurely fashion through the plains. 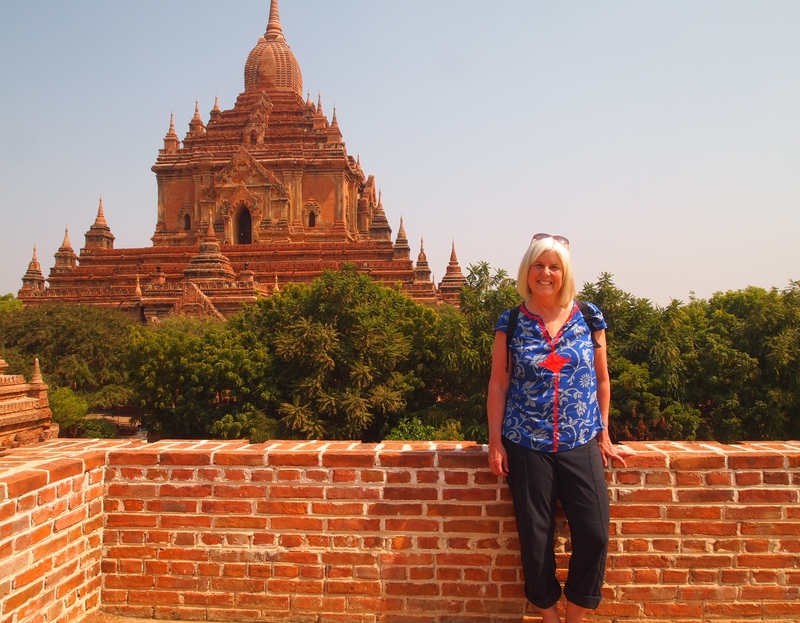 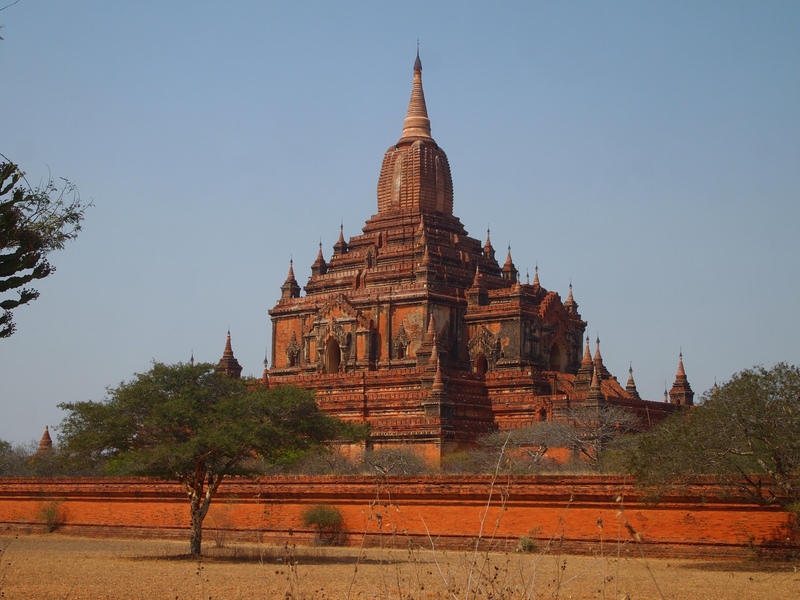 Bagan’s kings commissioned over 4,000 Buddhist temples in a 230 year period ending in 1287 with the Mongol invasions. 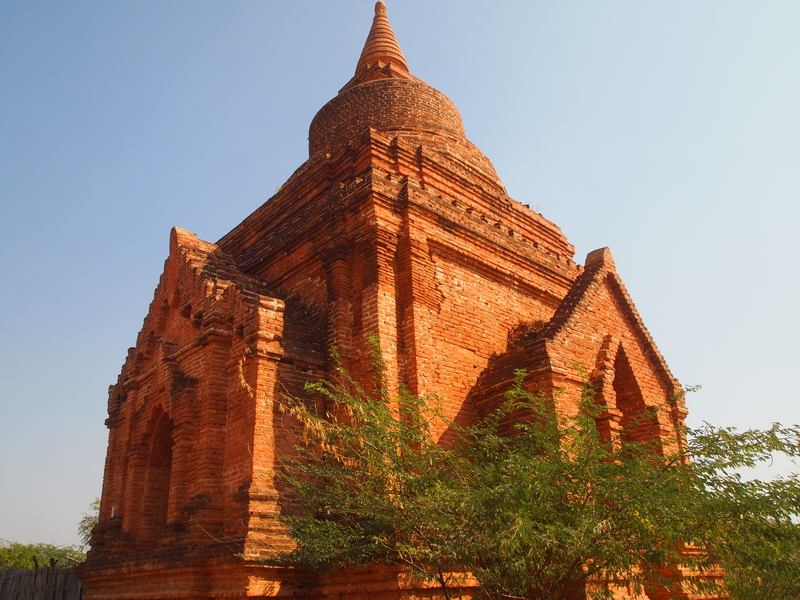 While the 11th- to 13th-century wooden buildings have long disappeared, the brick and stucco temples are all that remain of their grand city. 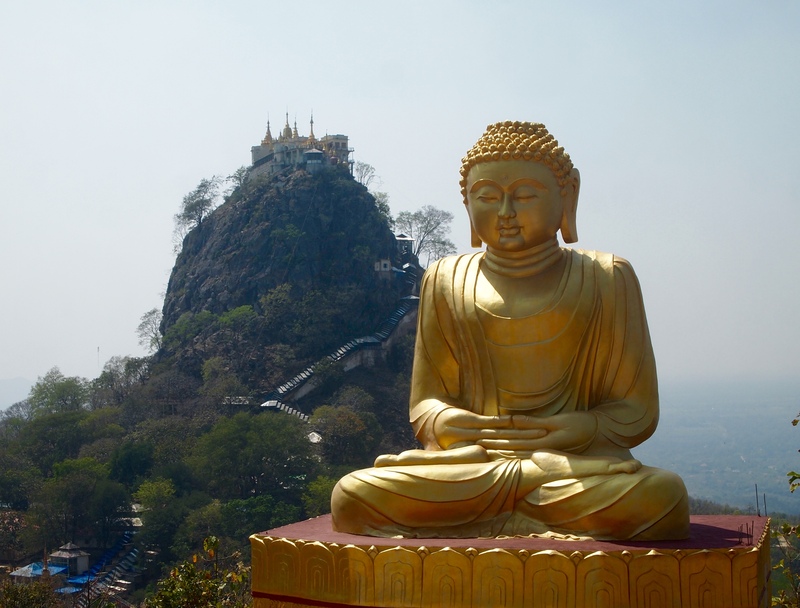 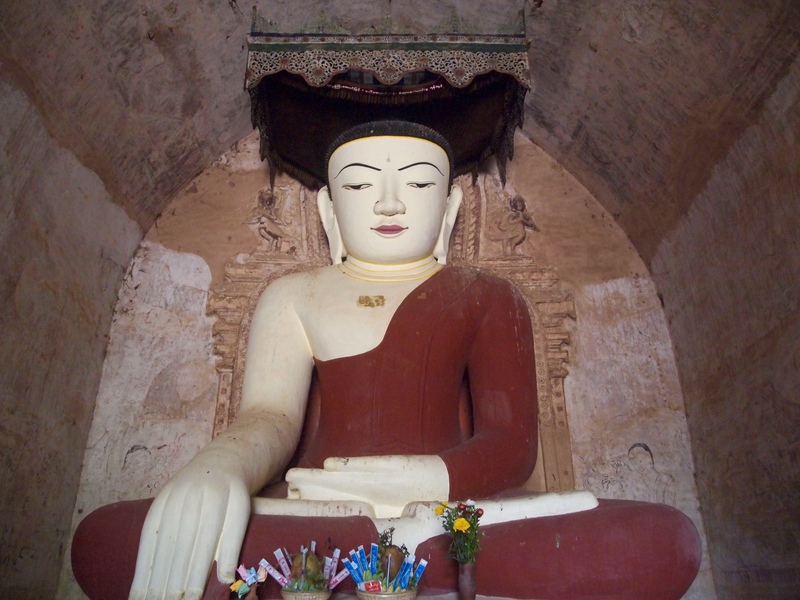 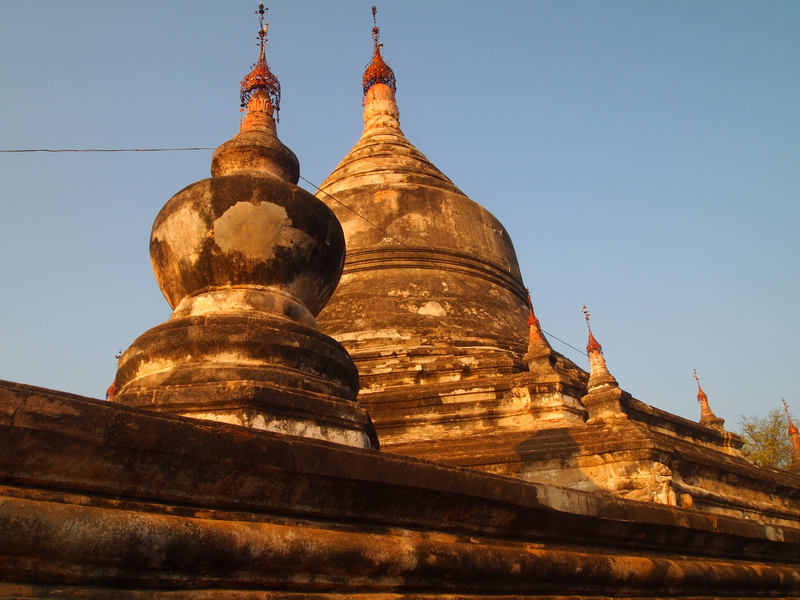 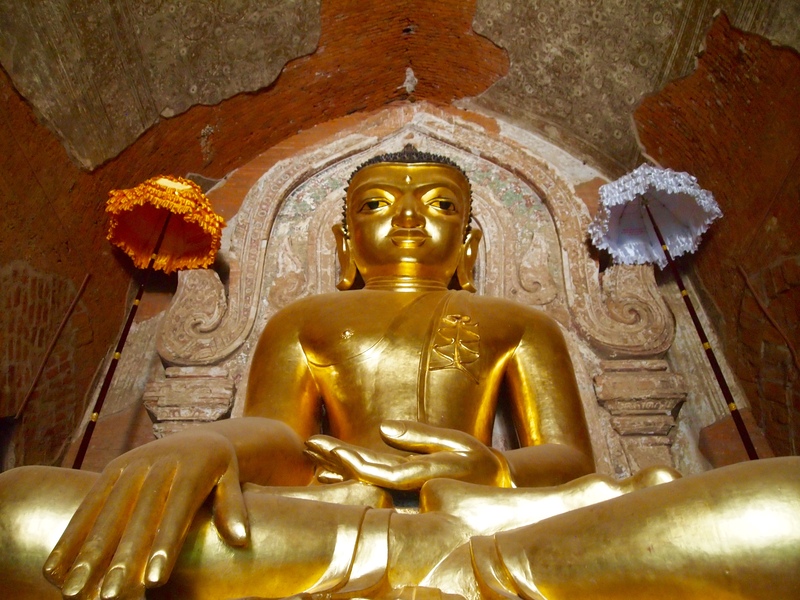 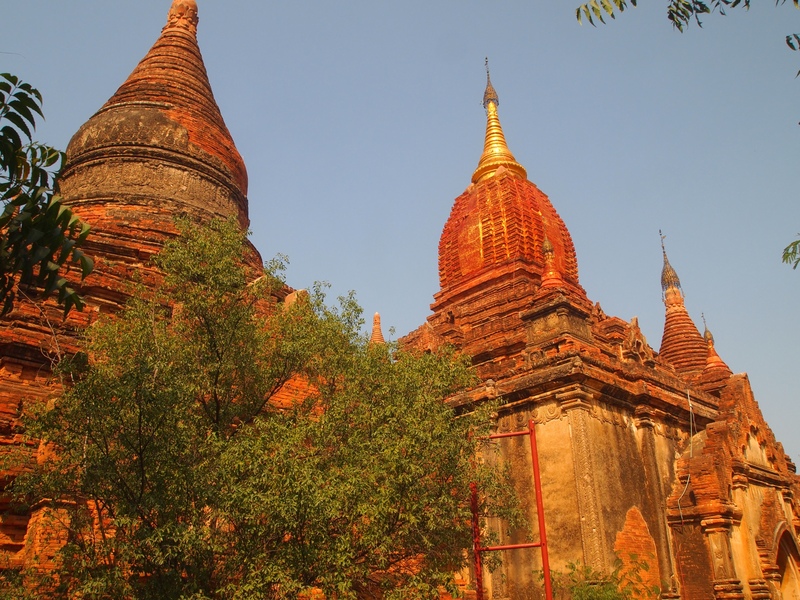 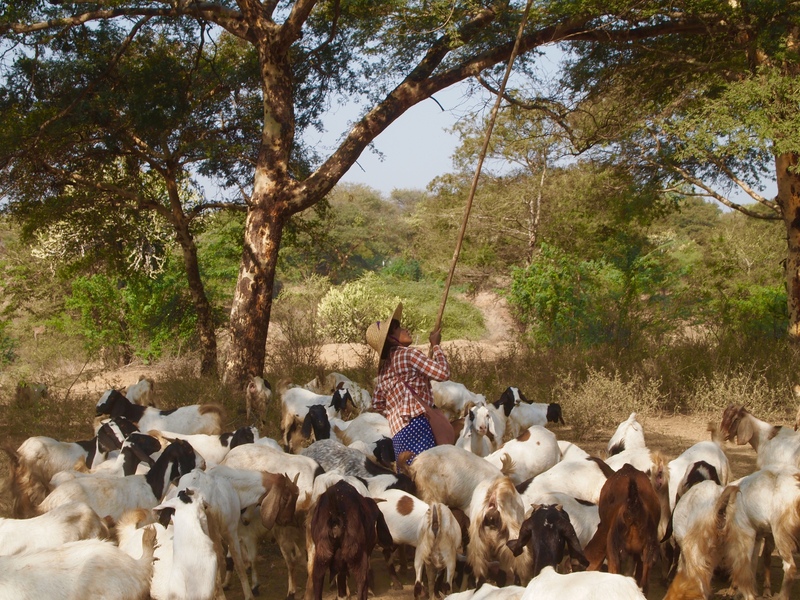 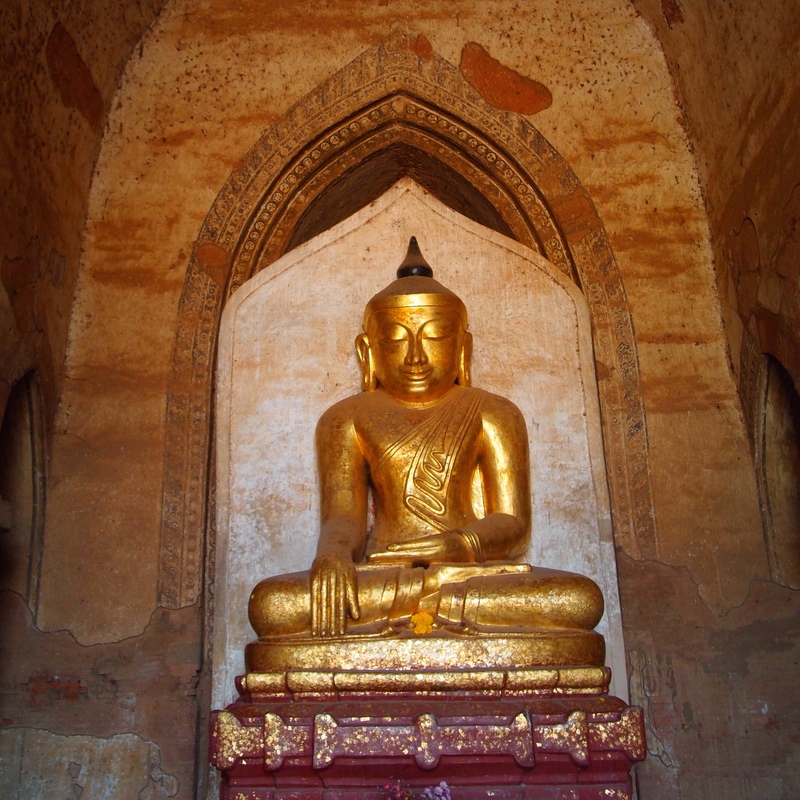 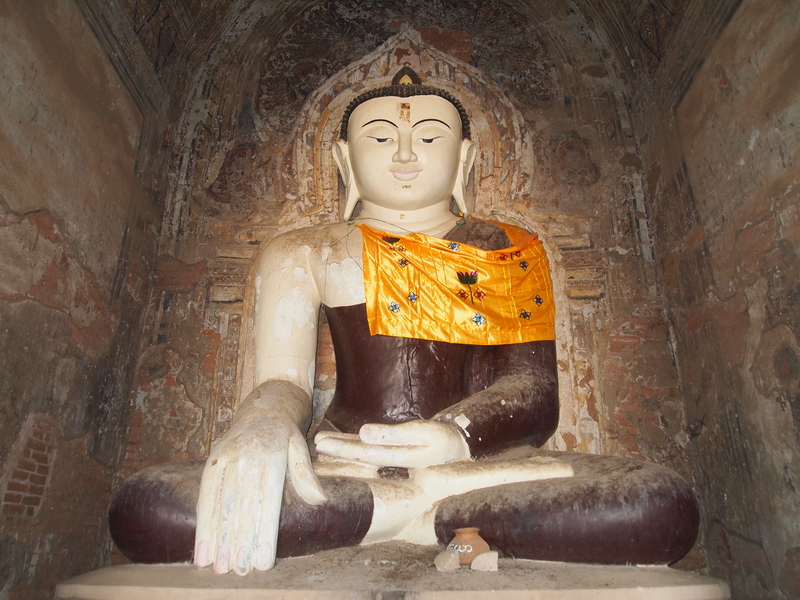 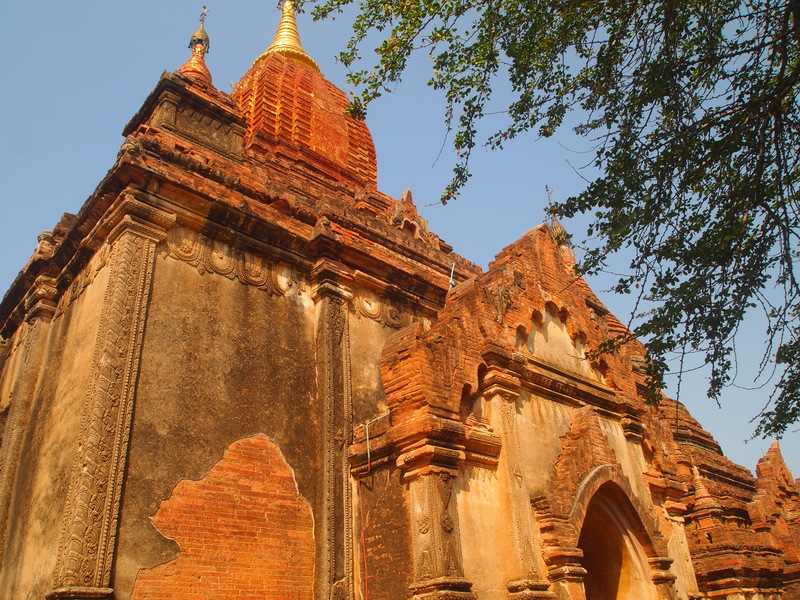 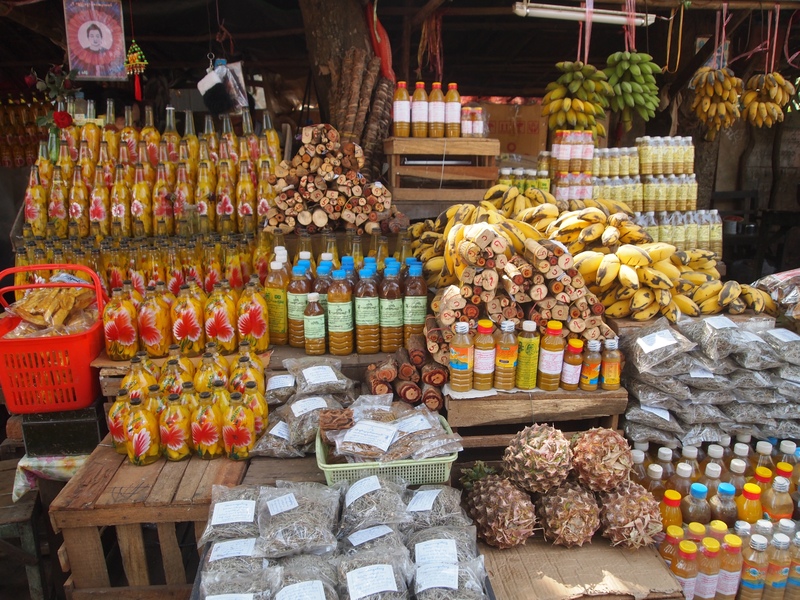 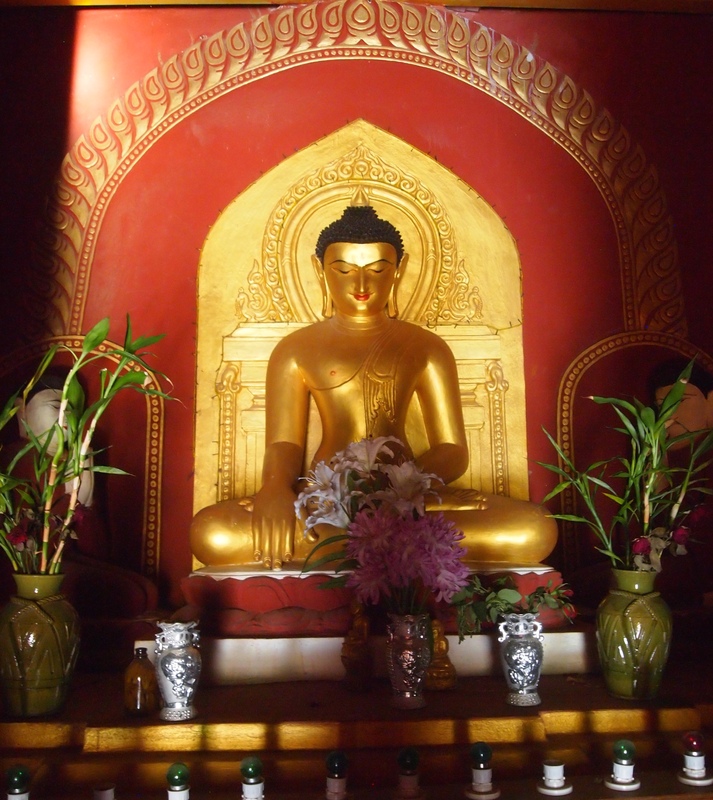 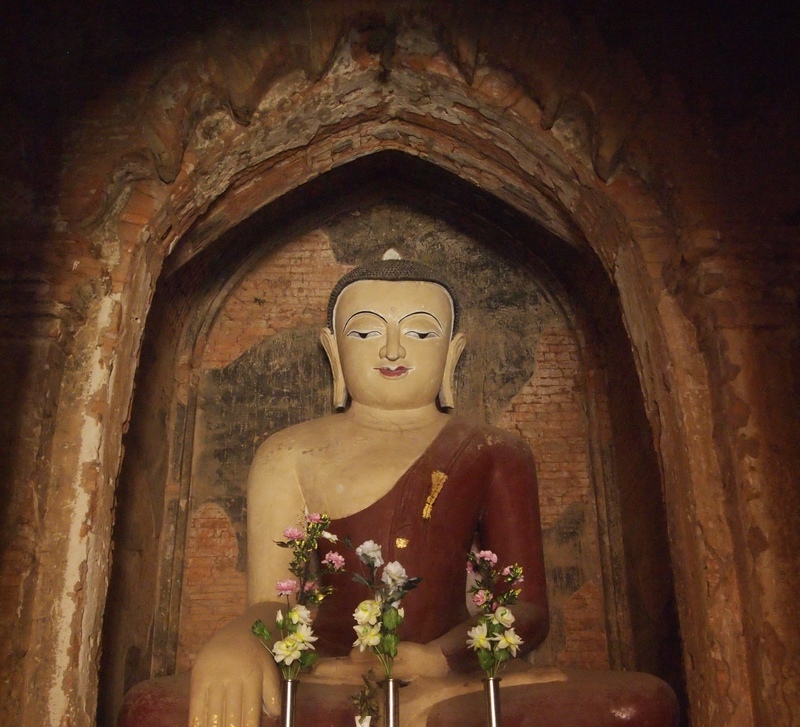 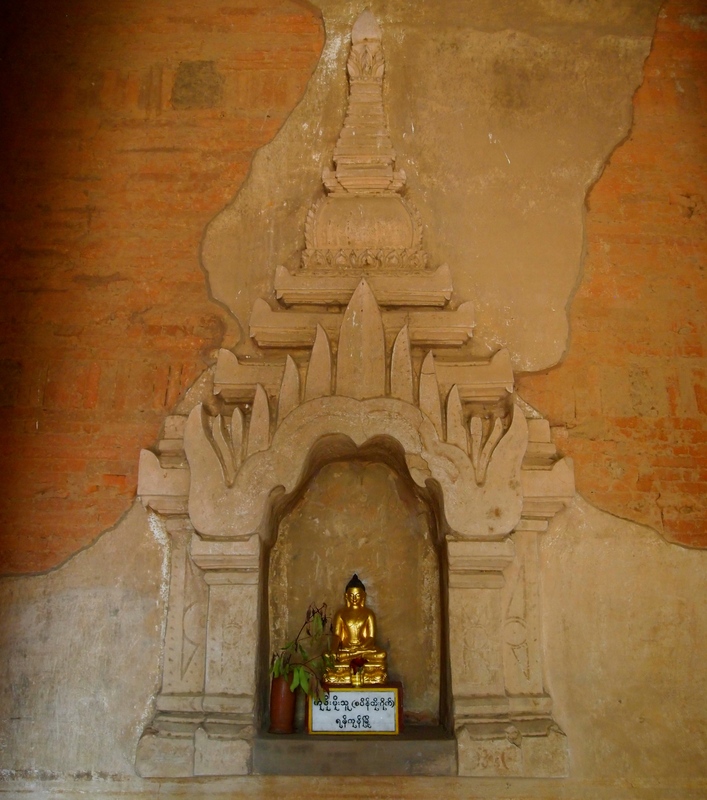 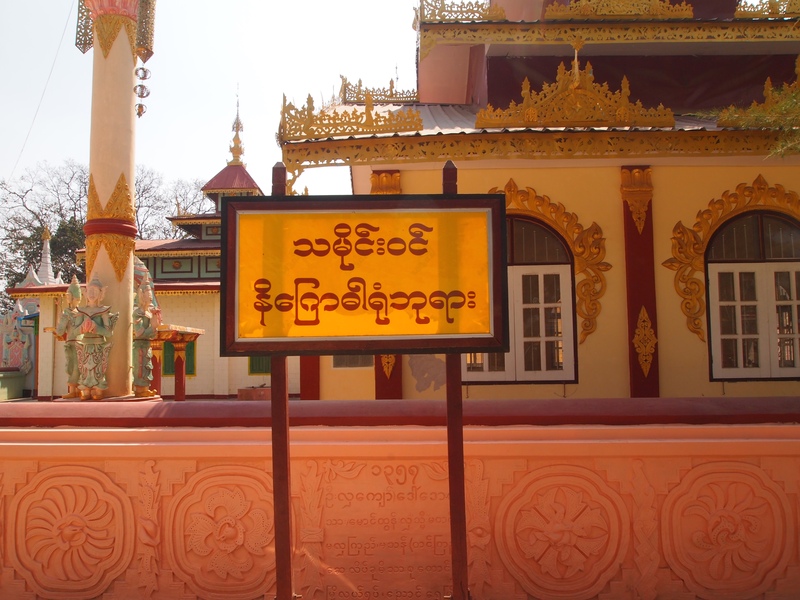 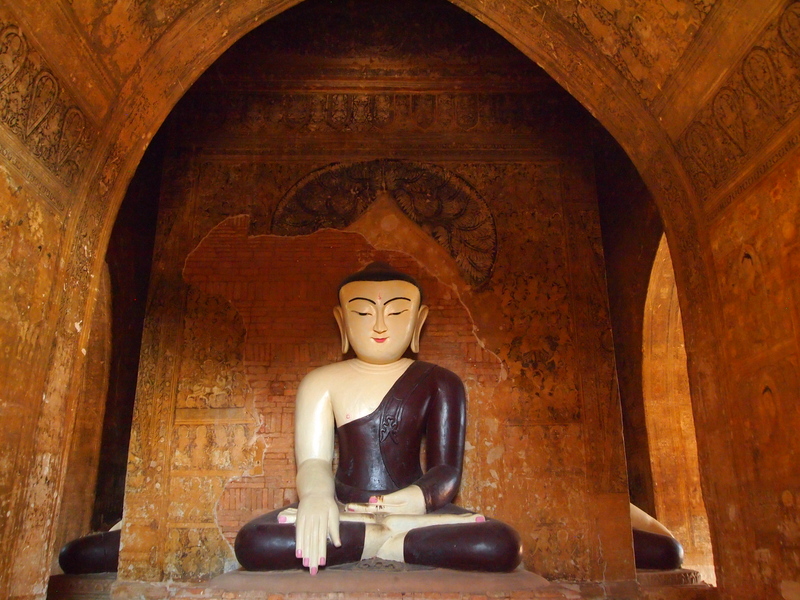 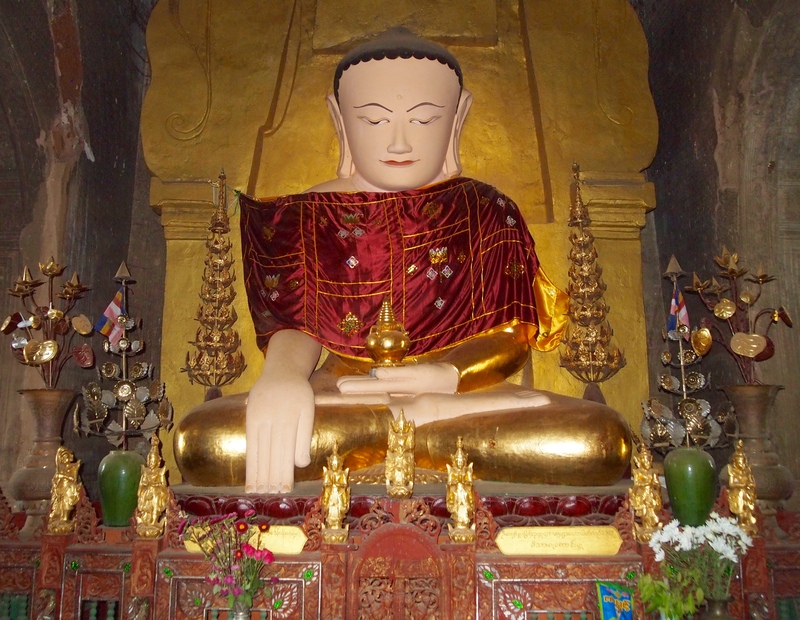 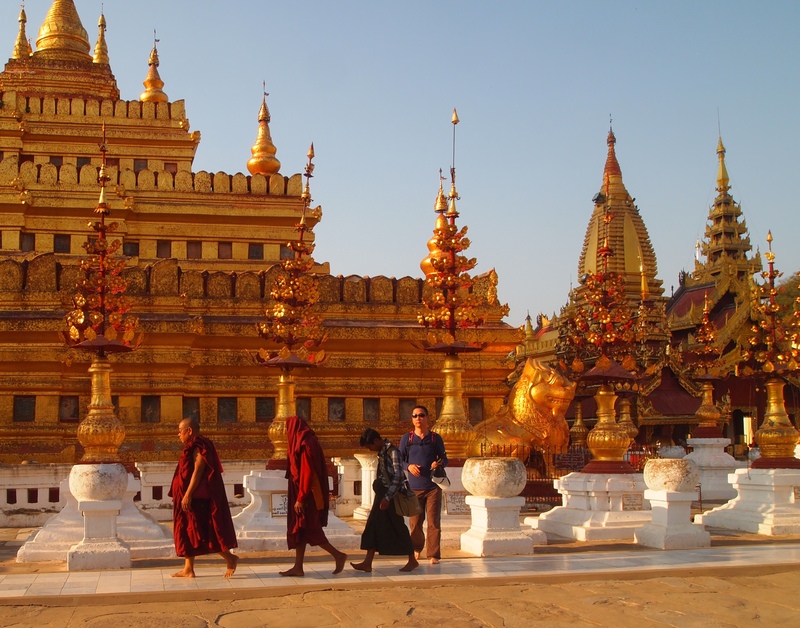 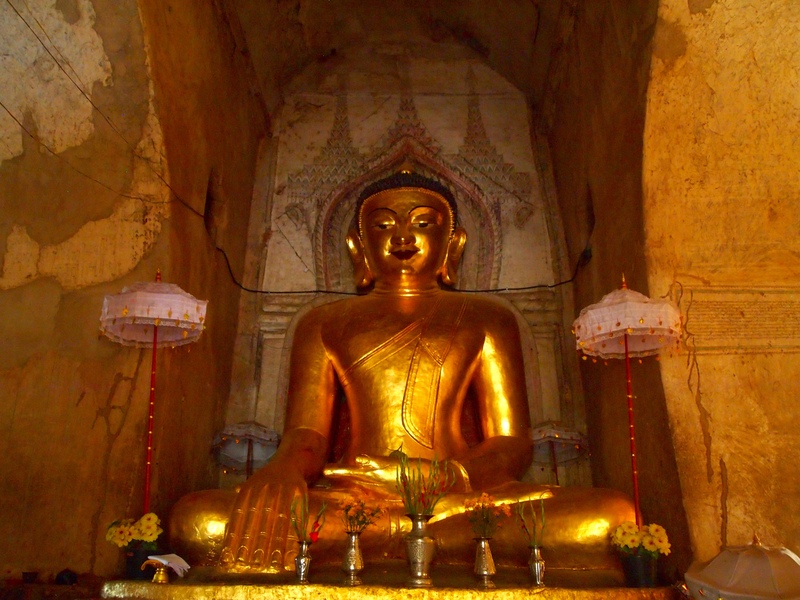 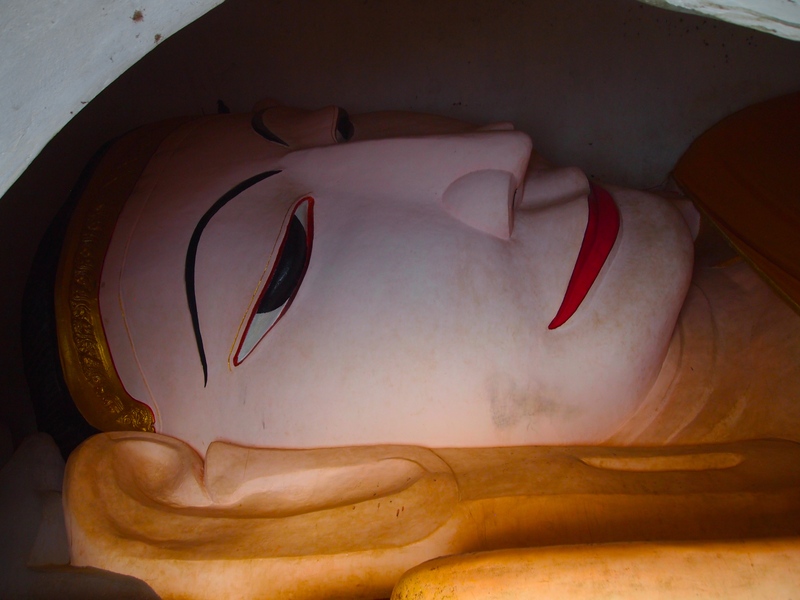 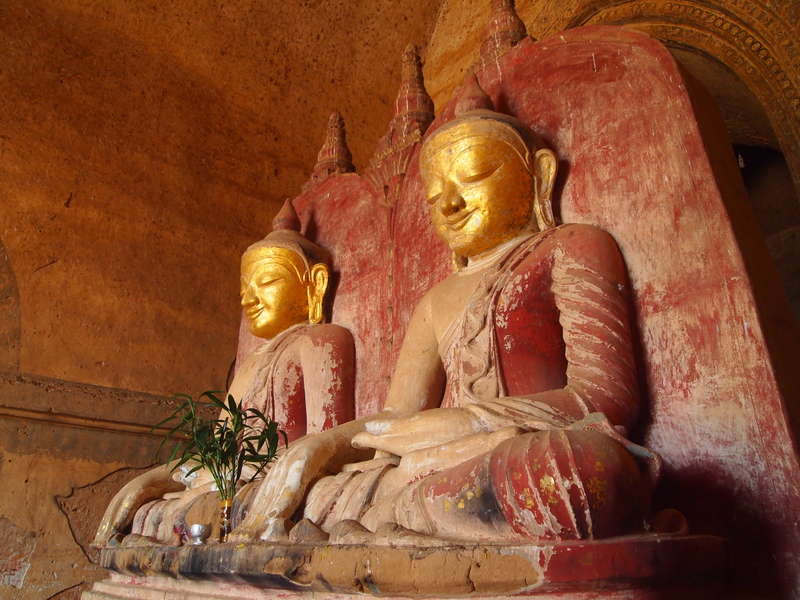 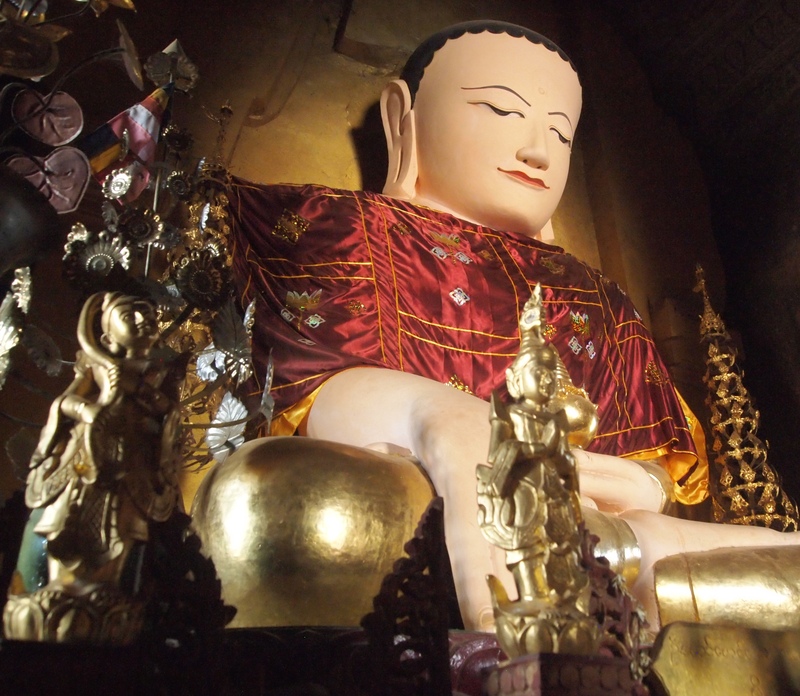 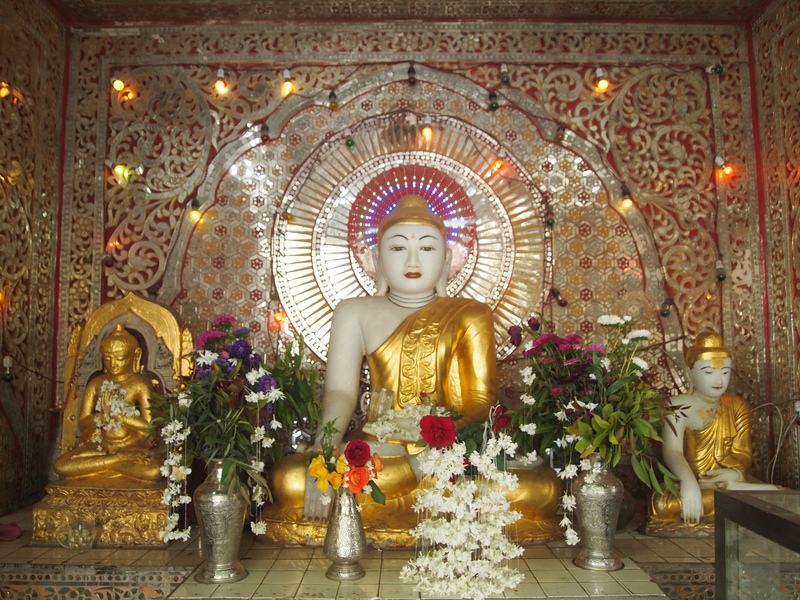 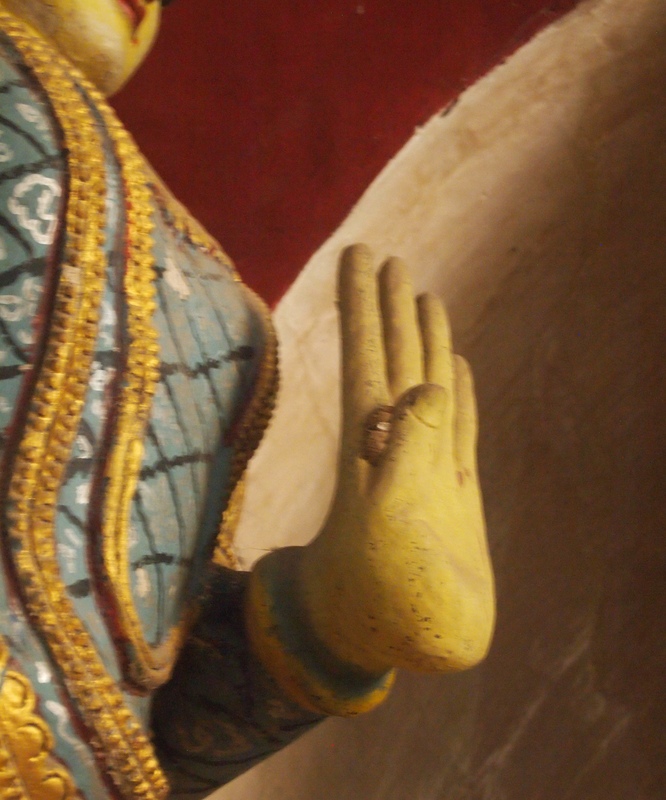 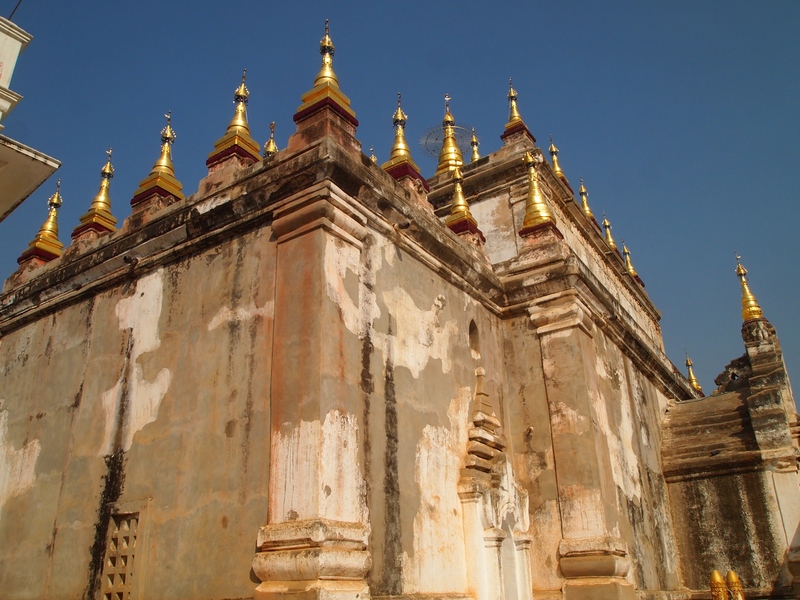 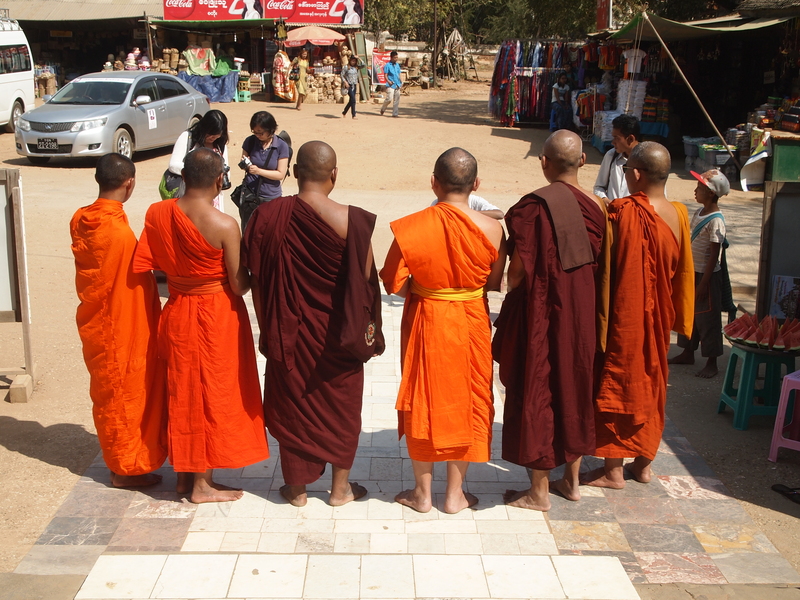 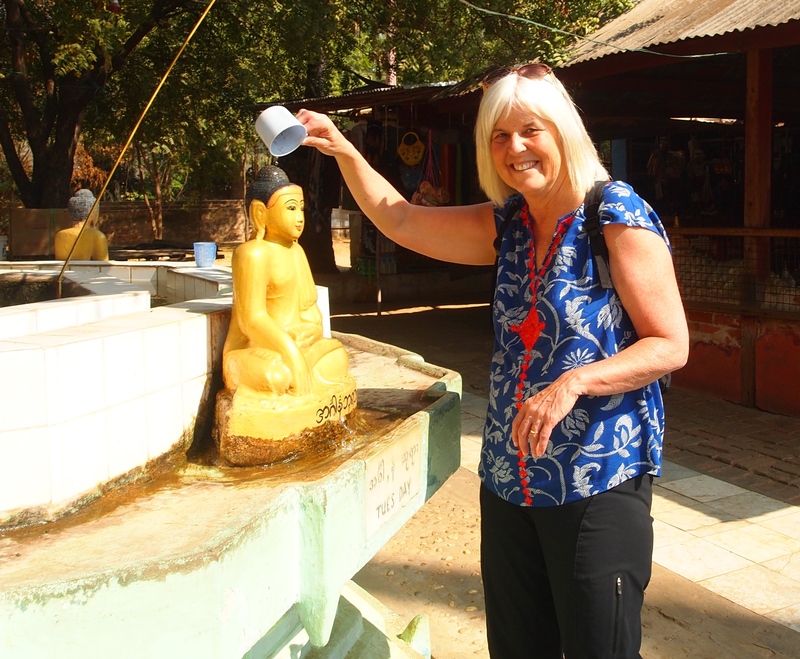 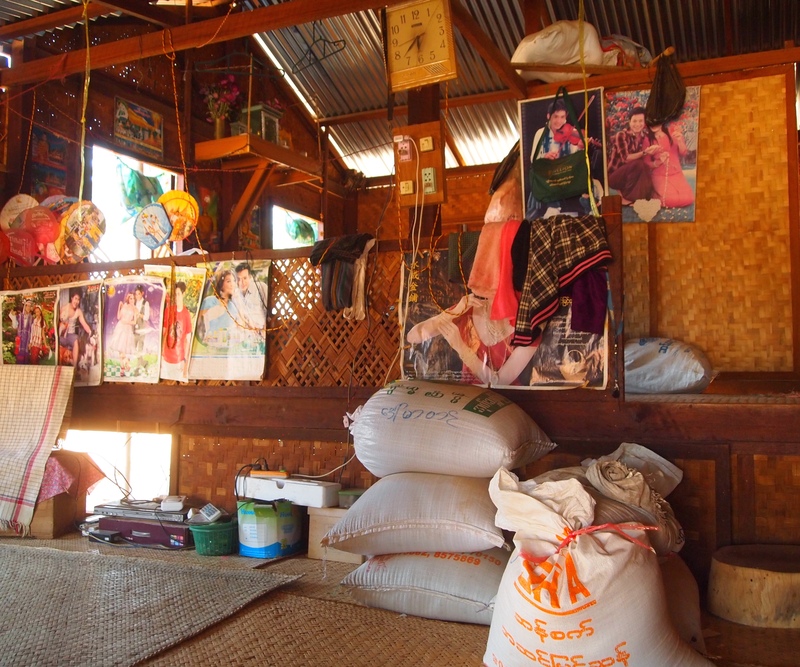 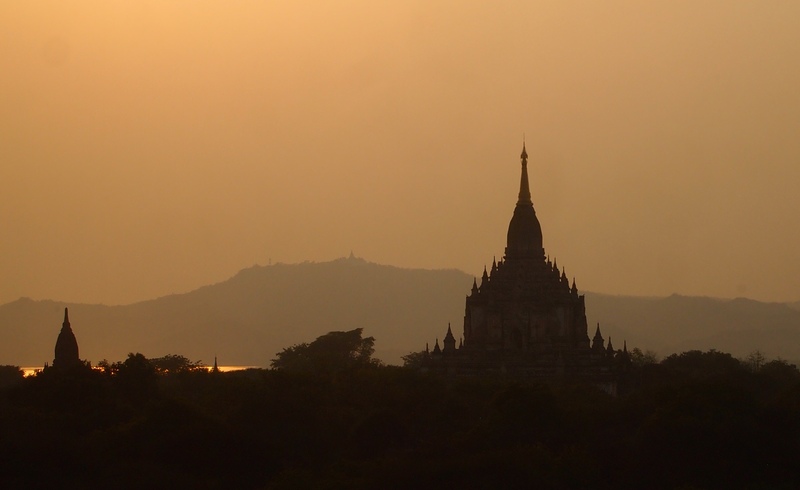 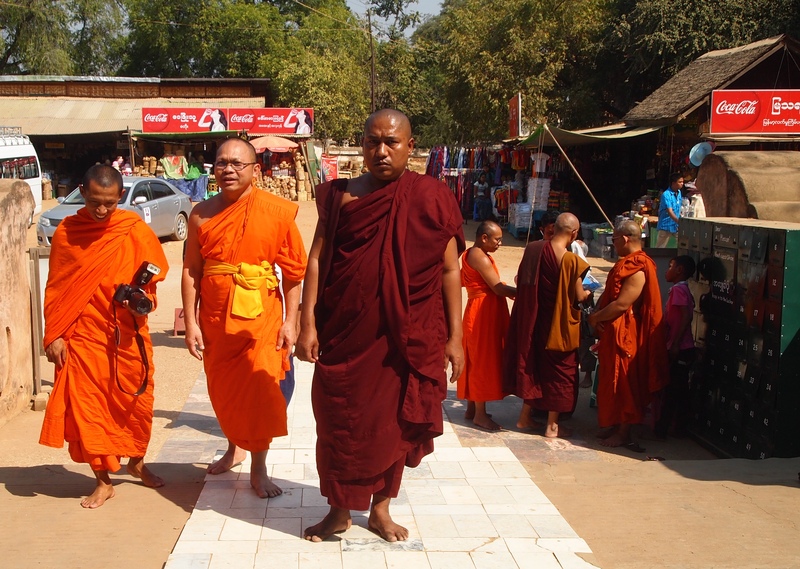 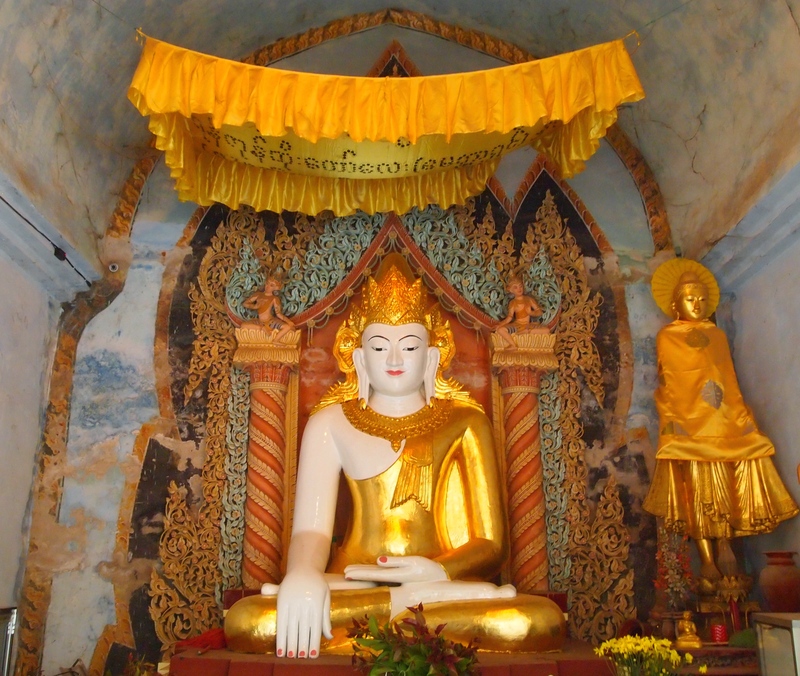 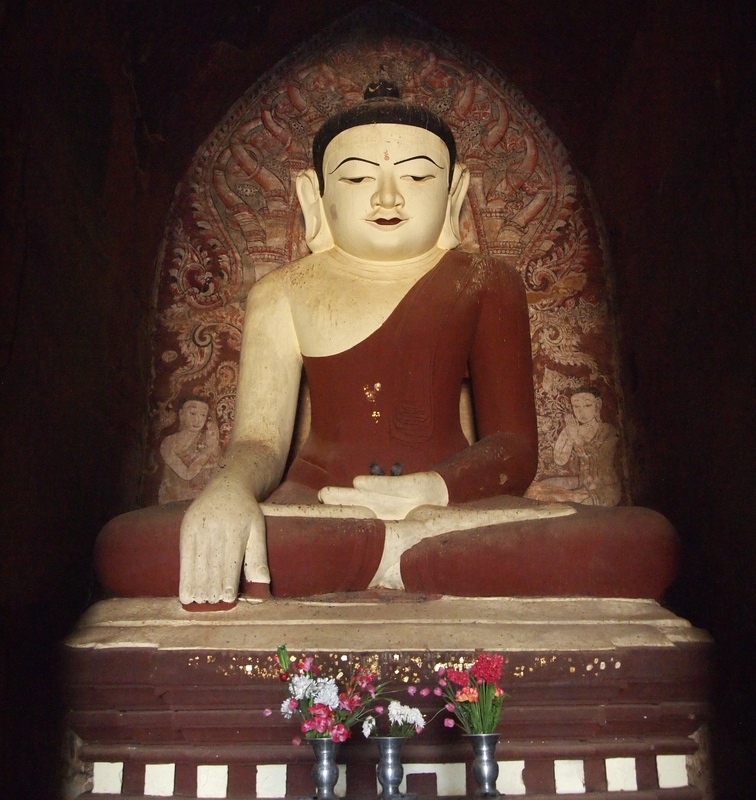 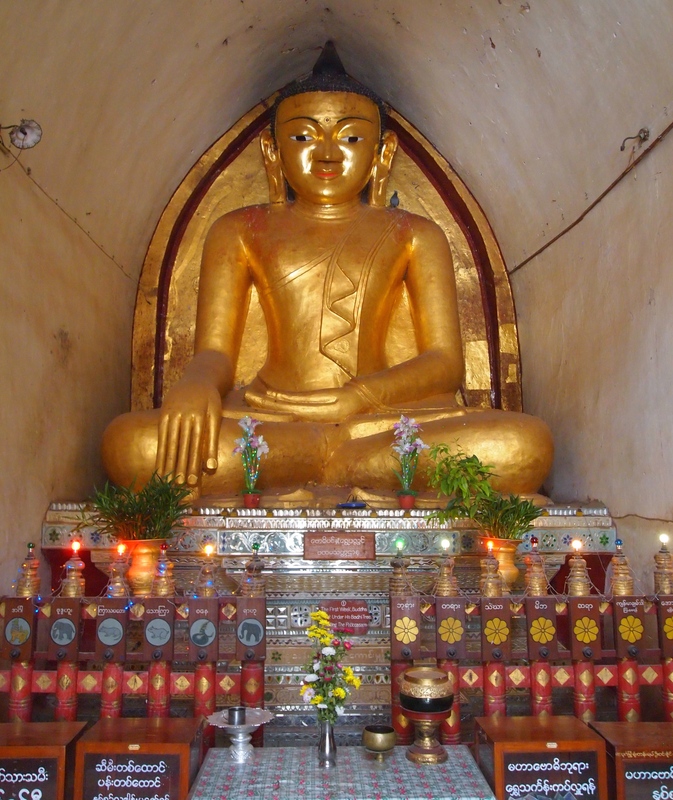 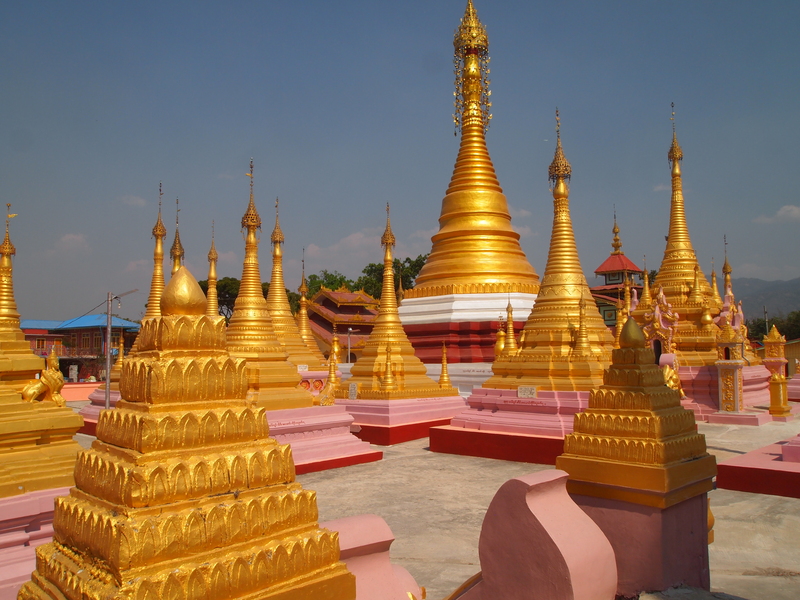 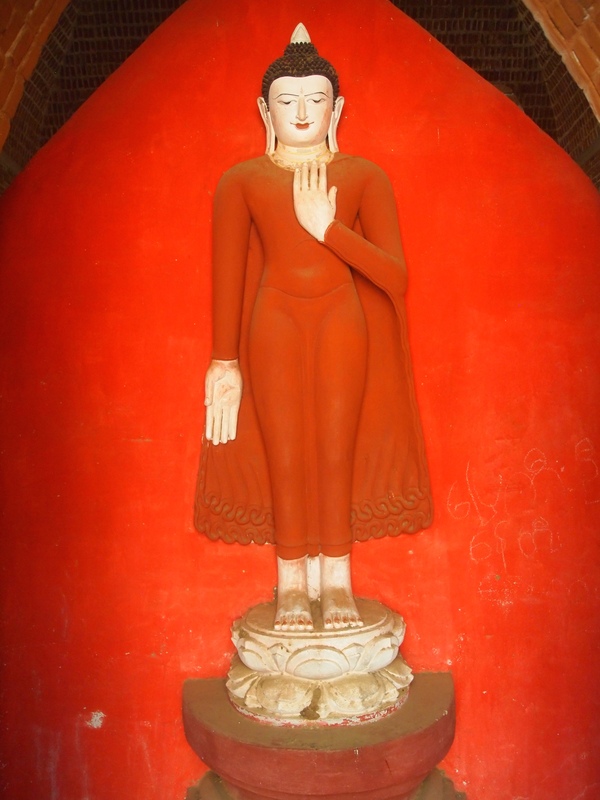 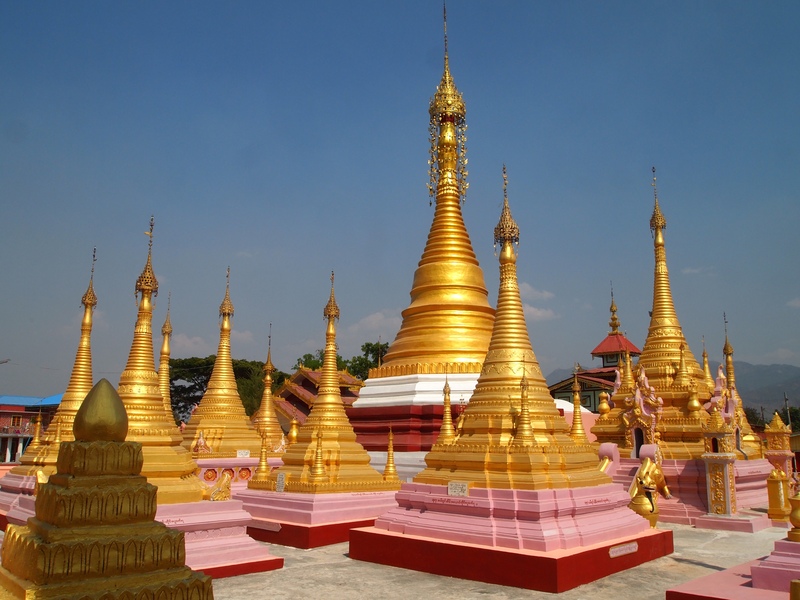 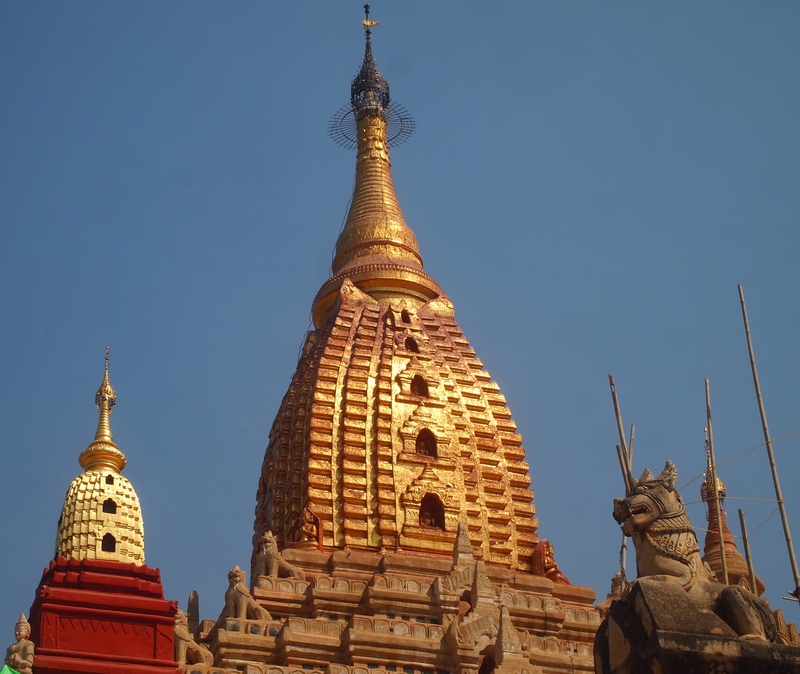 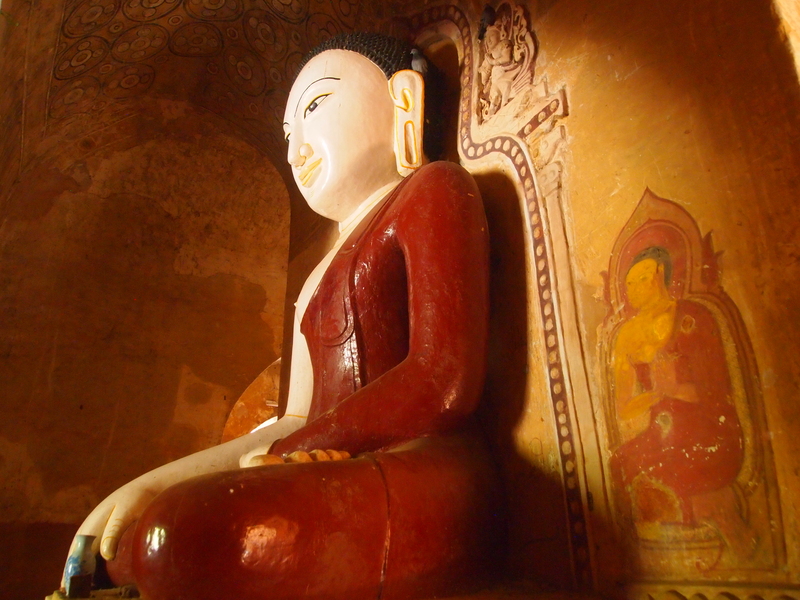 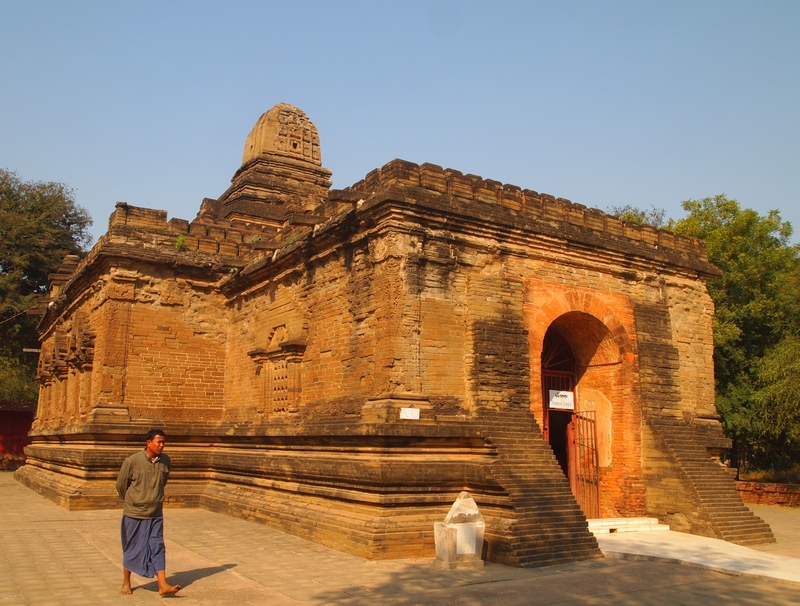 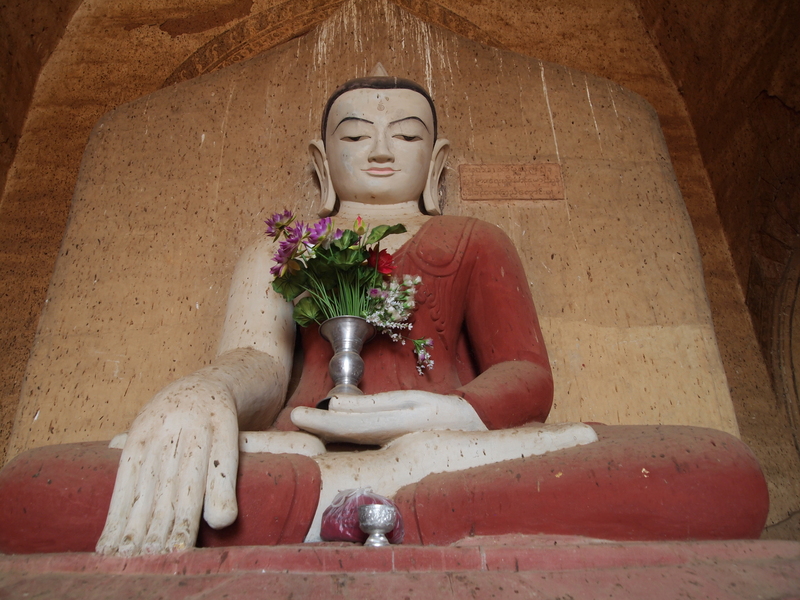 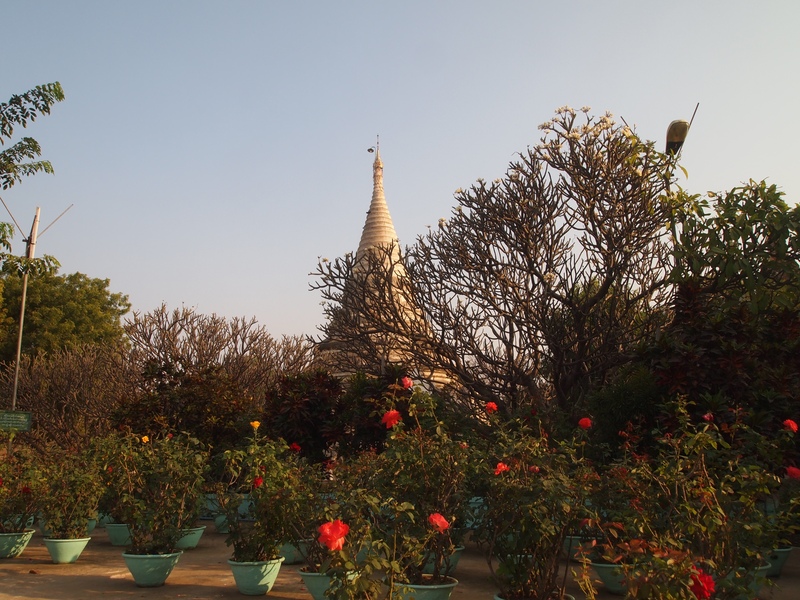 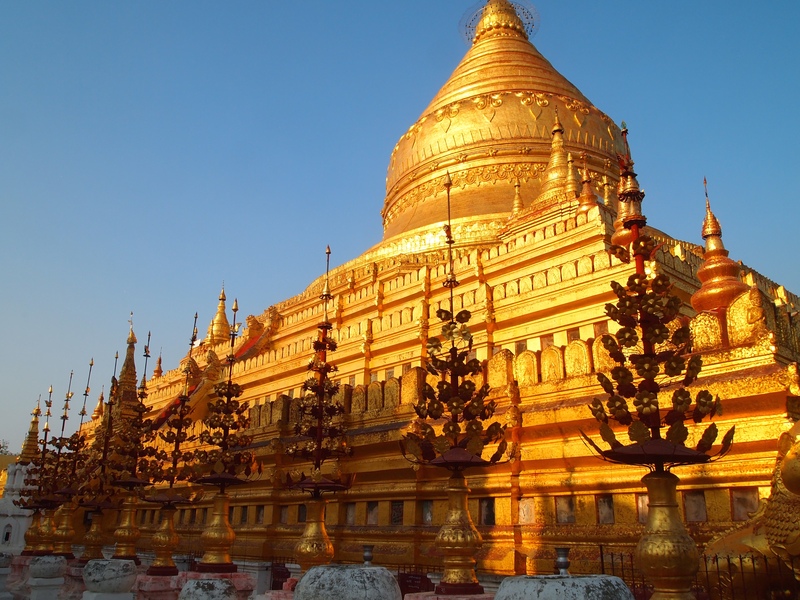 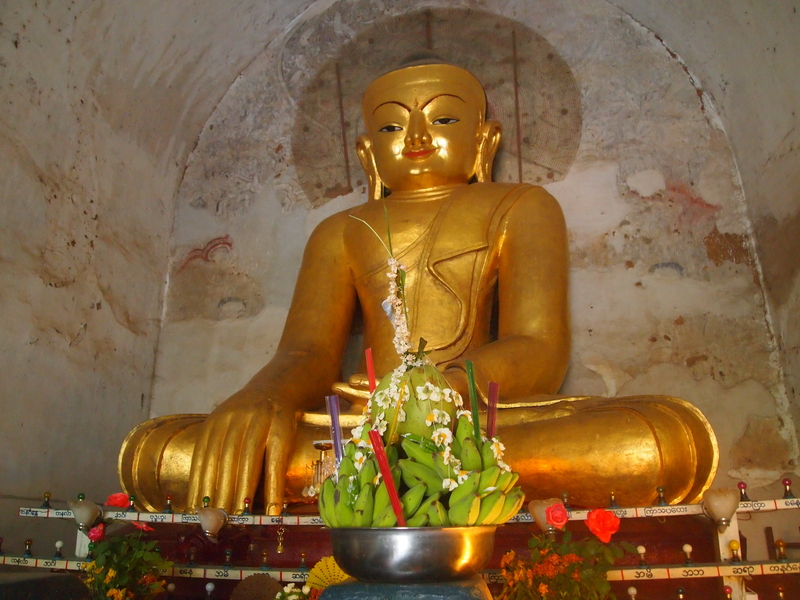 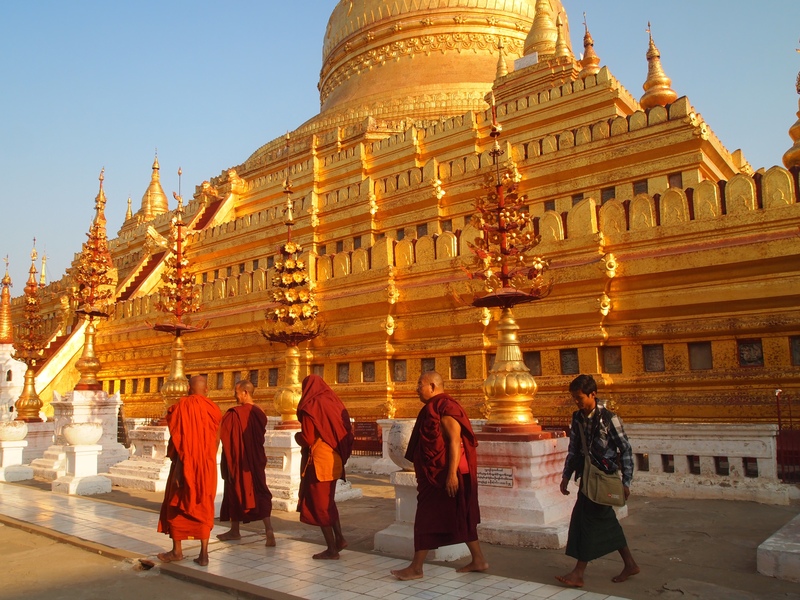 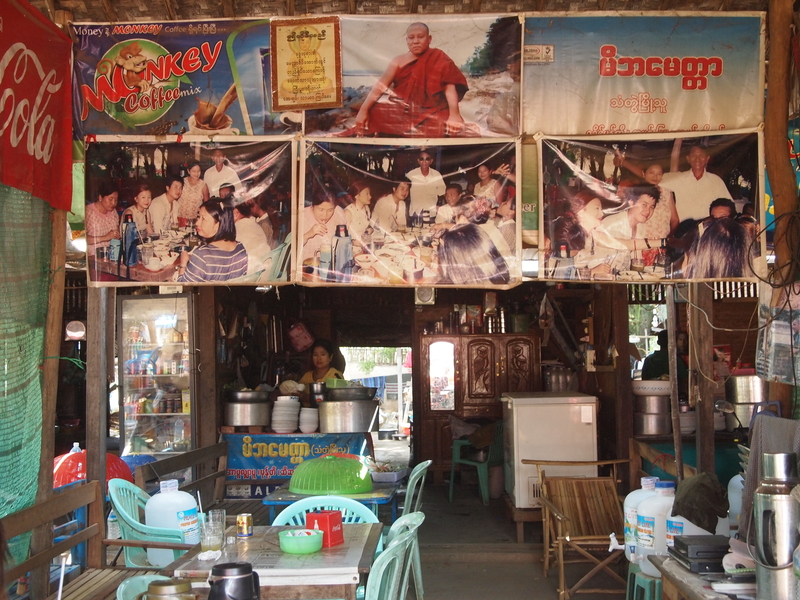 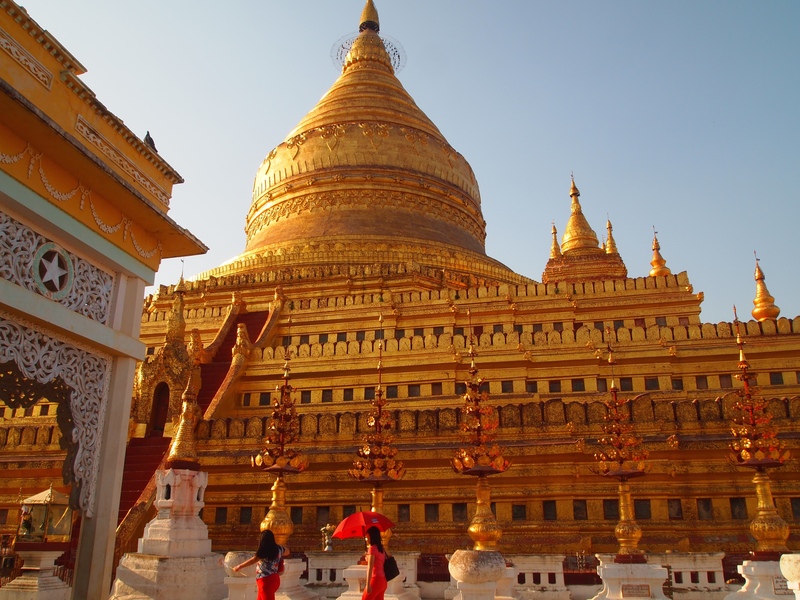 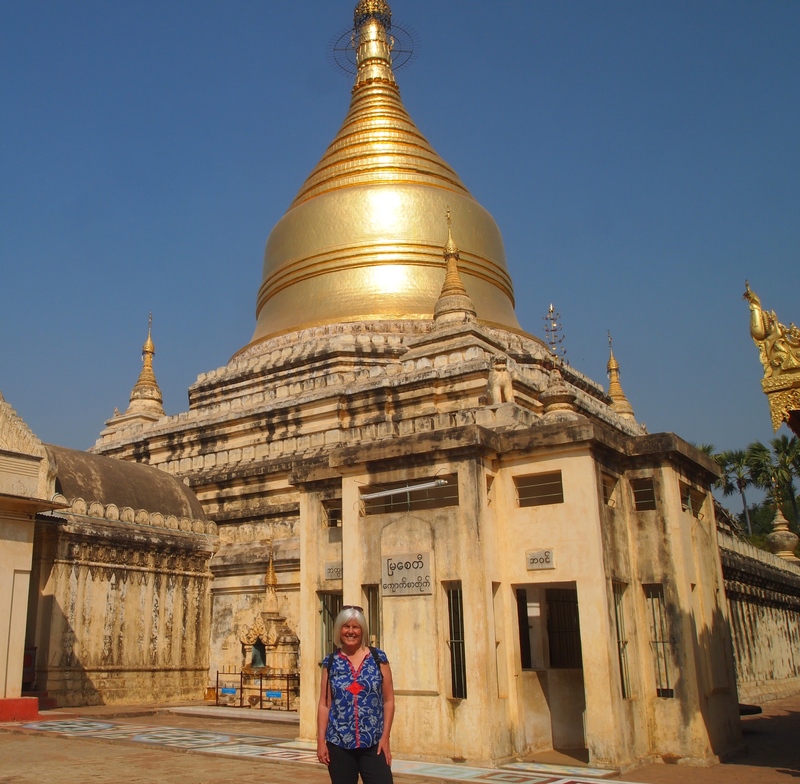 During this time, the region’s beliefs transitioned from Hindu and Mahayana Buddhist beliefs to the Theravada Buddhist beliefs that have since defined Myanmar. 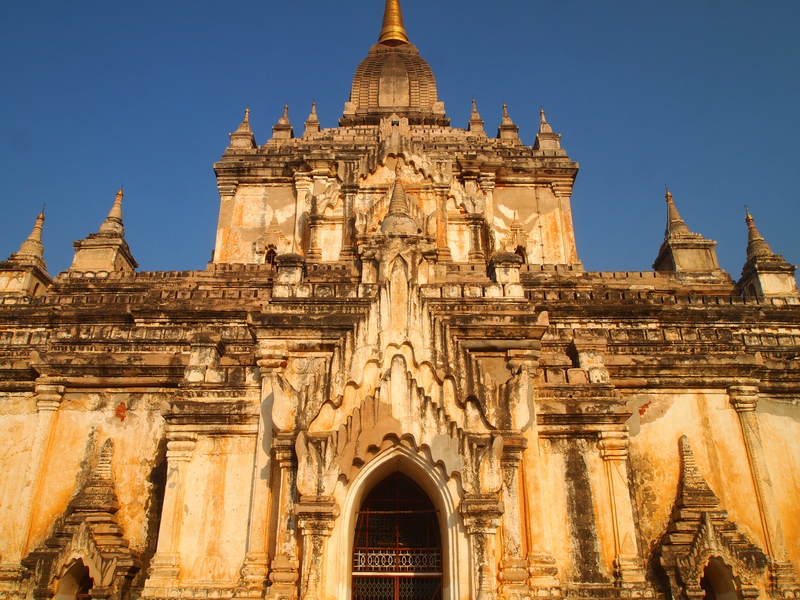 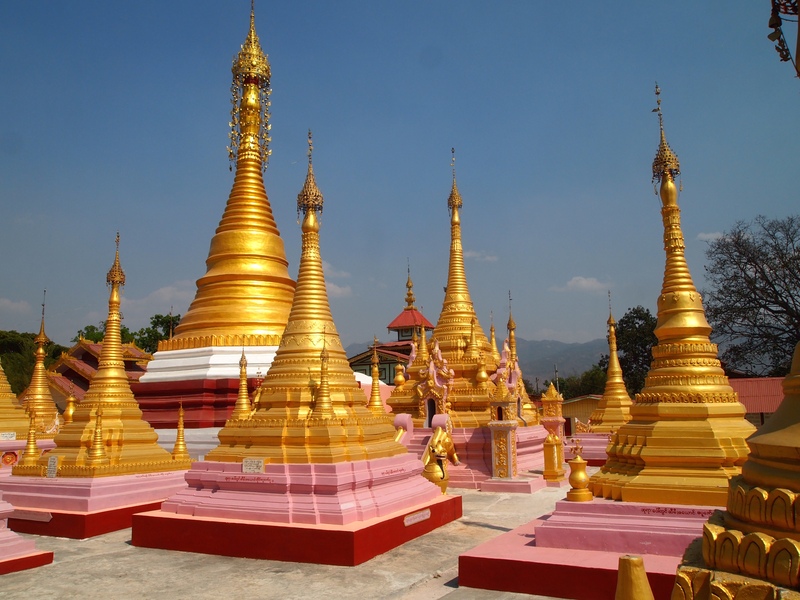 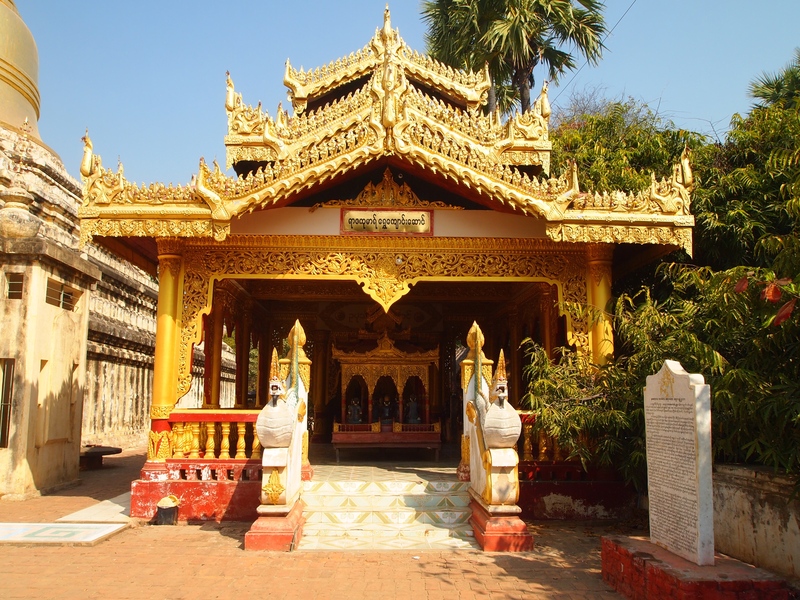 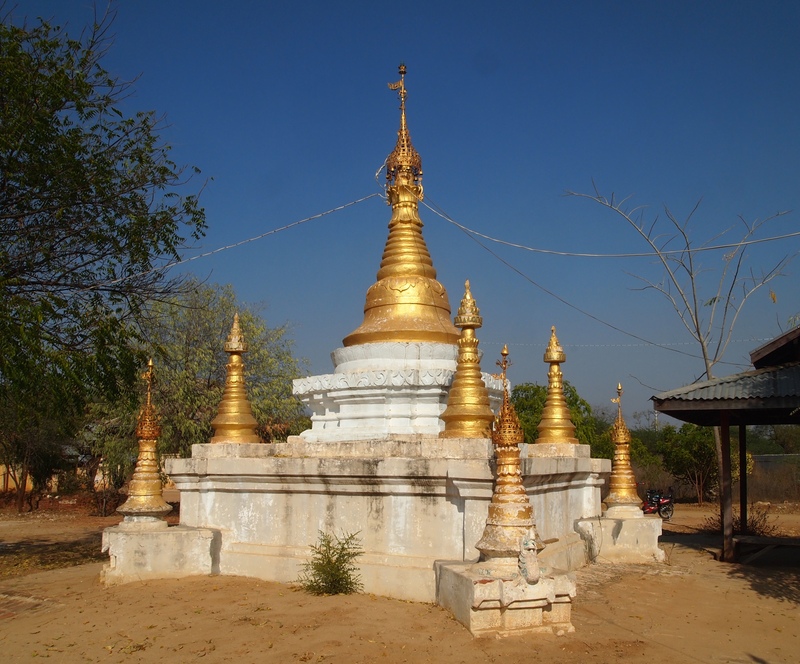 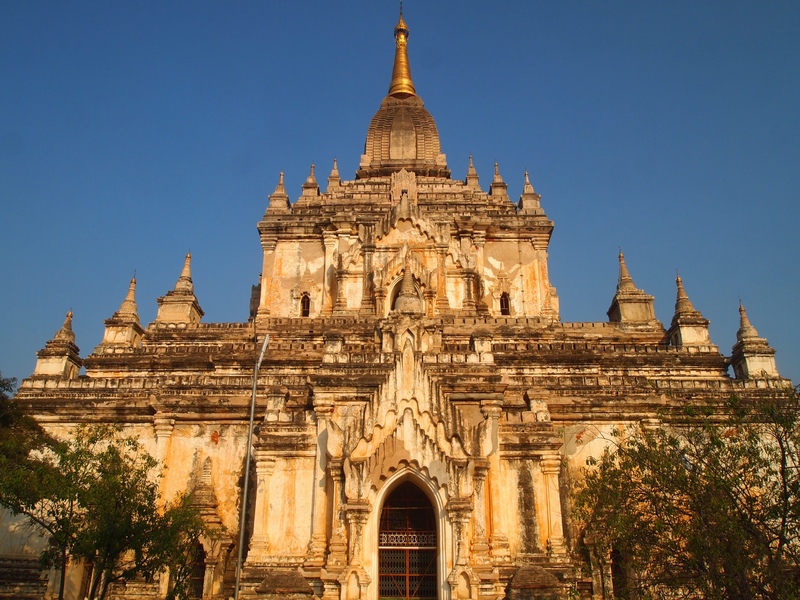 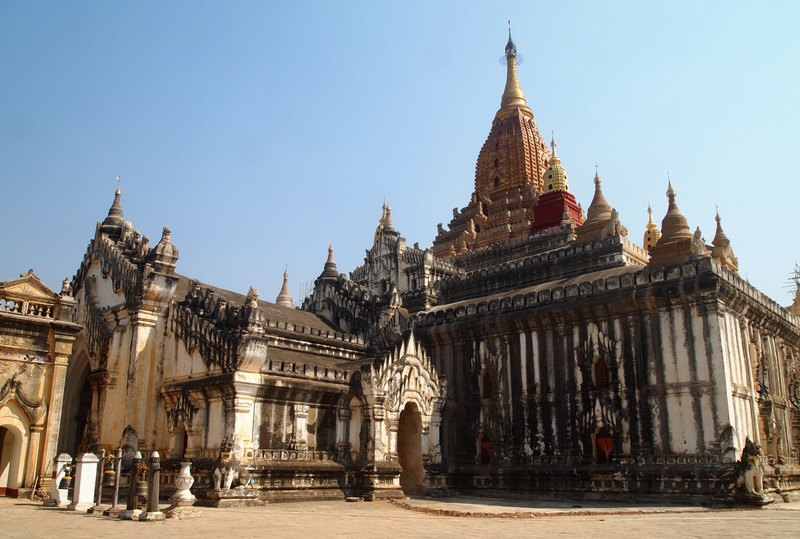 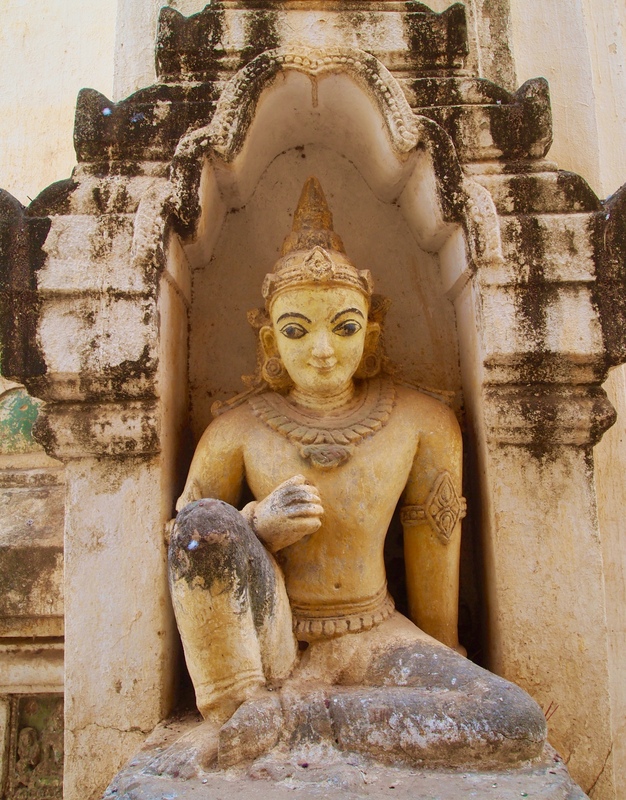 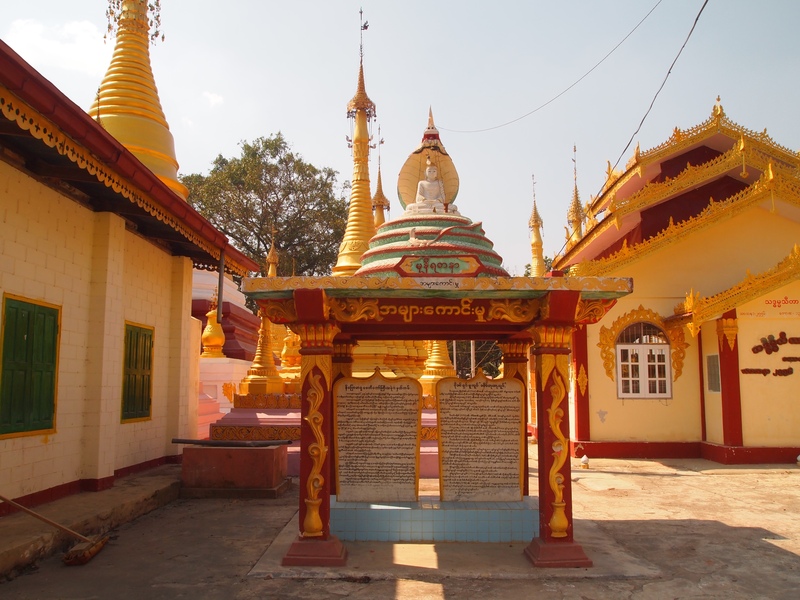 King Anawrahta, newly converted by a monk sent by Manuha, the Mon King of Thaton, took his religious beliefs to a feverish level, going on a building spree until “The First Burmese Empire” was created (Lonely Planet Myanmar (Burma)). 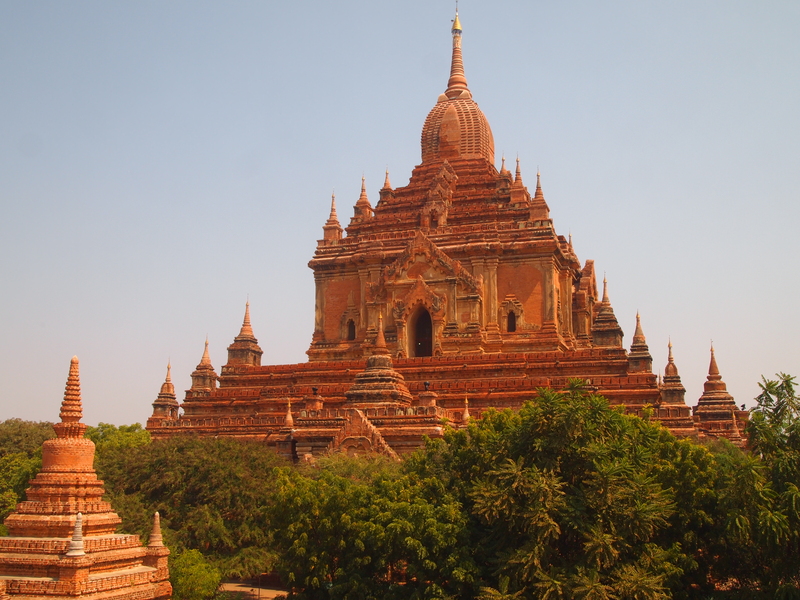 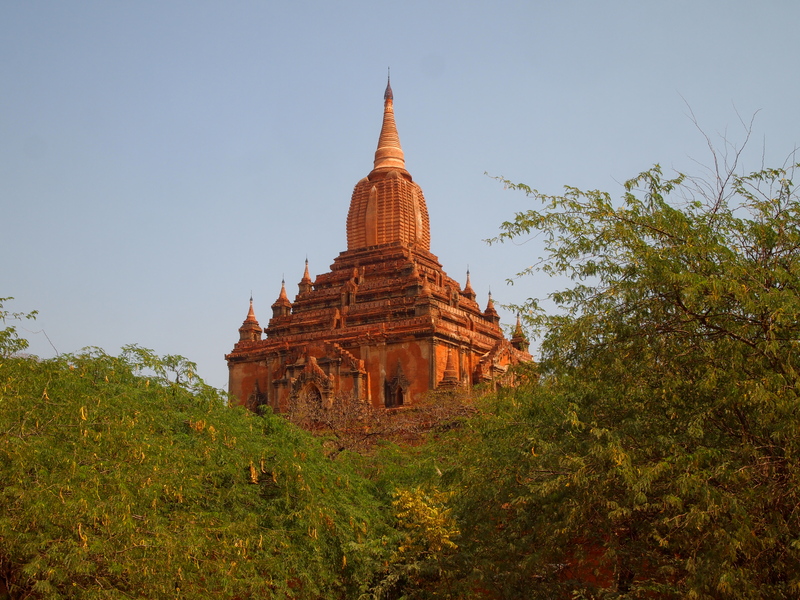 Historians disagree about what caused Bagan’s rapid decline in the 13th century. 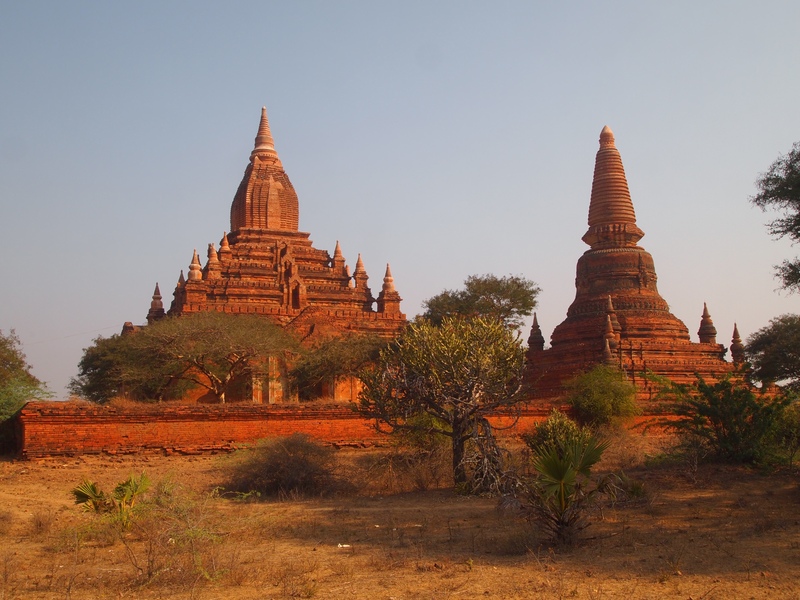 Some believe it was the Mongol invasions sent by Kublai Khan, and others believe that threats from China sent Bagan’s rulers into a panic. 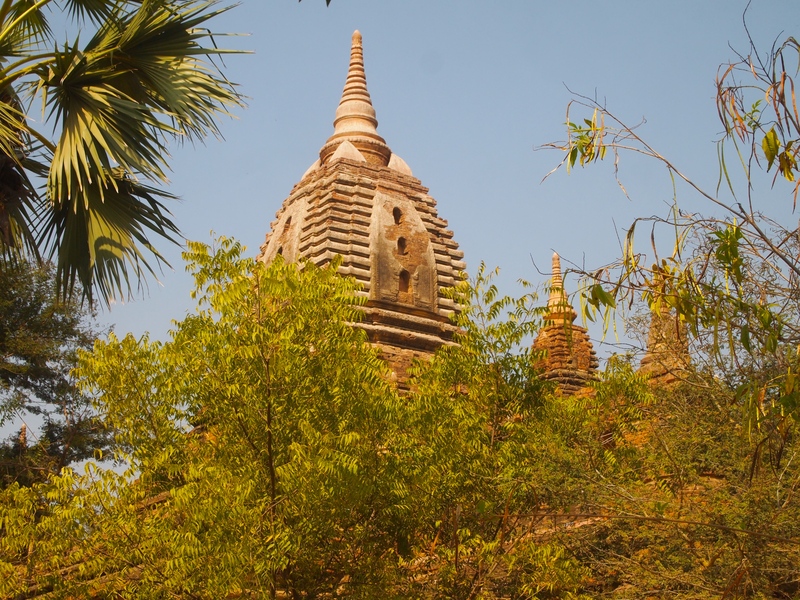 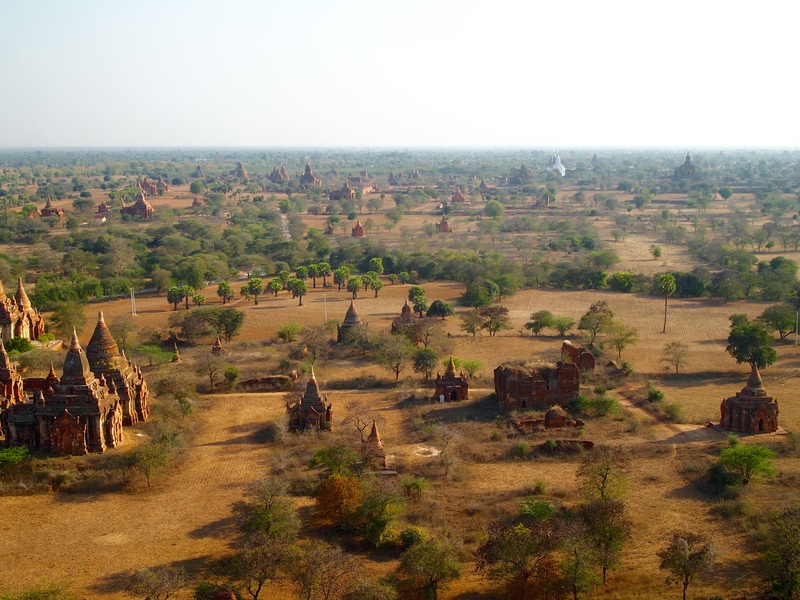 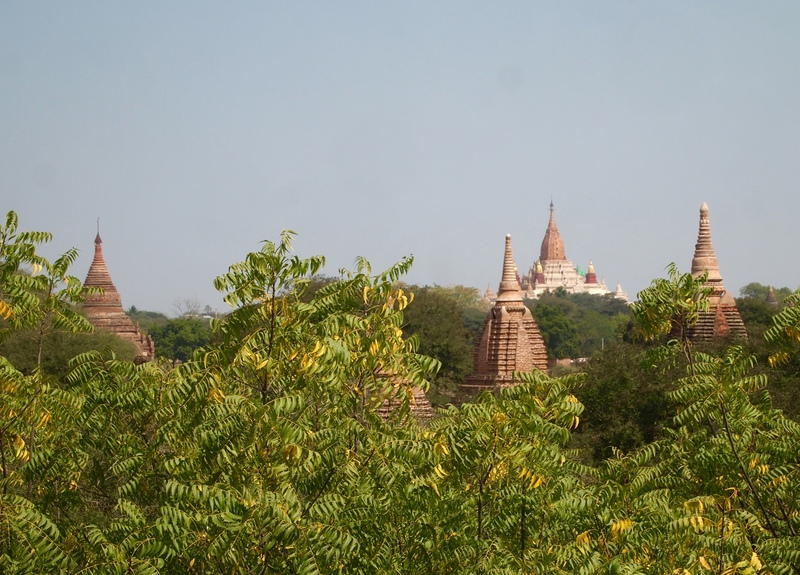 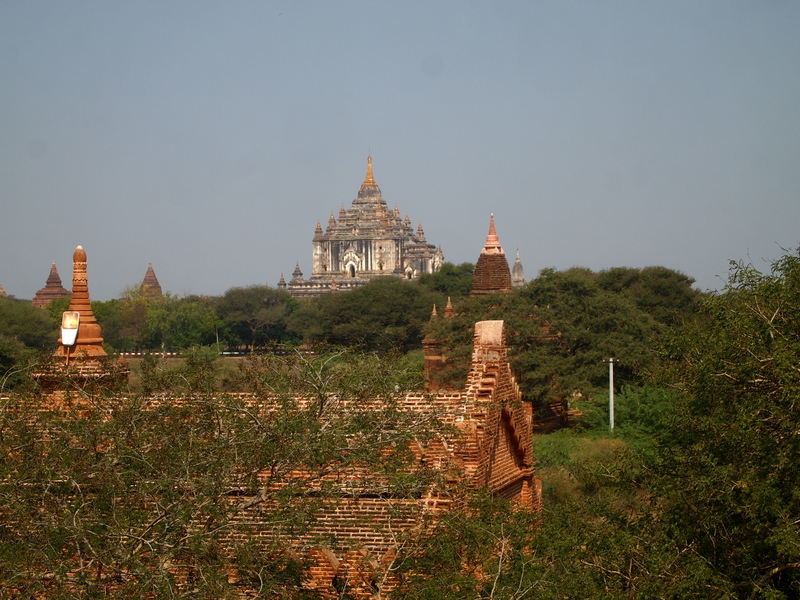 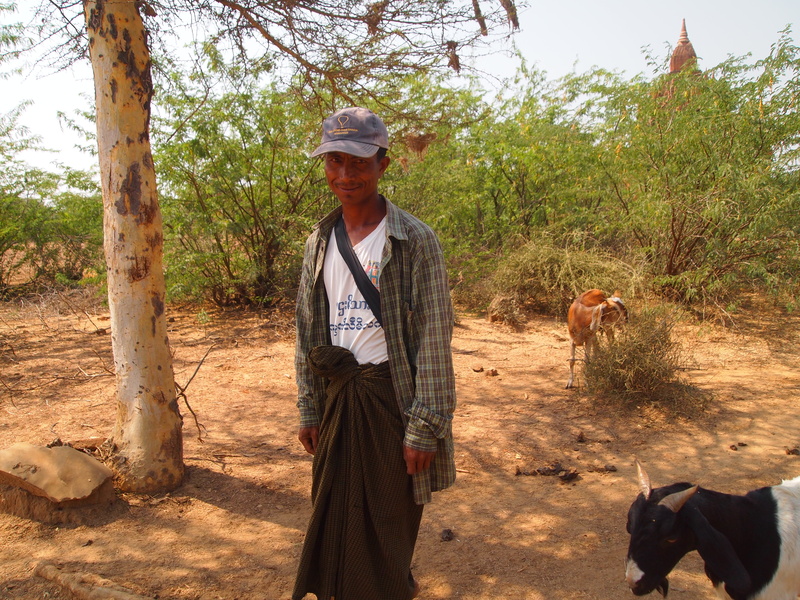 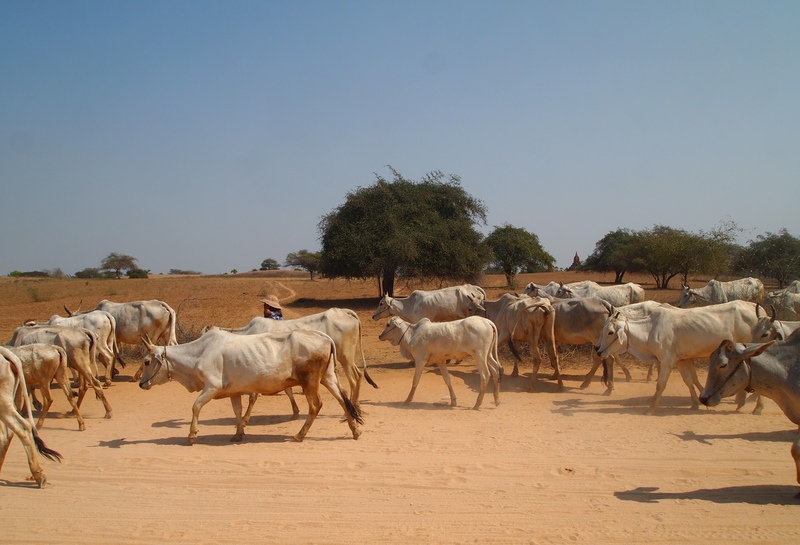 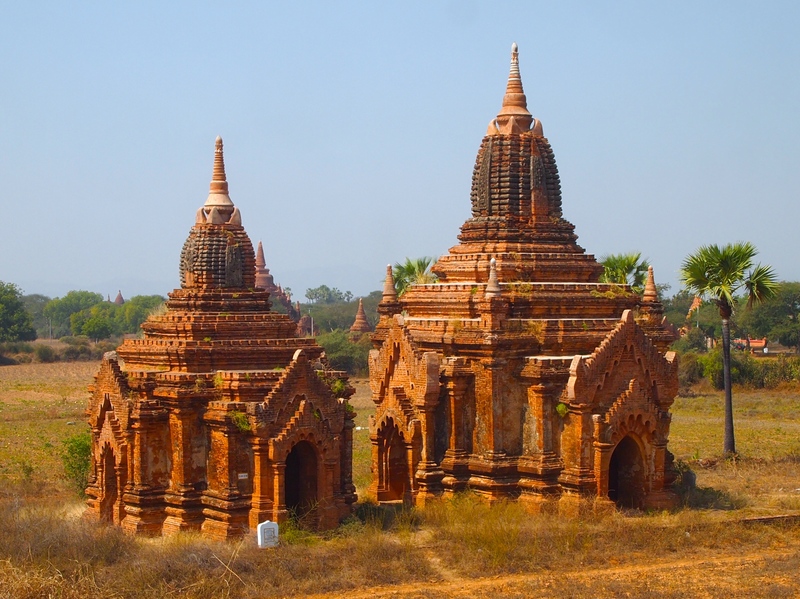 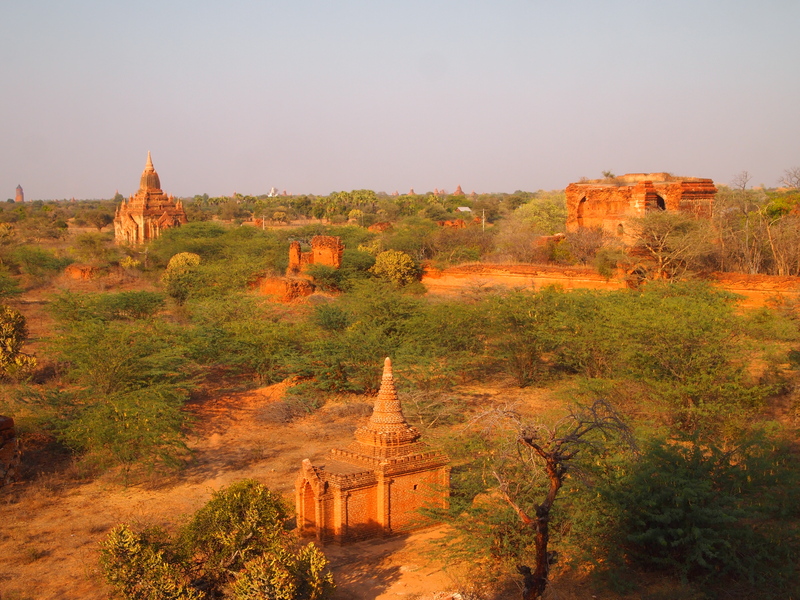 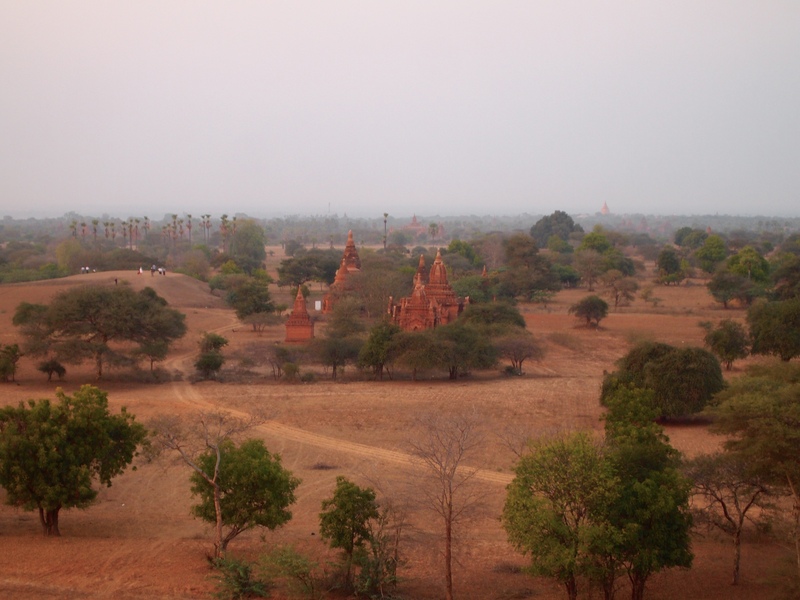 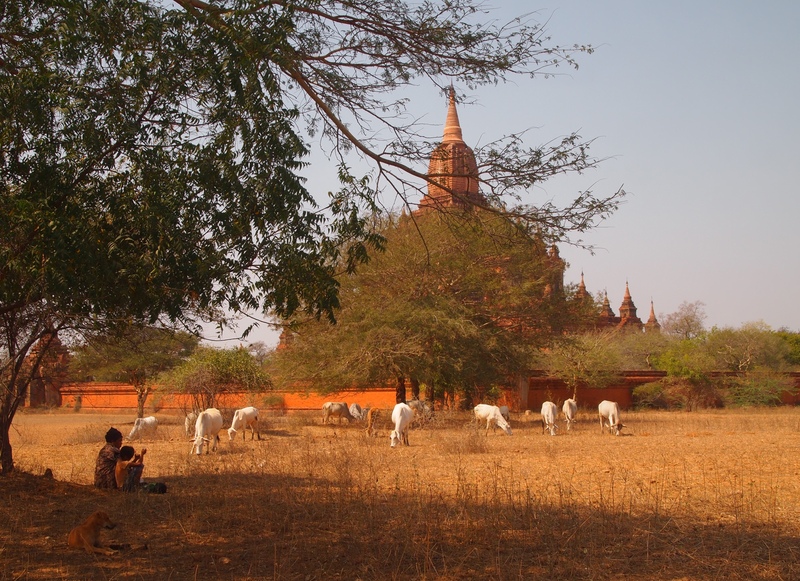 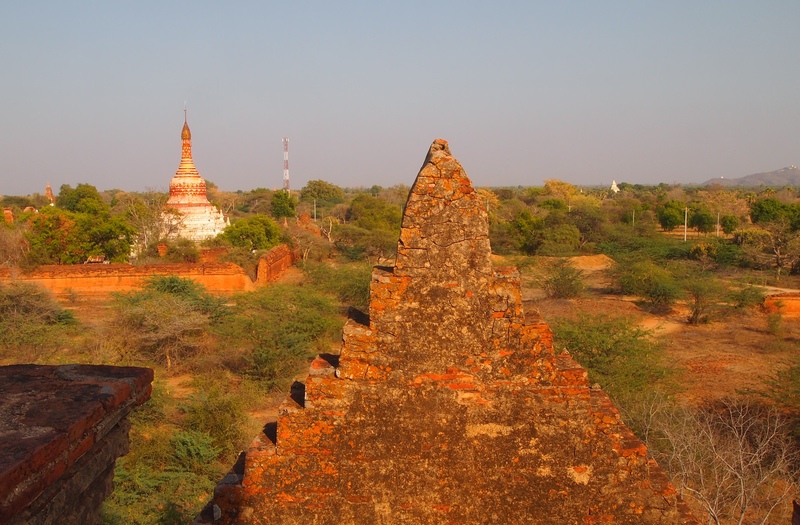 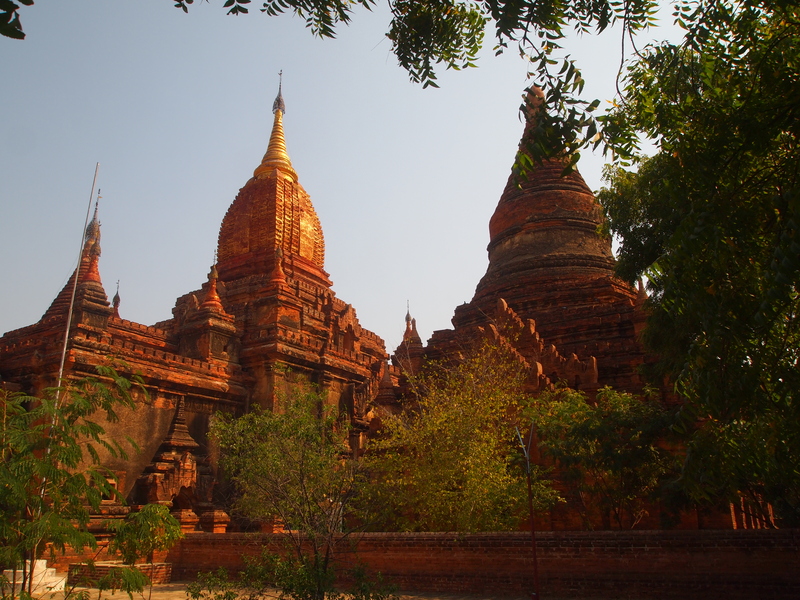 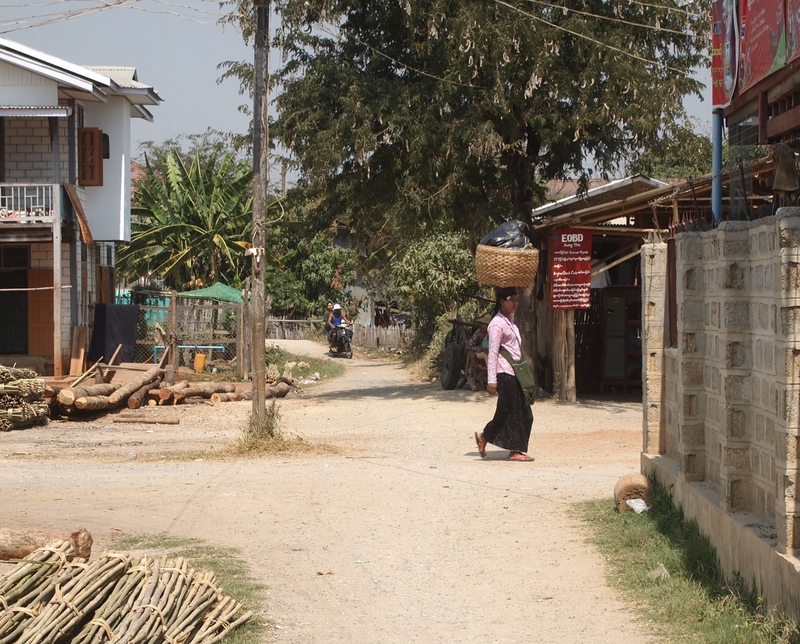 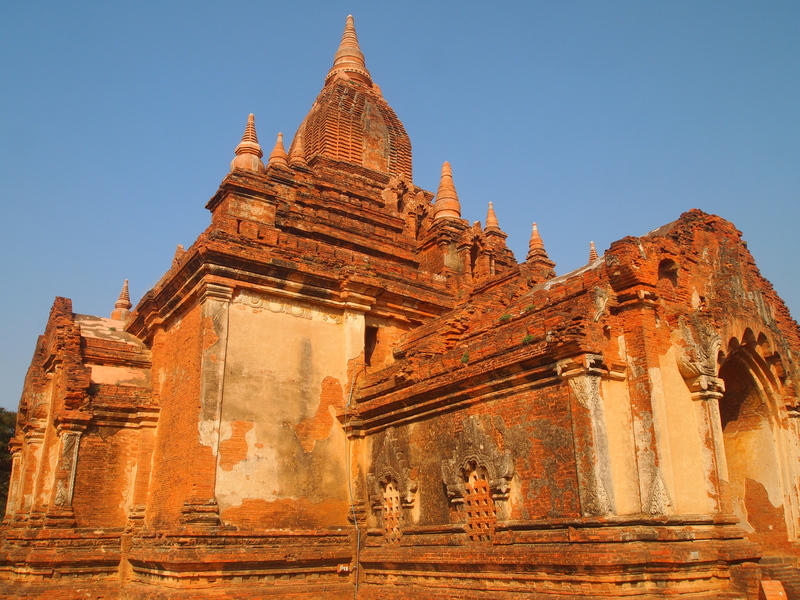 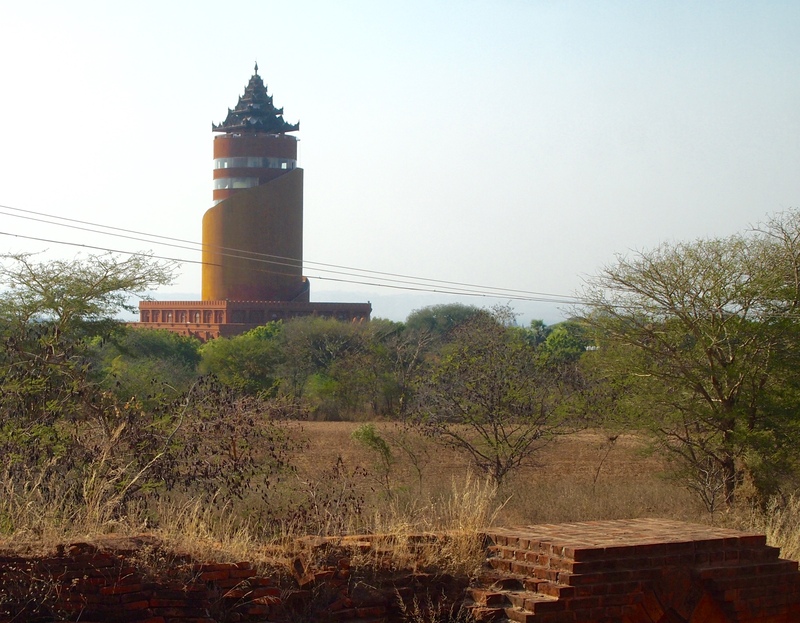 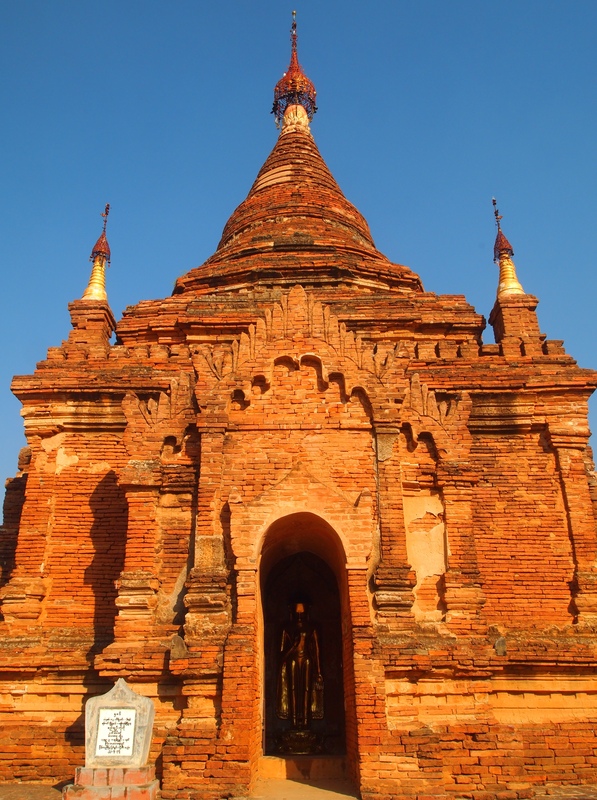 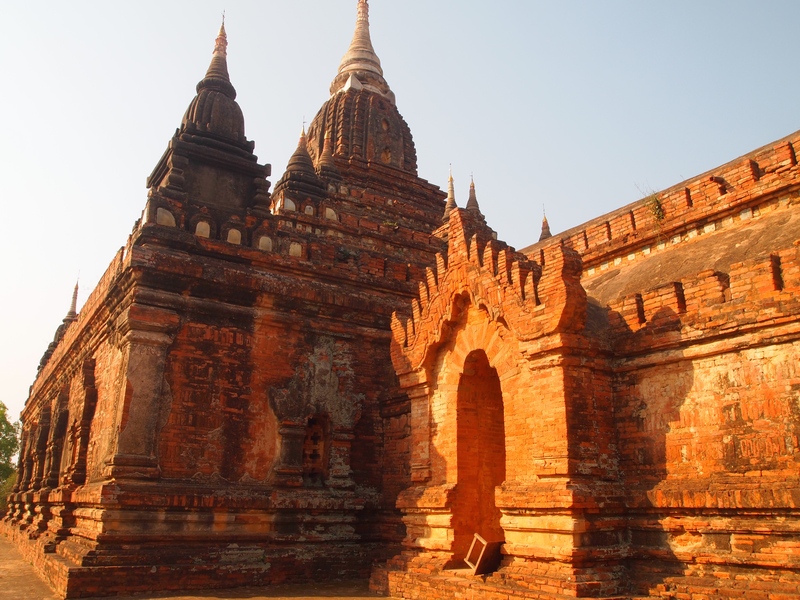 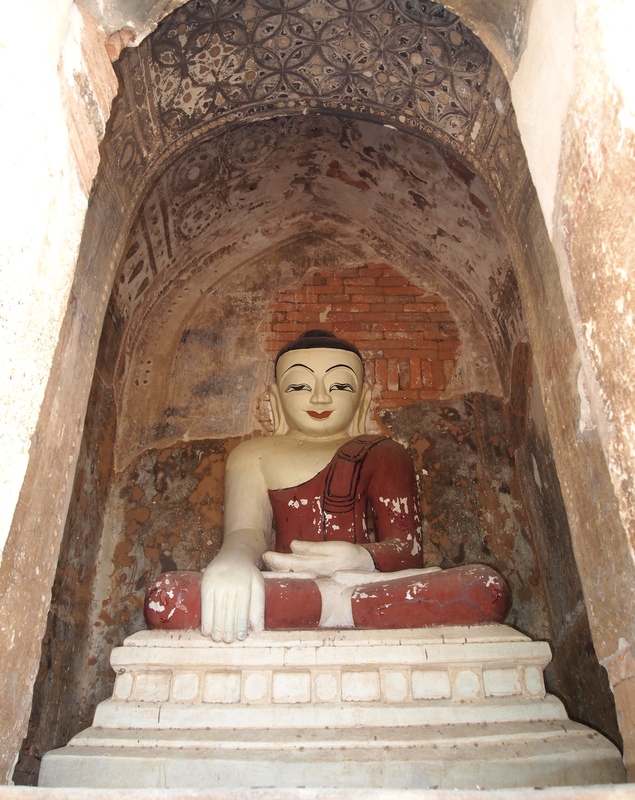 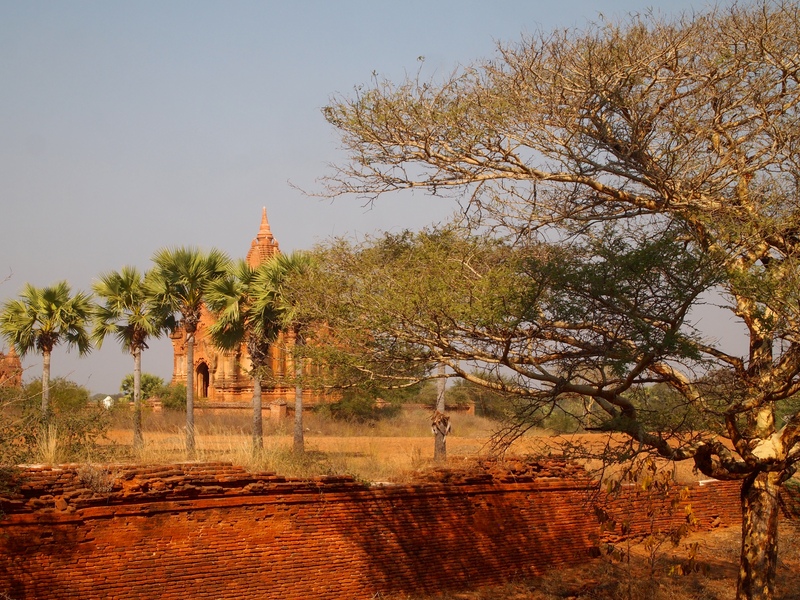 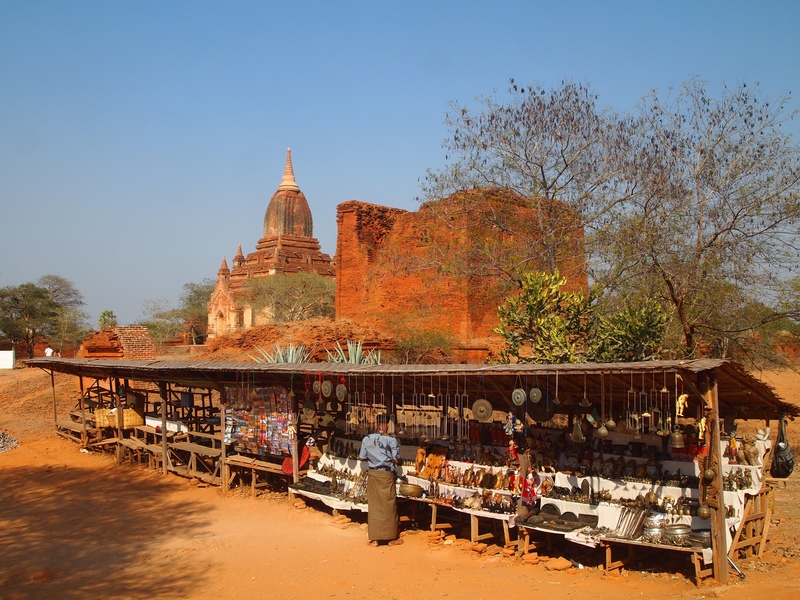 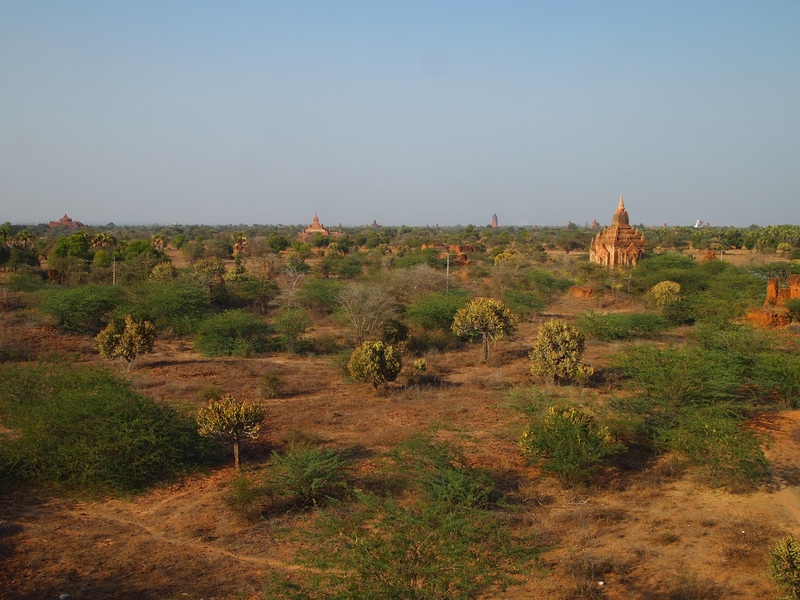 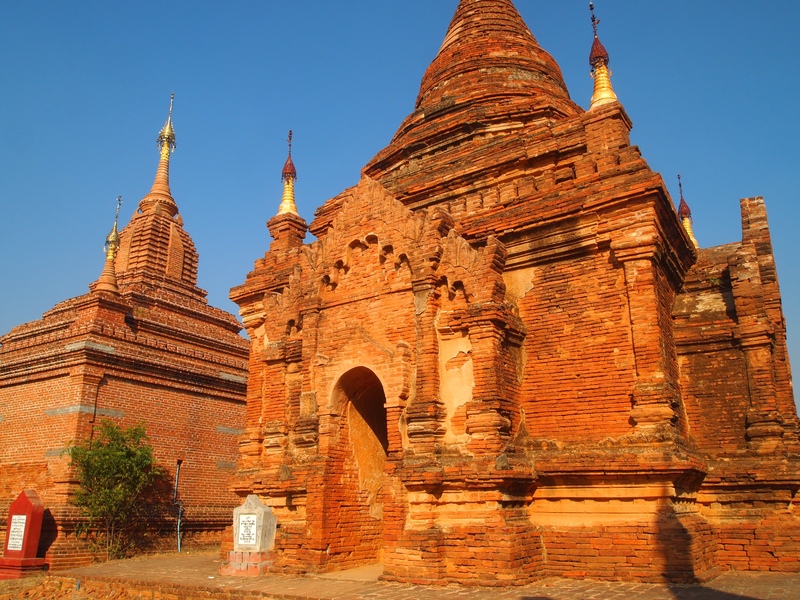 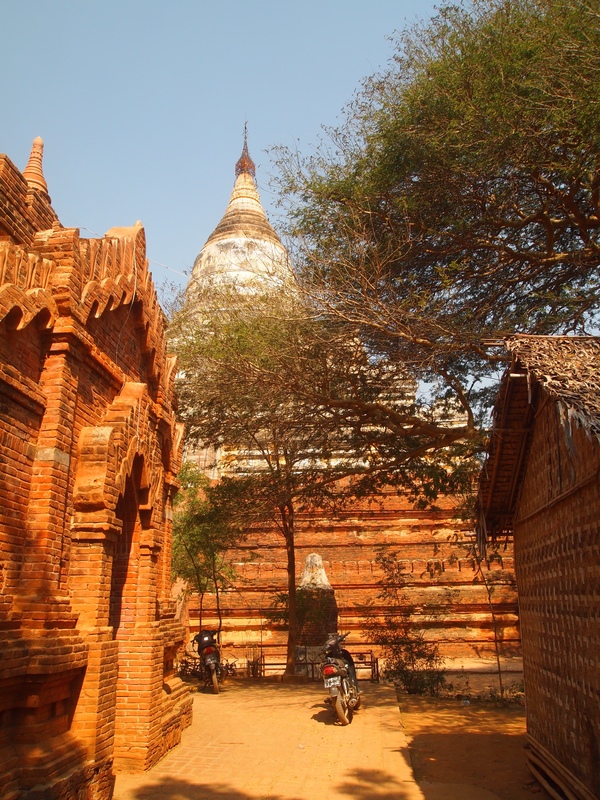 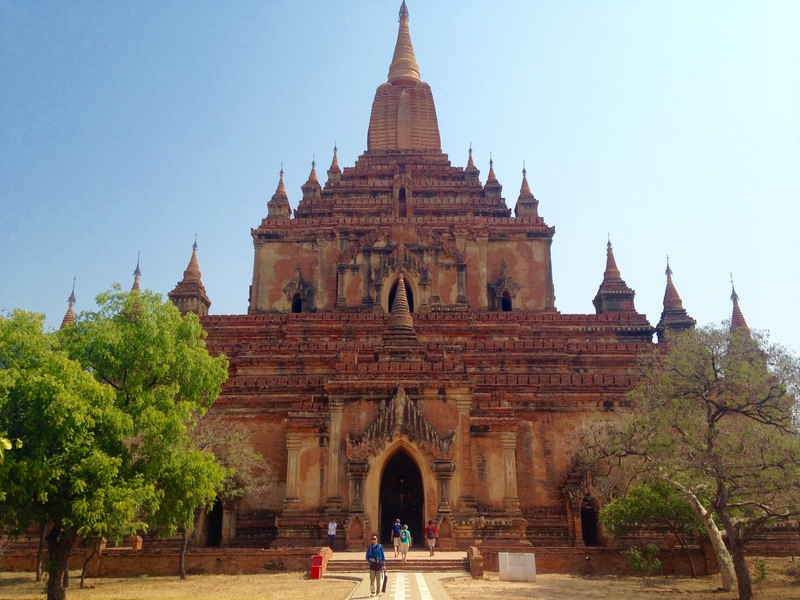 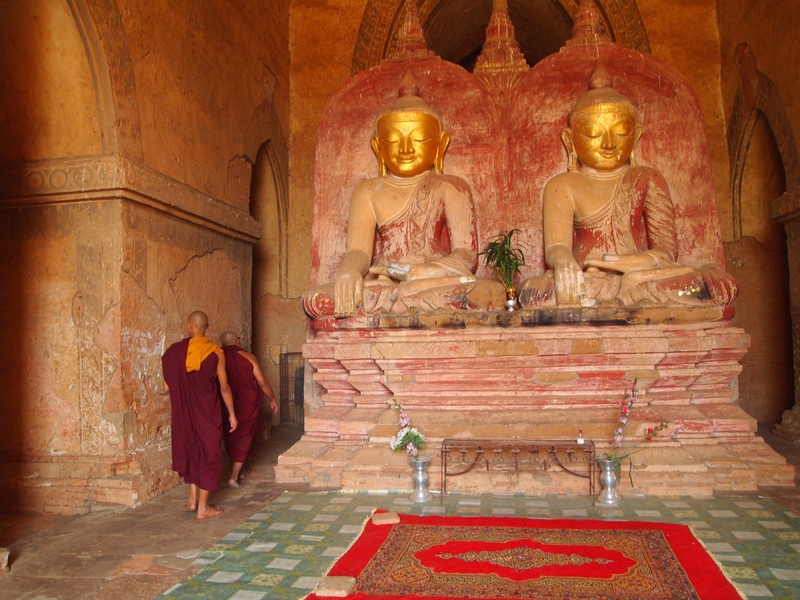 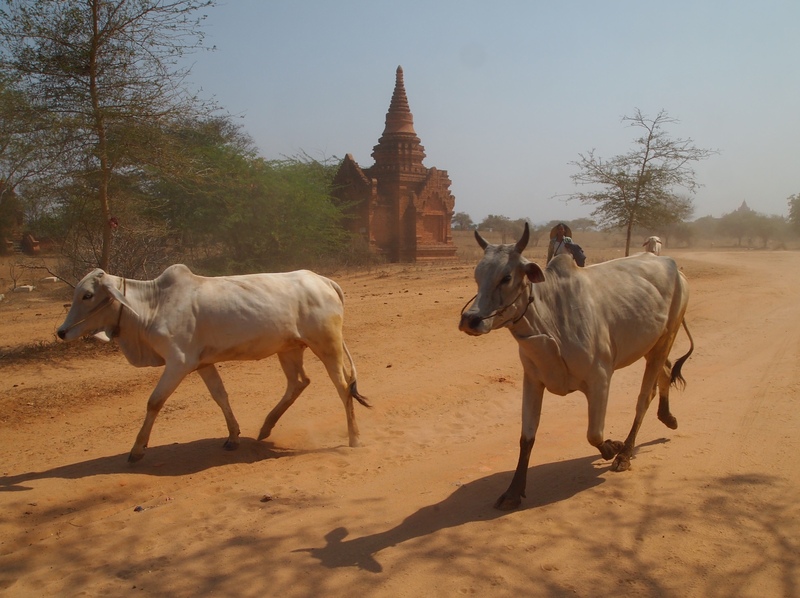 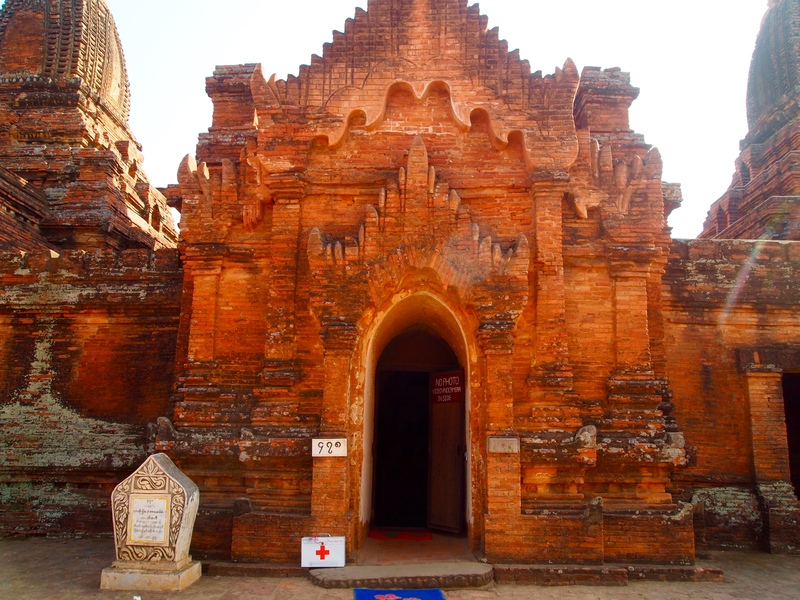 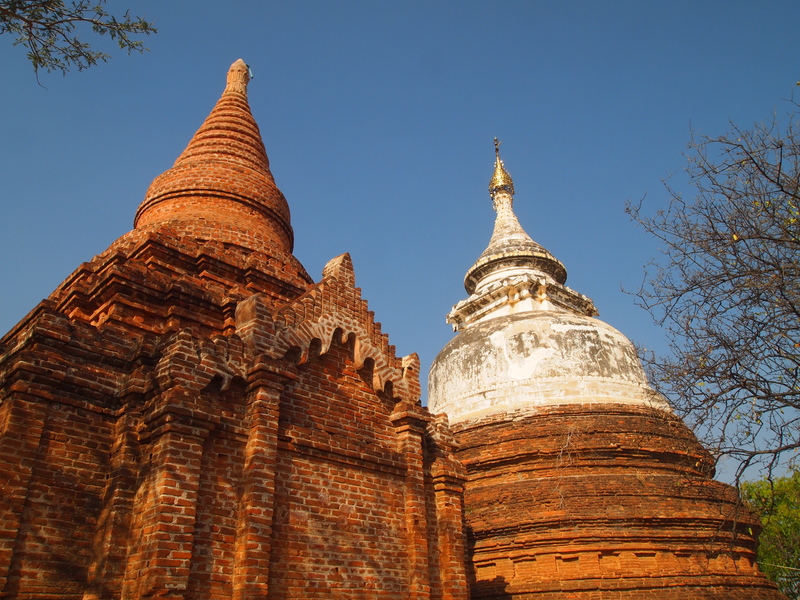 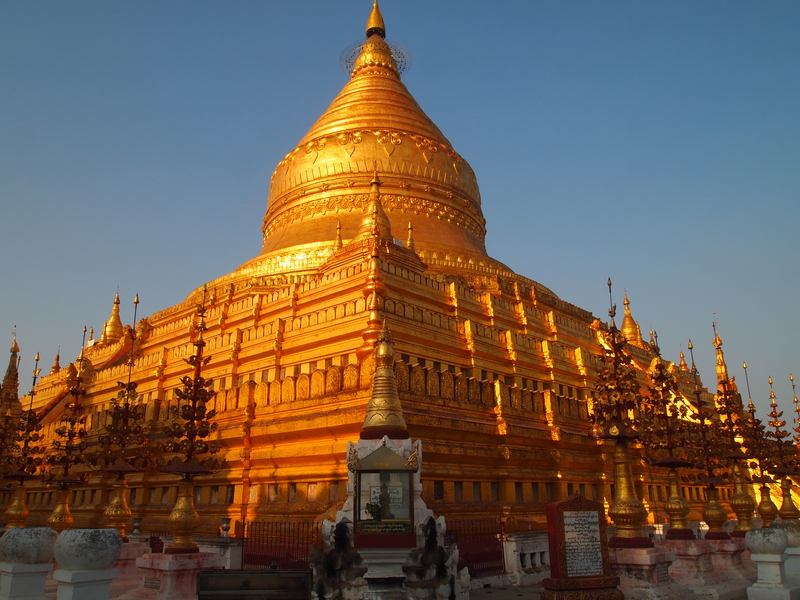 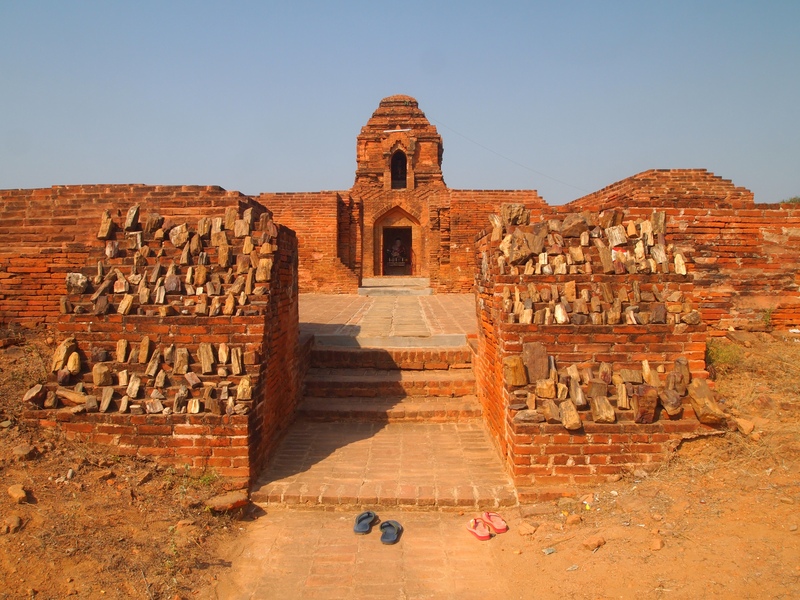 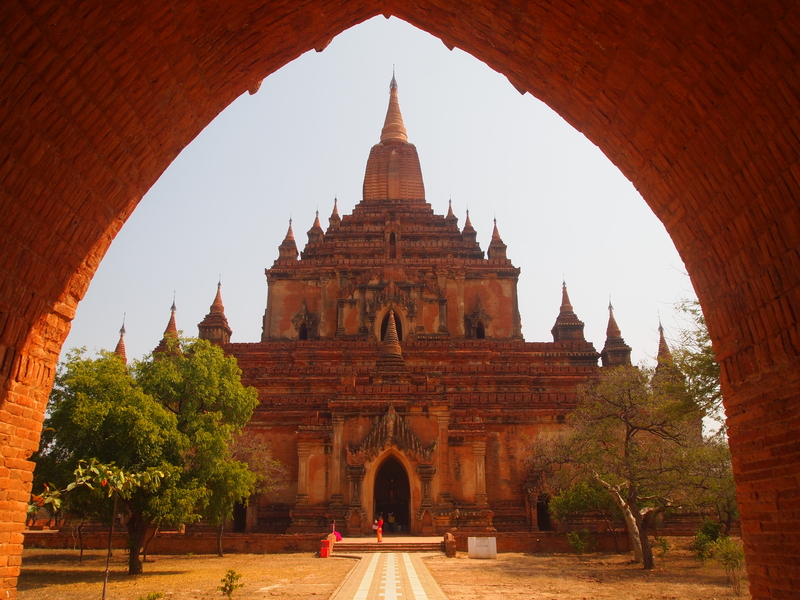 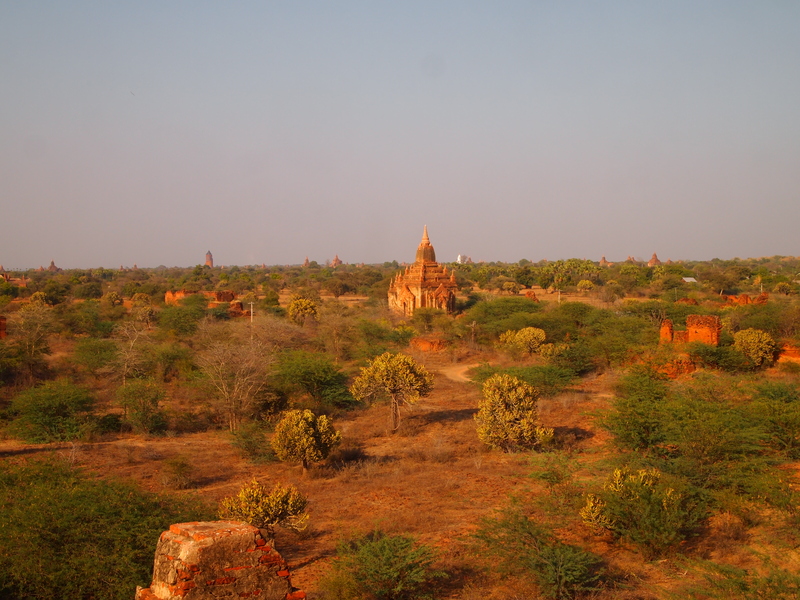 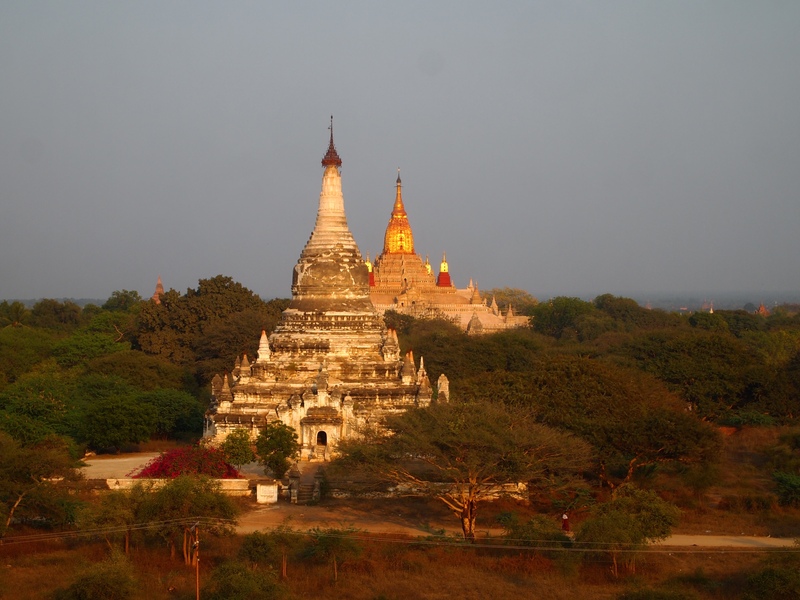 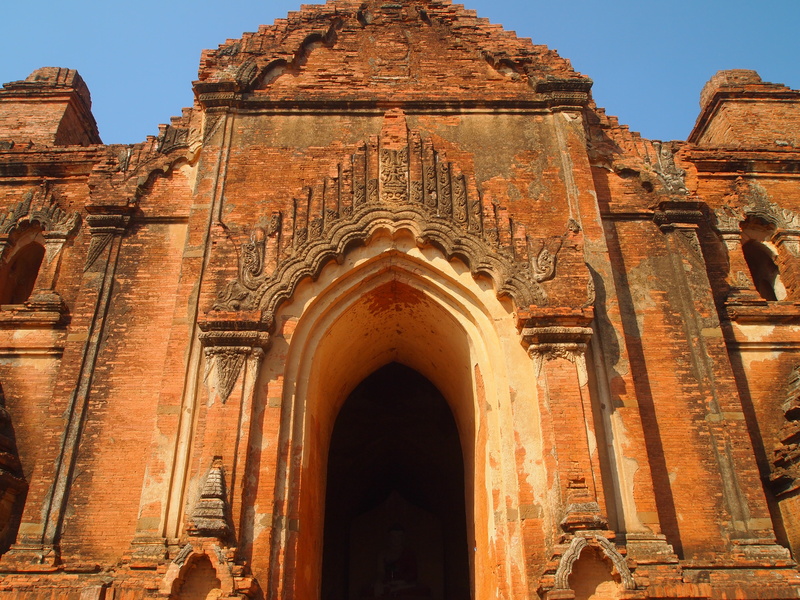 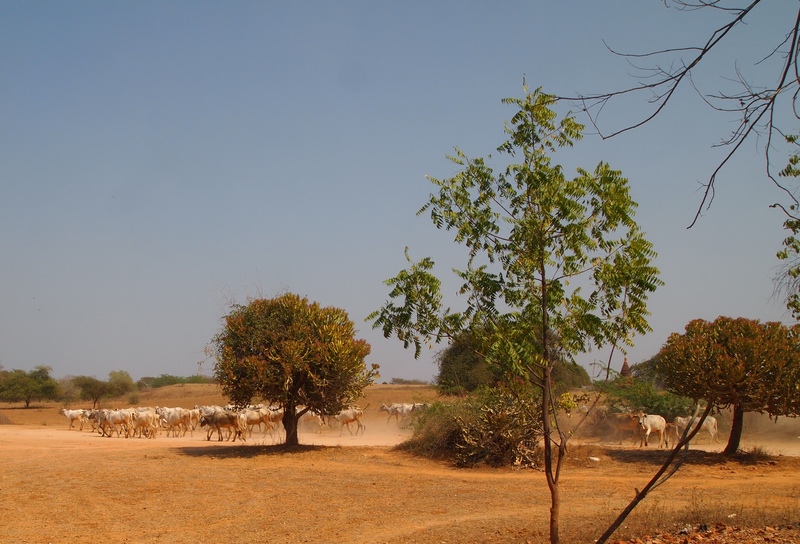 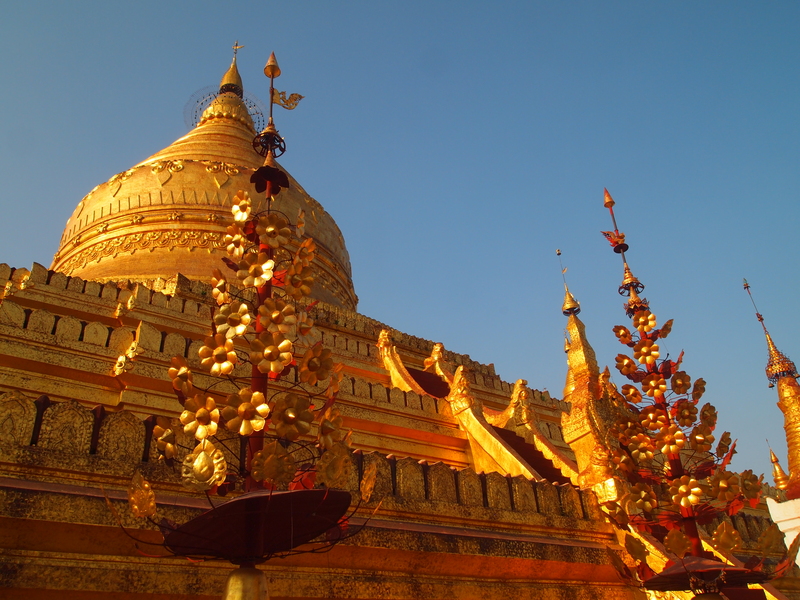 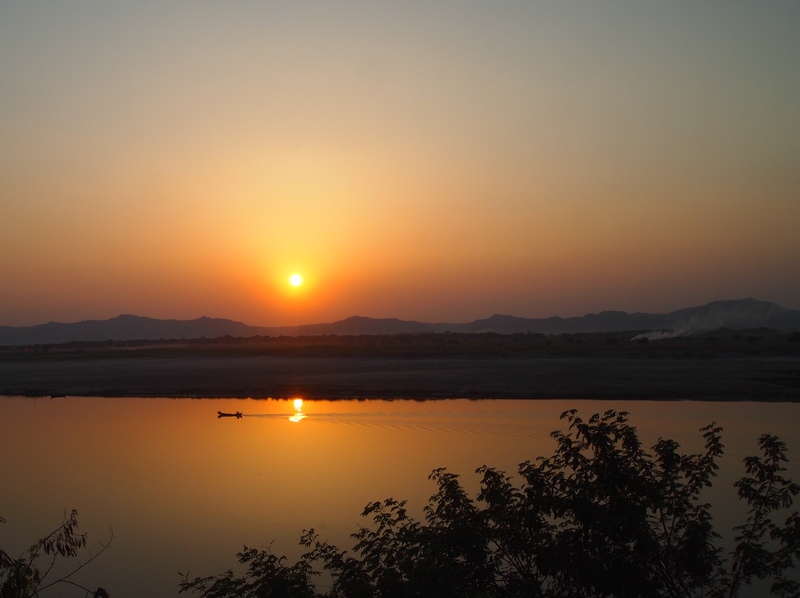 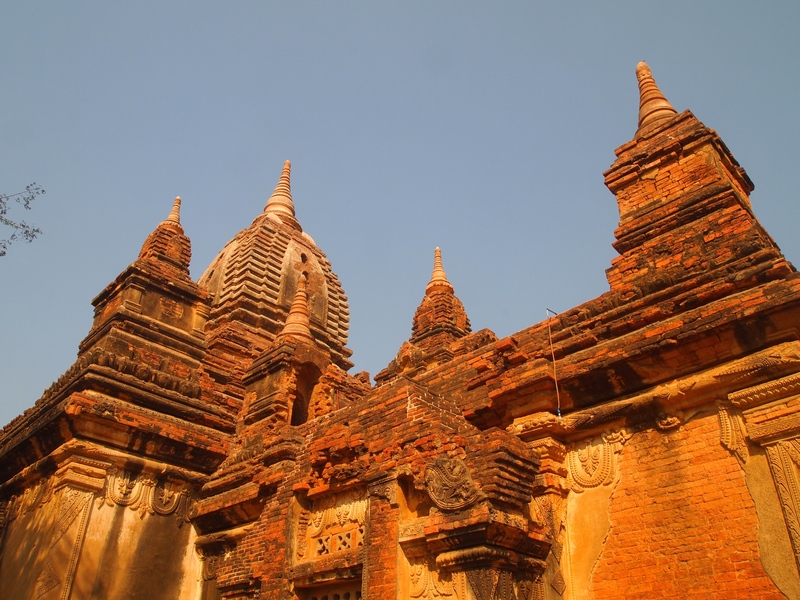 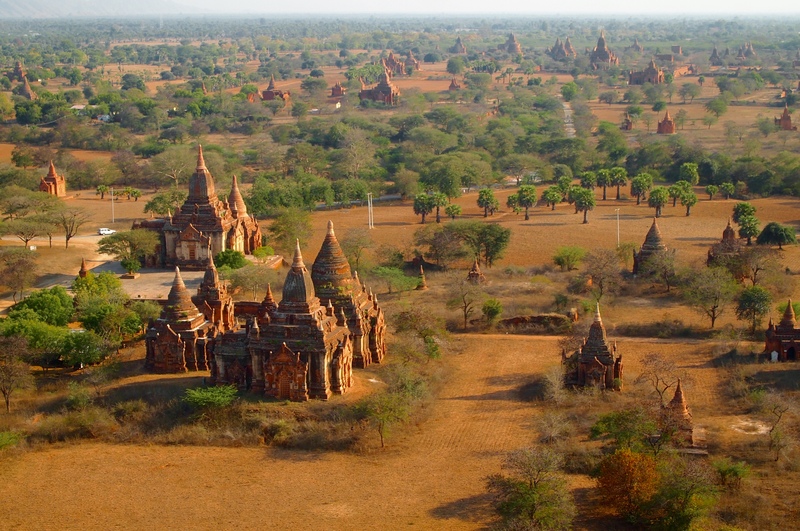 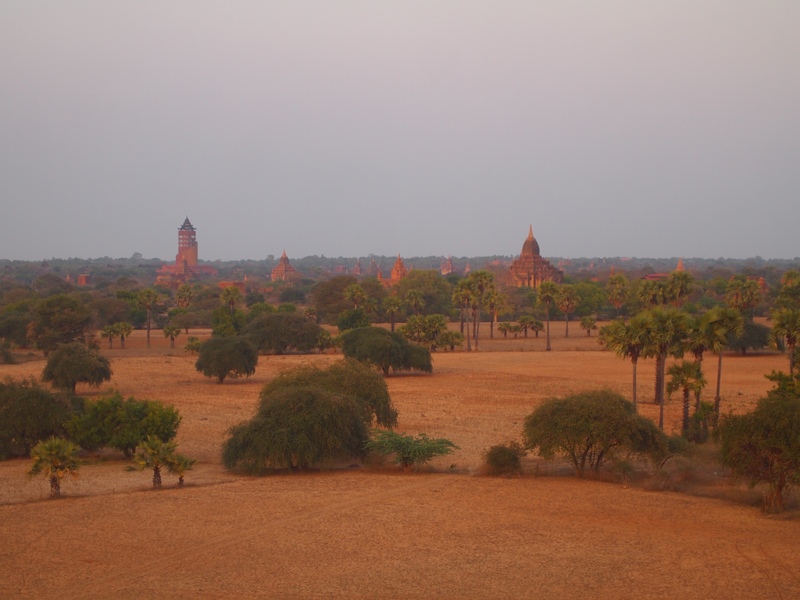 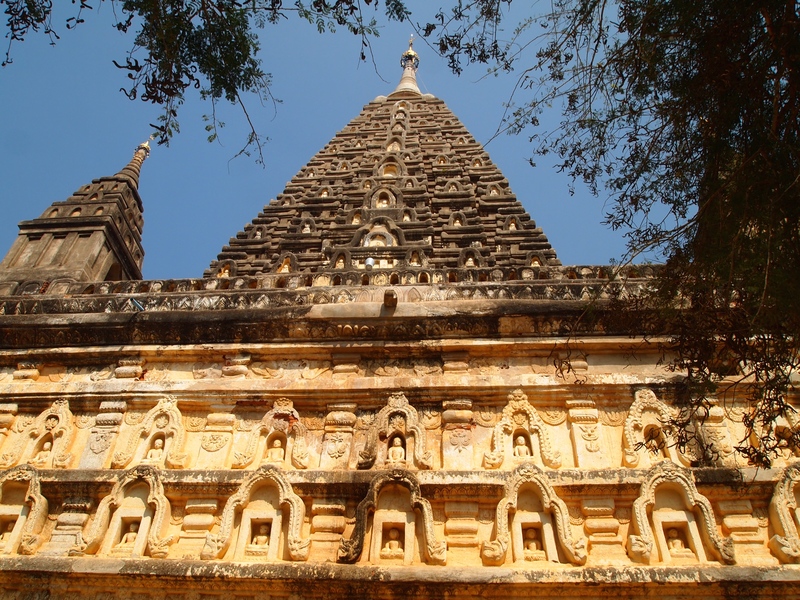 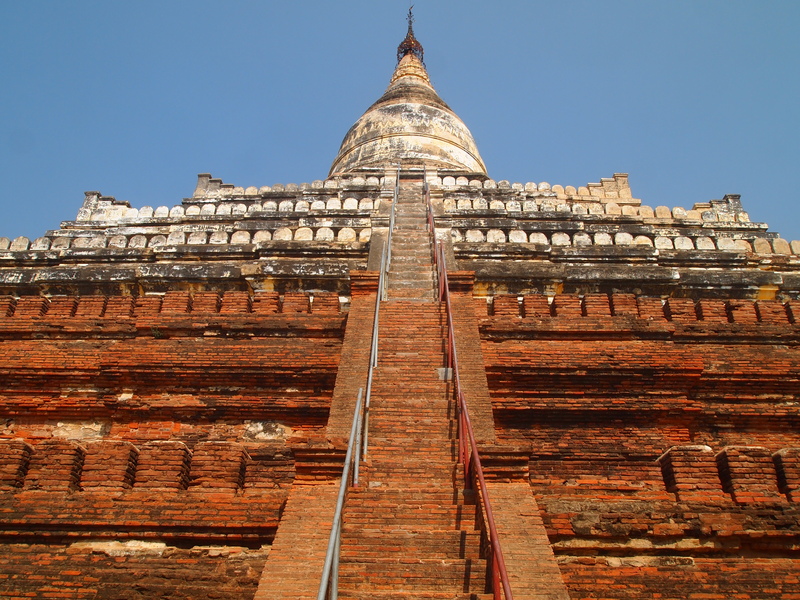 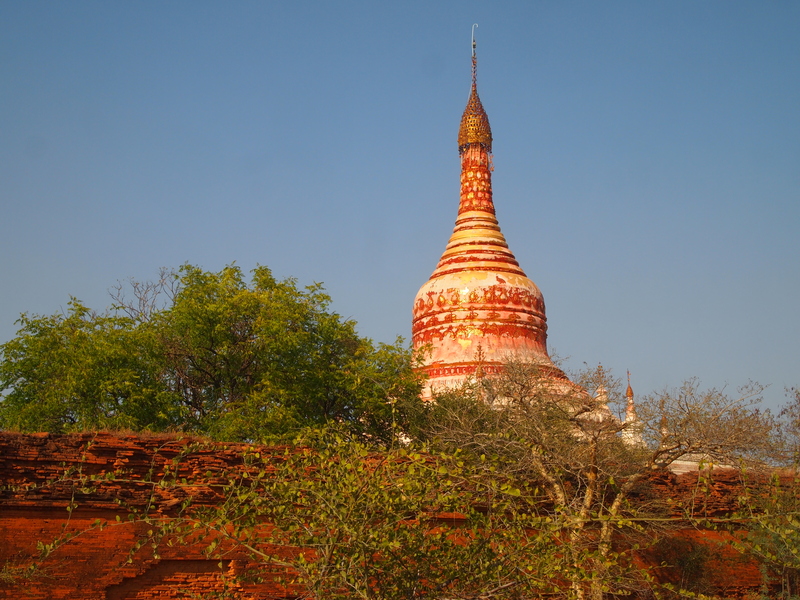 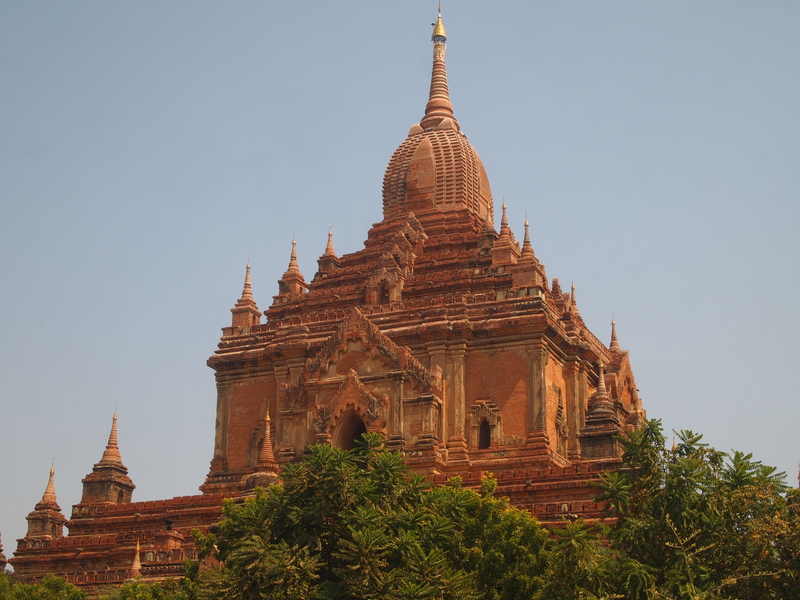 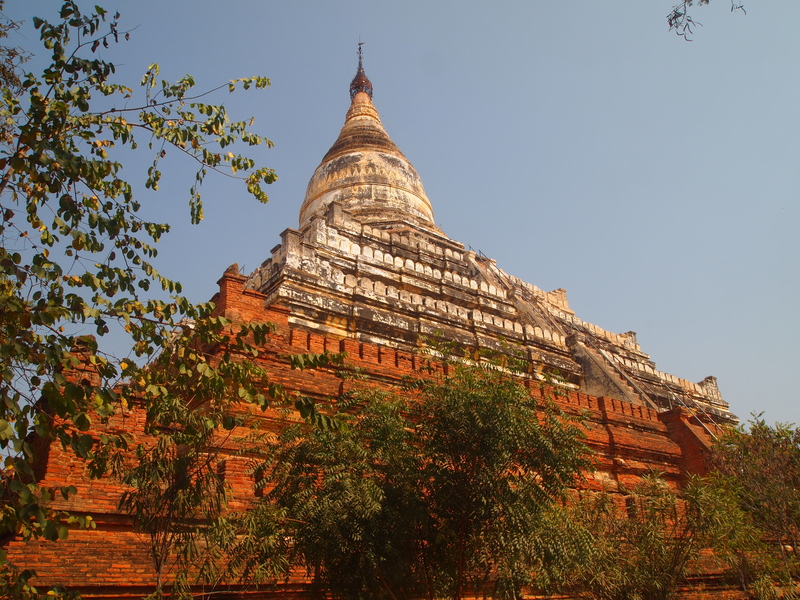 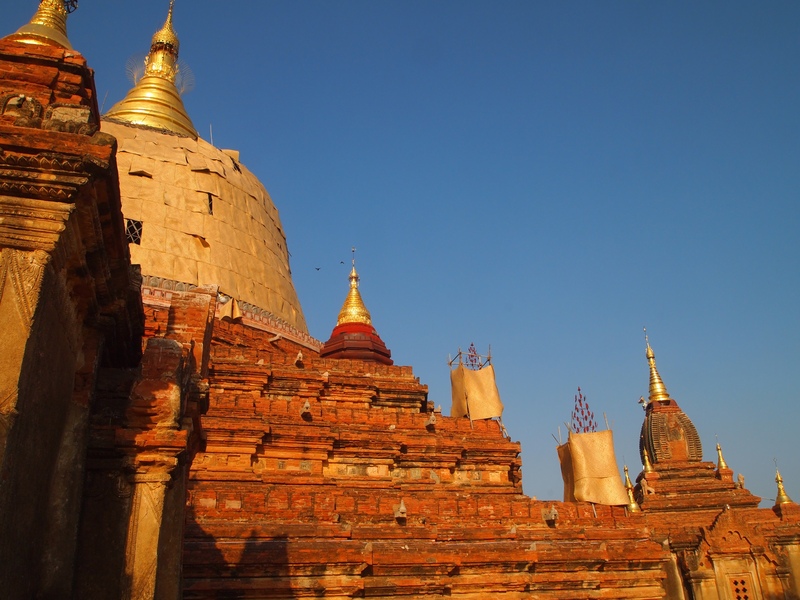 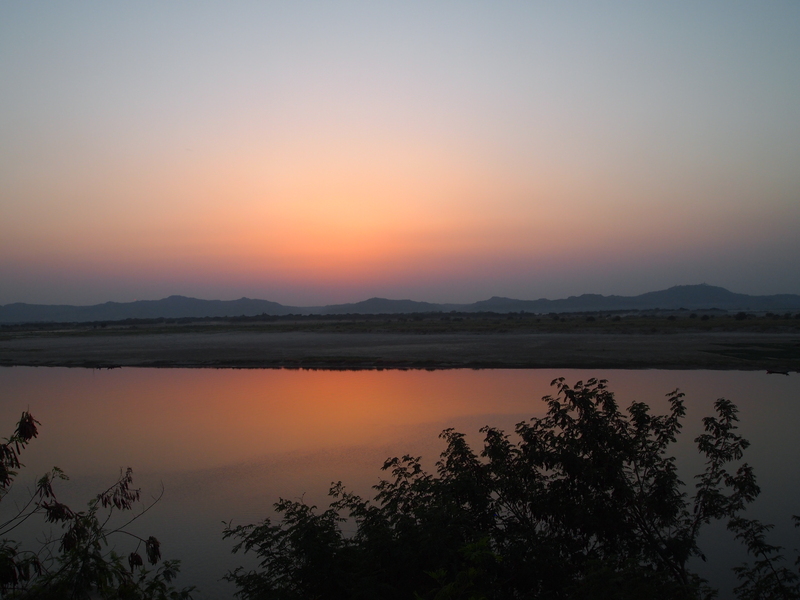 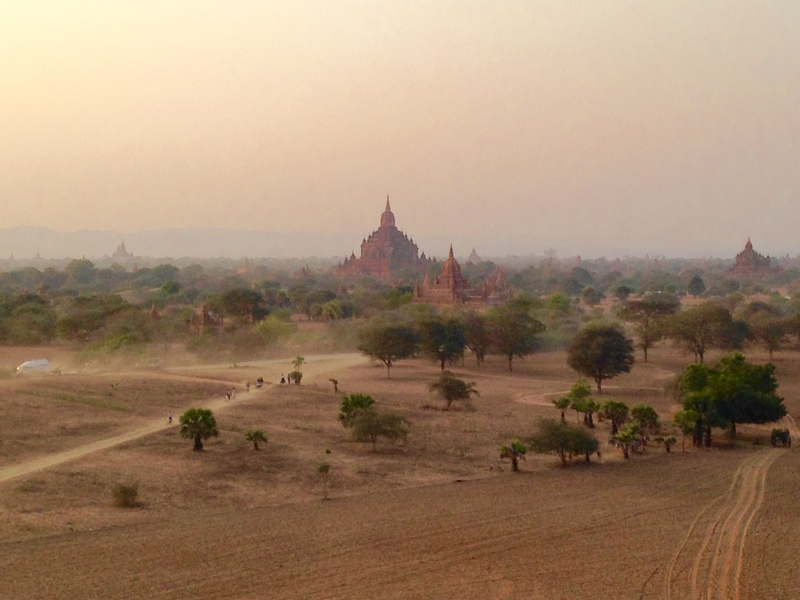 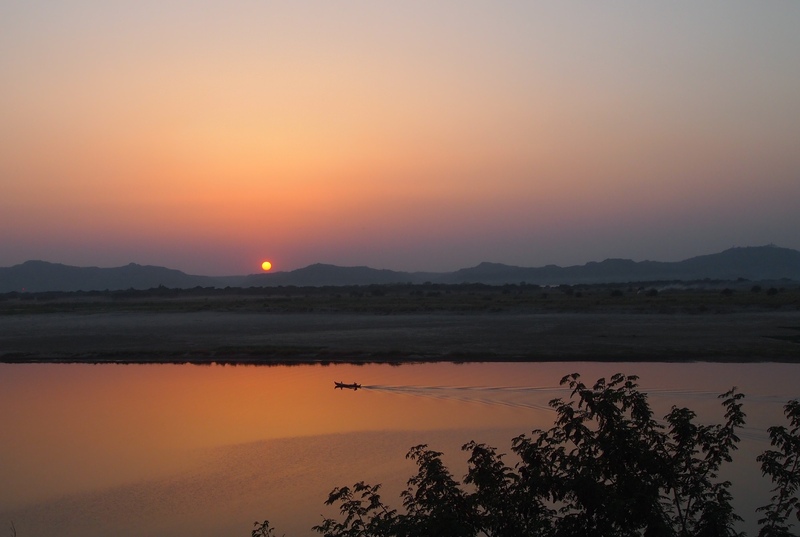 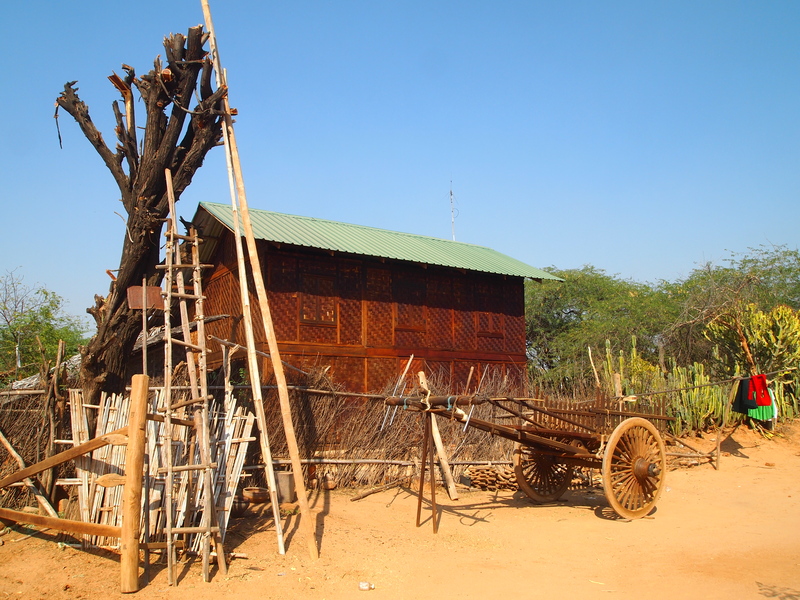 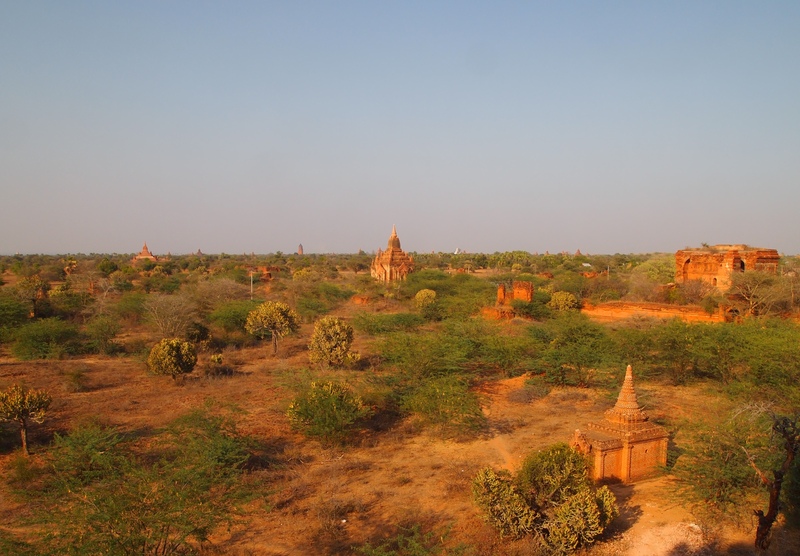 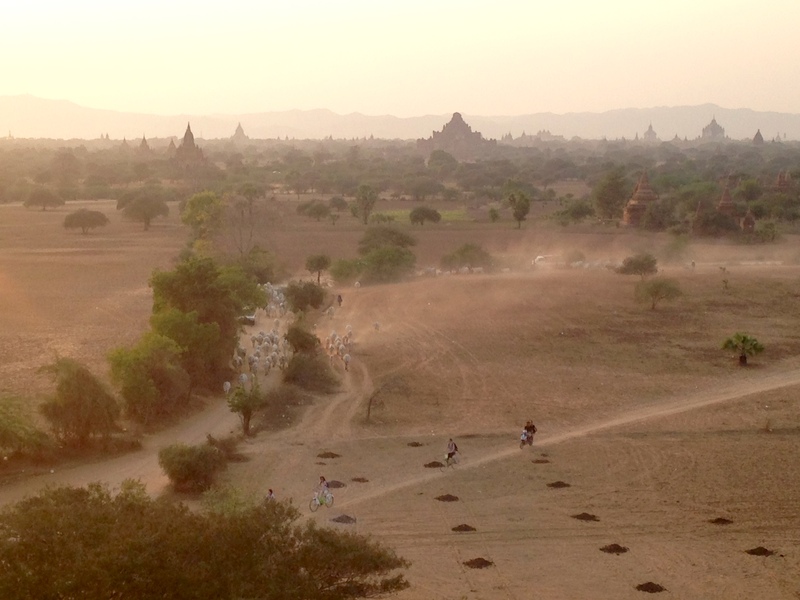 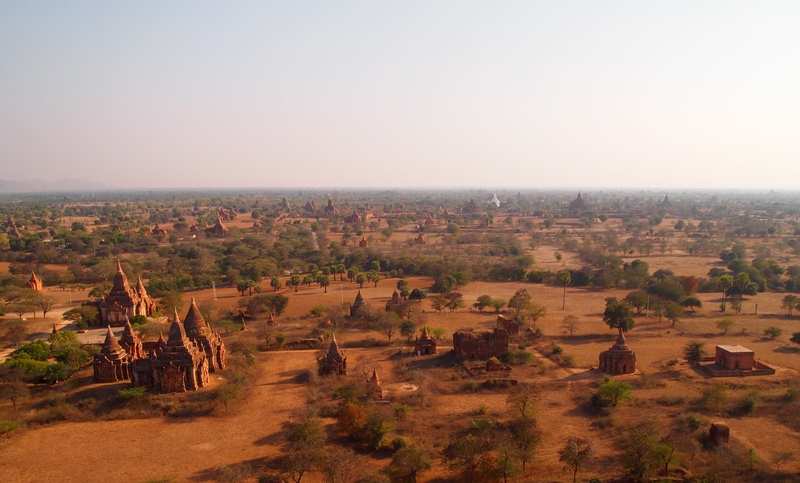 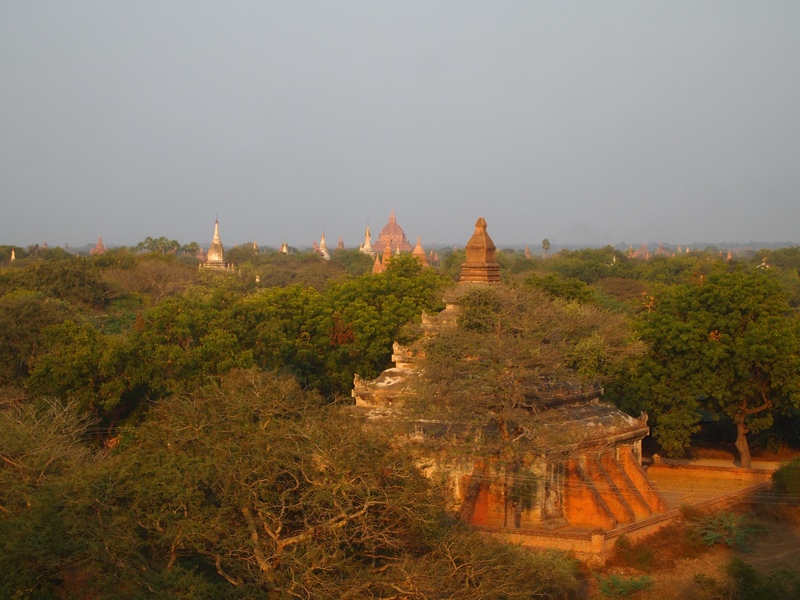 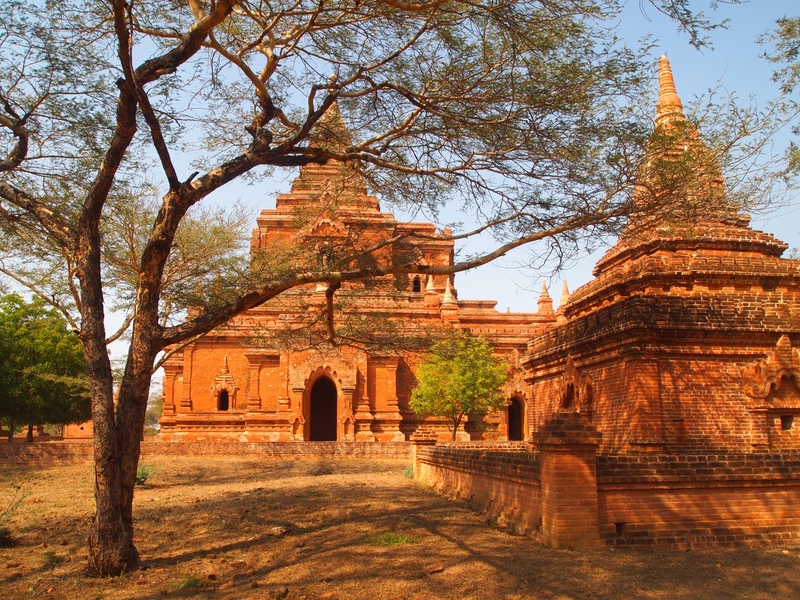 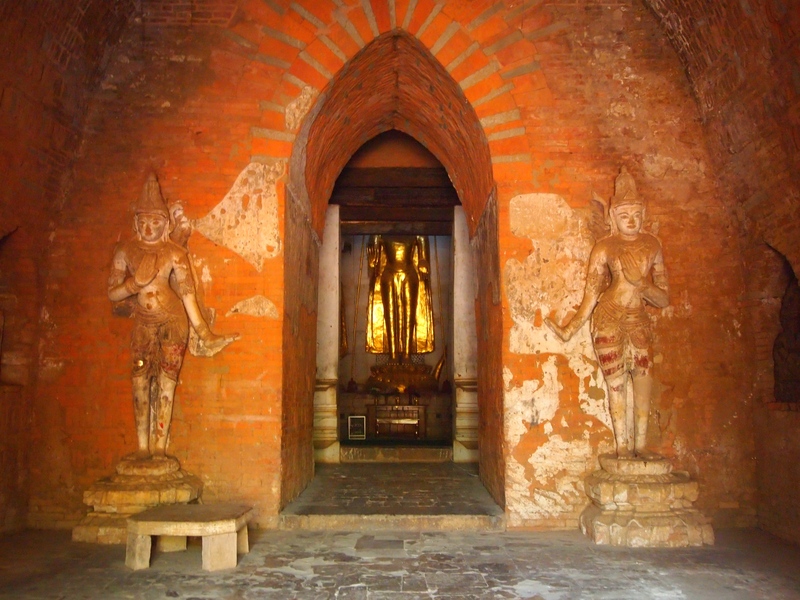 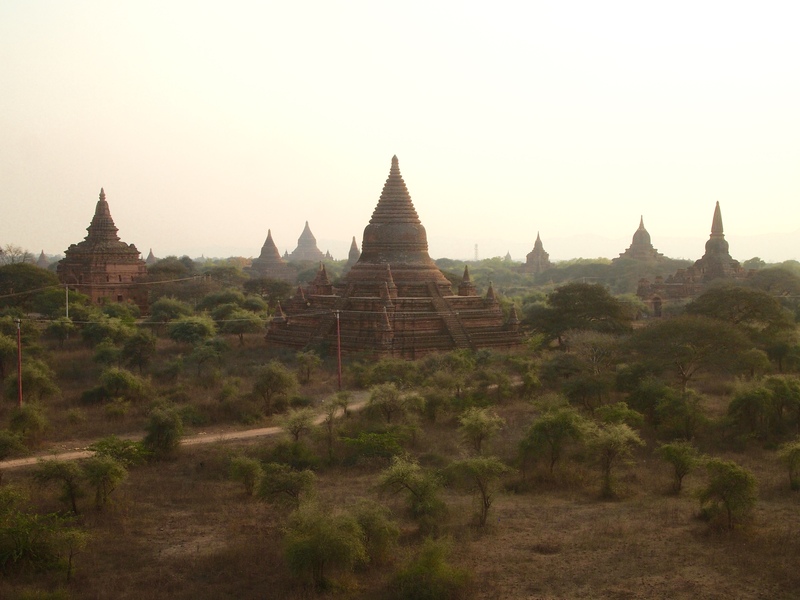 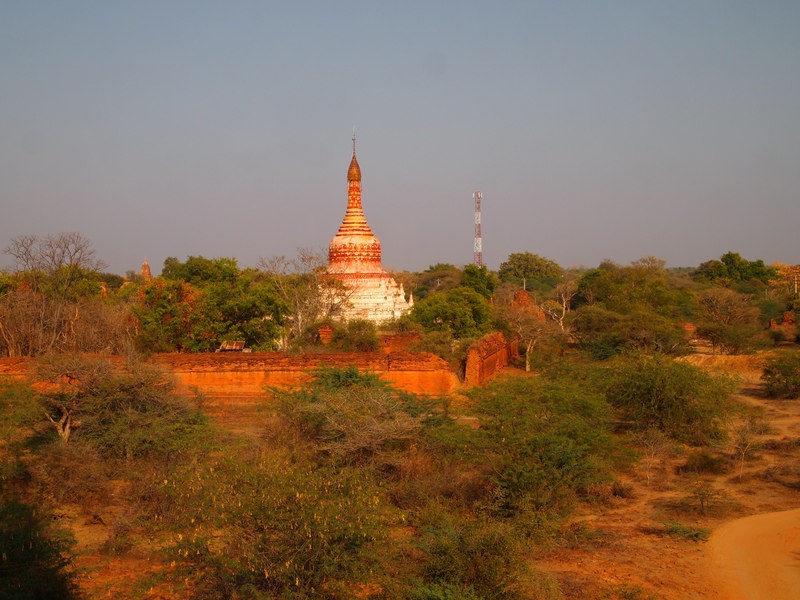 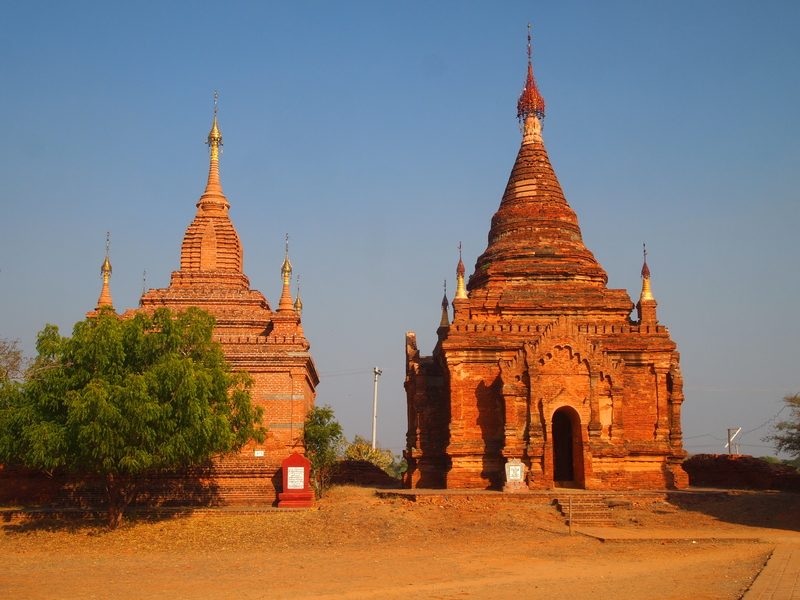 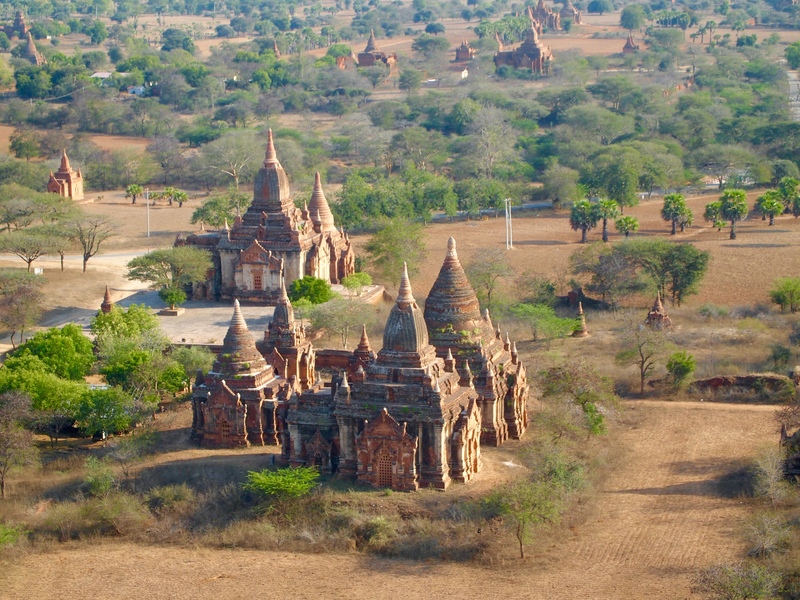 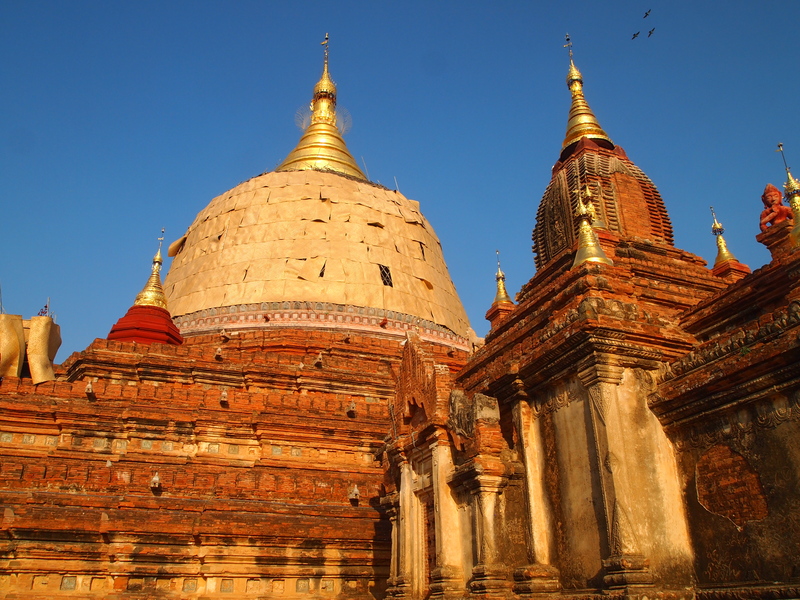 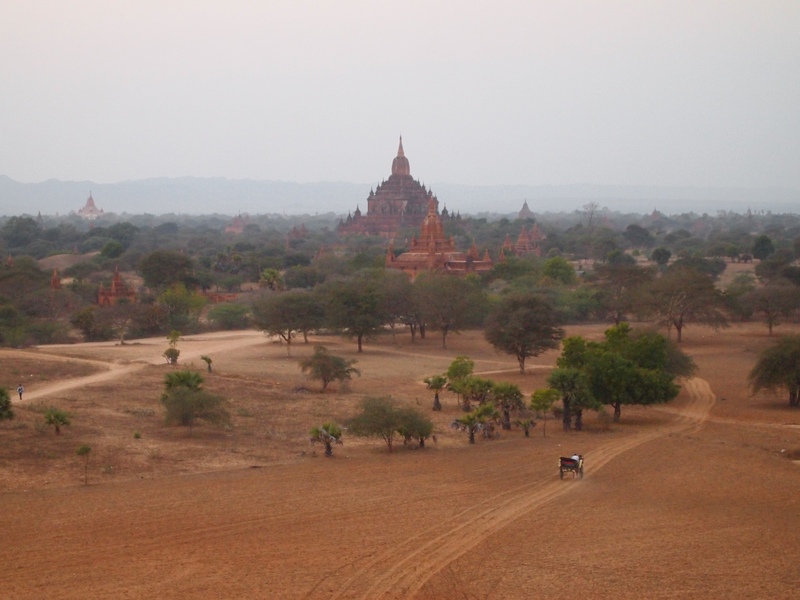 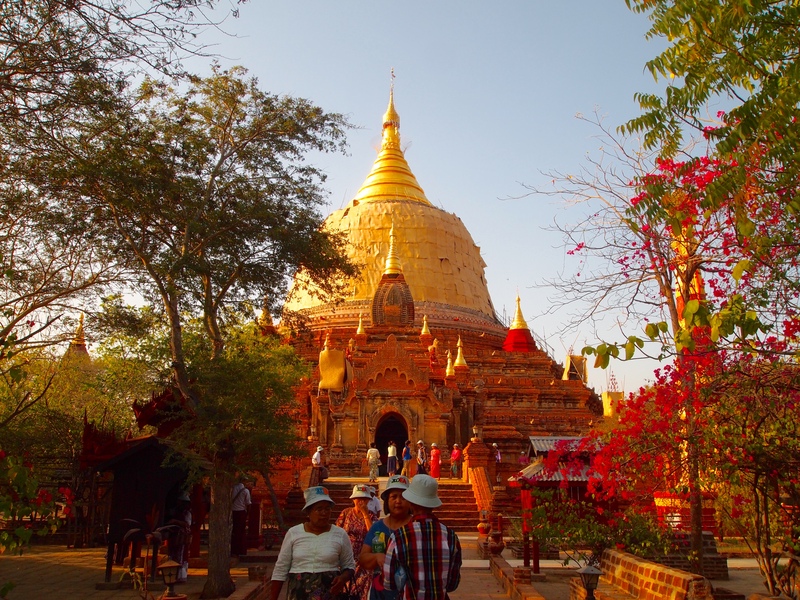 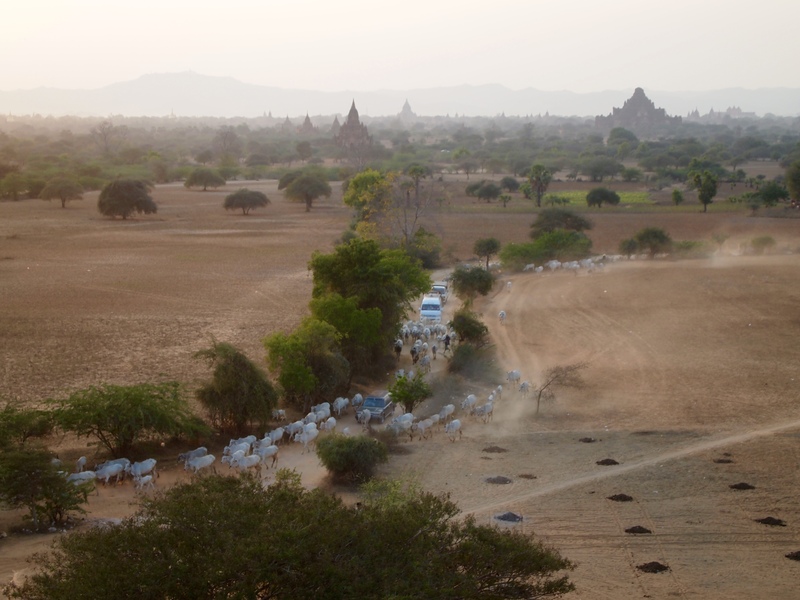 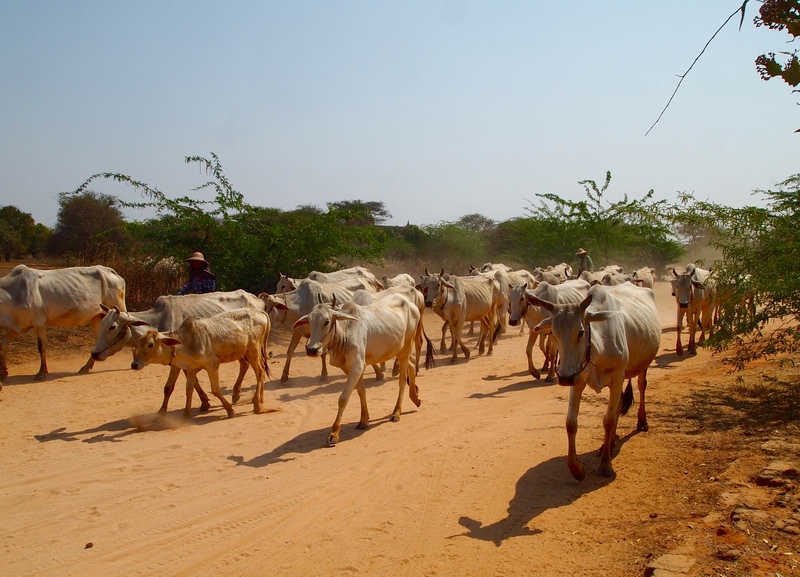 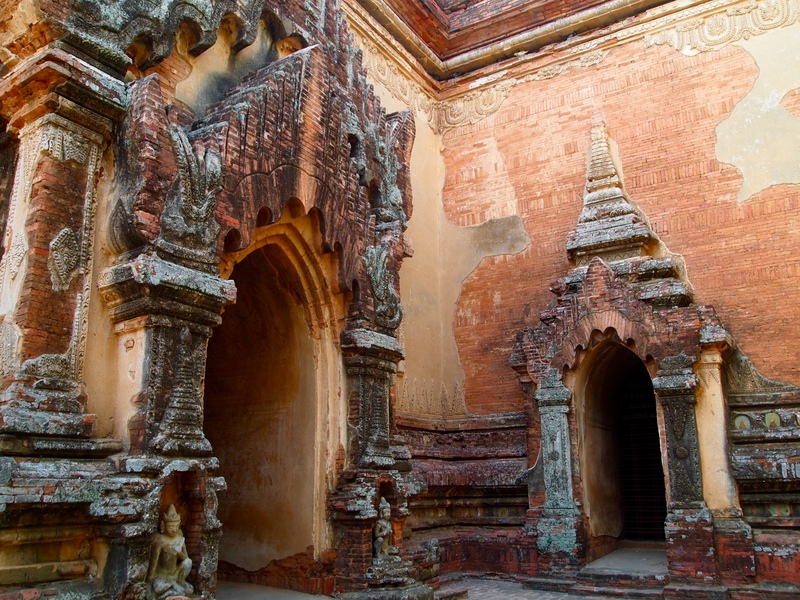 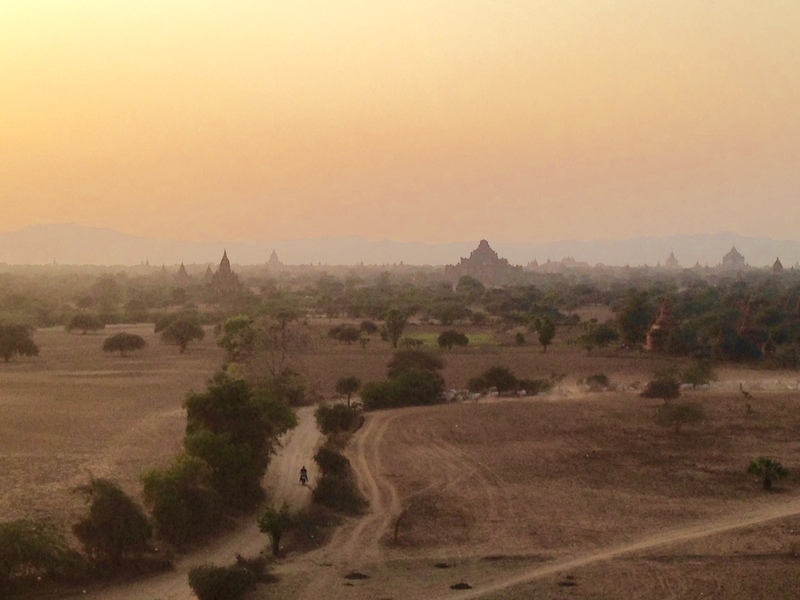 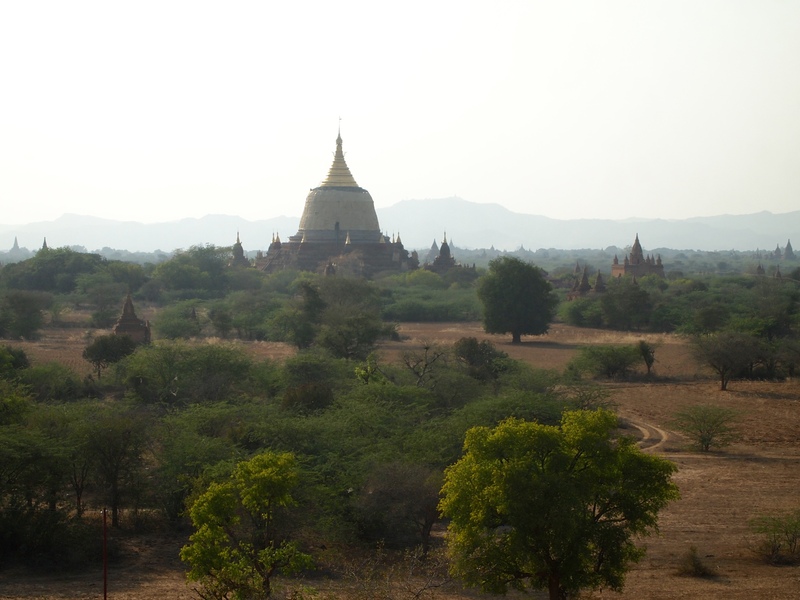 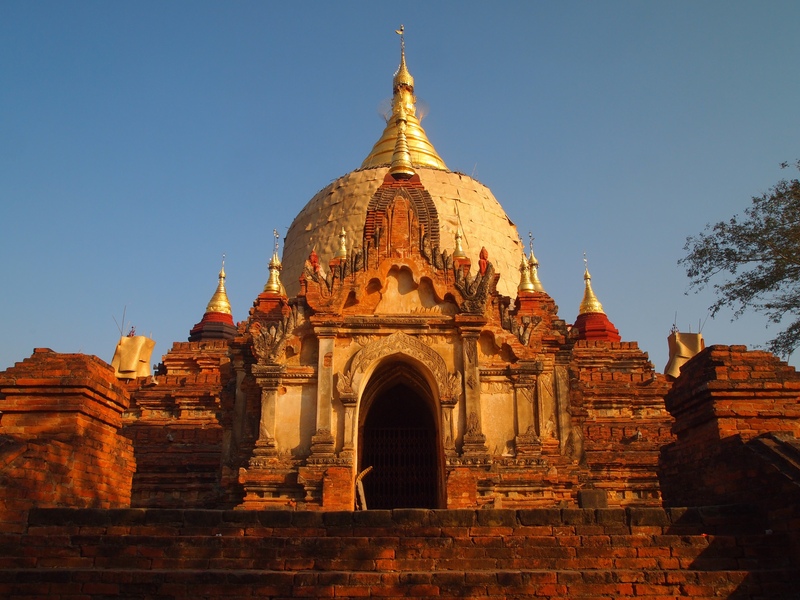 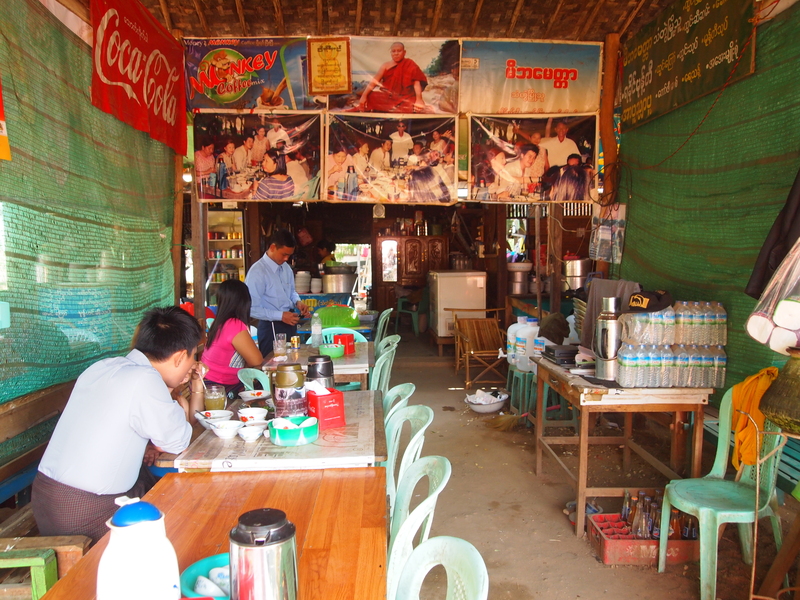 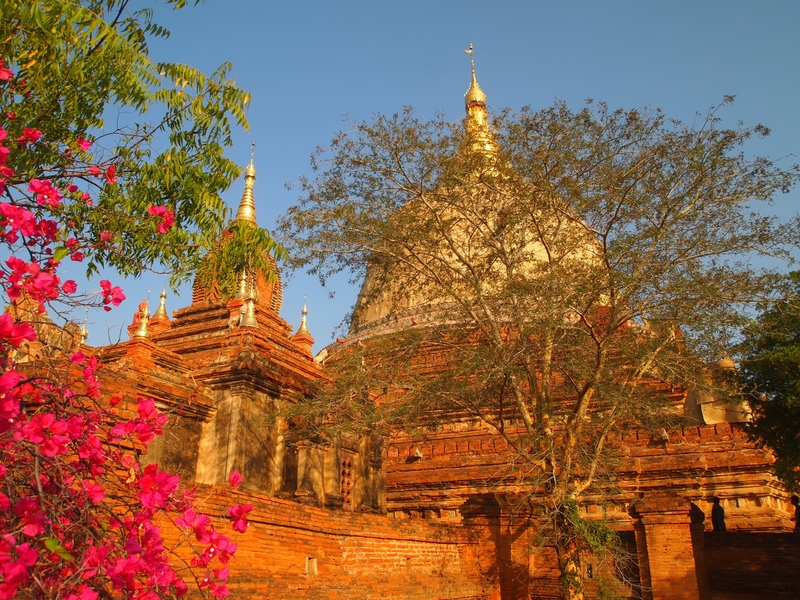 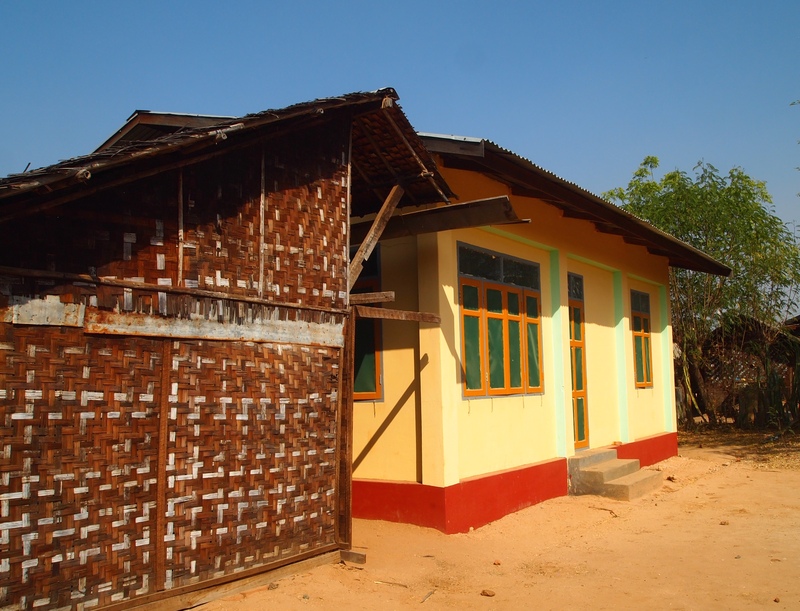 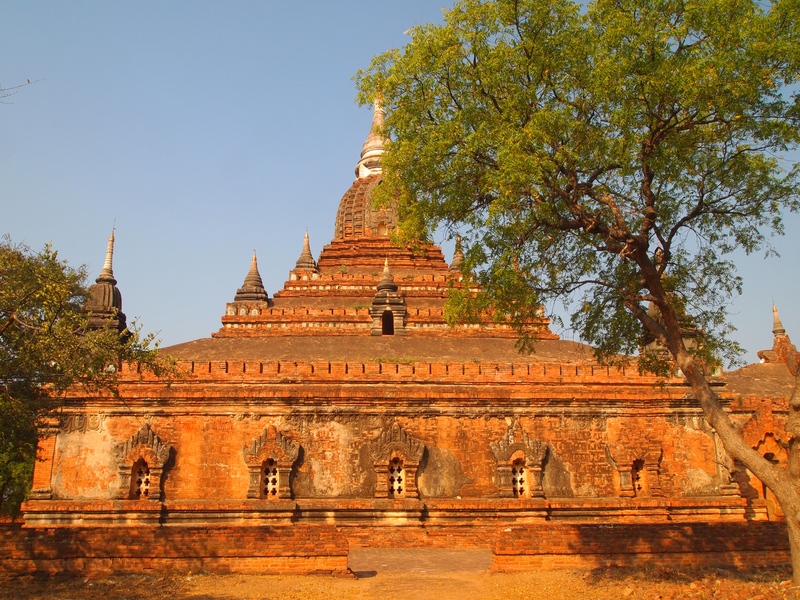 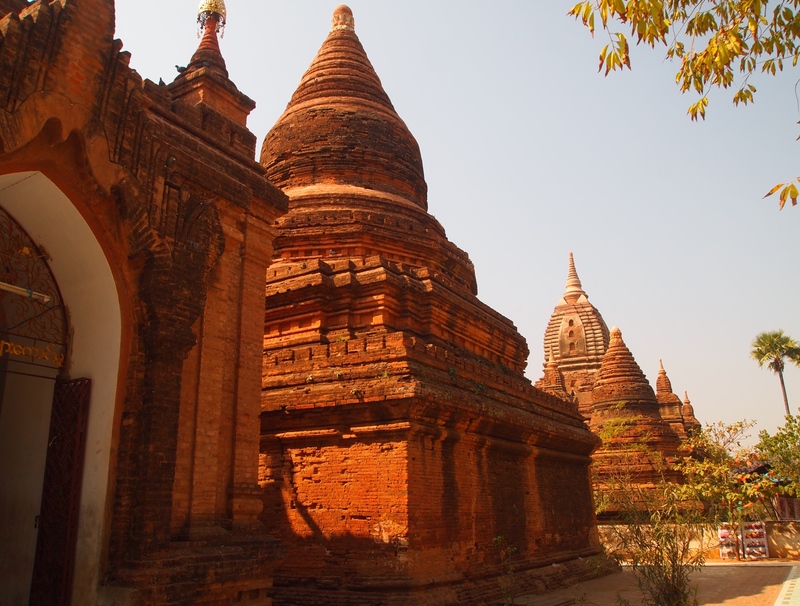 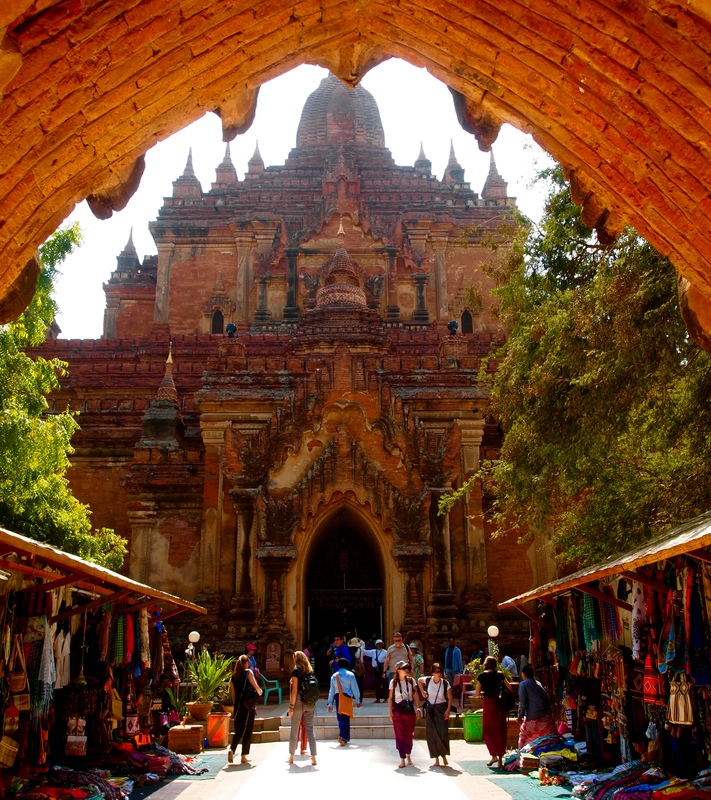 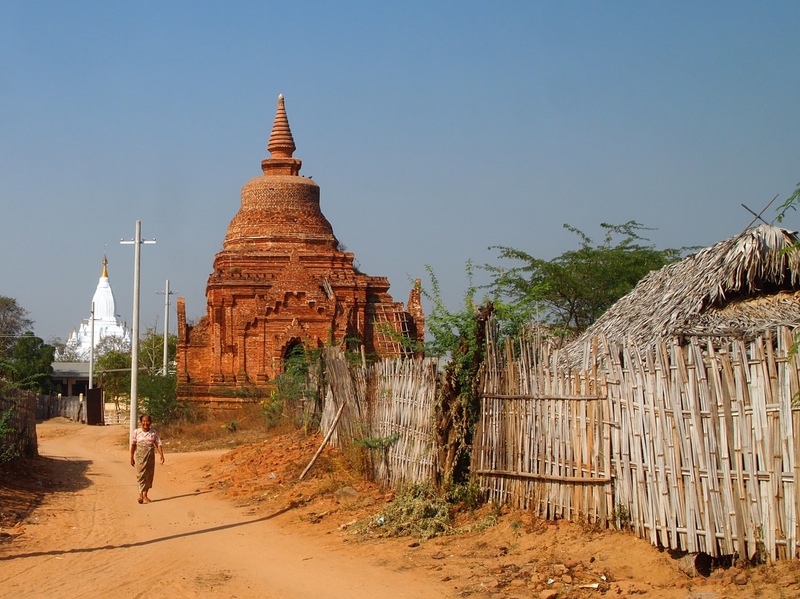 Frequent earthquakes, general weathering and neglect also contributed to the city’s decline (Lonely Planet Bagan). 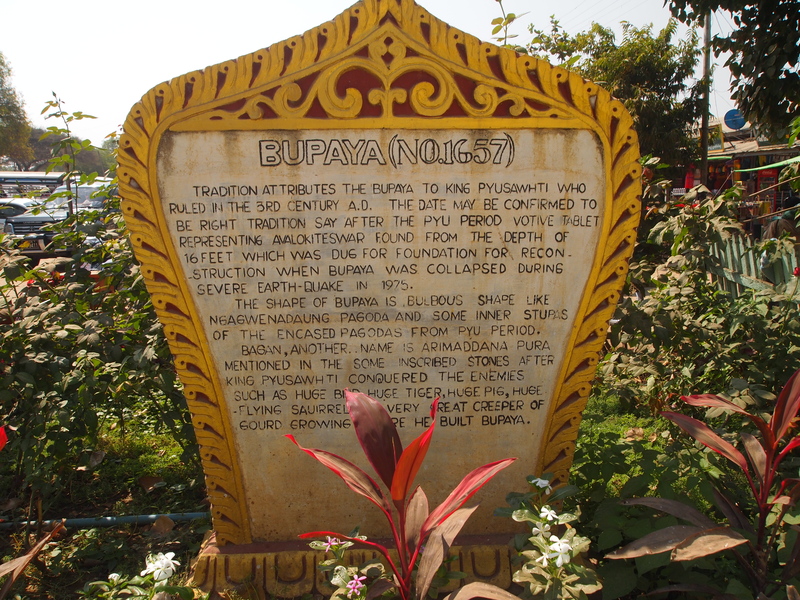 Our first stop today is Nagayon Guphaya. 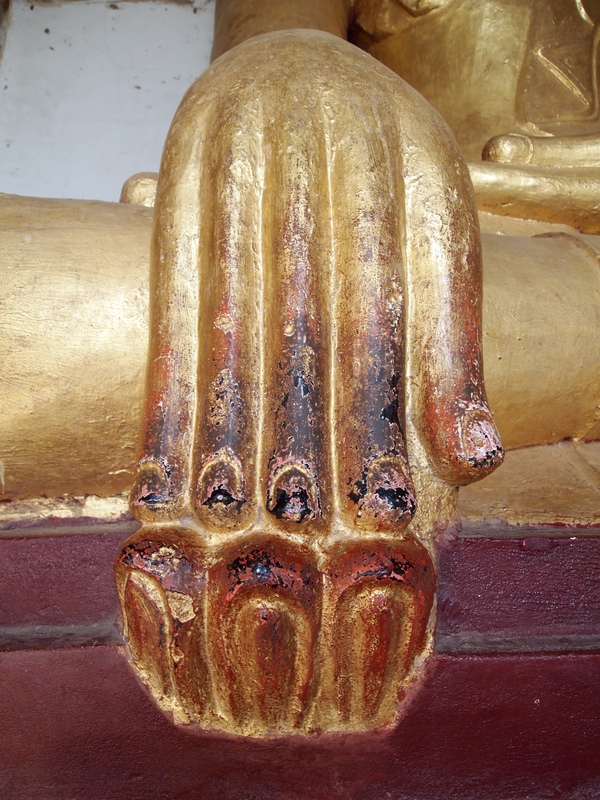 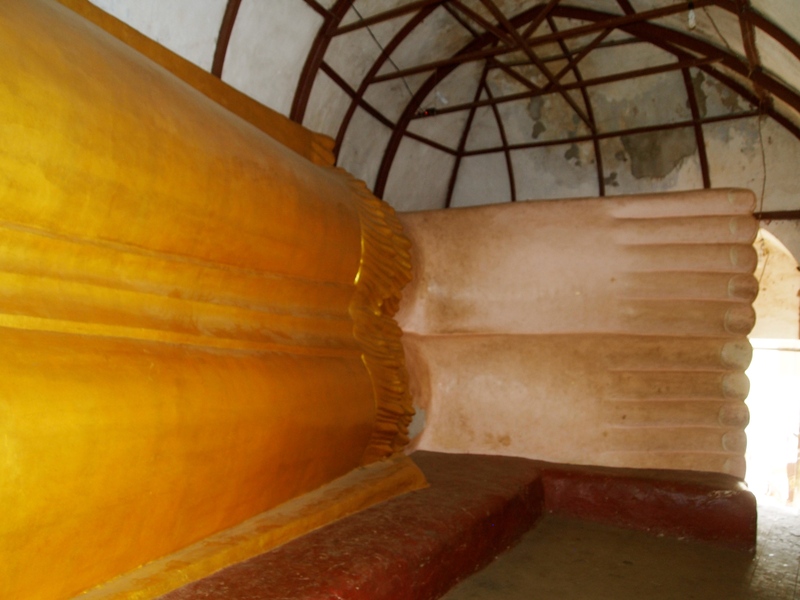 The main Buddha image is double life-size and sits under the head of a huge naga (dragon serpent). 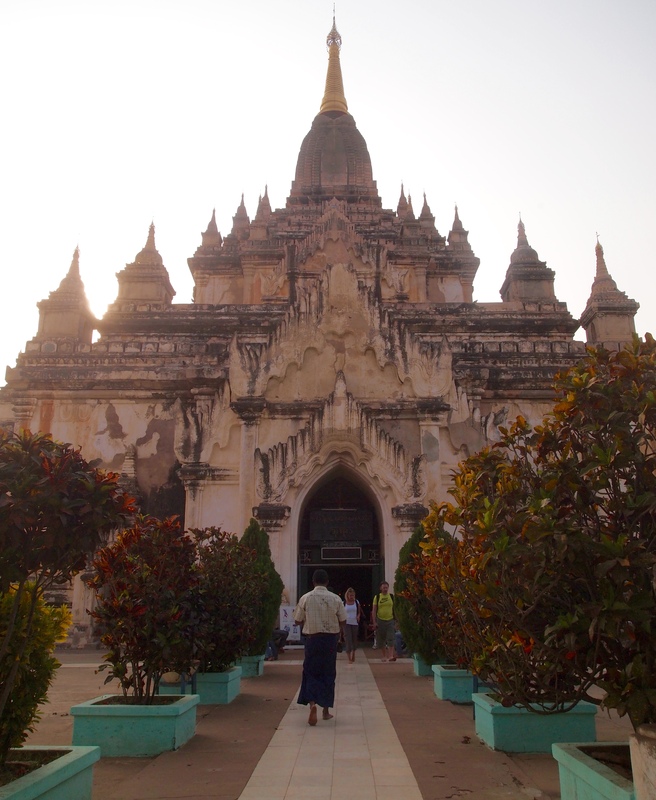 My driver takes me to the entrances of the temples and leaves me to explore. 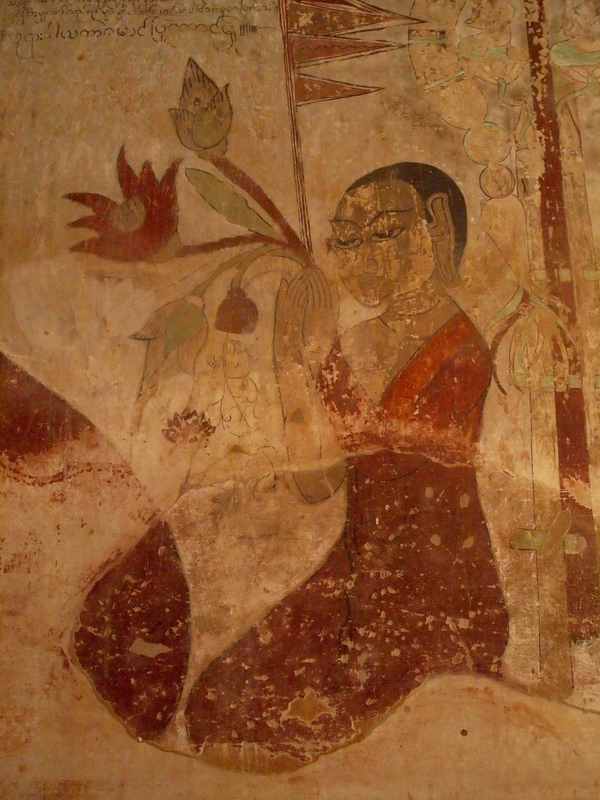 He is wearing the male version of the longyi (skirt), called paso, with a button-down shirt and a suit jacket, a little too much for the rapidly warming day. 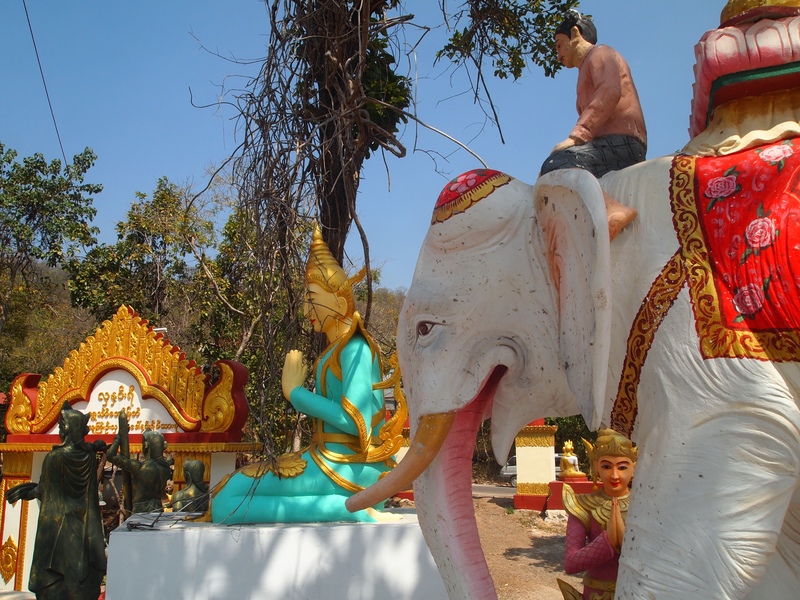 His teeth are quite horrible and stained as he is constantly chewing betel and spitting it out the window and onto the ground. 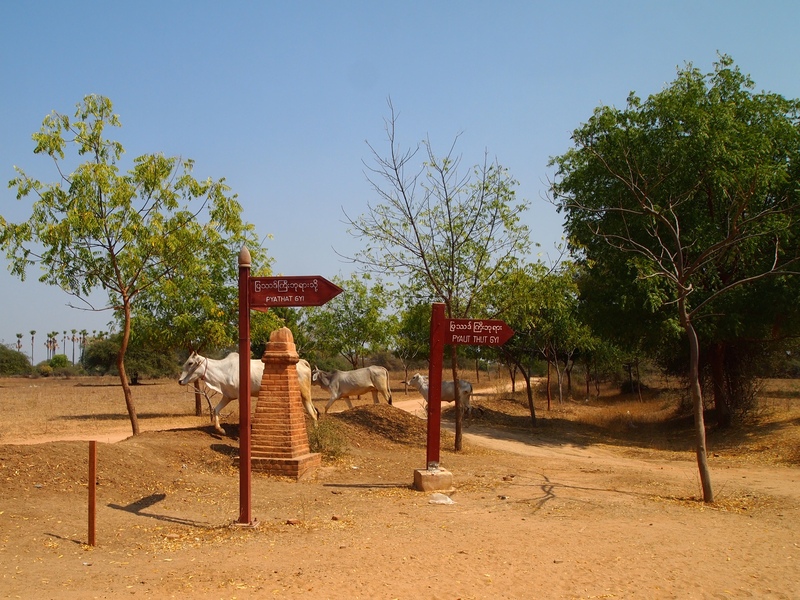 We go next to Nanpaya Temple. 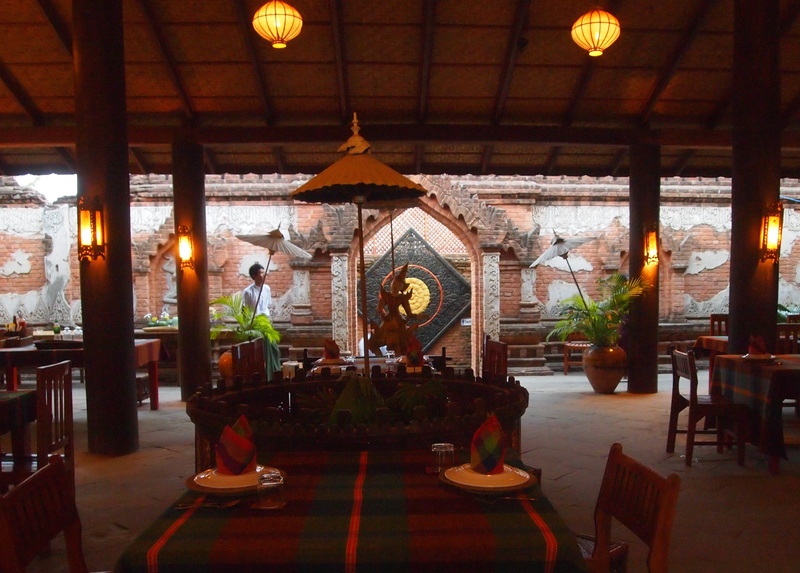 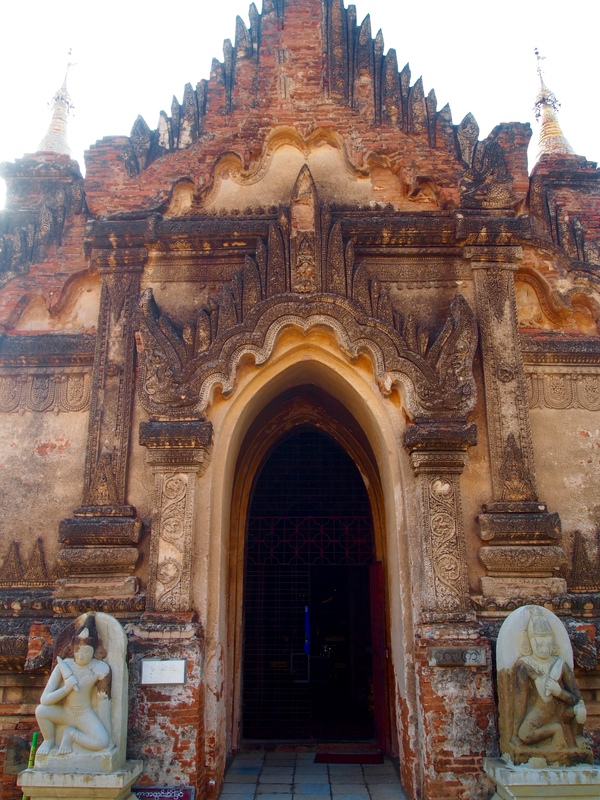 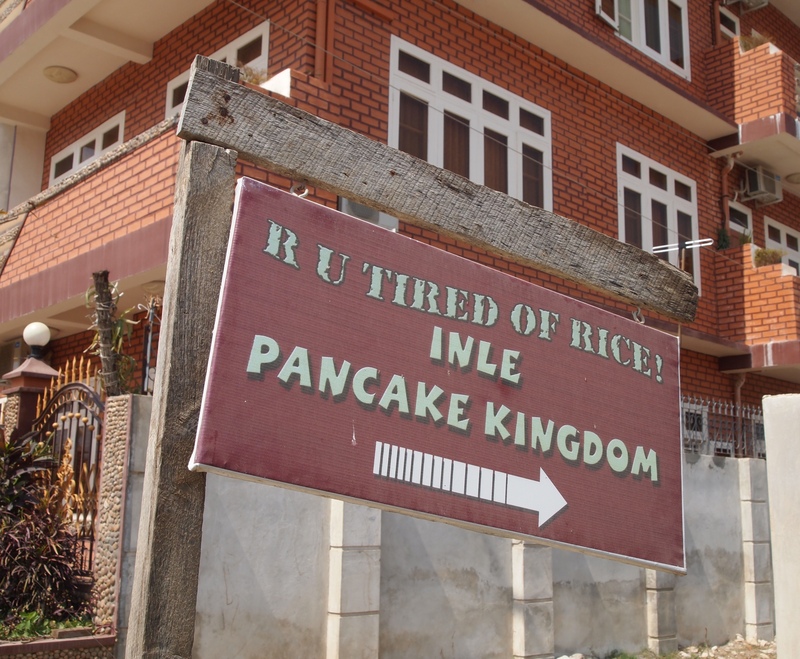 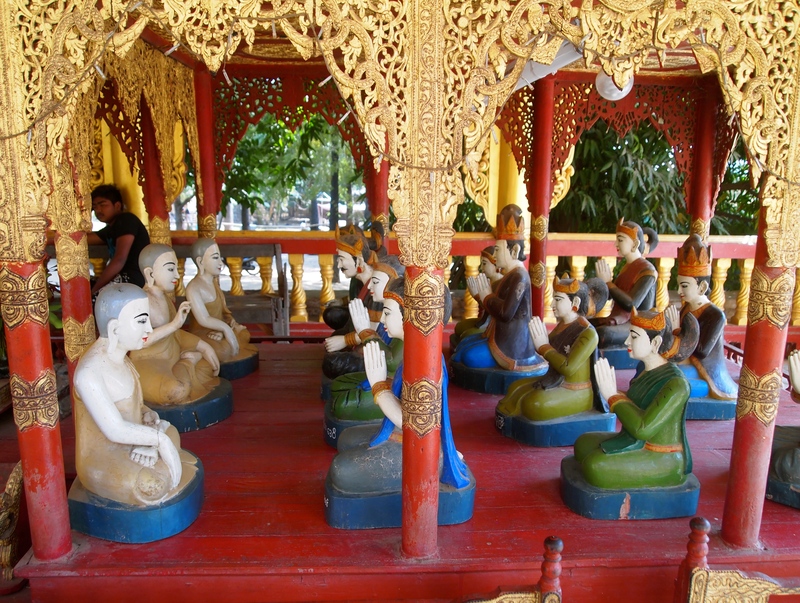 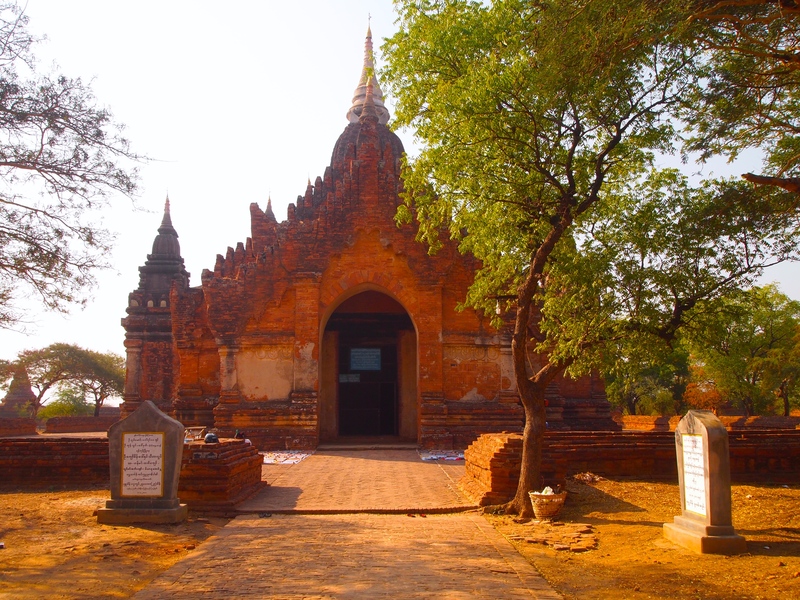 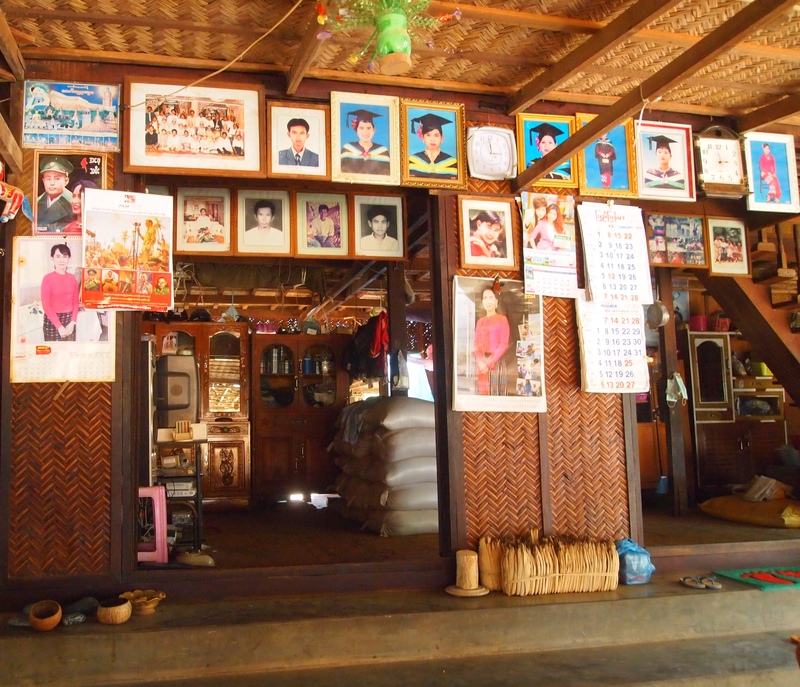 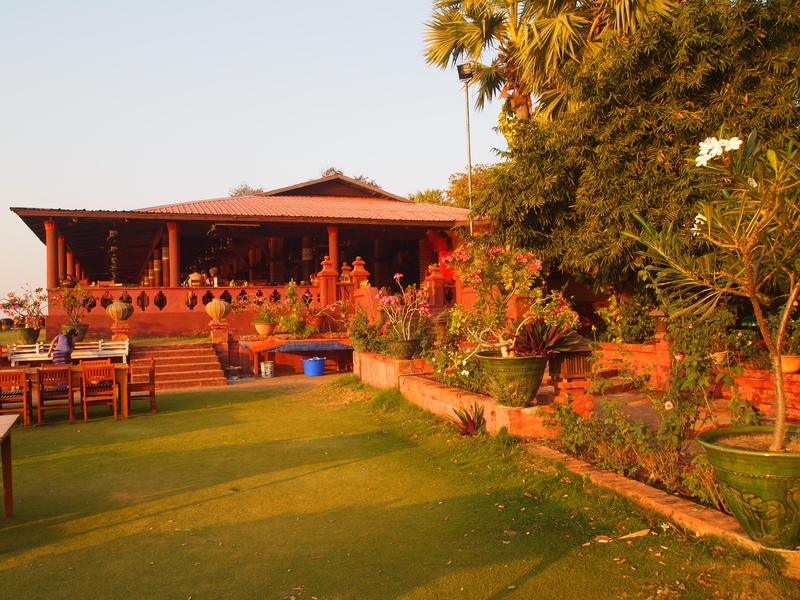 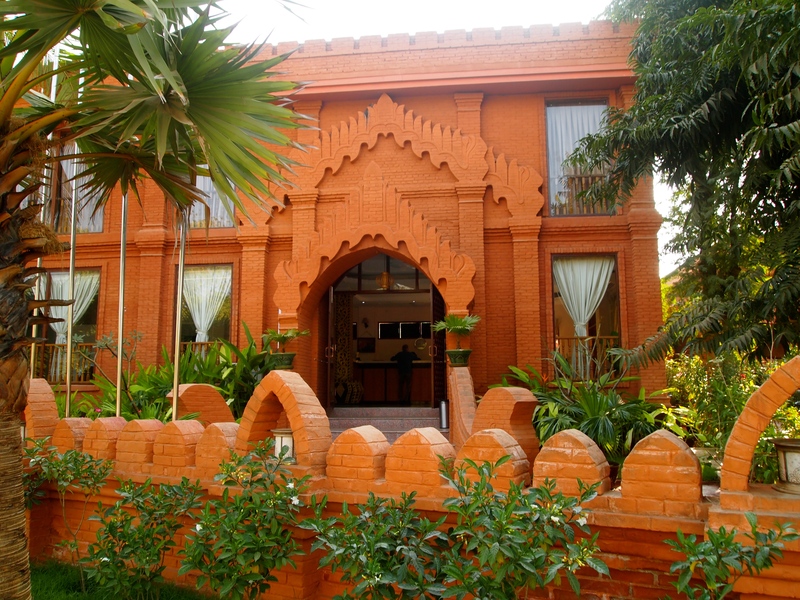 According to tradition, it was used as the captive Mon king Manuha’s residence. 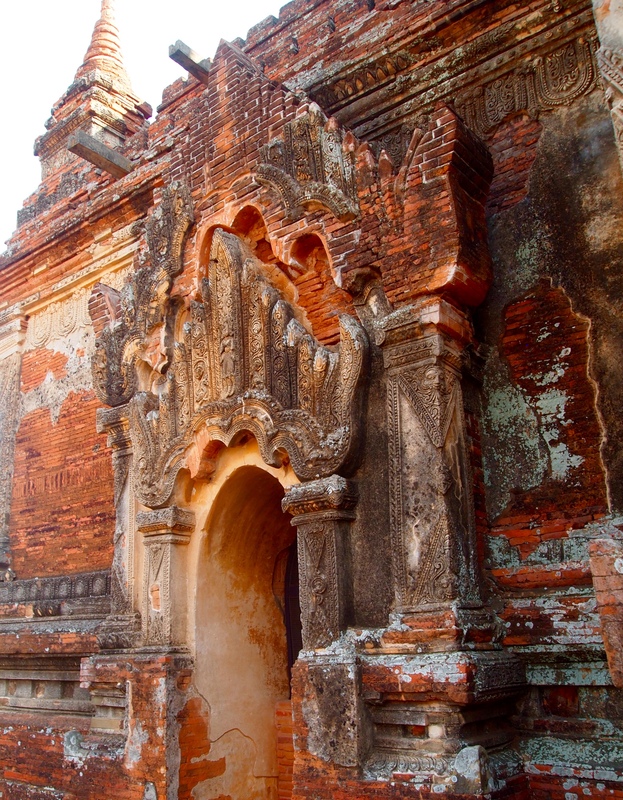 Built of brick and mud mortar and surfaced with stone, it is square in plan with a porch projecting on the east face. 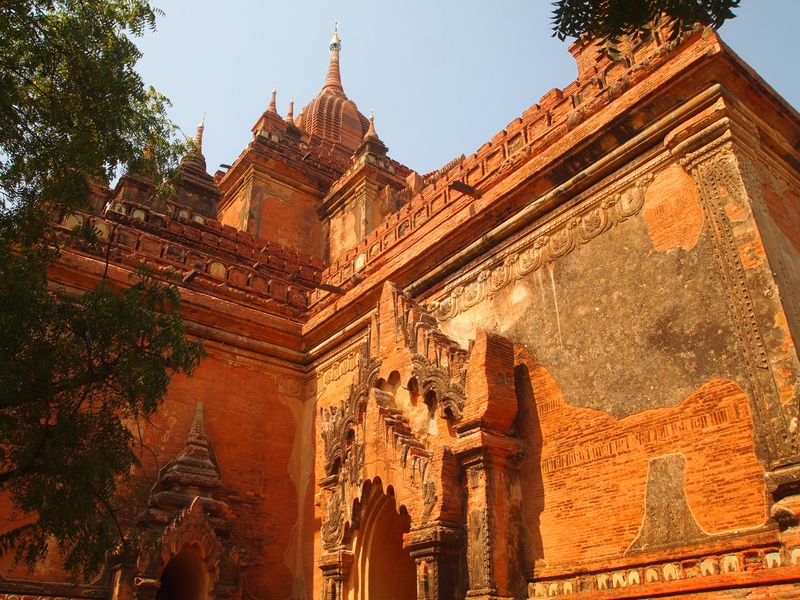 Like other earlier temples at Bagan, it has perforated stone windows to admit light into the building (Myanmar Tours US: Nanpaya Temple). 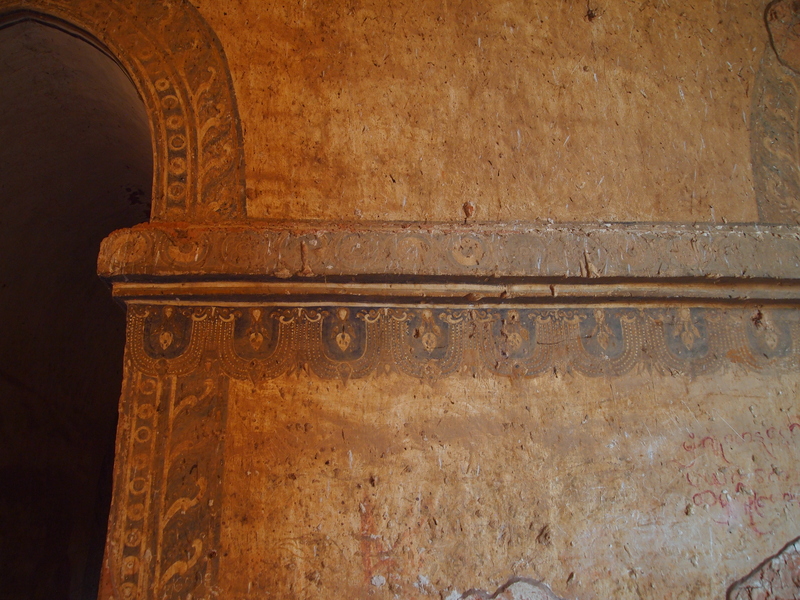 Flanking the sanctuary in the main building are four stone pillars. 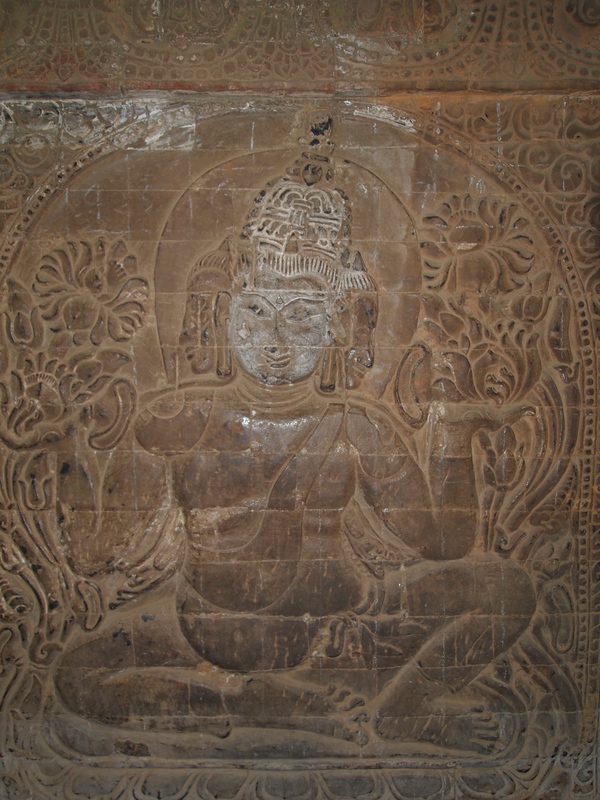 On the sides of each of them are carved triangular floral designs and the figures of the Brahma holding lotus flowers in each hand. 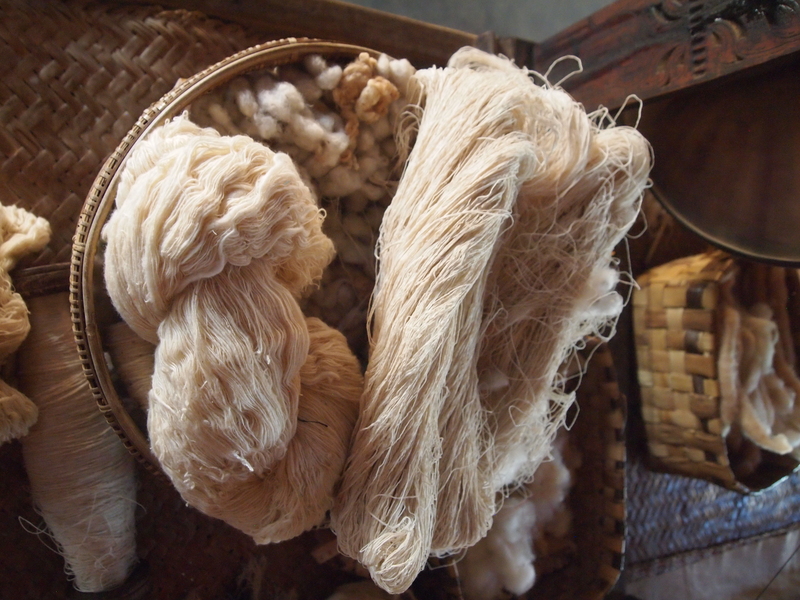 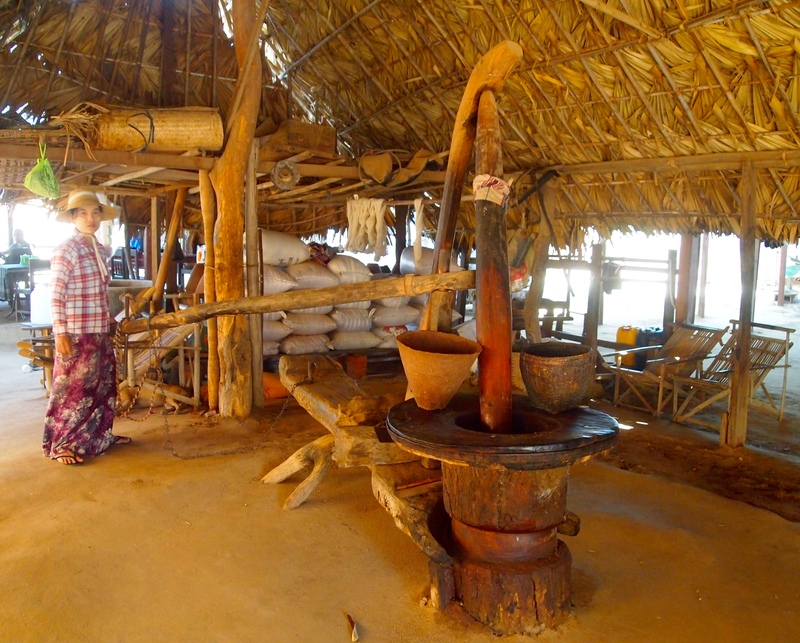 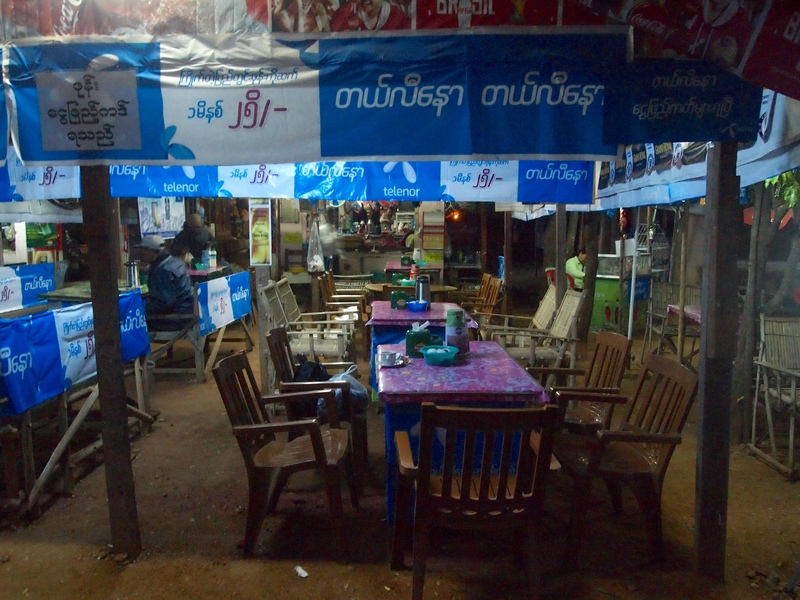 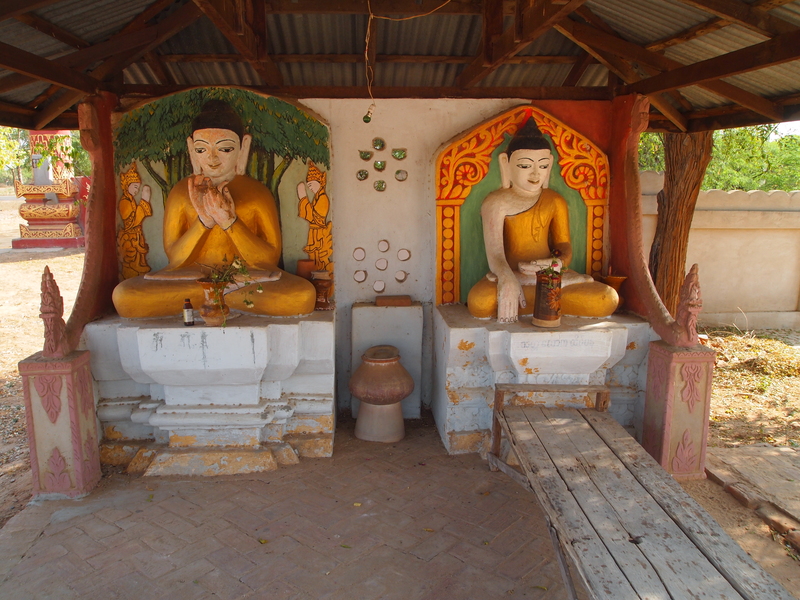 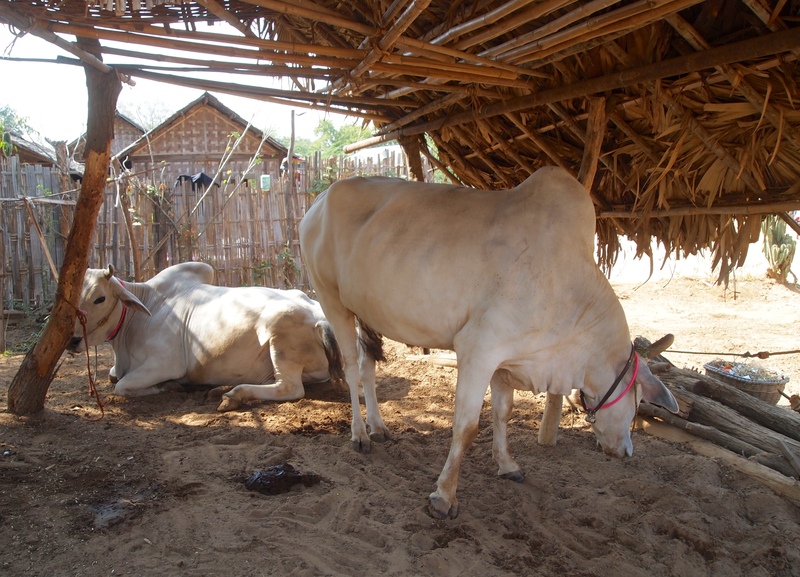 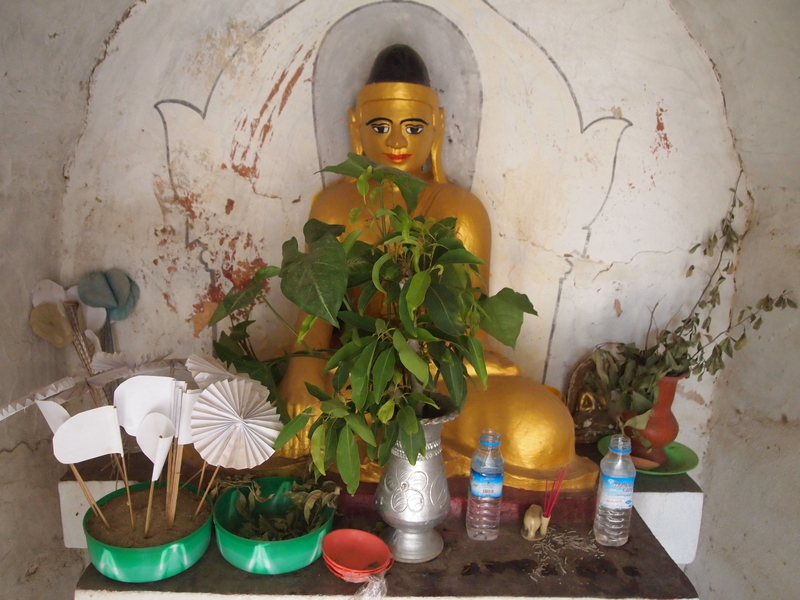 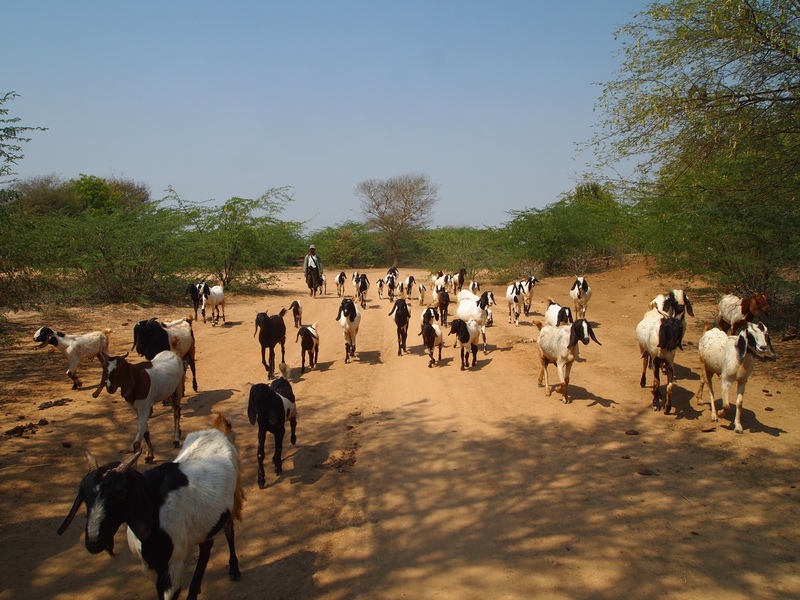 Manuha Paya sits in Myinkaba village. 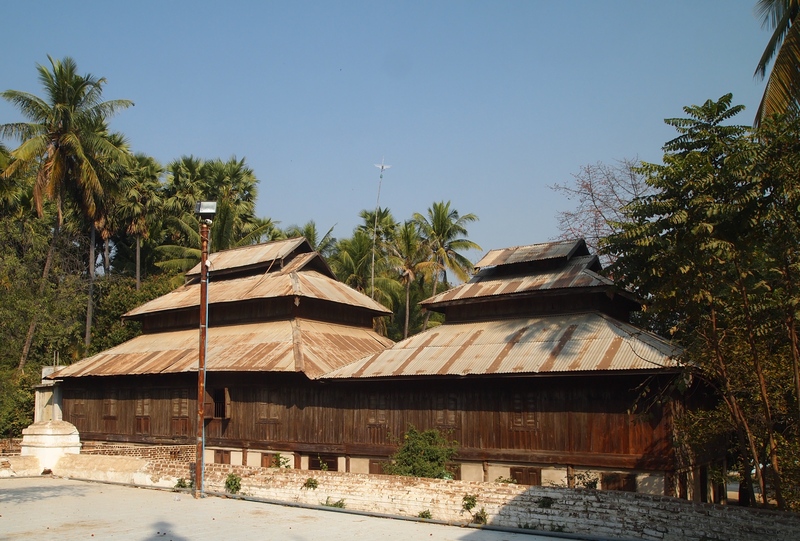 Though it looks modern, it dates back to 1059. 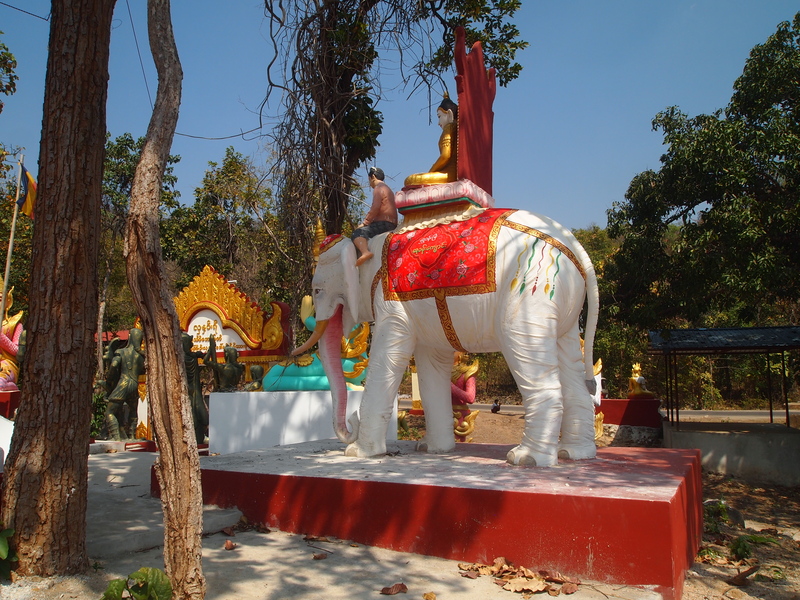 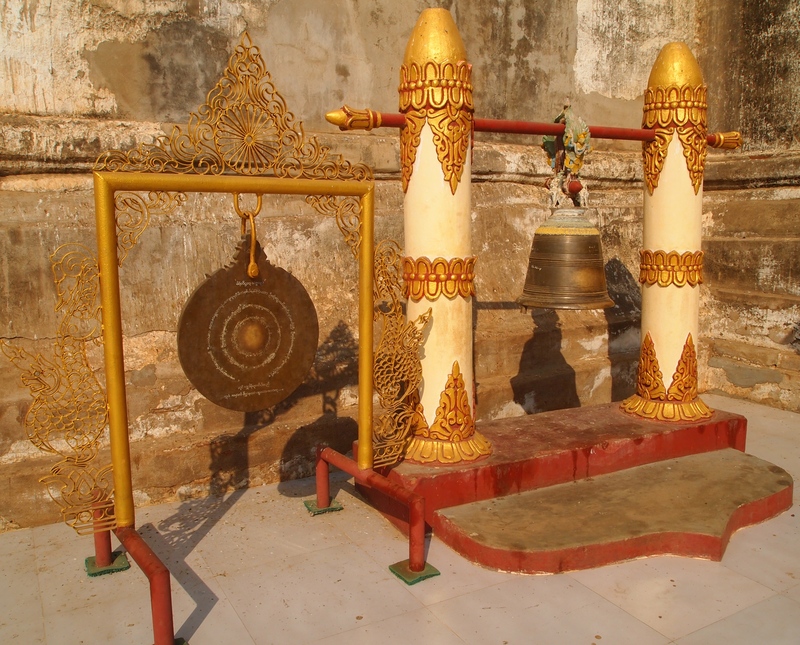 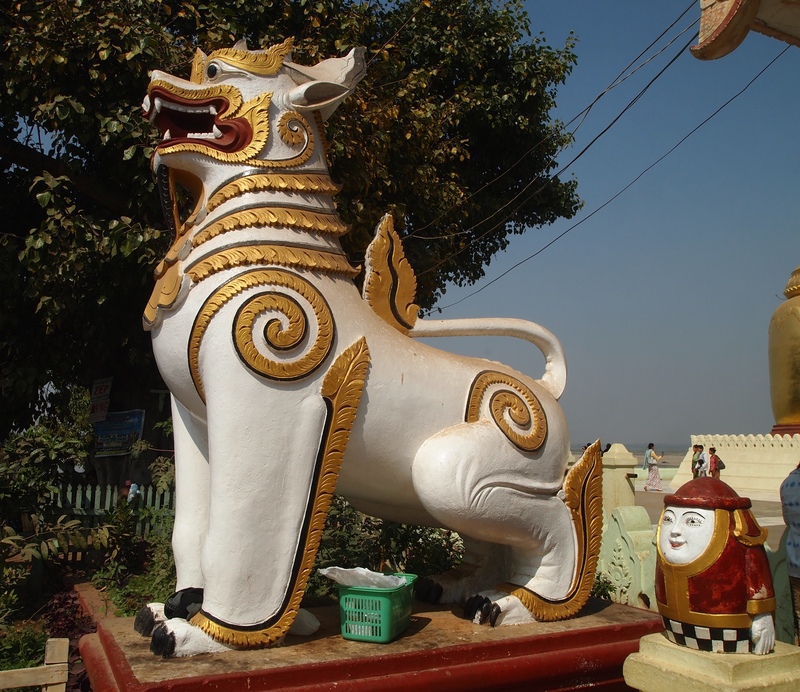 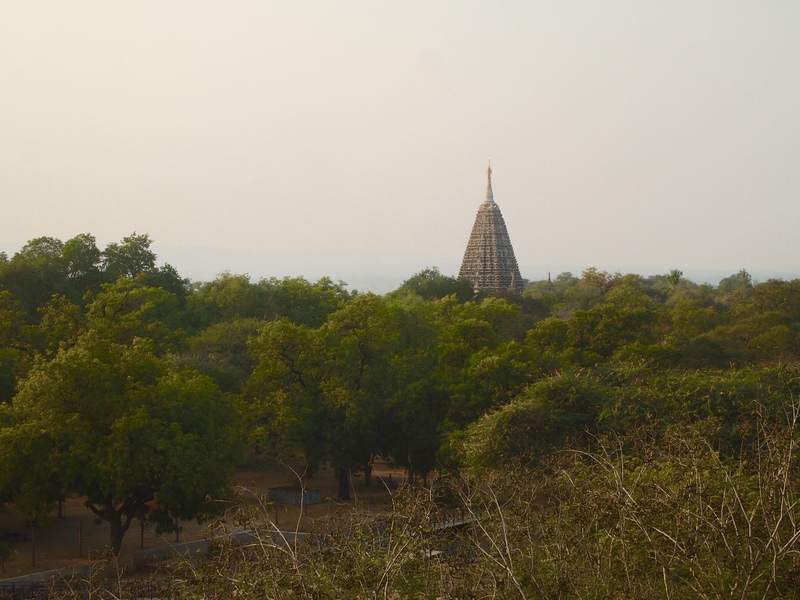 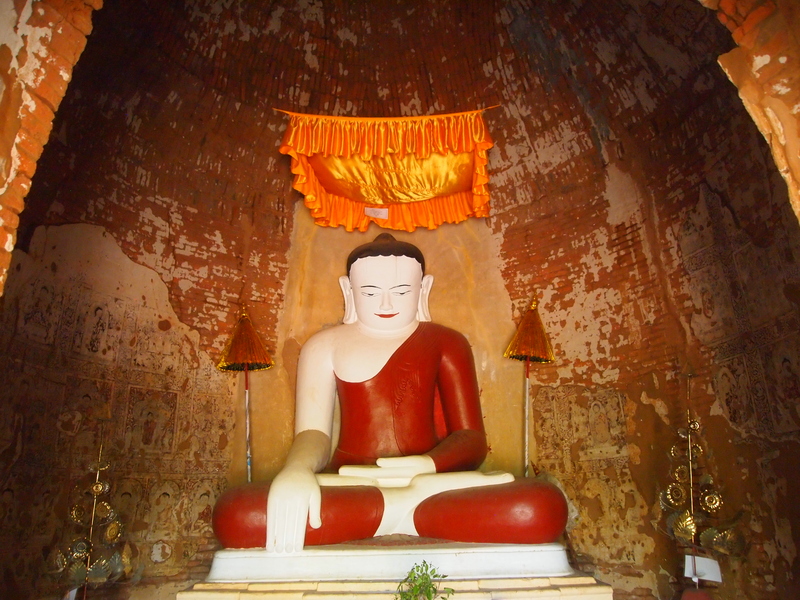 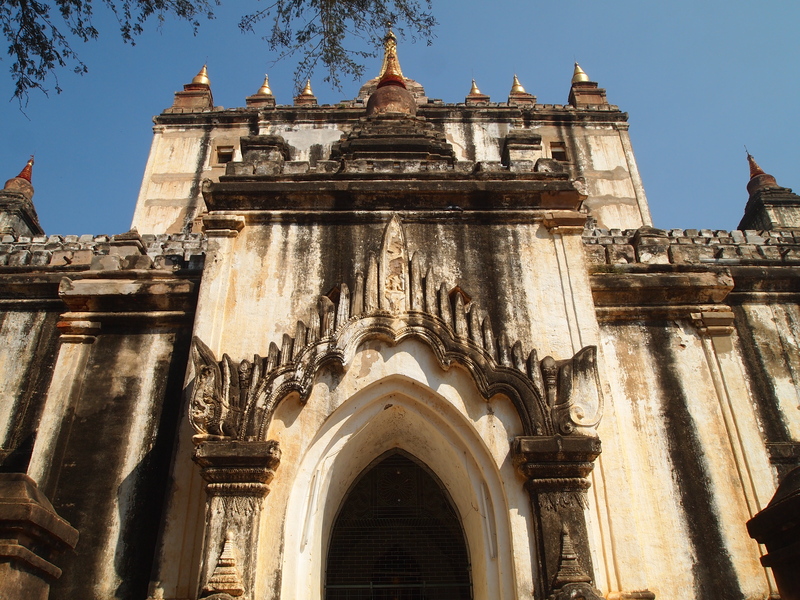 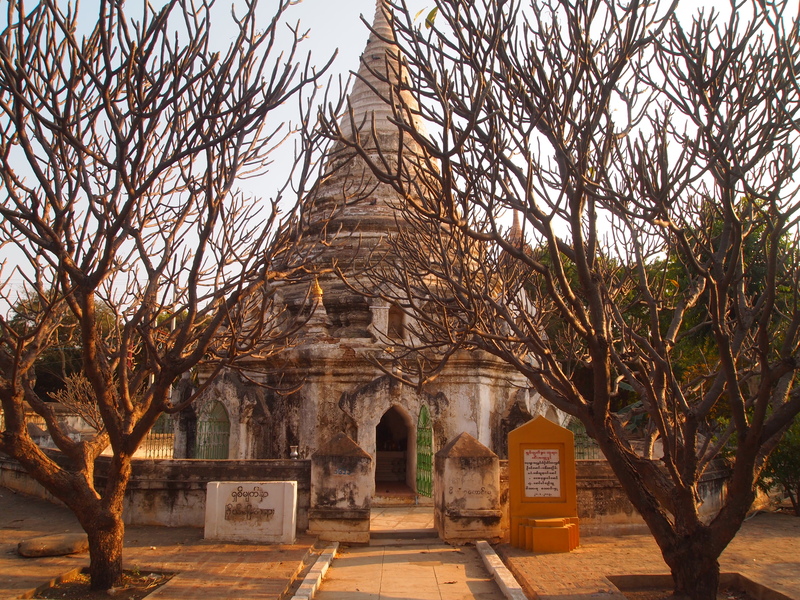 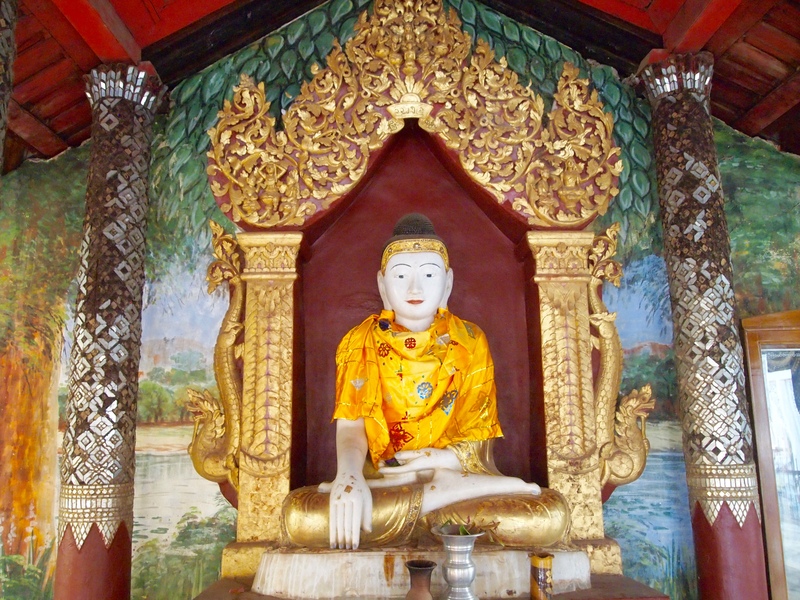 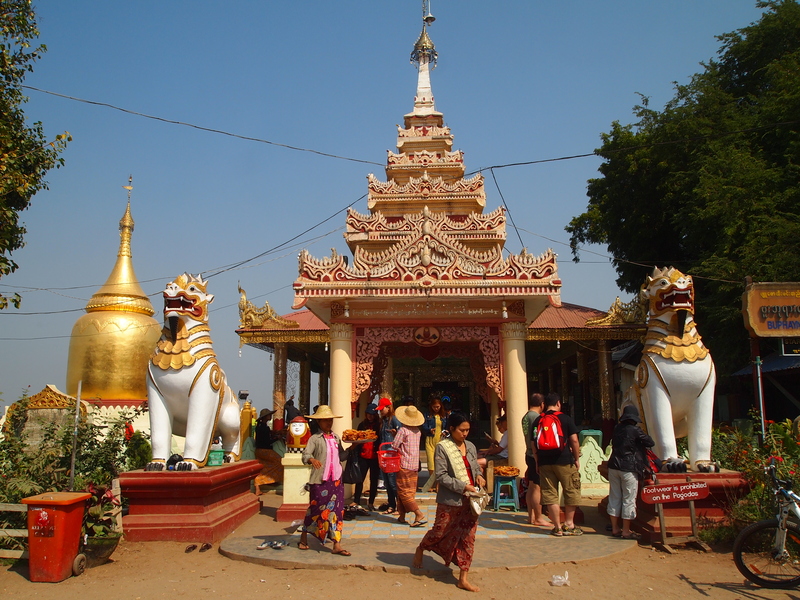 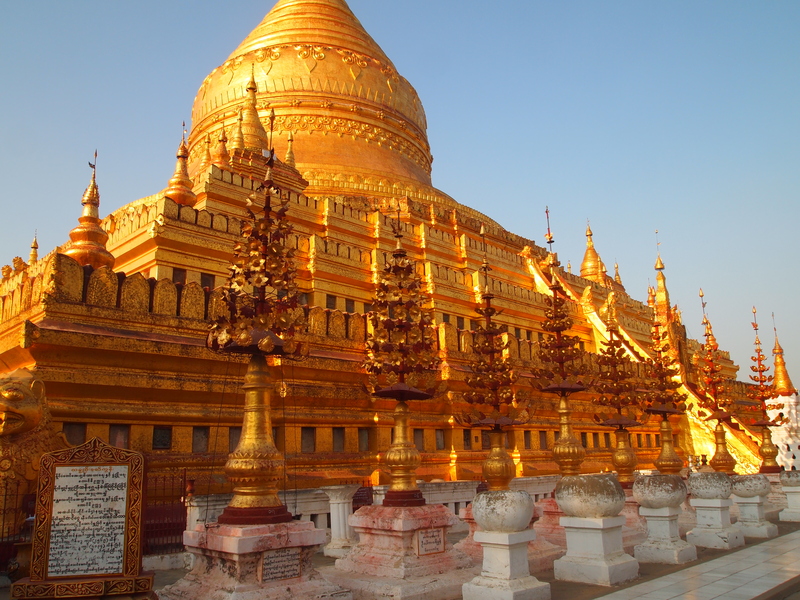 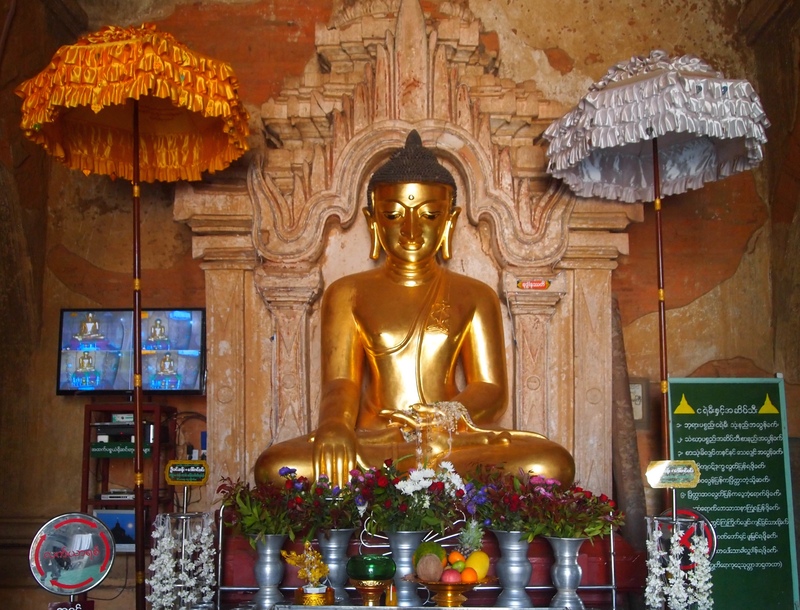 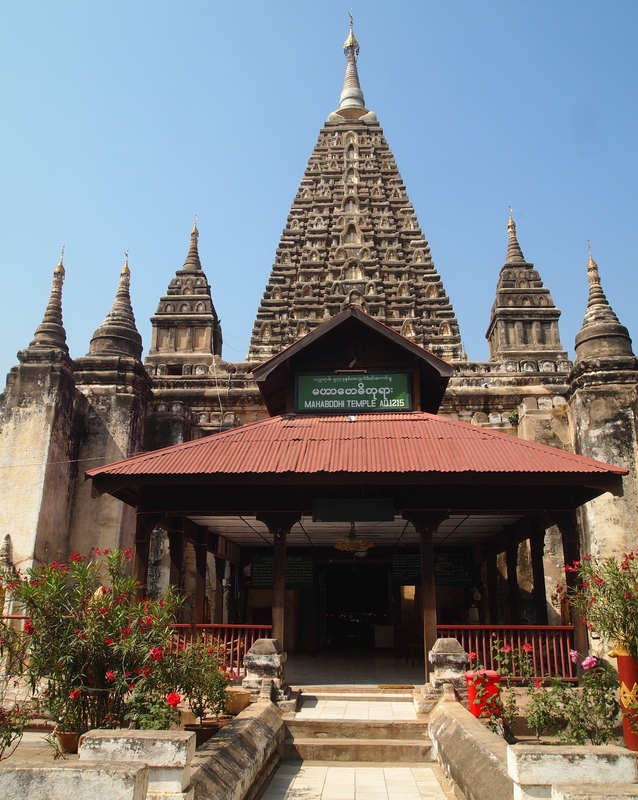 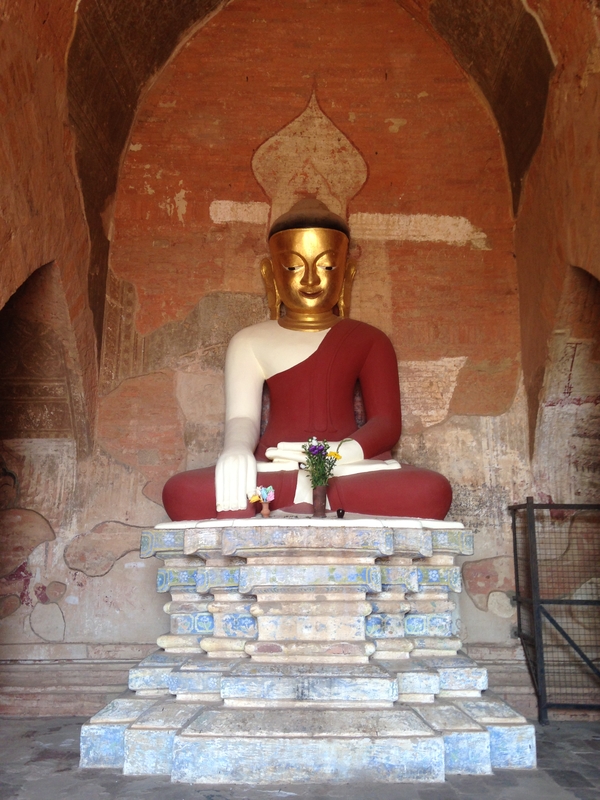 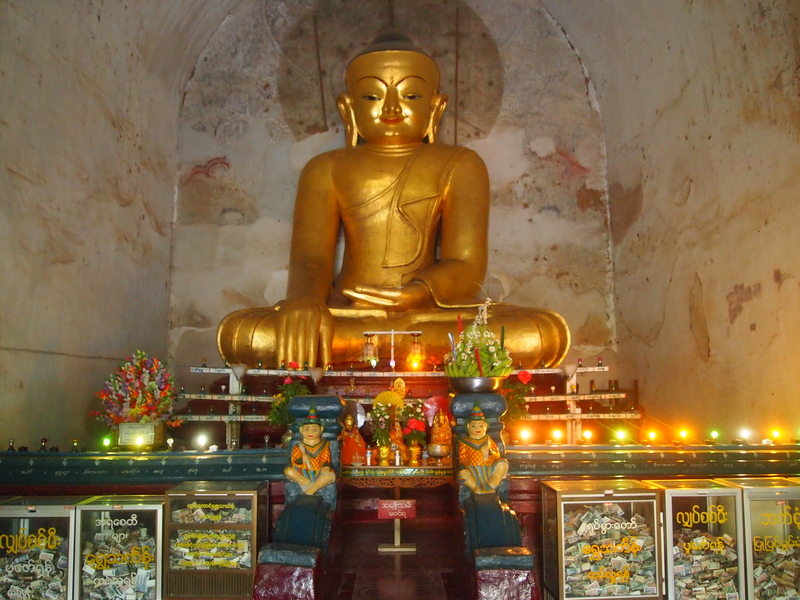 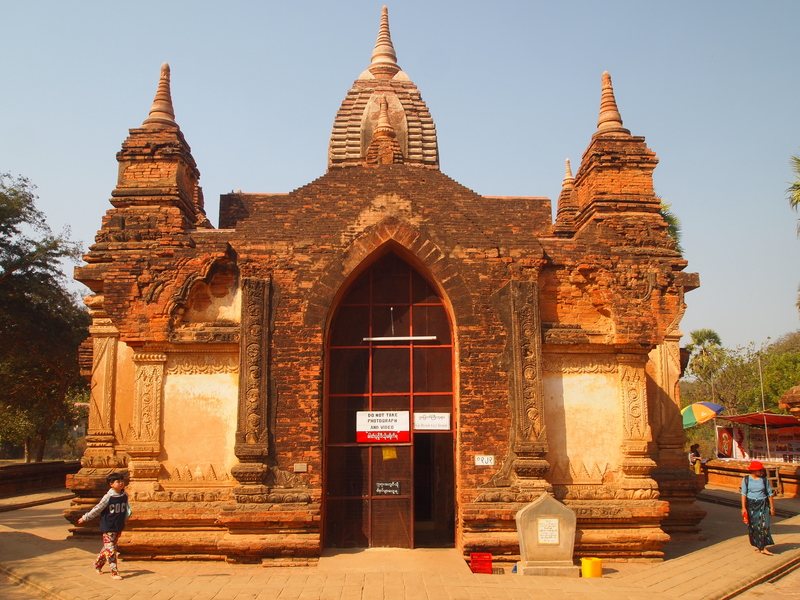 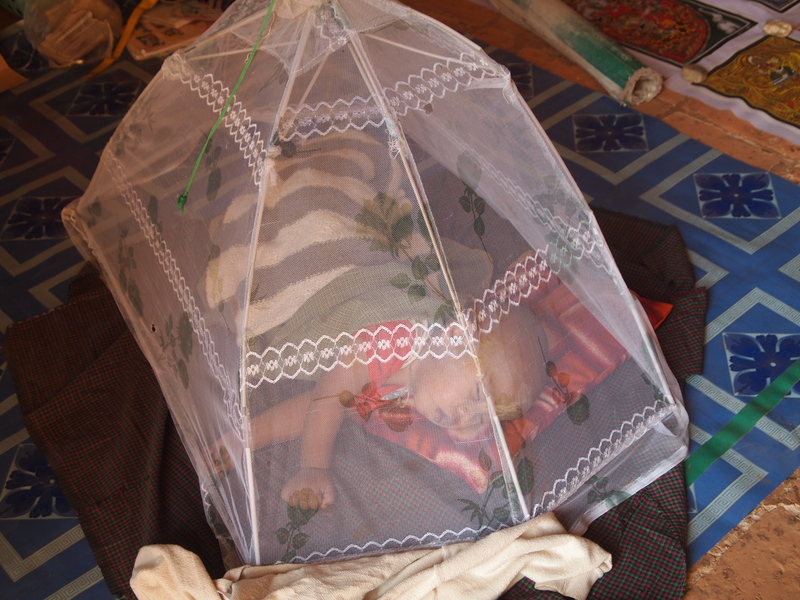 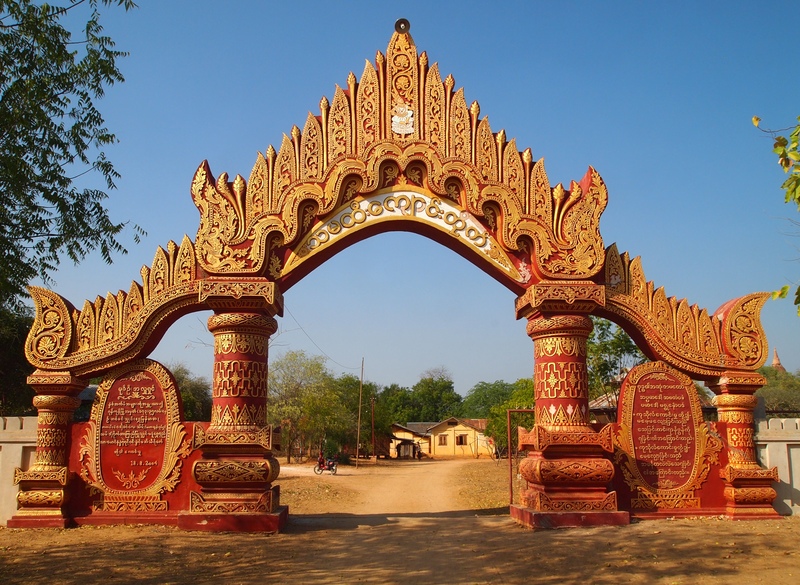 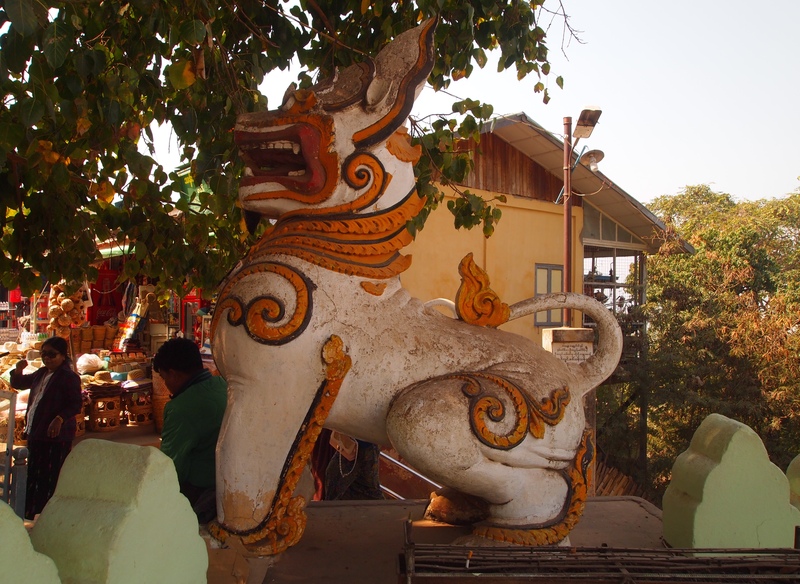 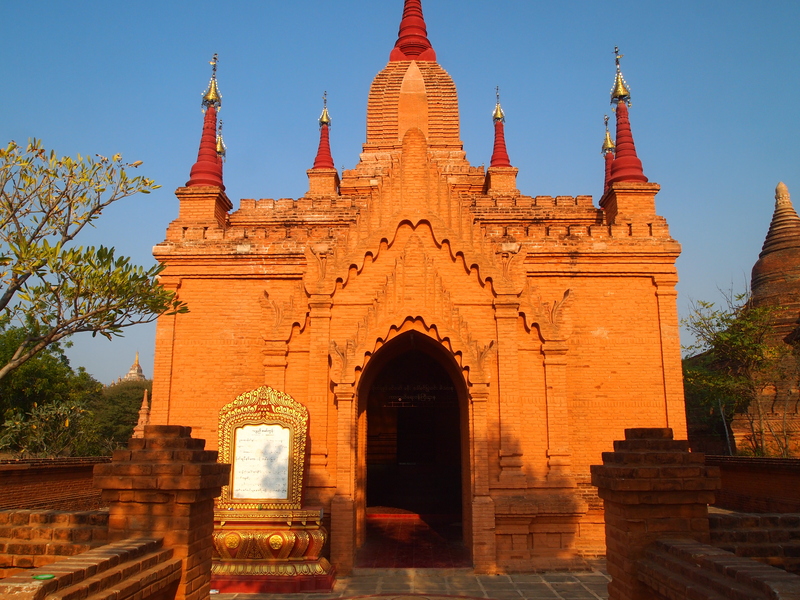 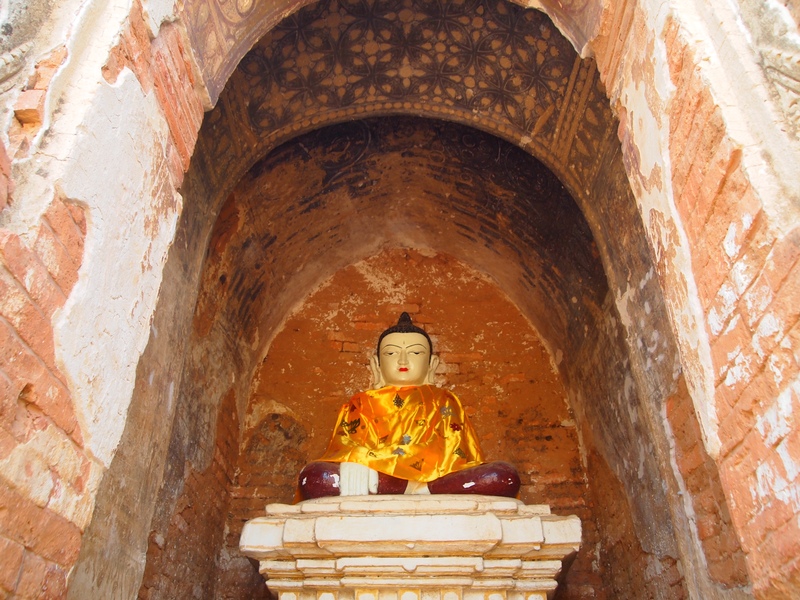 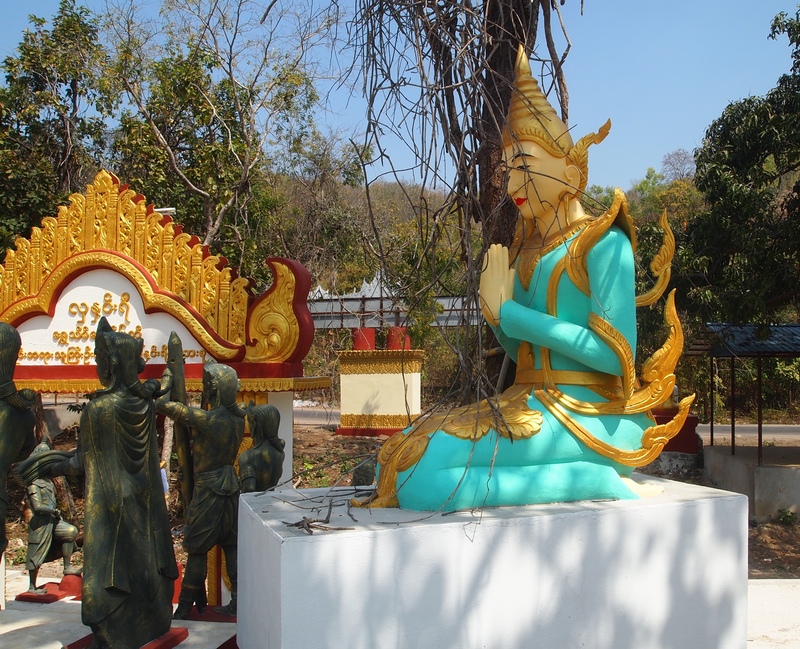 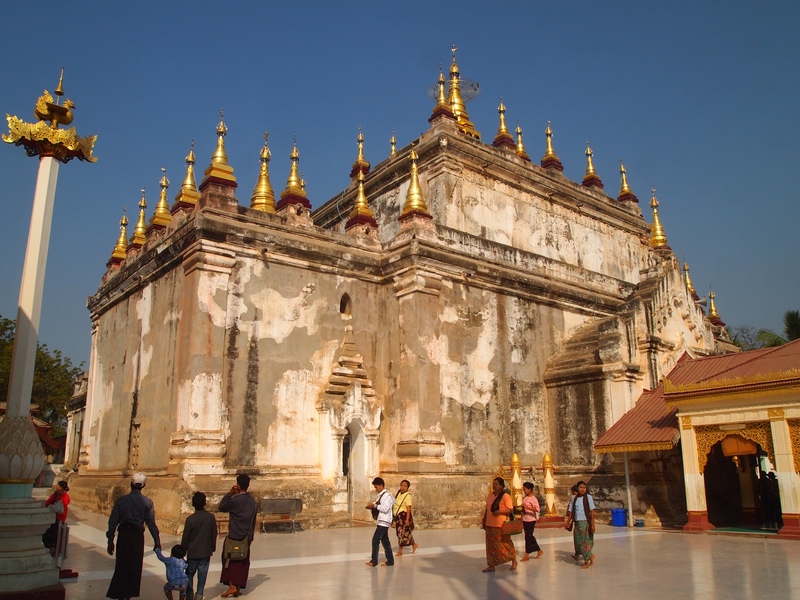 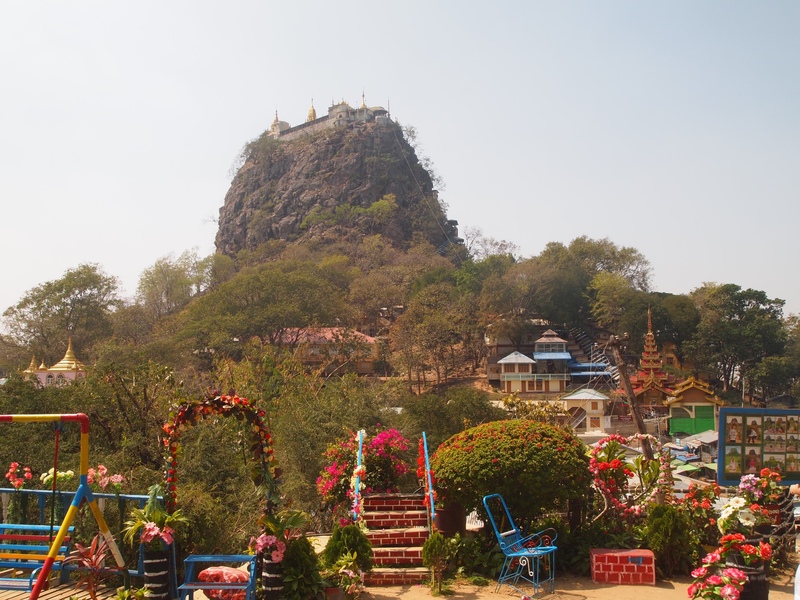 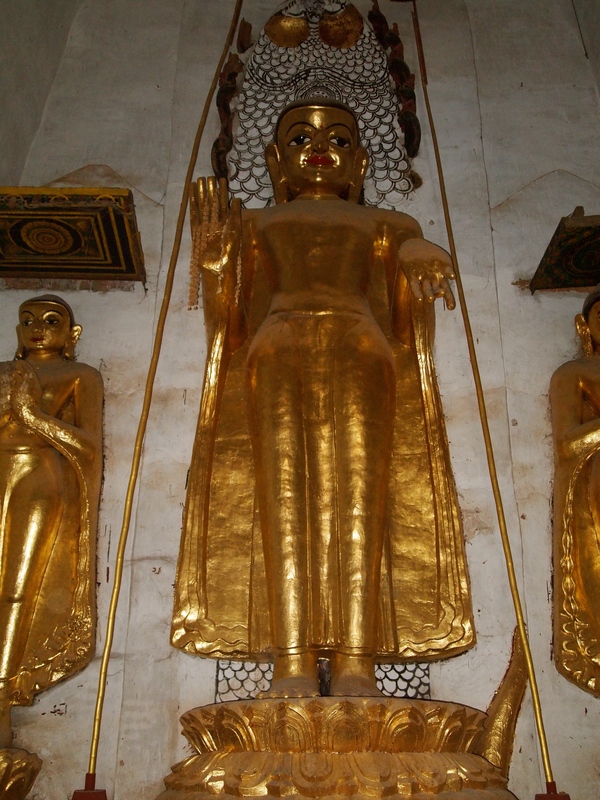 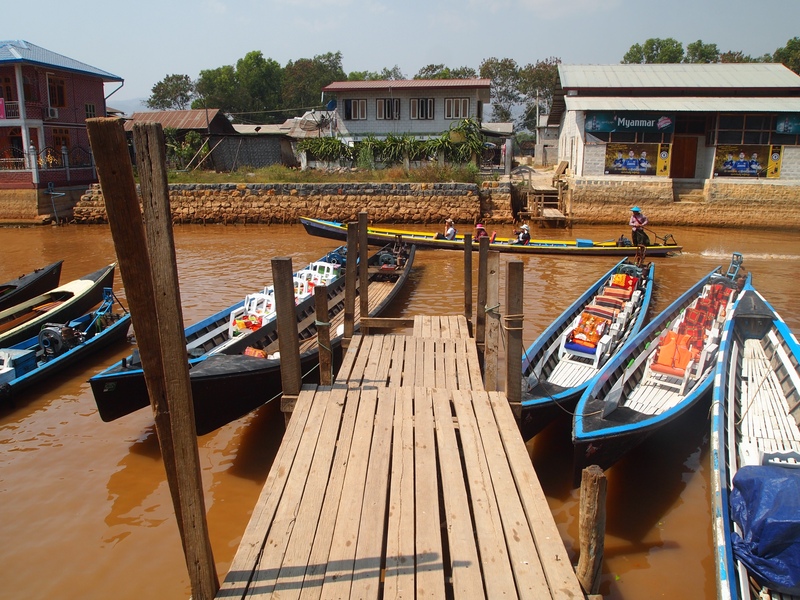 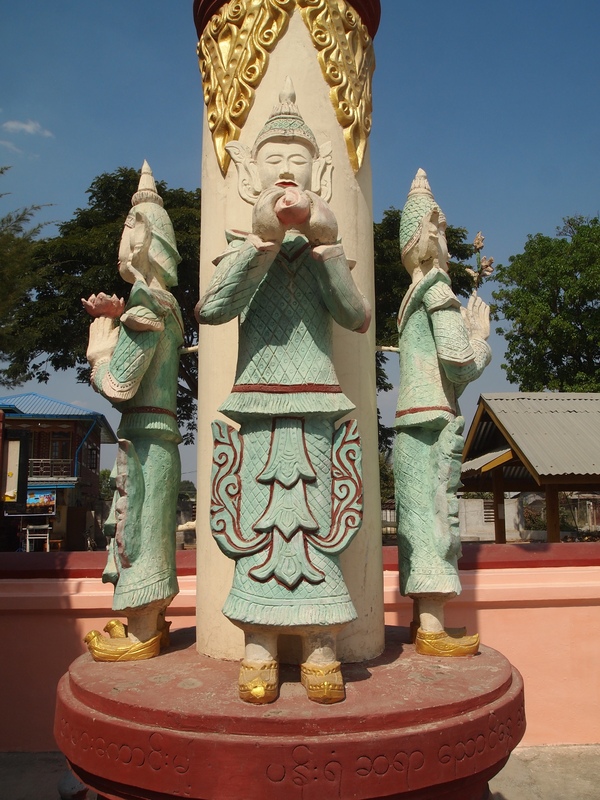 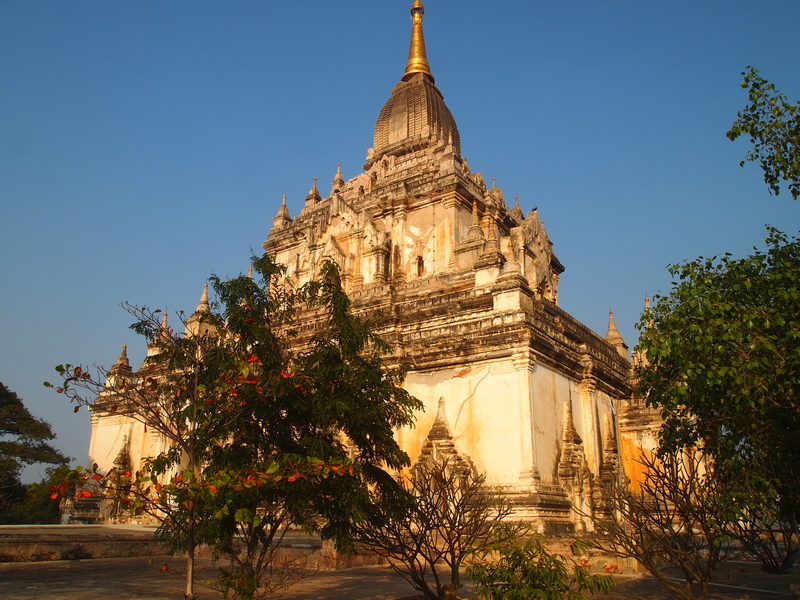 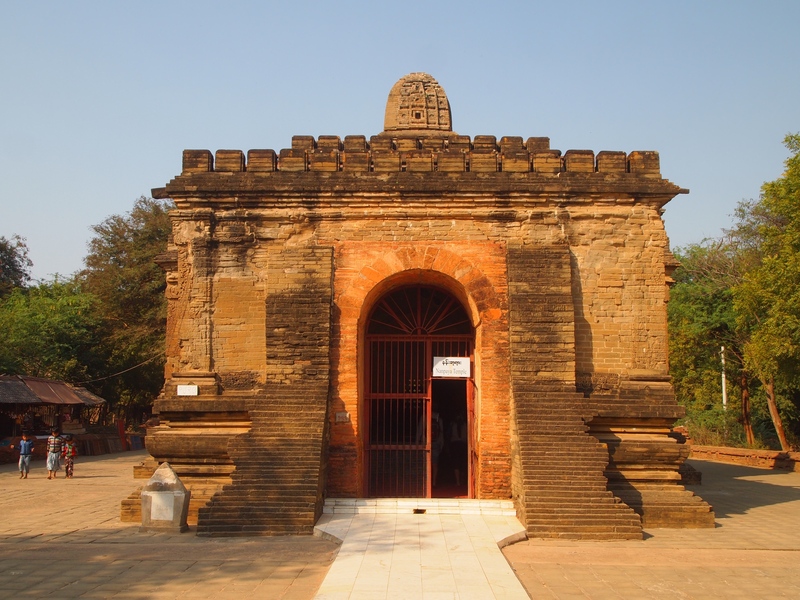 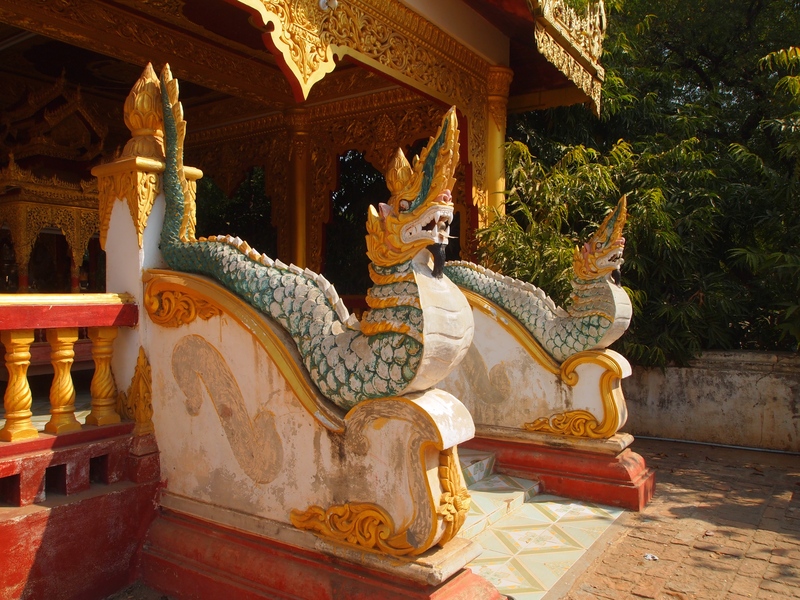 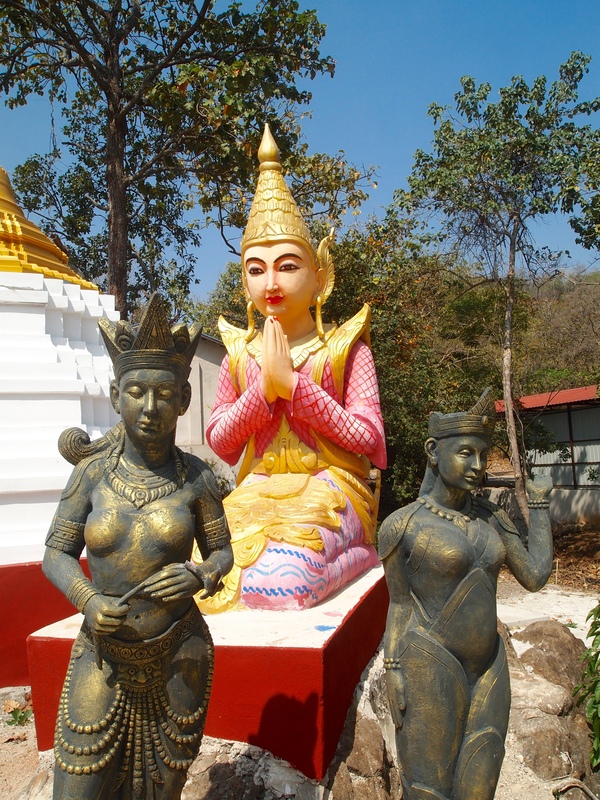 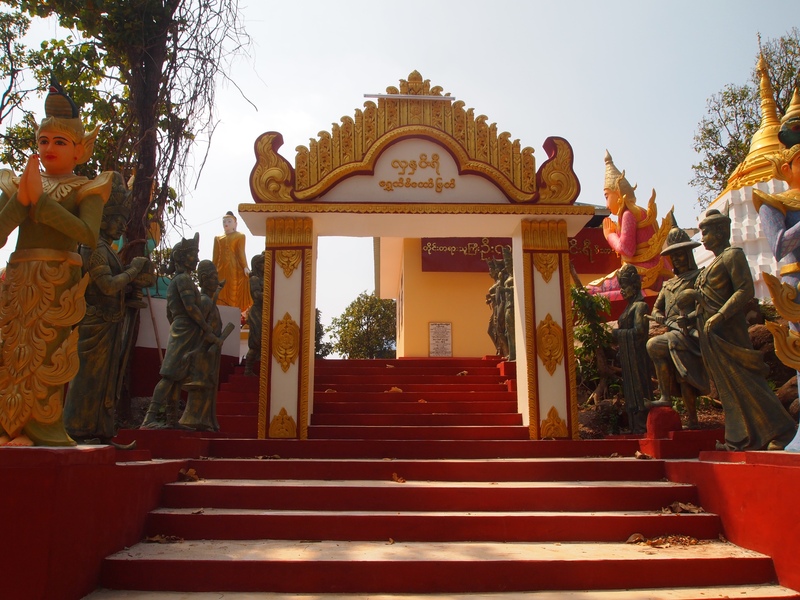 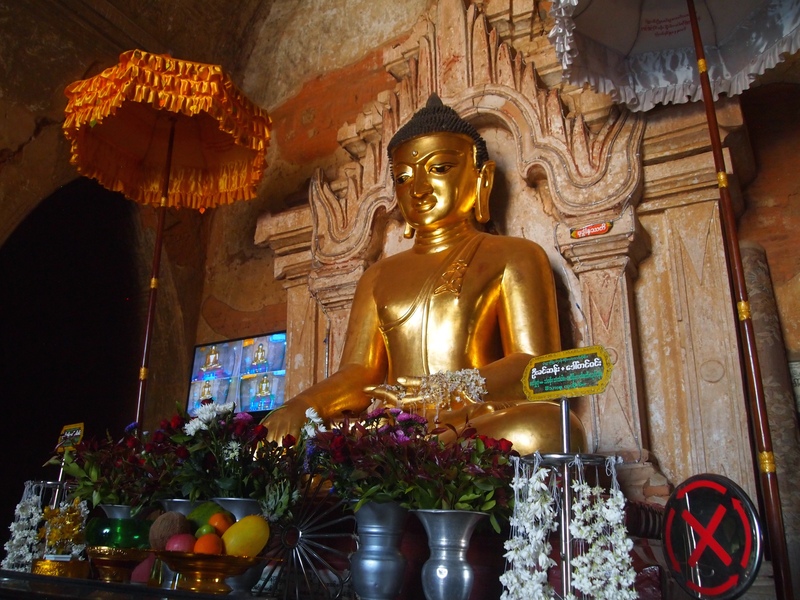 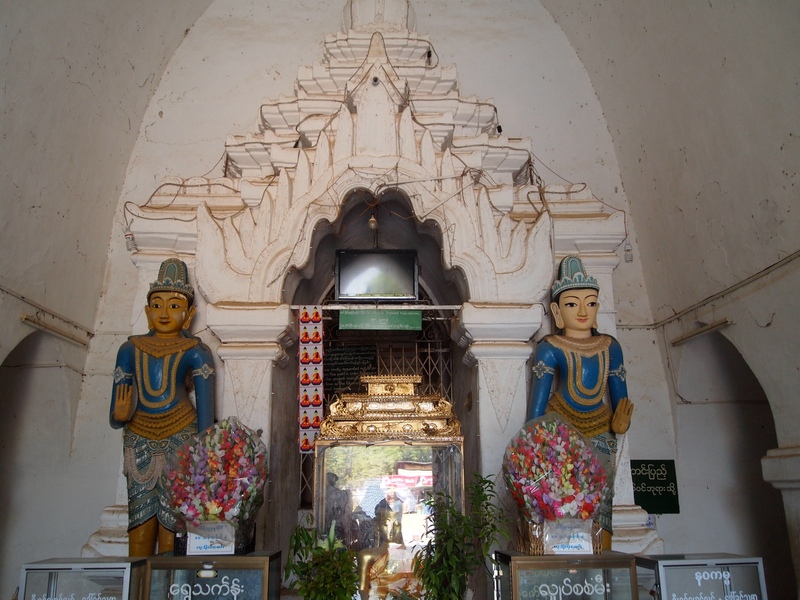 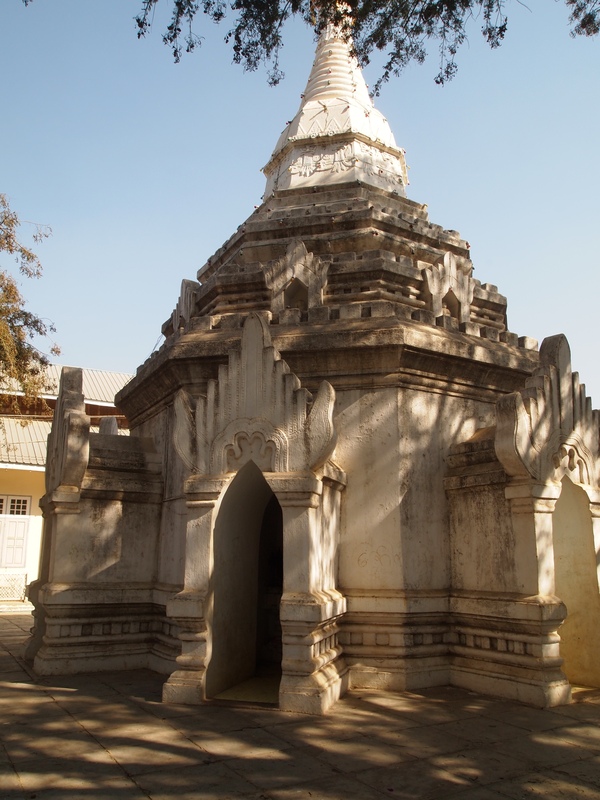 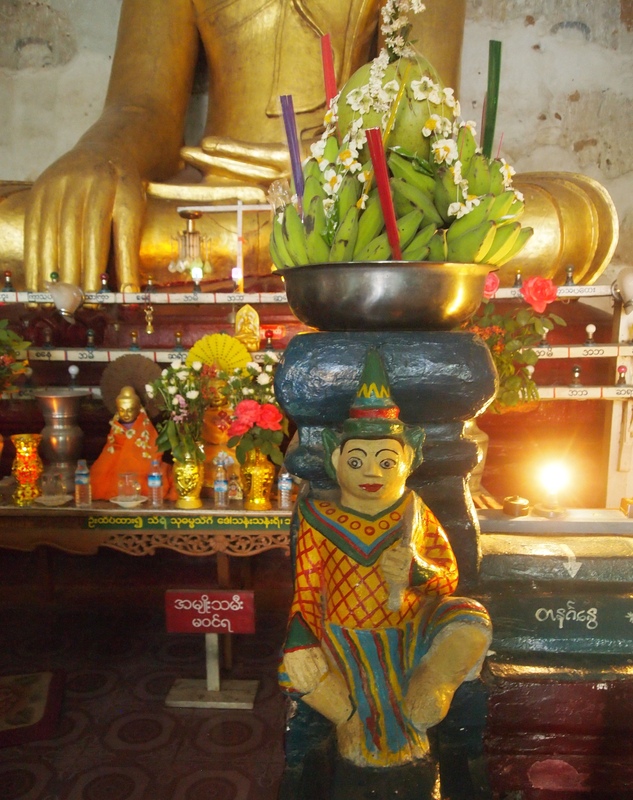 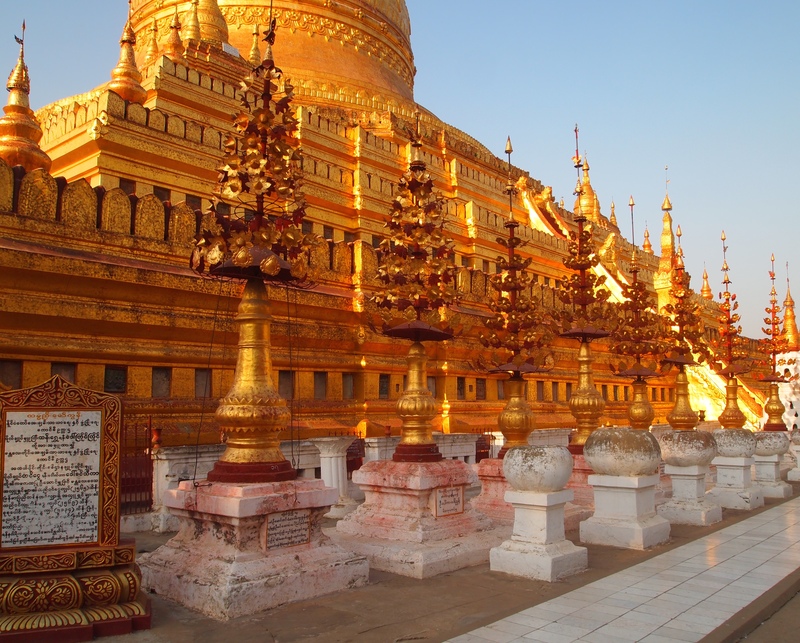 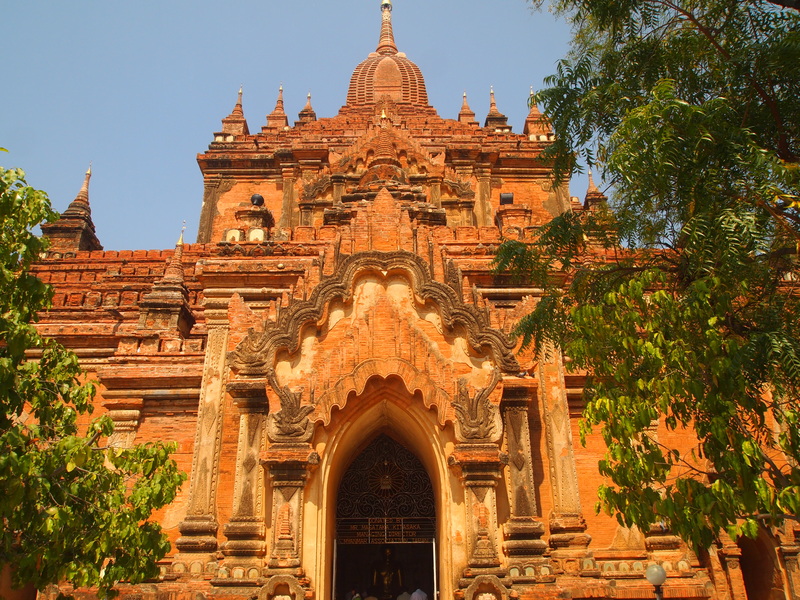 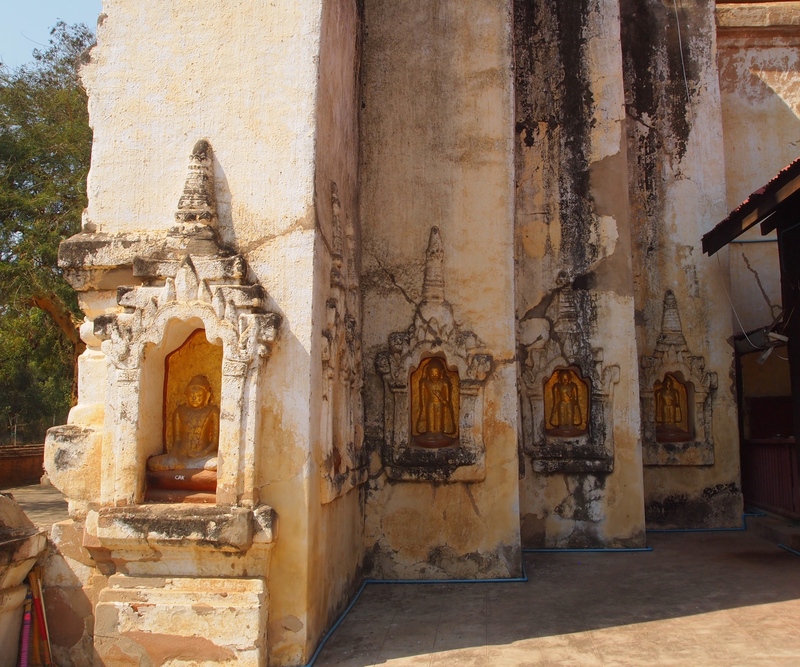 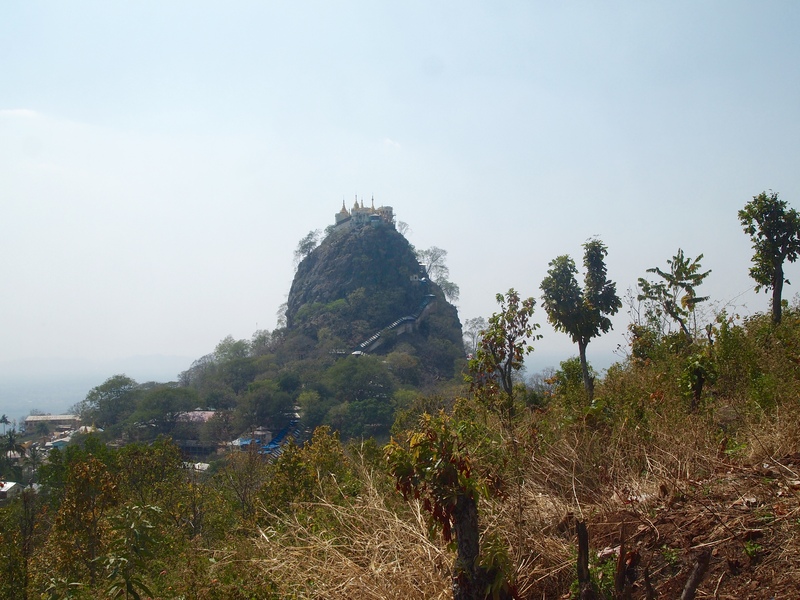 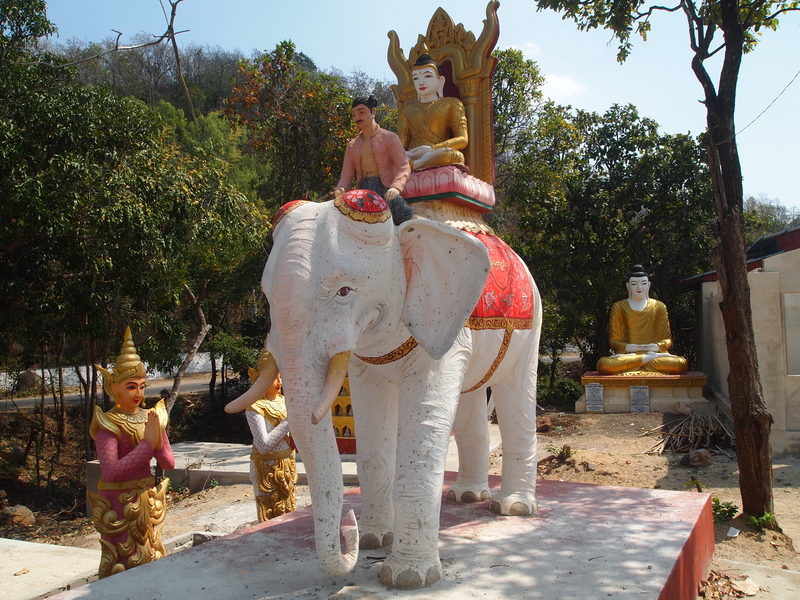 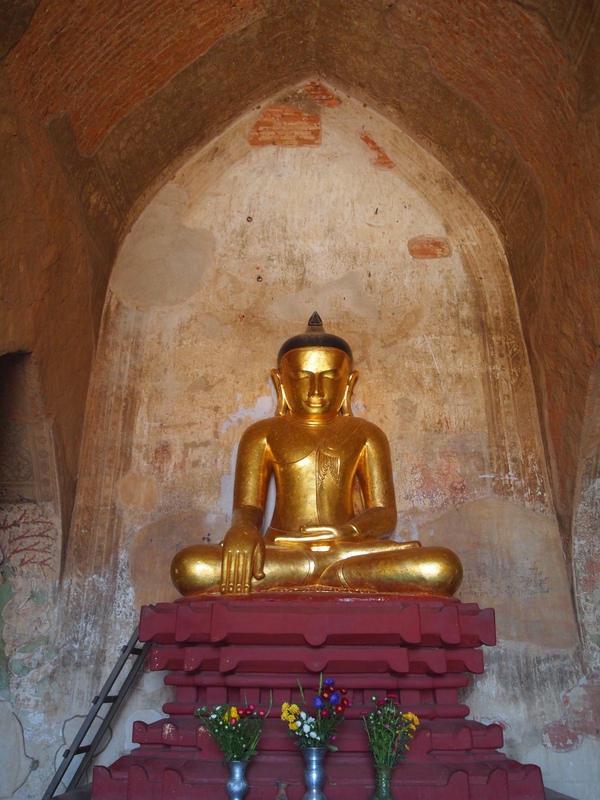 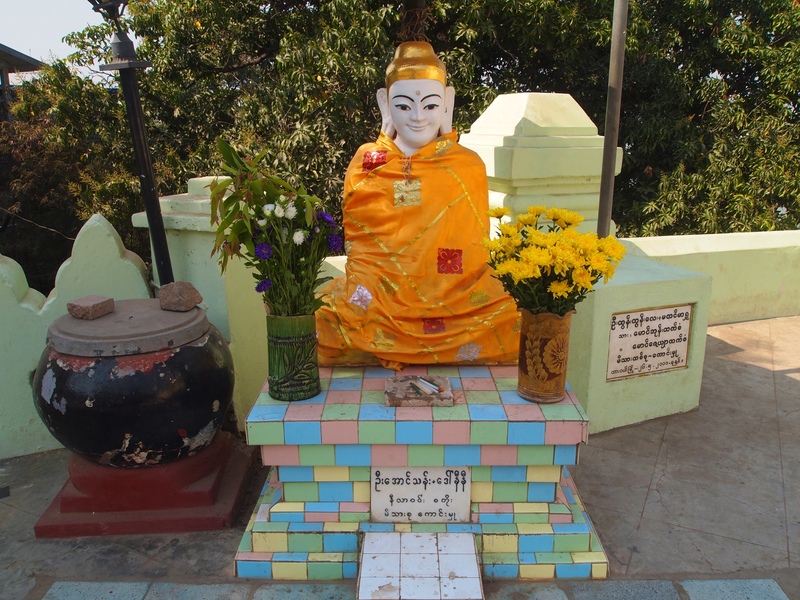 It’s named after Manuha, the Mon King from Thaton, who was held captive here by King Anawrahta. 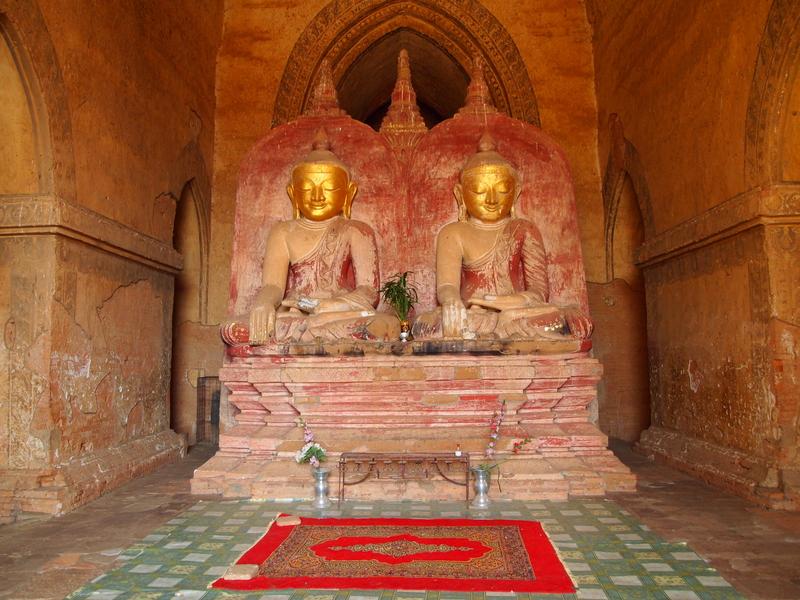 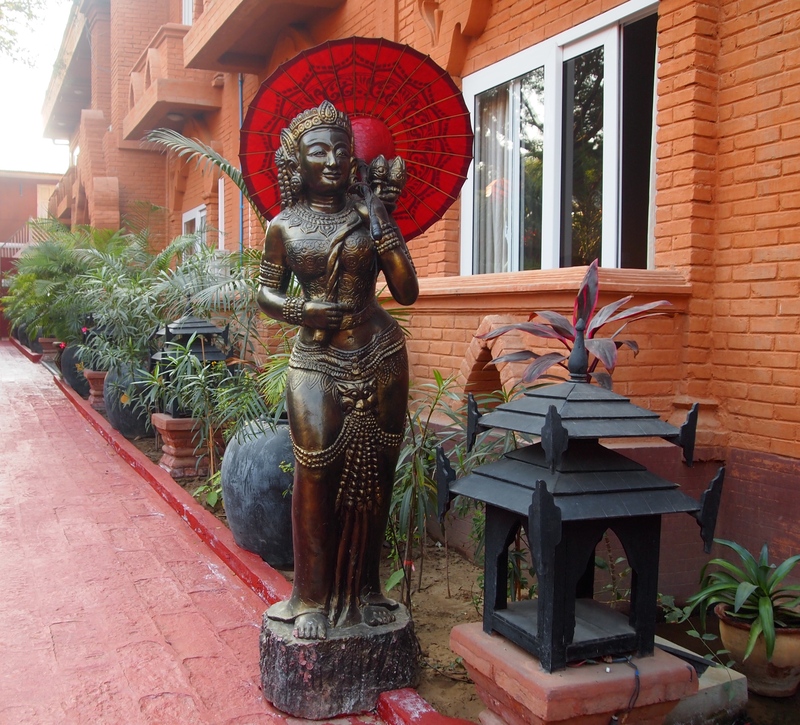 In the front of the building are three seated Buddhas. 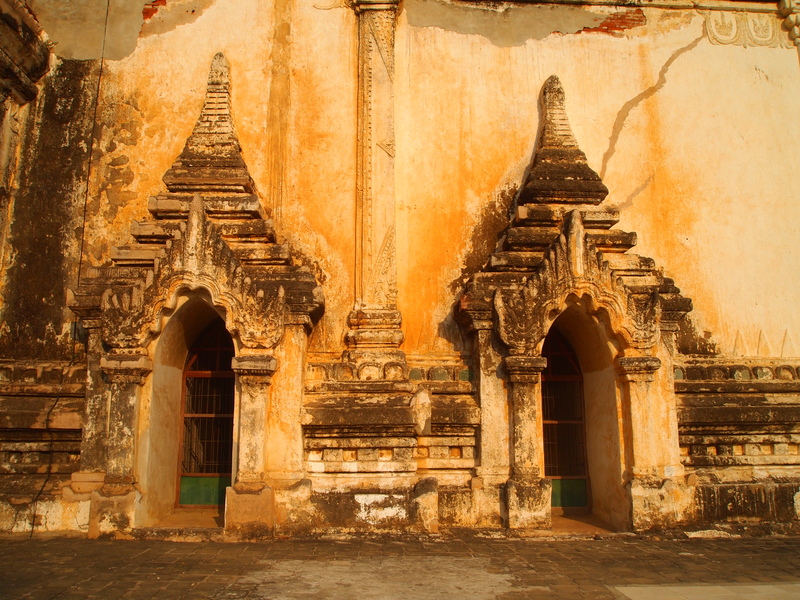 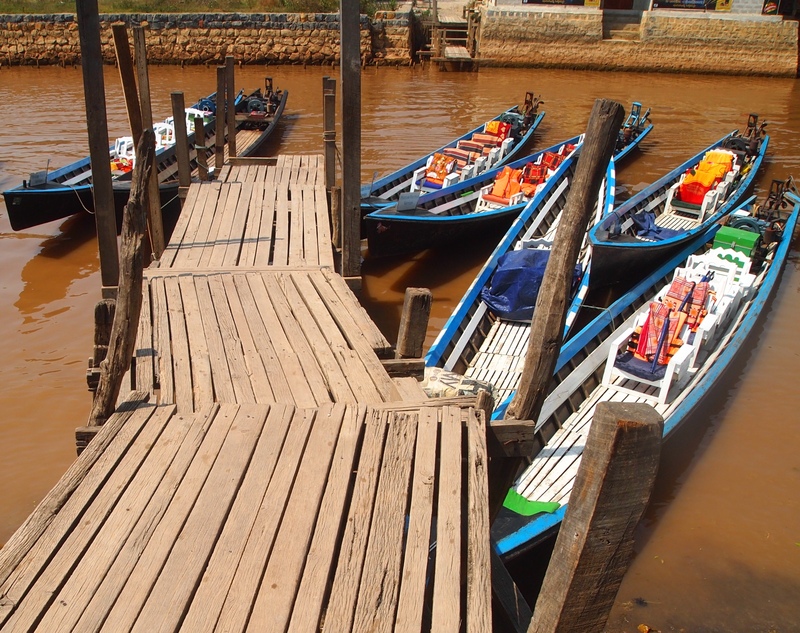 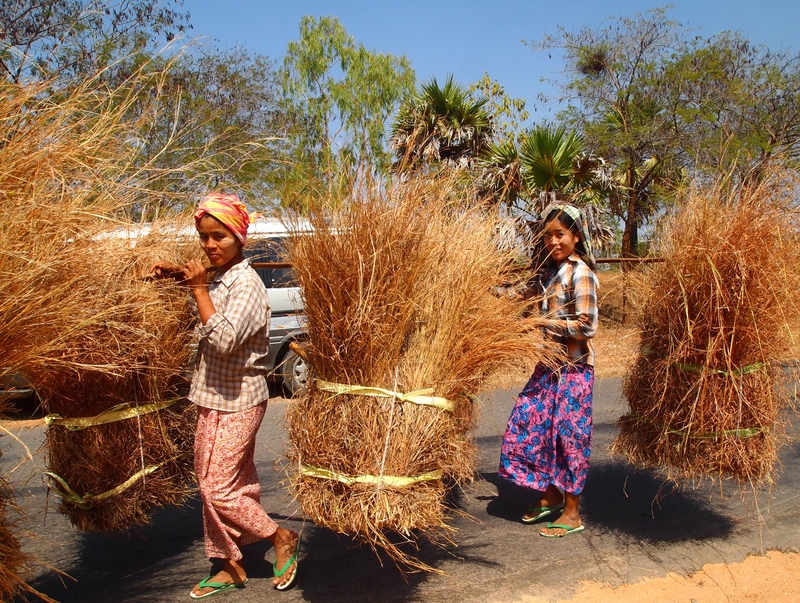 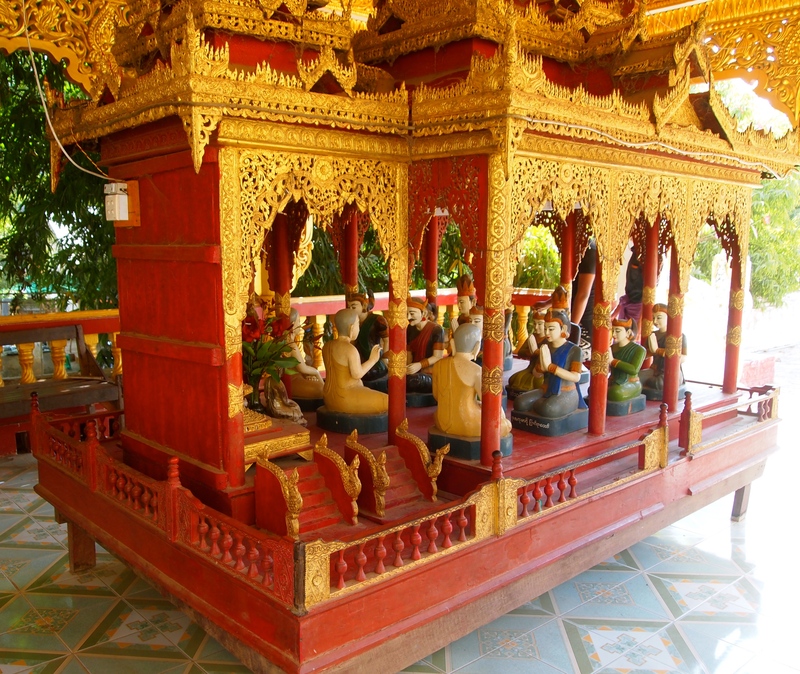 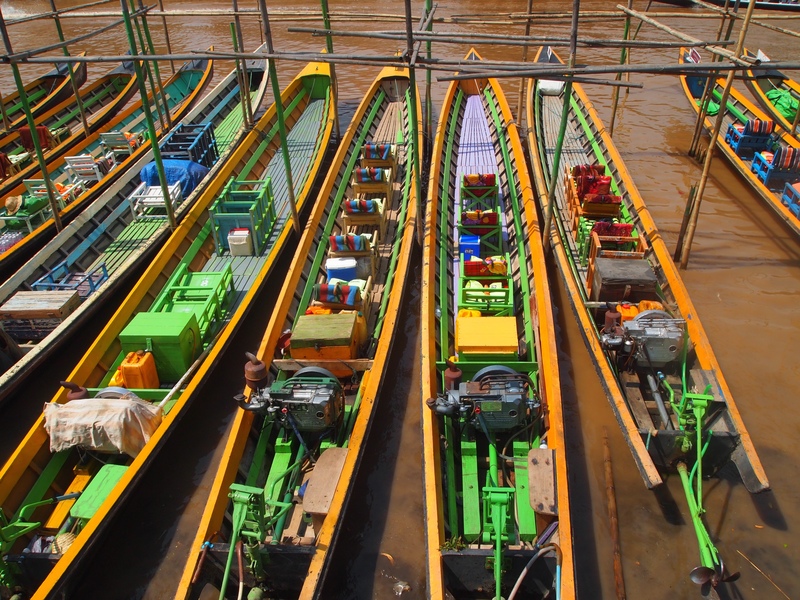 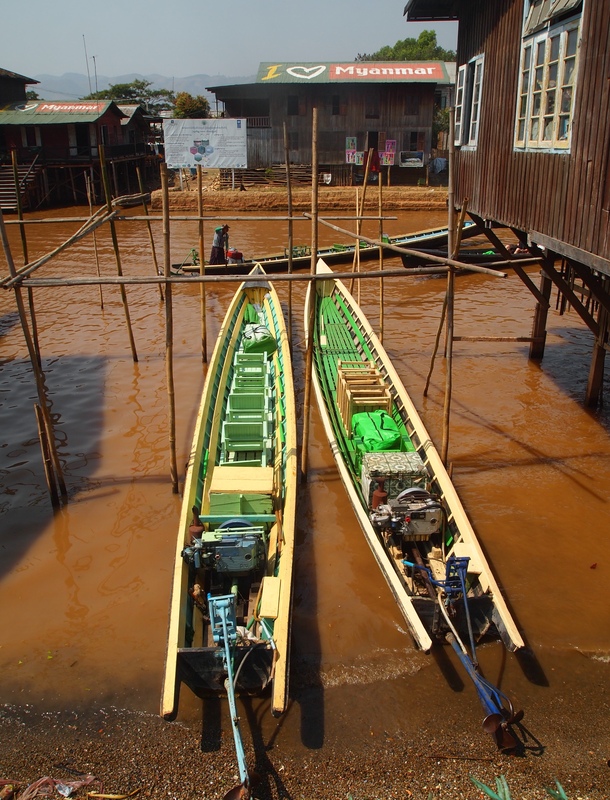 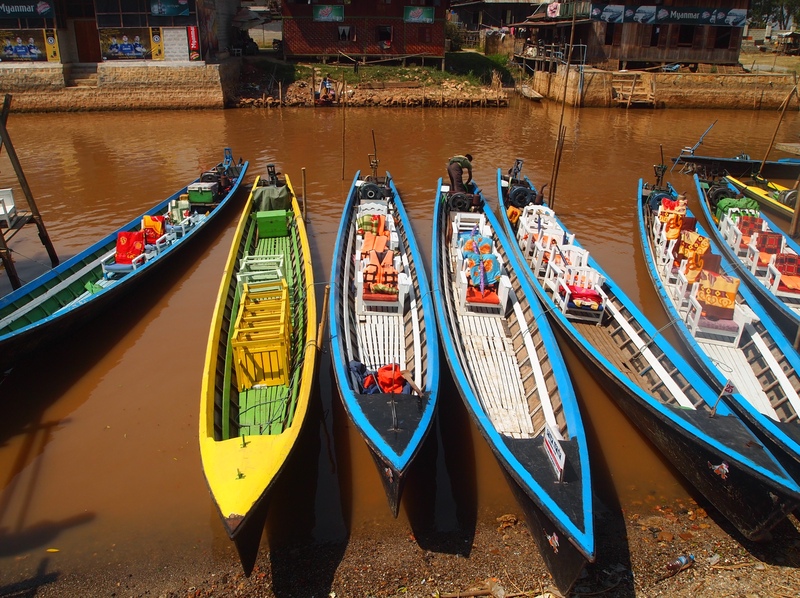 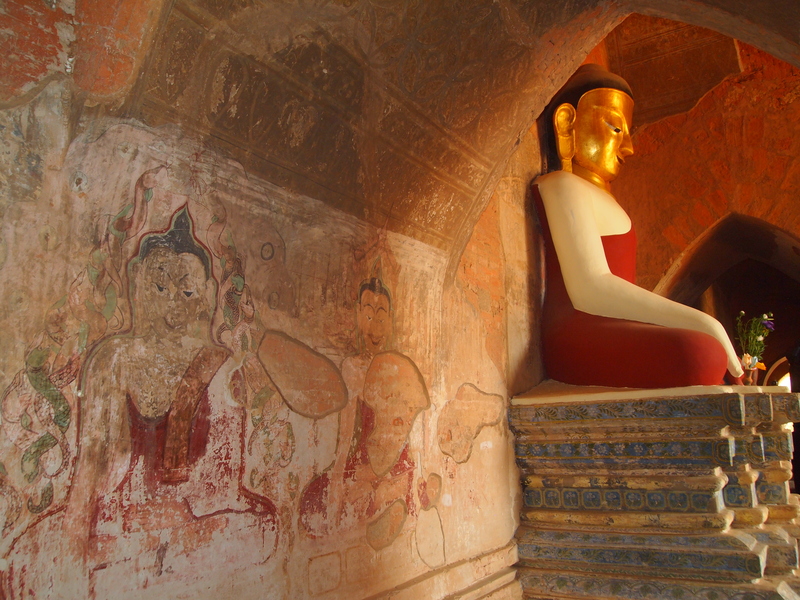 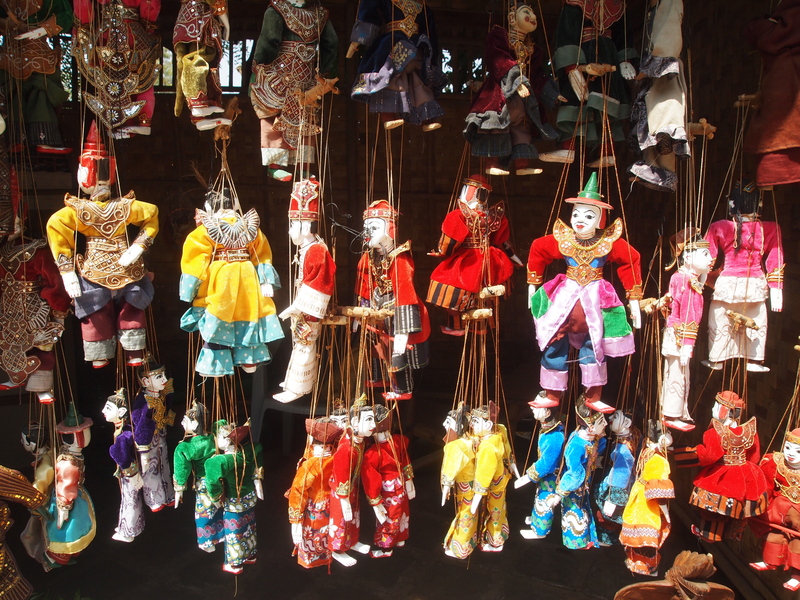 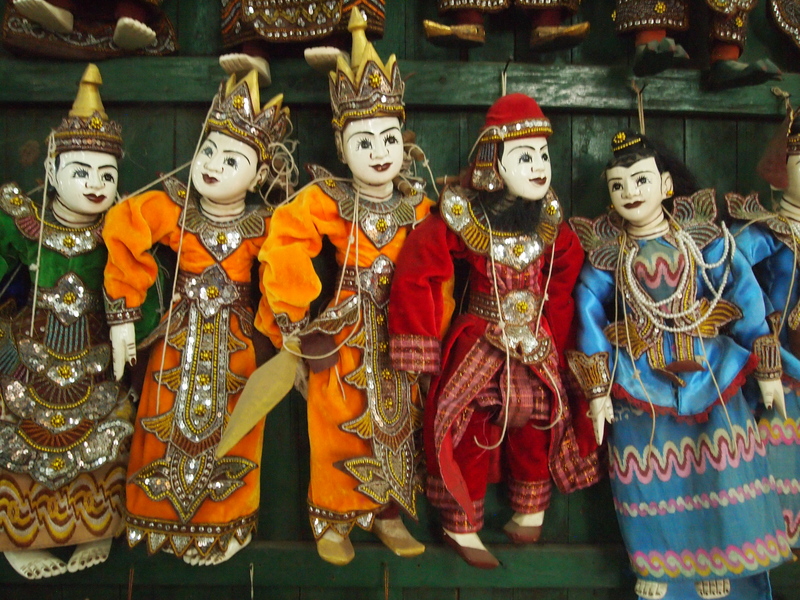 They all seem too large for the small spaces that enclose them, representing the stress and endurance the king had to endure (Lonely Planet Myanmar). 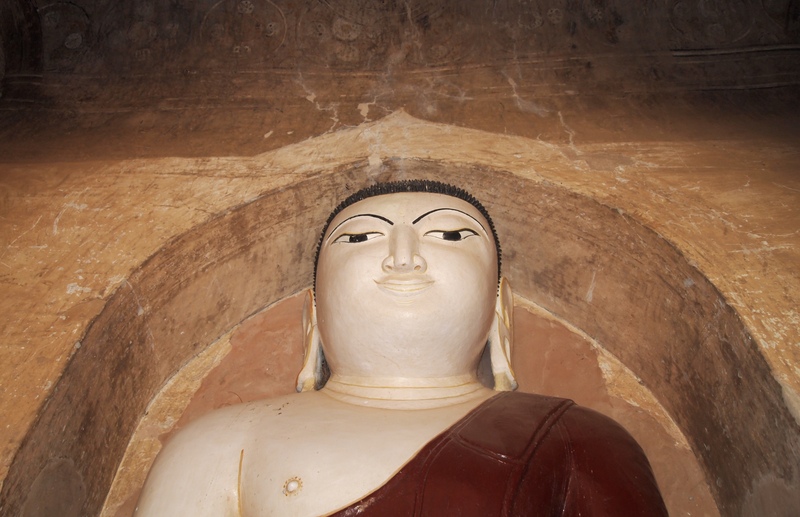 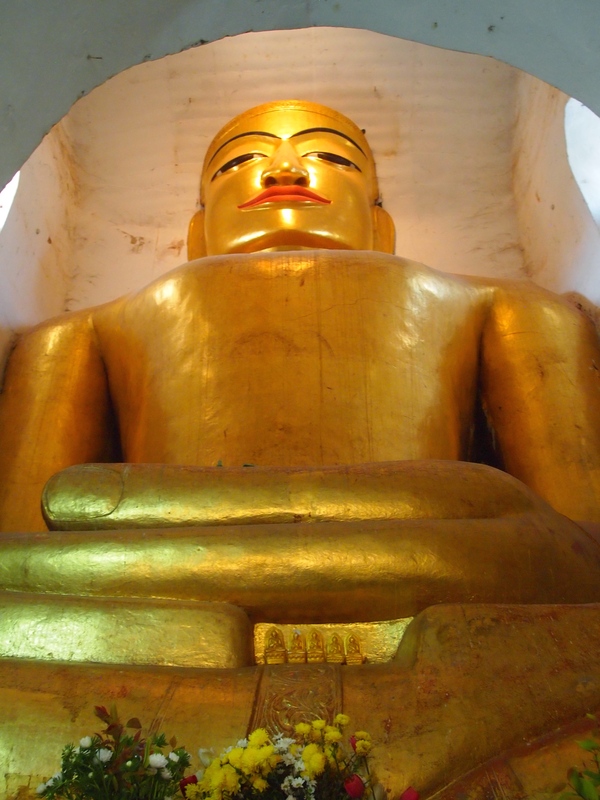 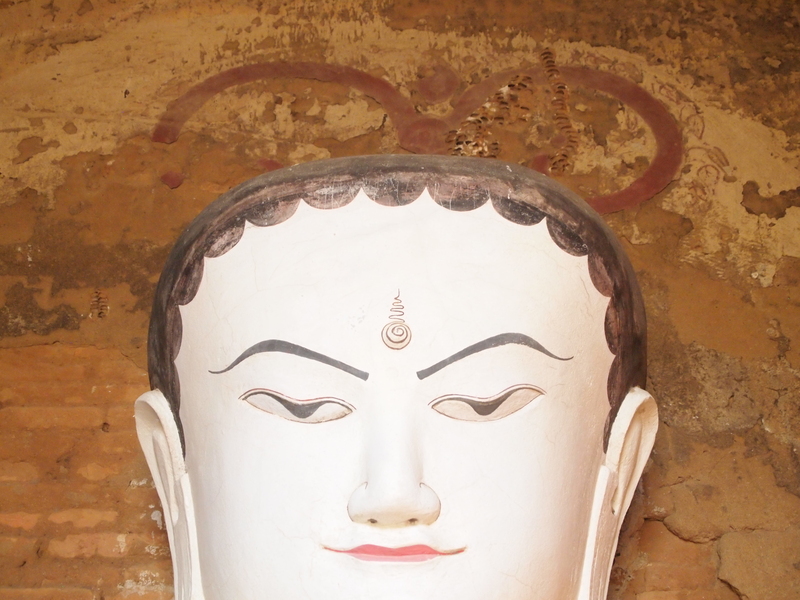 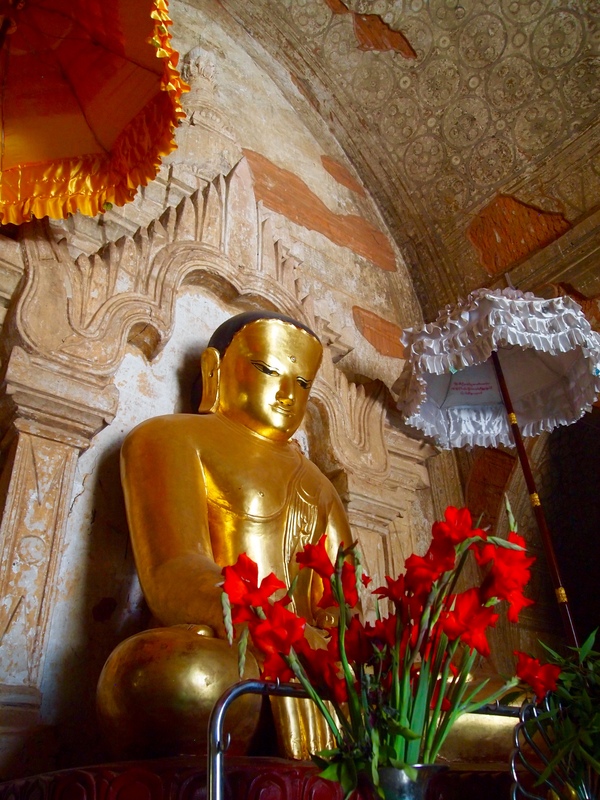 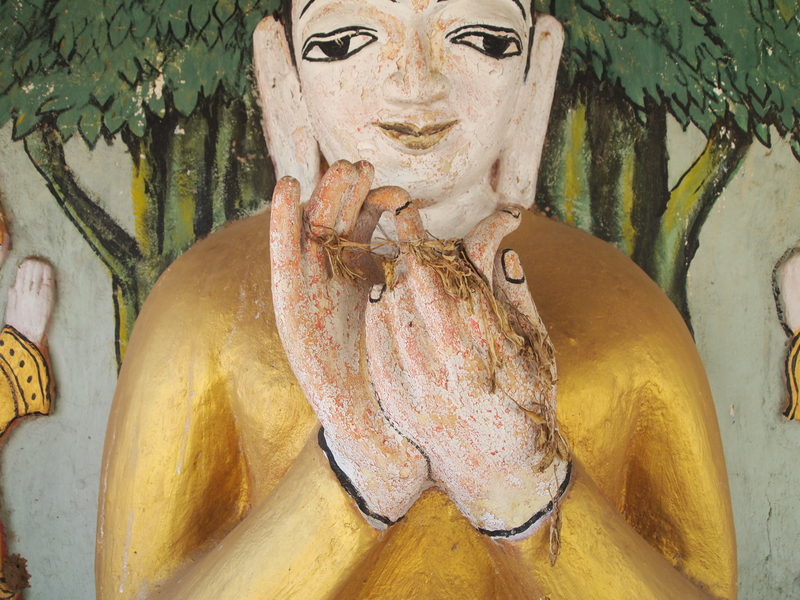 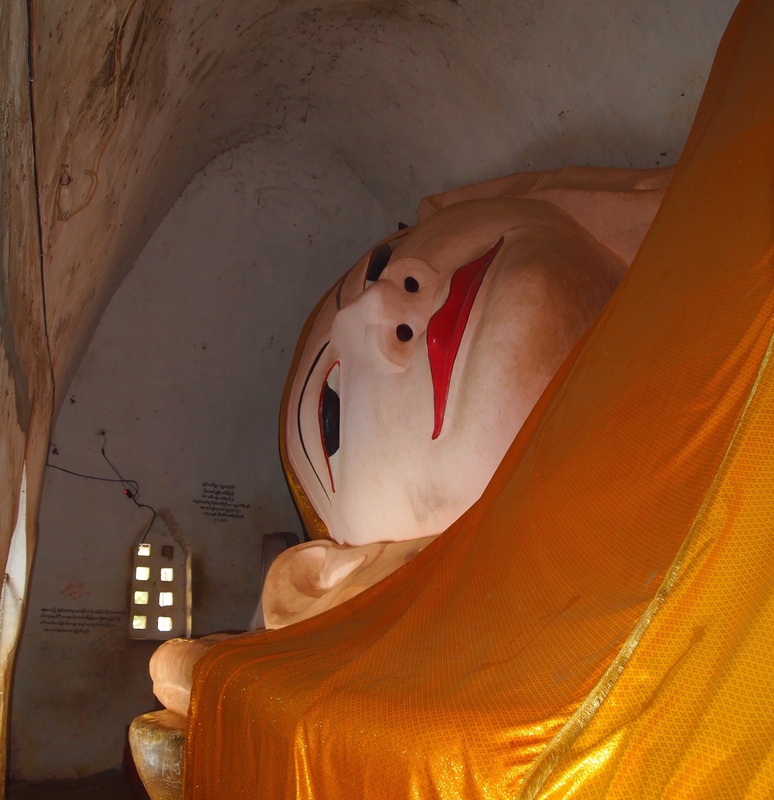 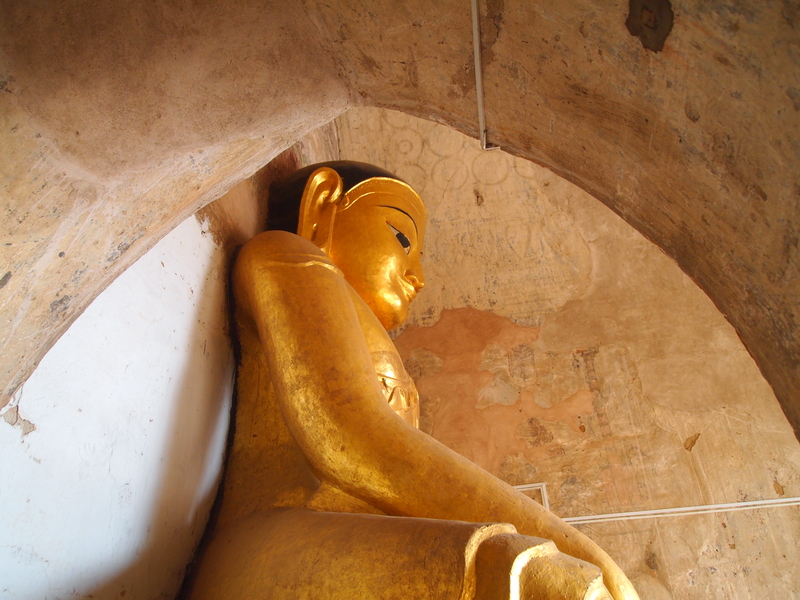 In the back of Manuha Paya is a huge reclining Buddha with a smile on his face. 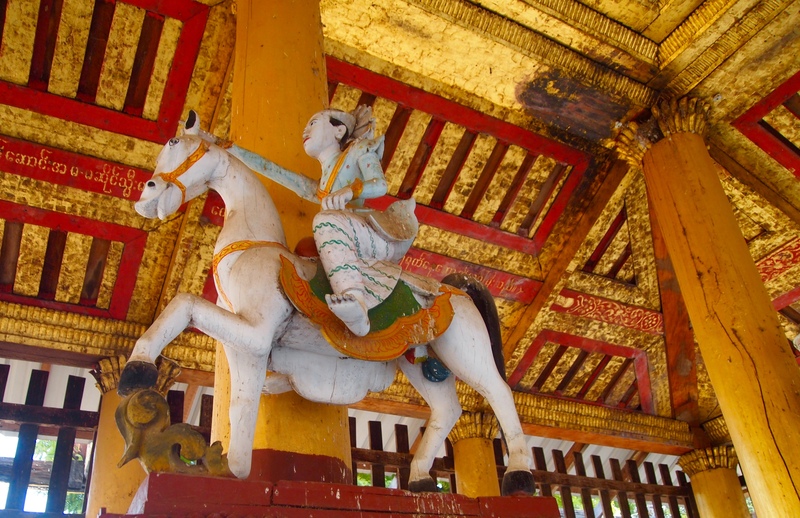 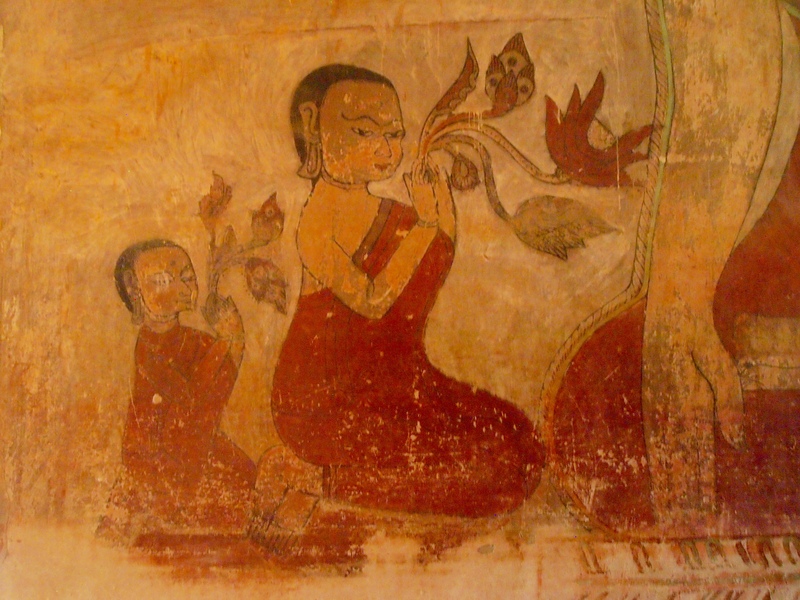 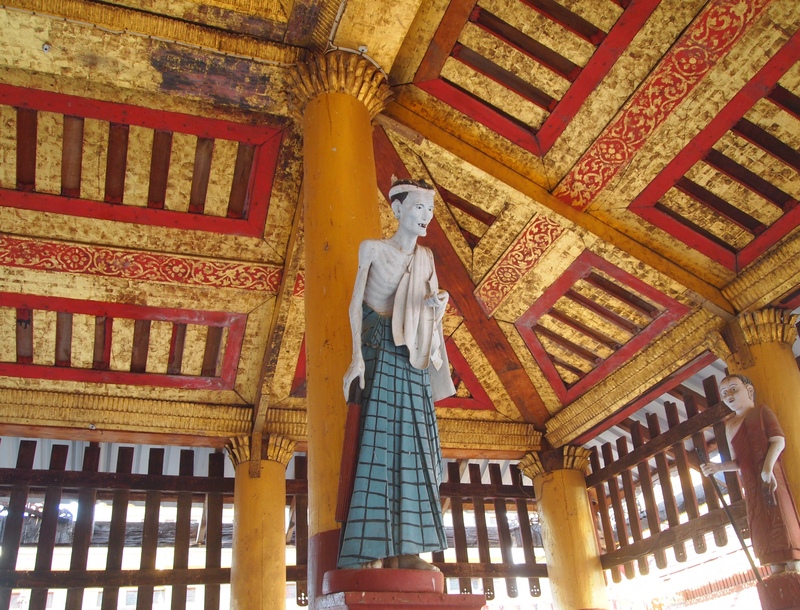 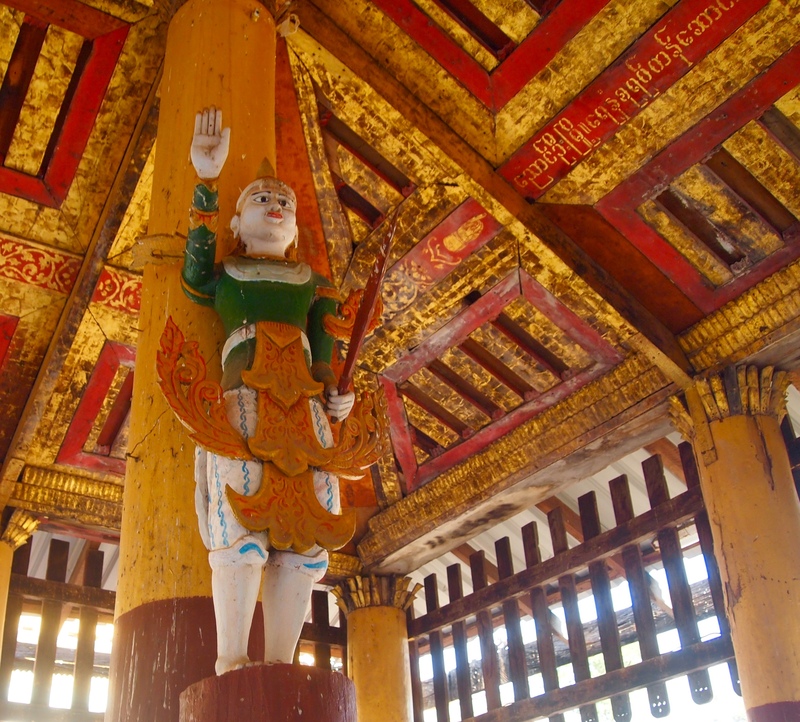 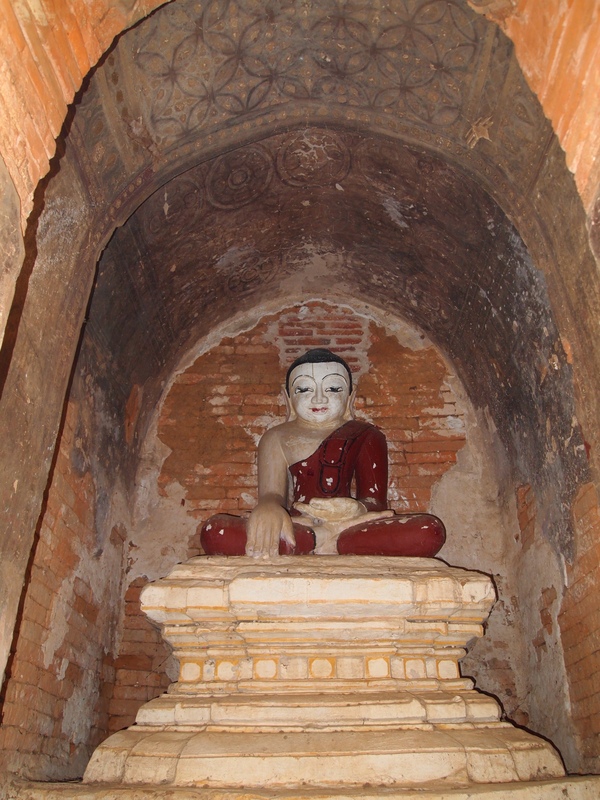 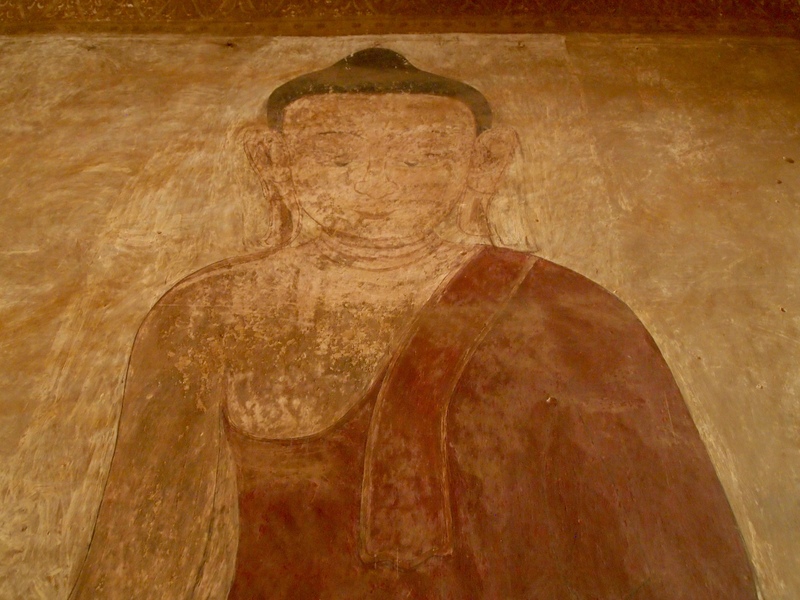 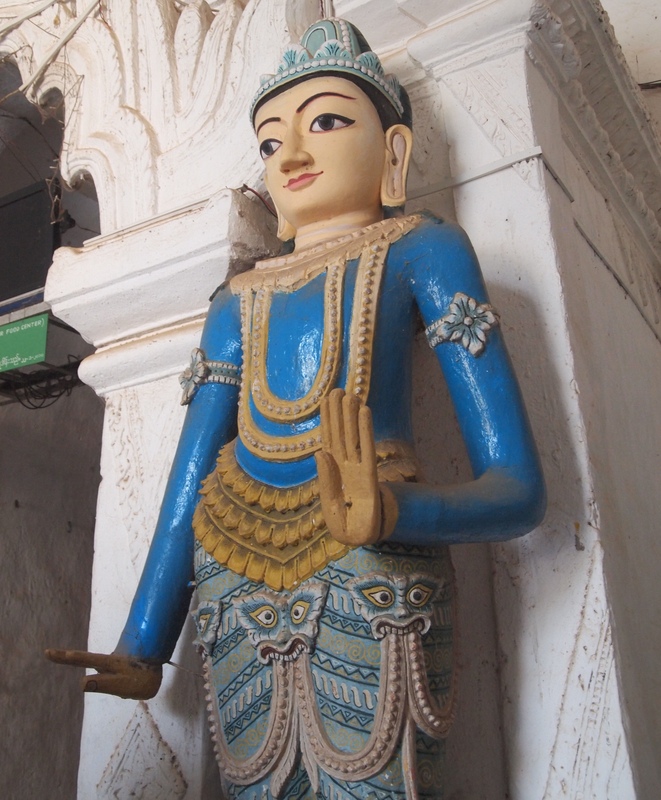 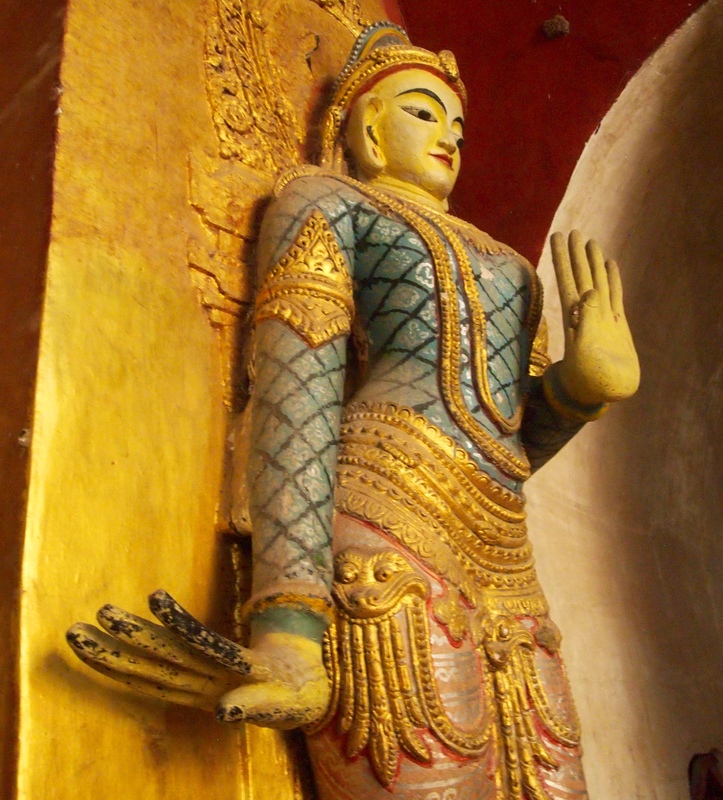 He is supposedly in the act of entering parinibbana (final passing away), showing that for King Manuha, death was the only release from his suffering (Lonely Planet Myanmar). 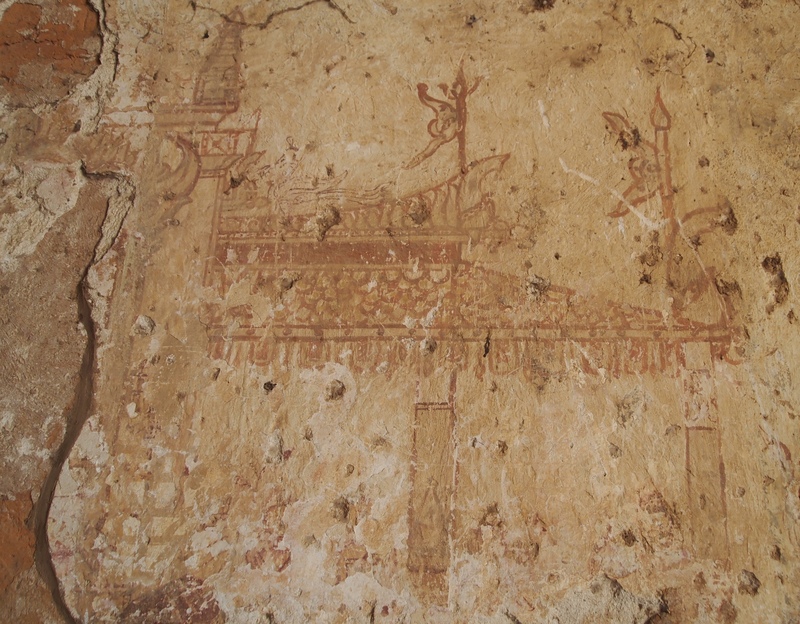 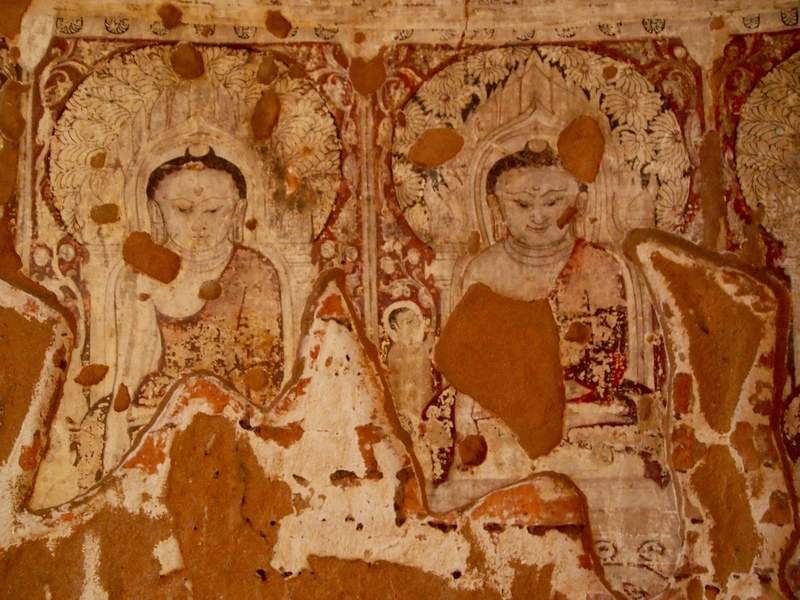 We go next to Gubyauk Gyi, or Great Painted Cave Temple, built in A. D. 1113 by Prince Yaza Kumaya. 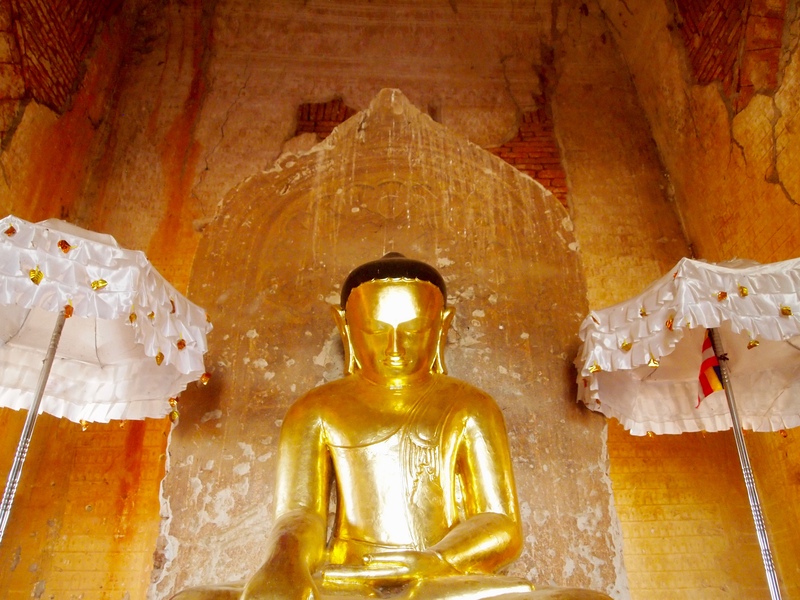 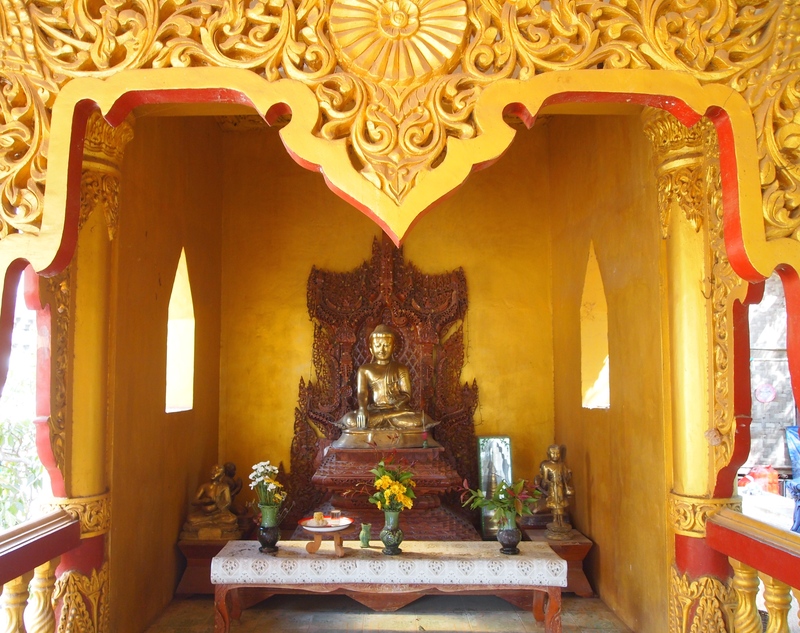 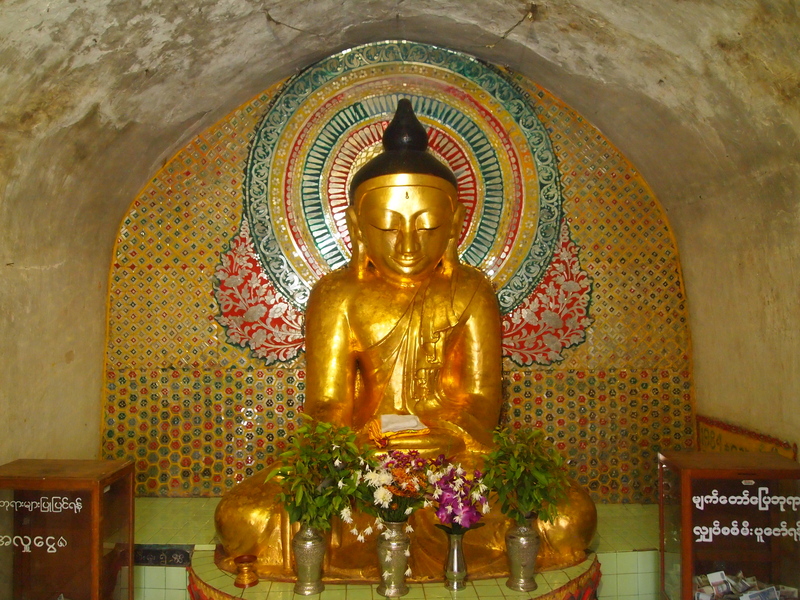 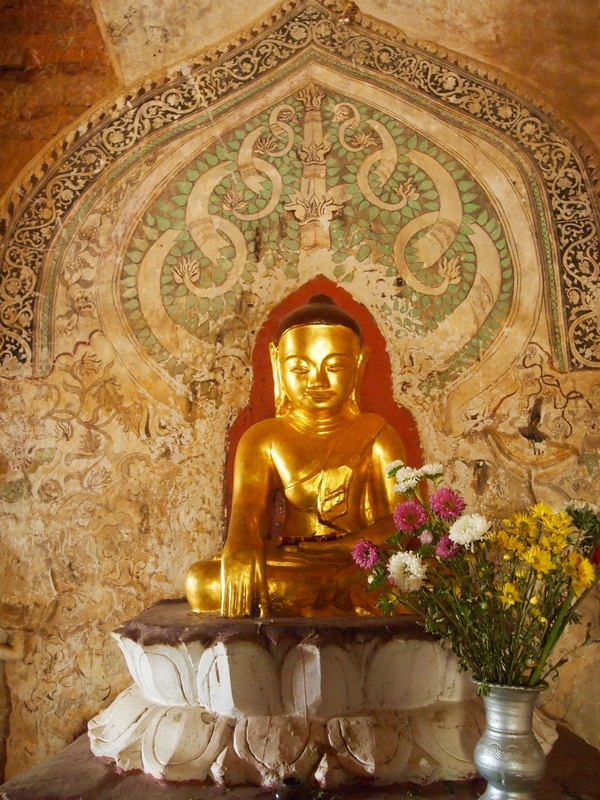 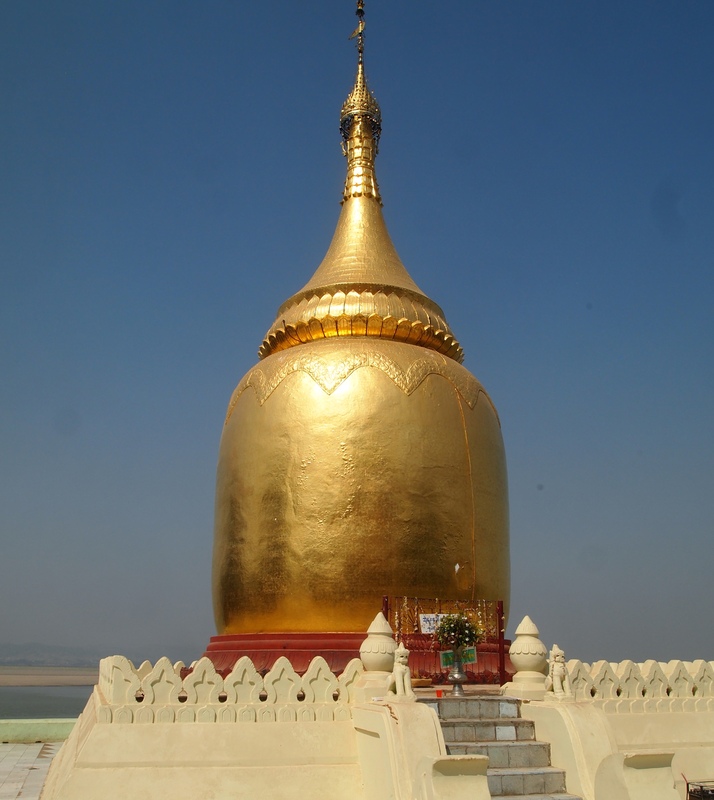 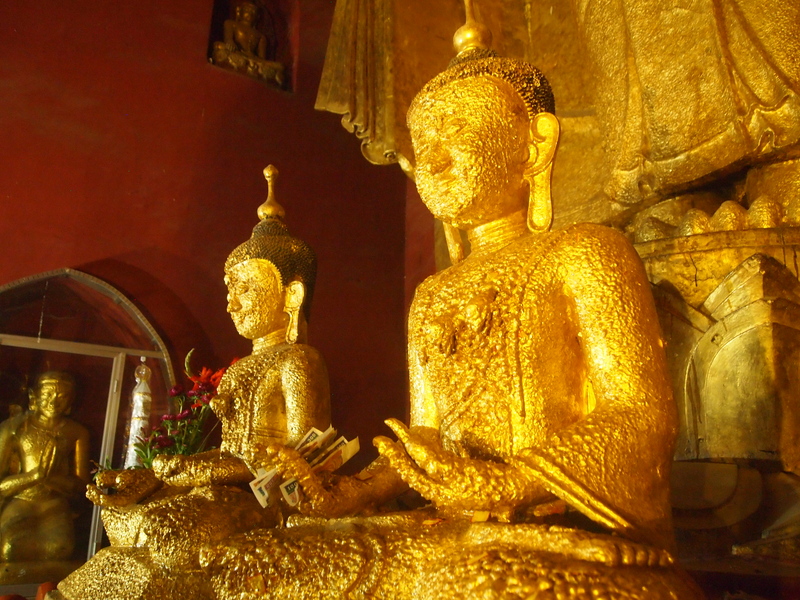 It’s a cave pagoda with a gold finial and a gold image of Buddha. 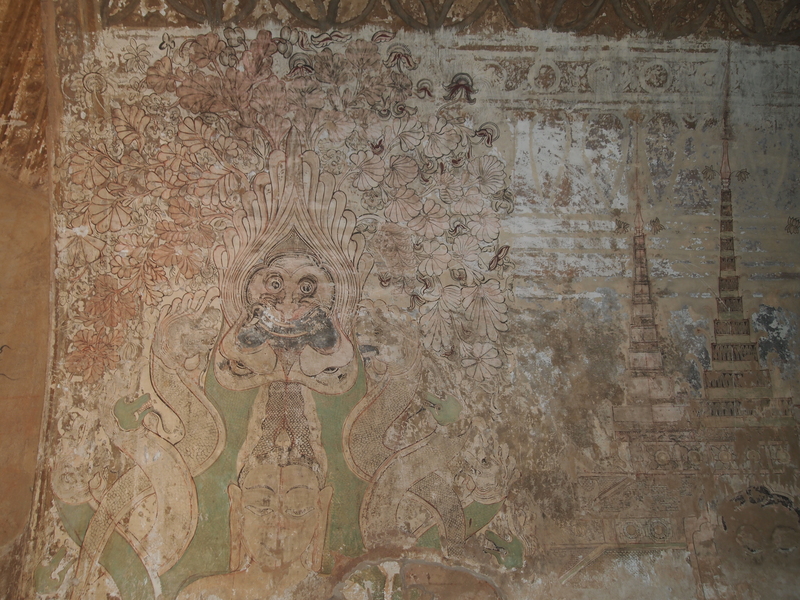 Inside, it’s very dark and gloomy, and there are richly colored murals painted on the walls that are thought to date to the time of the original construction. 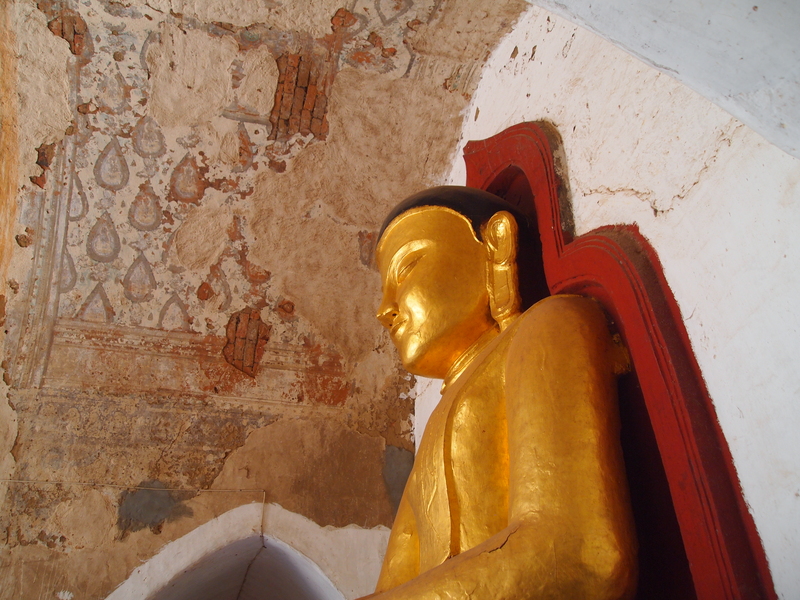 When I go inside, a man holding a lamp takes me around the temple and tells me all the stories of Buddha that are painted on the walls. 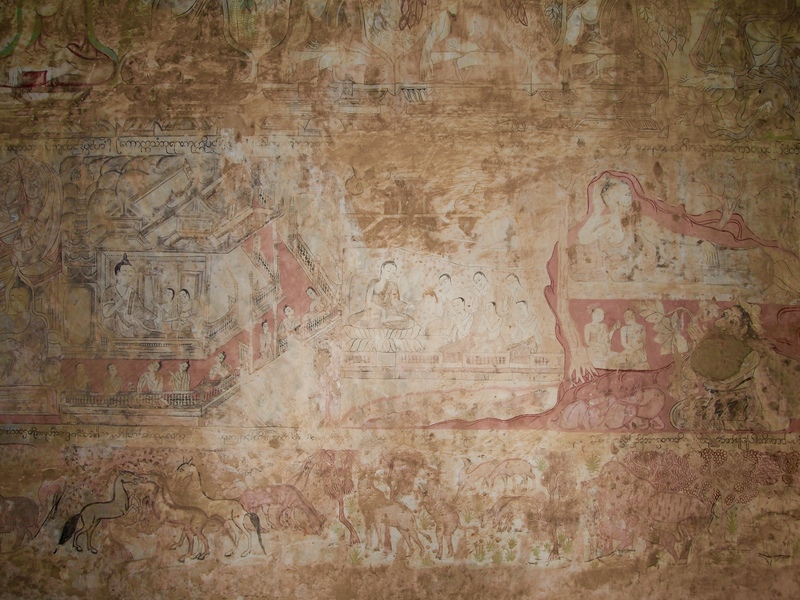 The stories are fascinating, as are the murals. 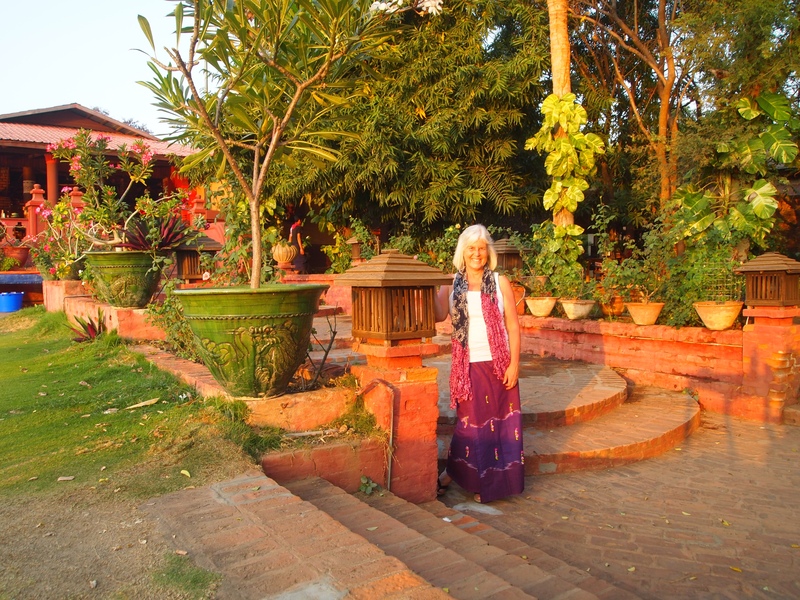 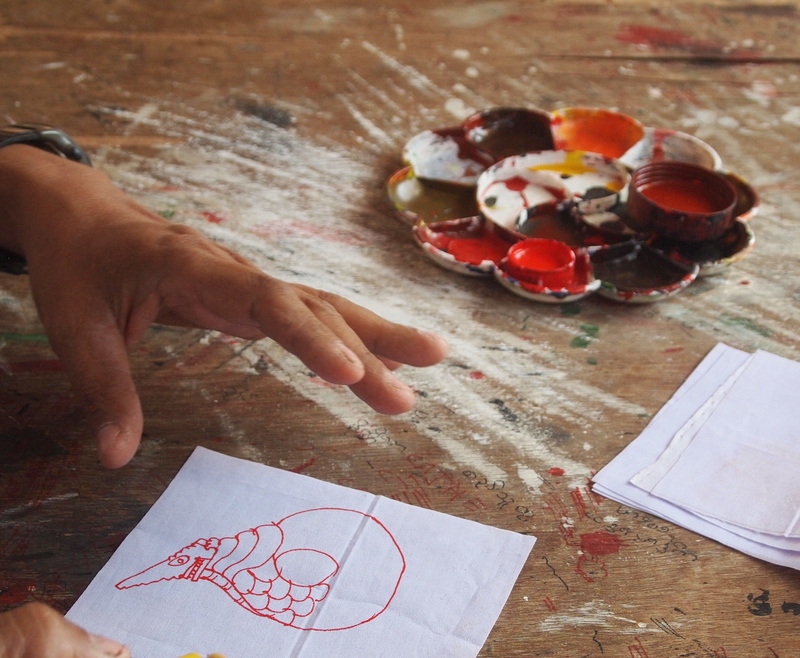 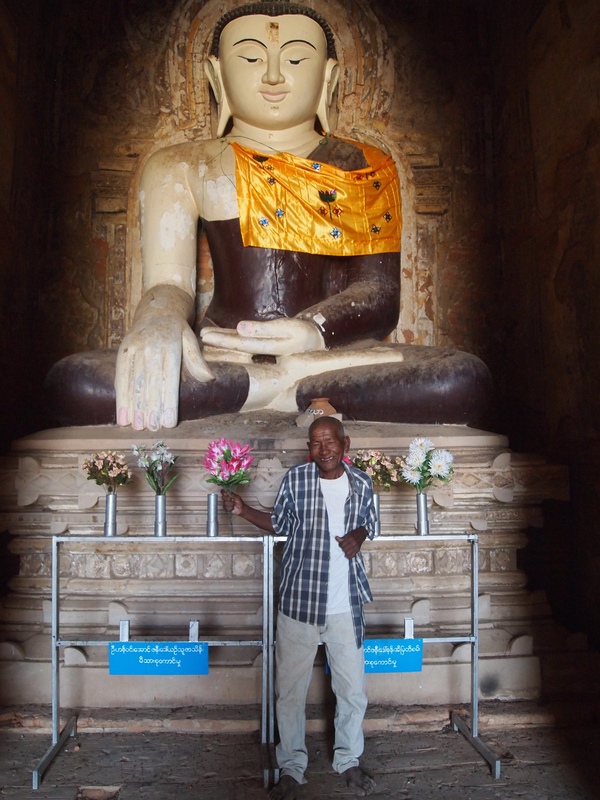 The man who told me the stories of the paintings in Gubyauk Gyi accompanies me next door to Myazedi, or the Emerald Stupa. 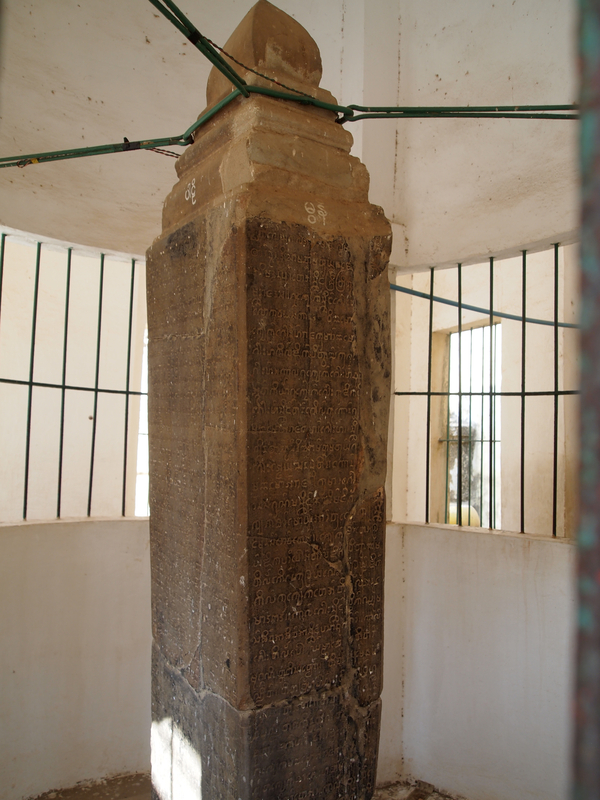 On a four-sided pillar in a cage between Gubyauk Gyi and Myazedi is the Myazedi Inscription. 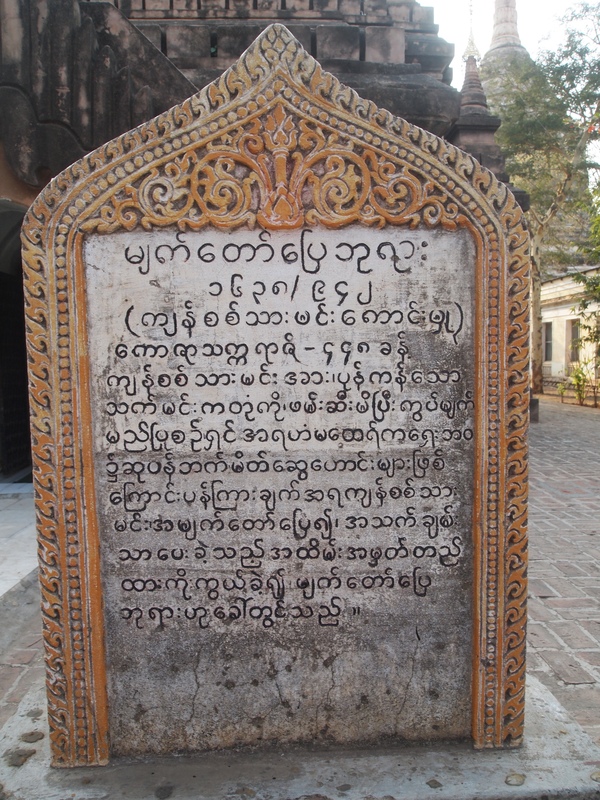 Inscribed in 1113, it is the oldest surviving stone inscription of the Burmese. 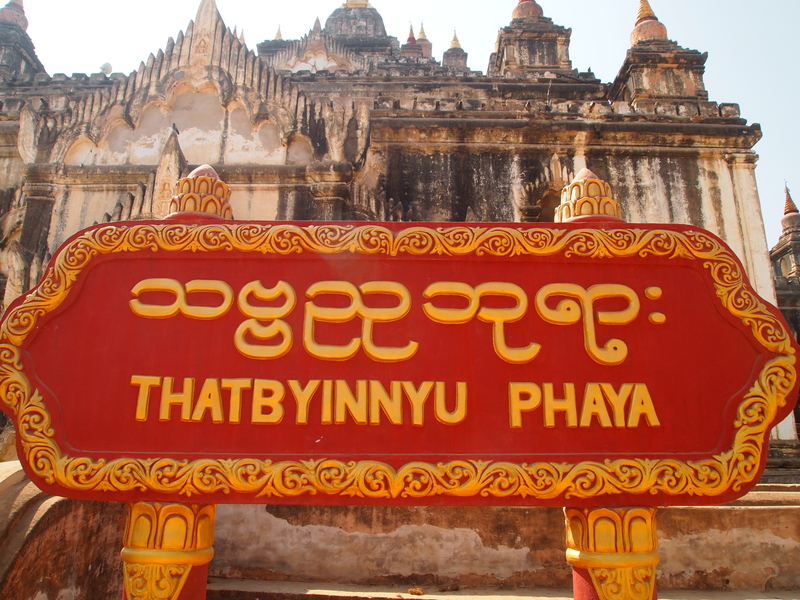 The inscriptions were made in four languages: Burmese, Pyu, Mon, and Pali; they all tell the story of Prince Yazakumar and King Kyansittha. 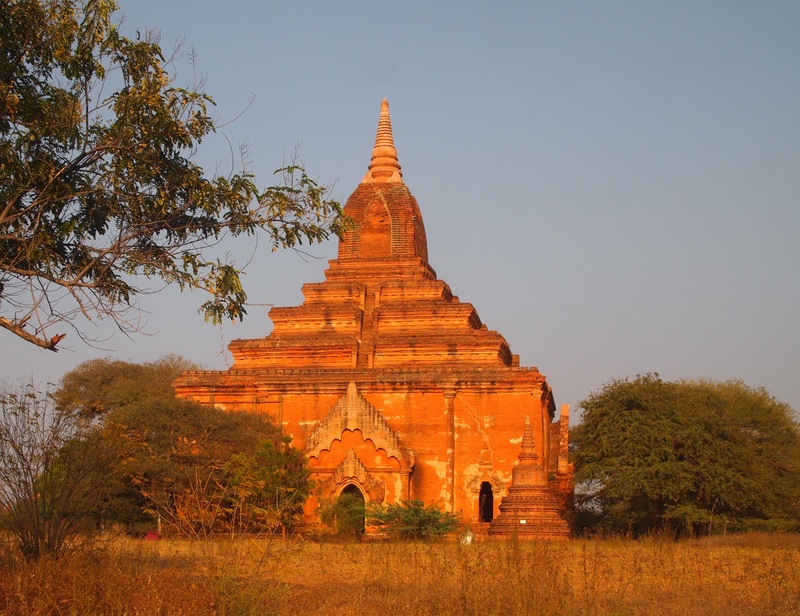 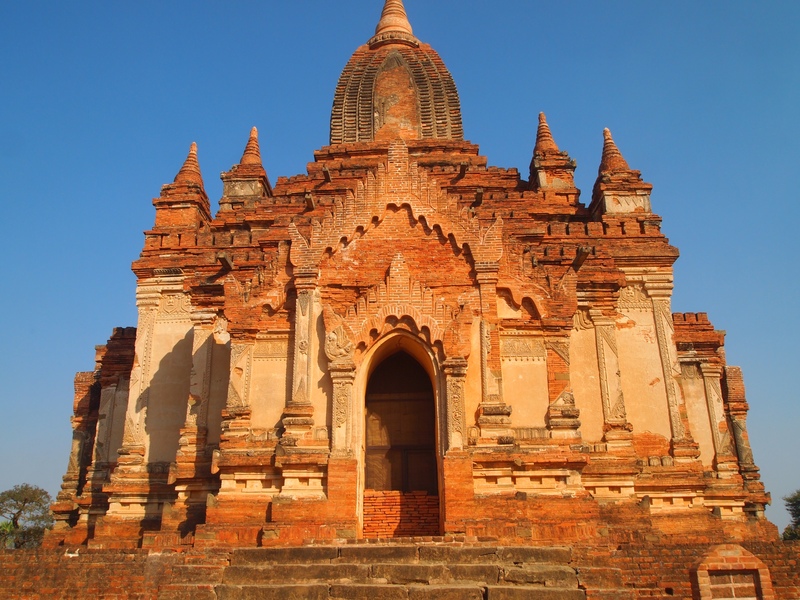 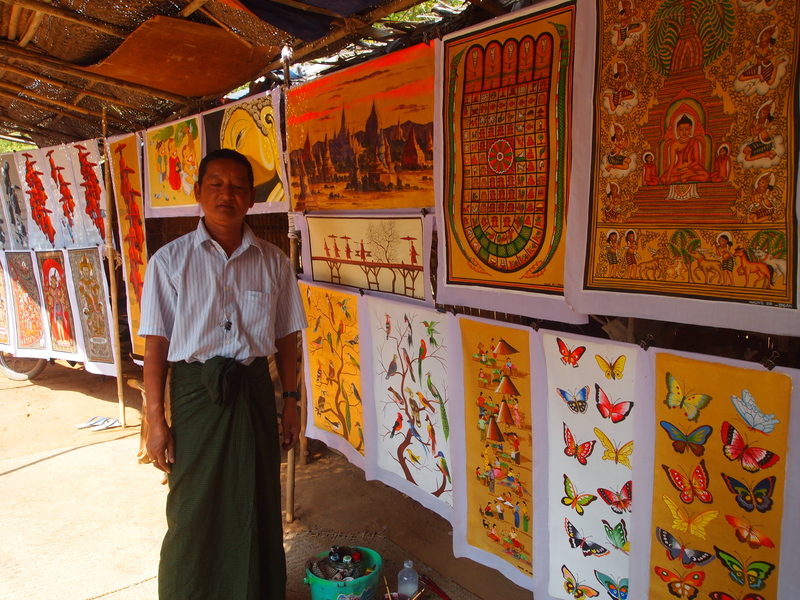 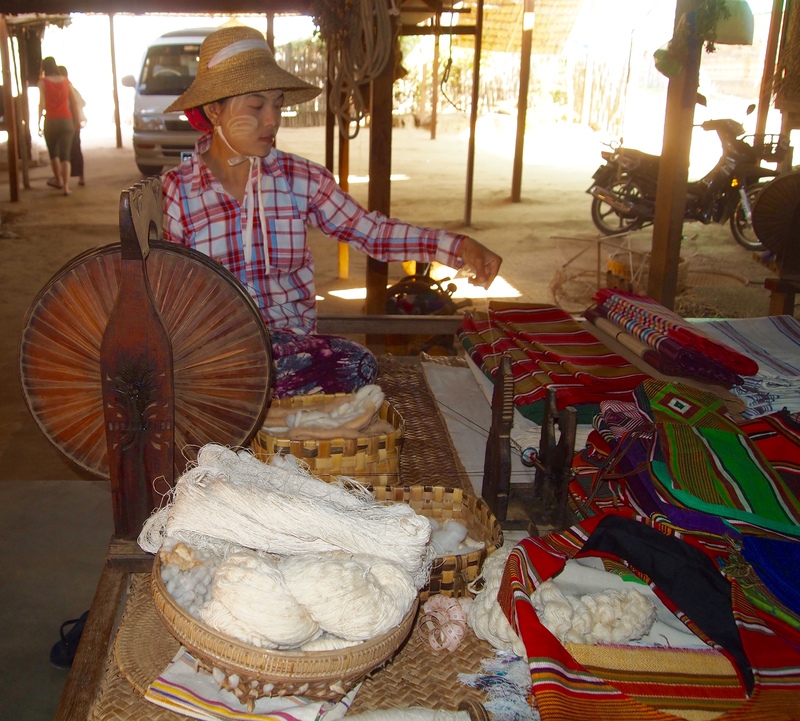 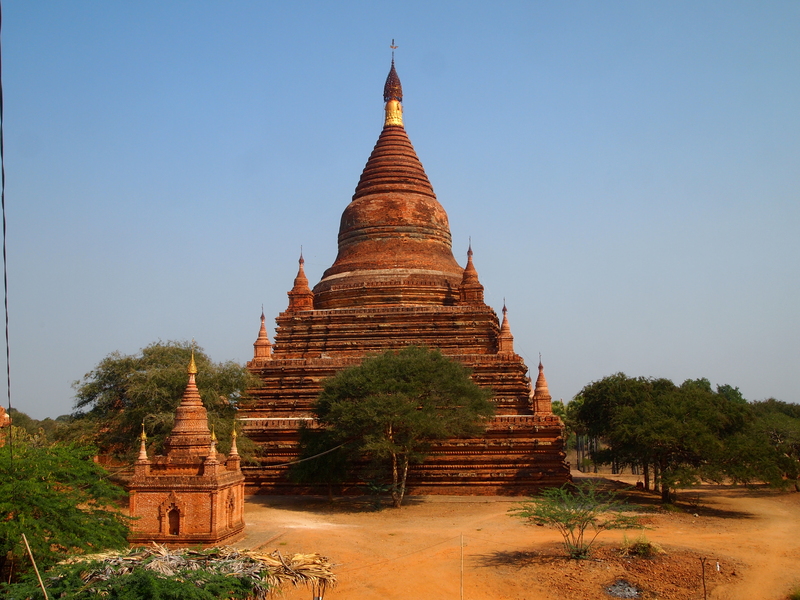 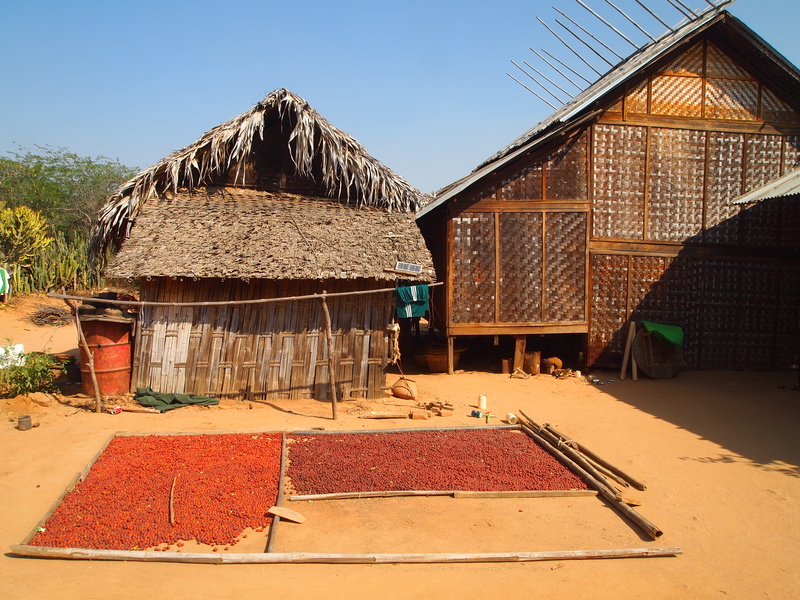 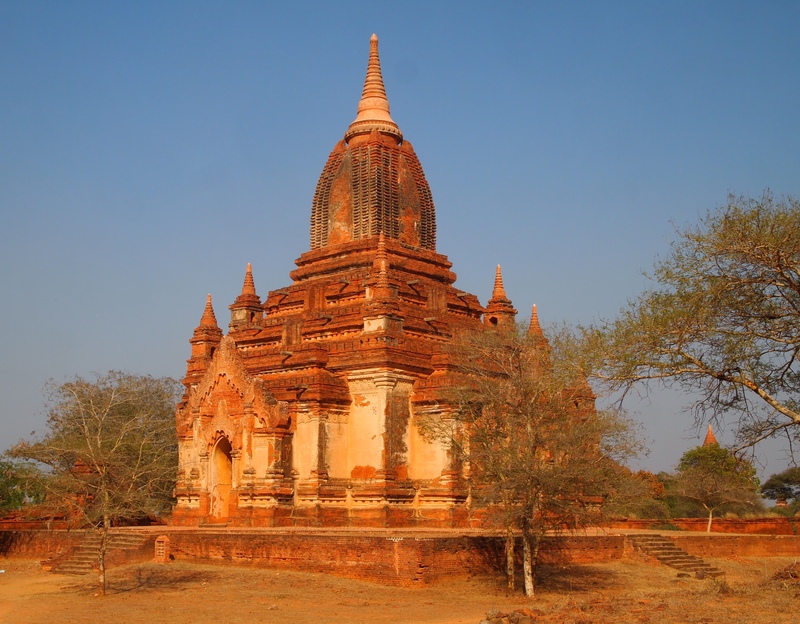 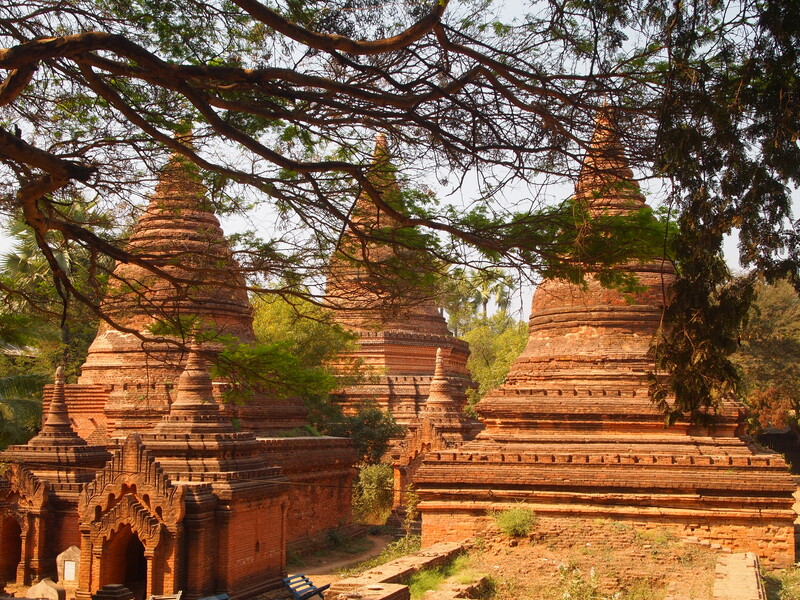 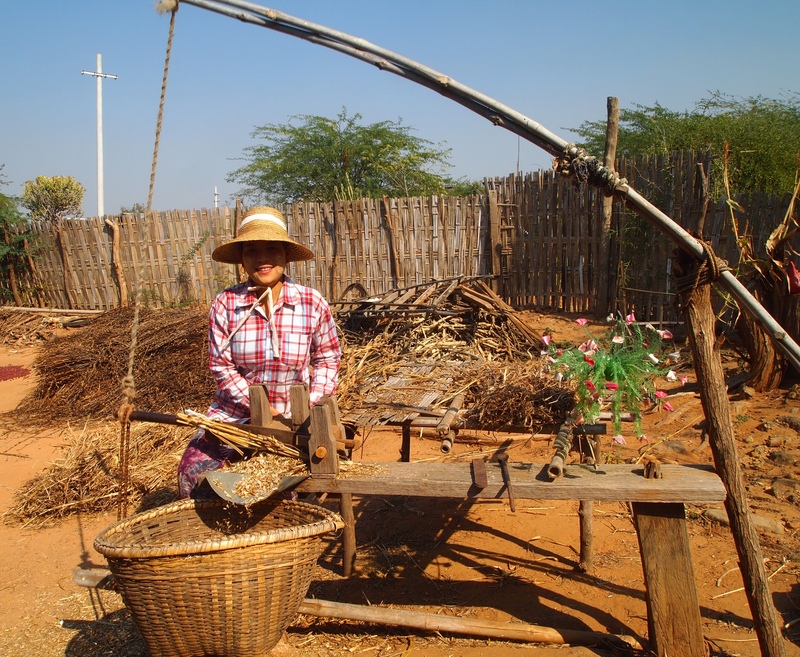 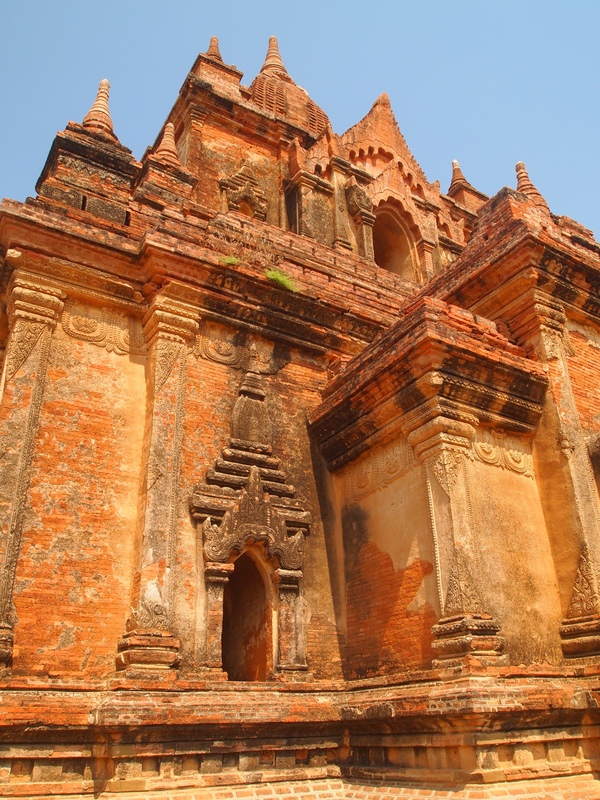 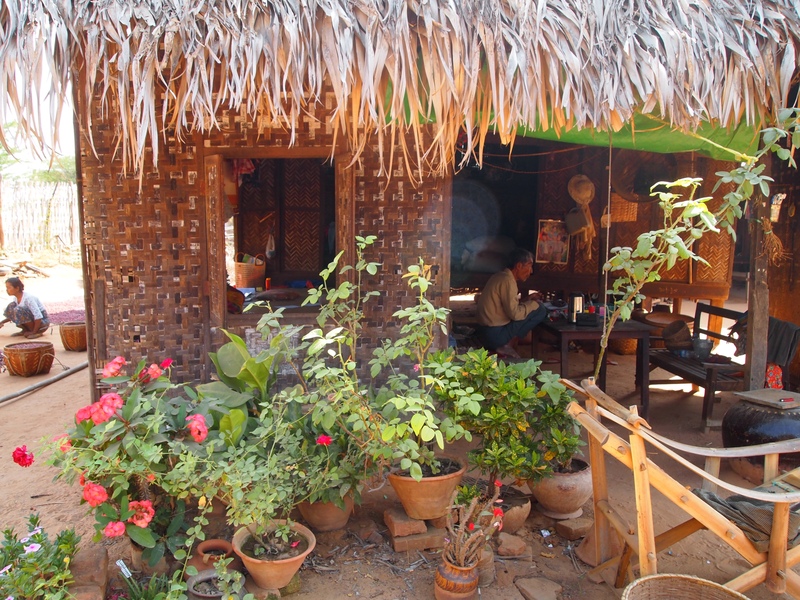 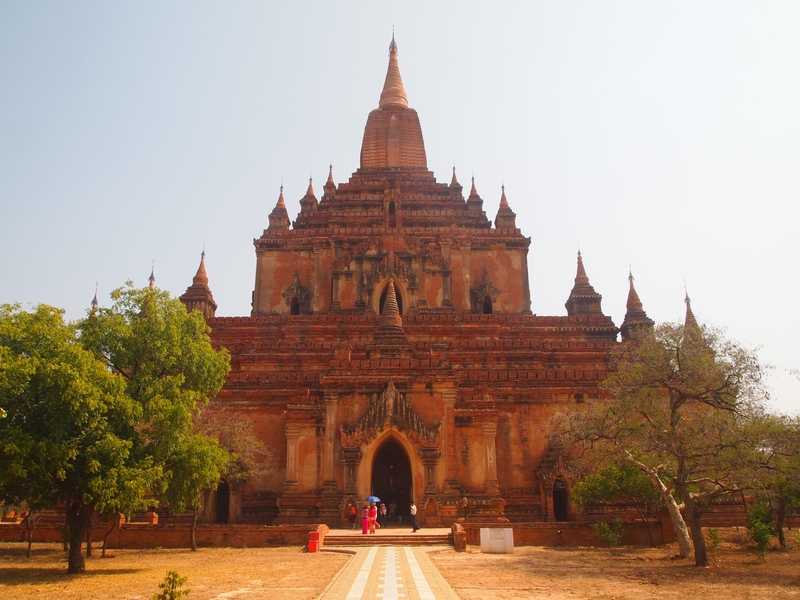 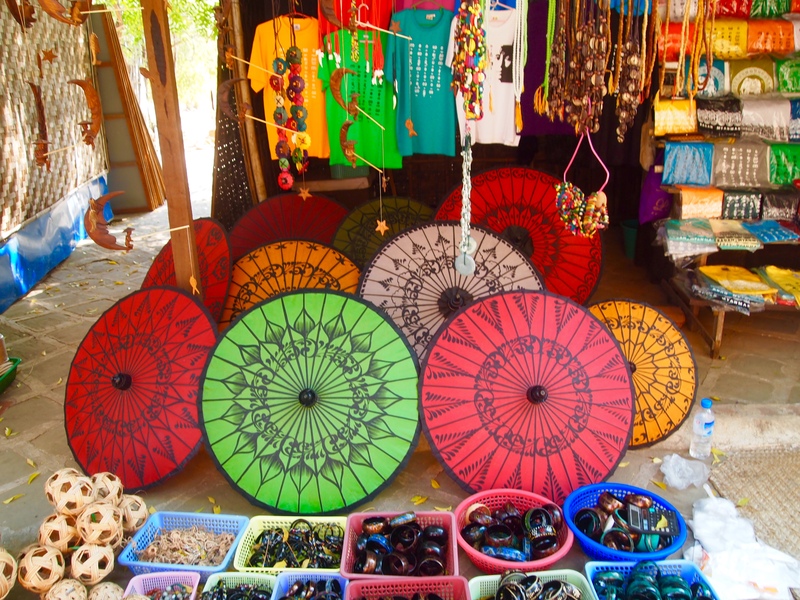 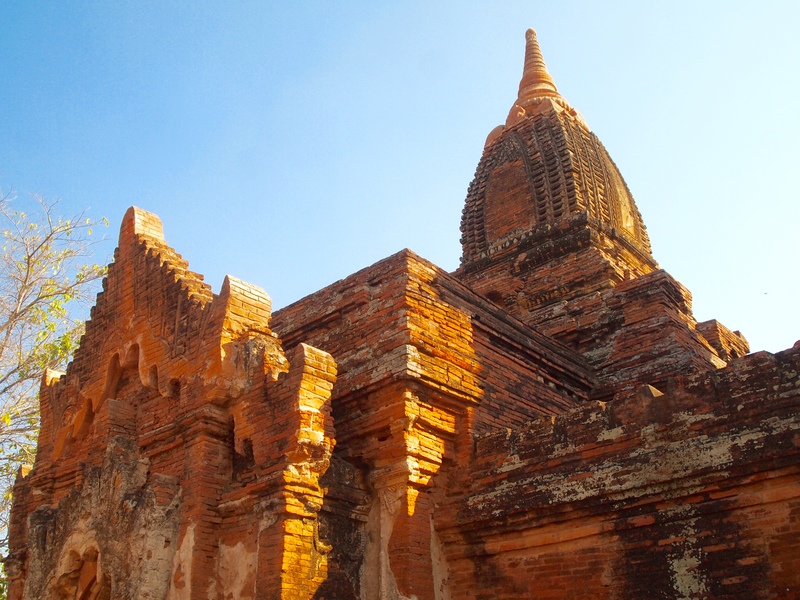 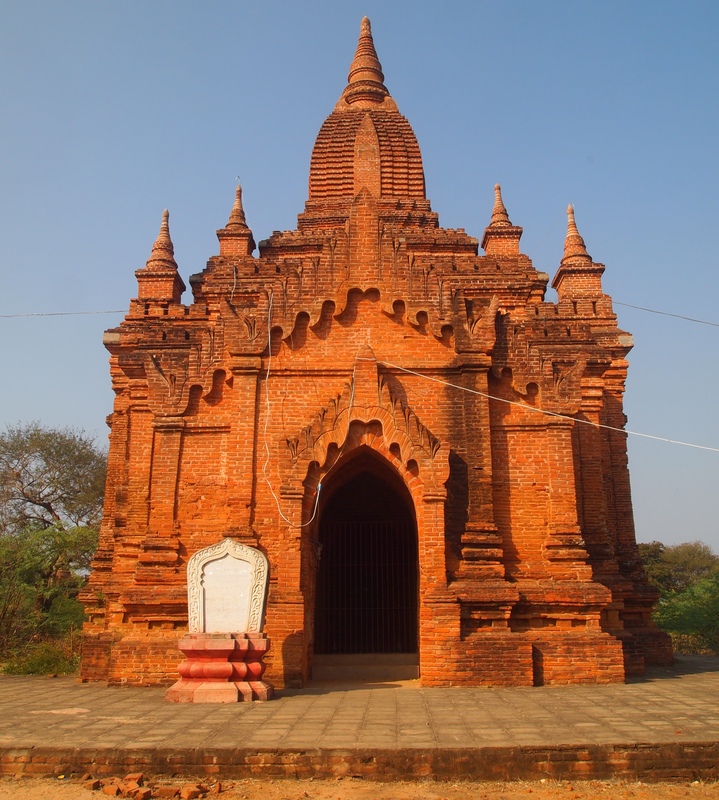 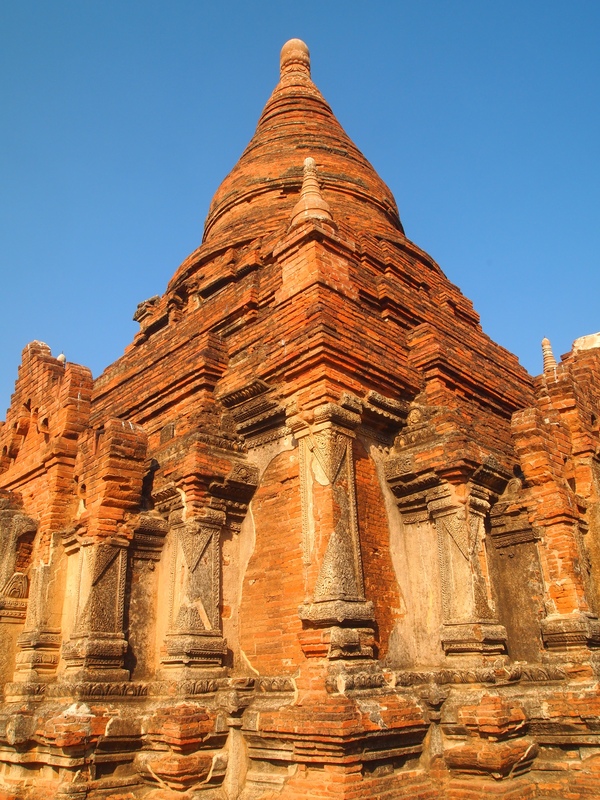 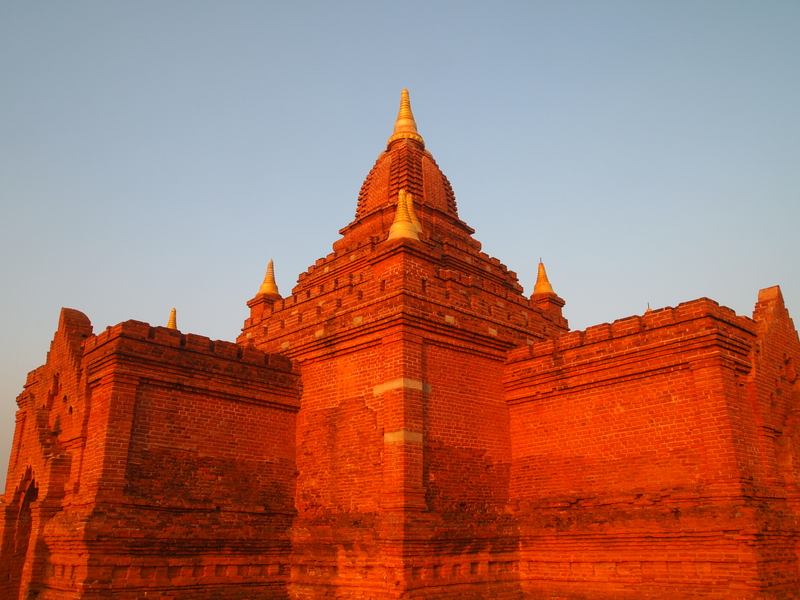 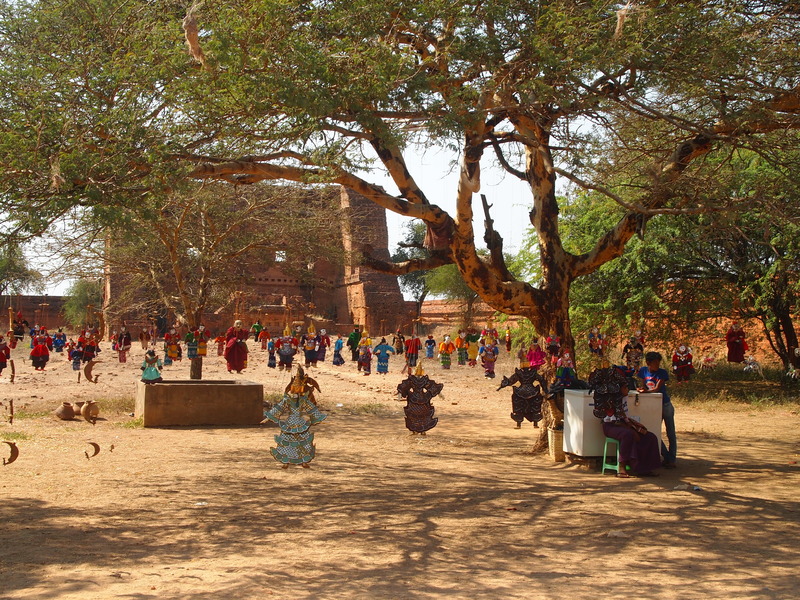 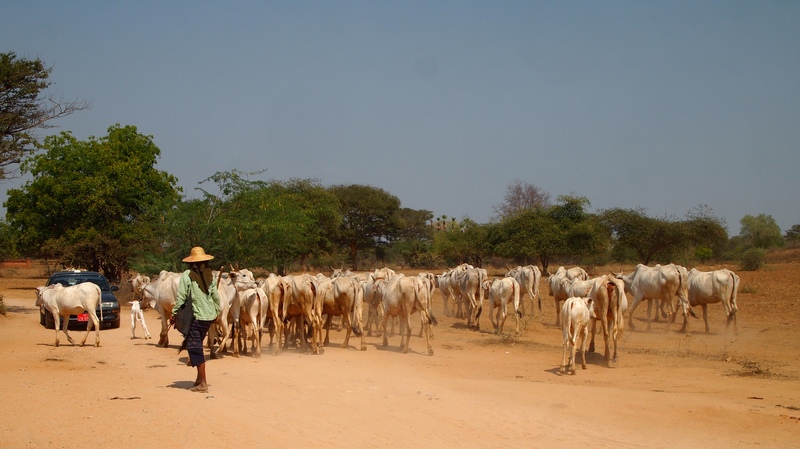 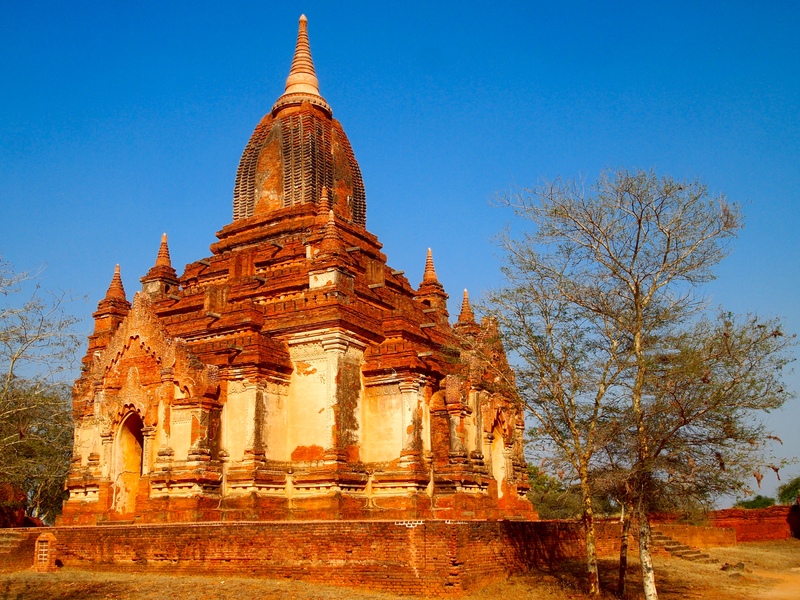 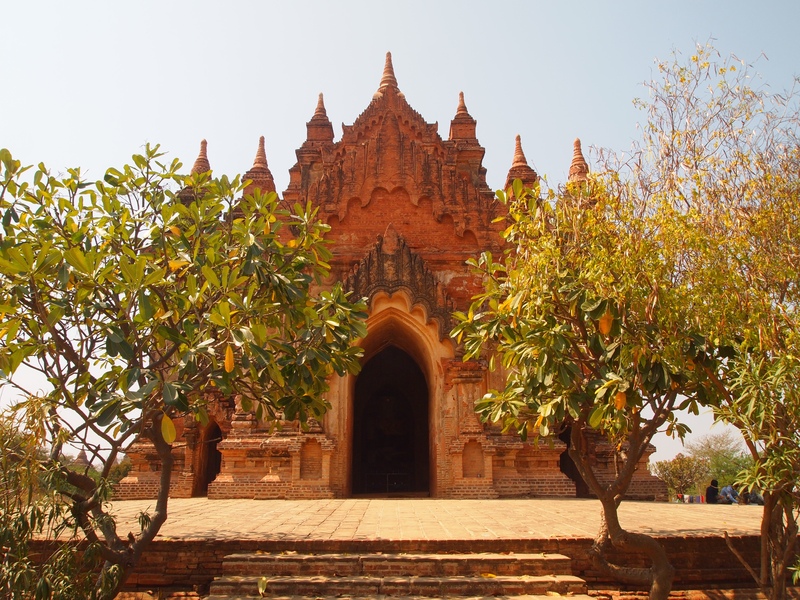 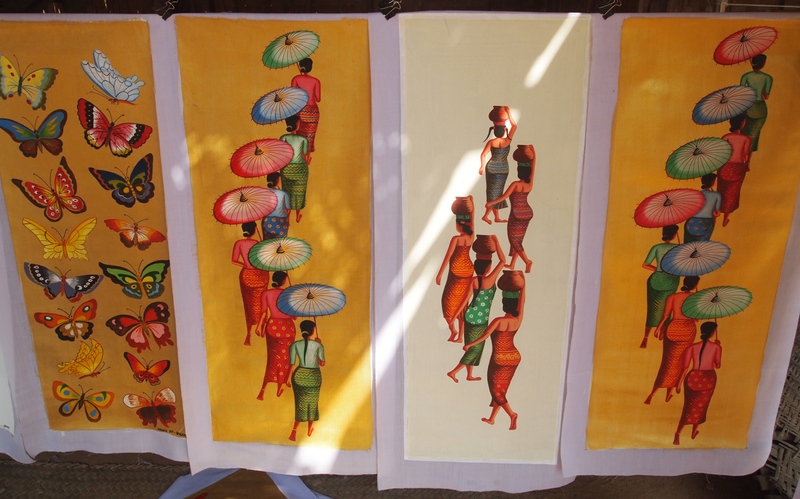 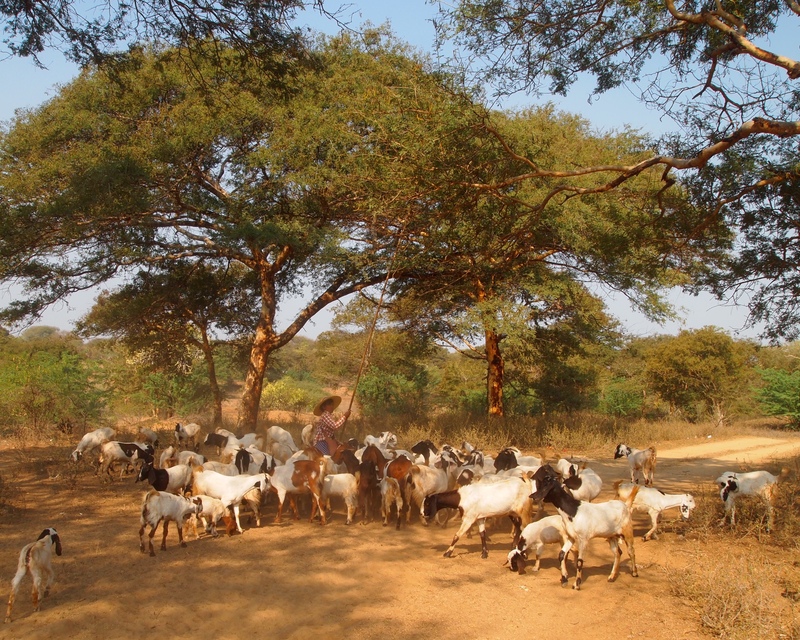 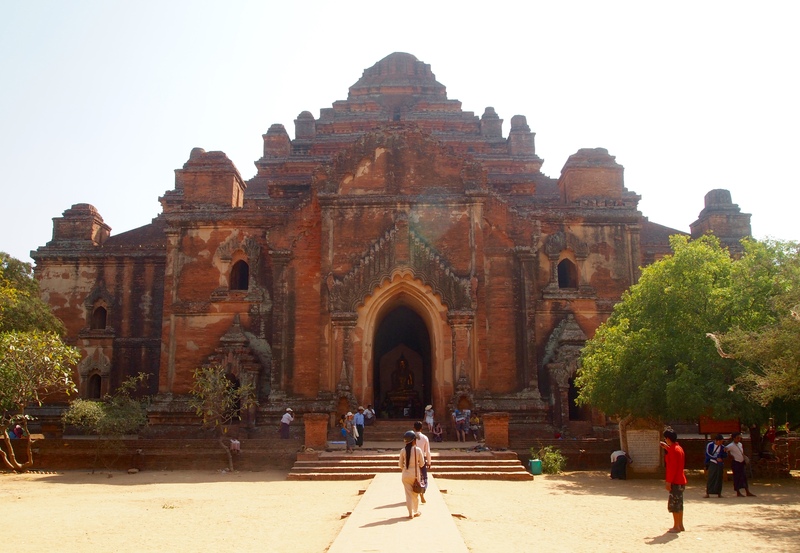 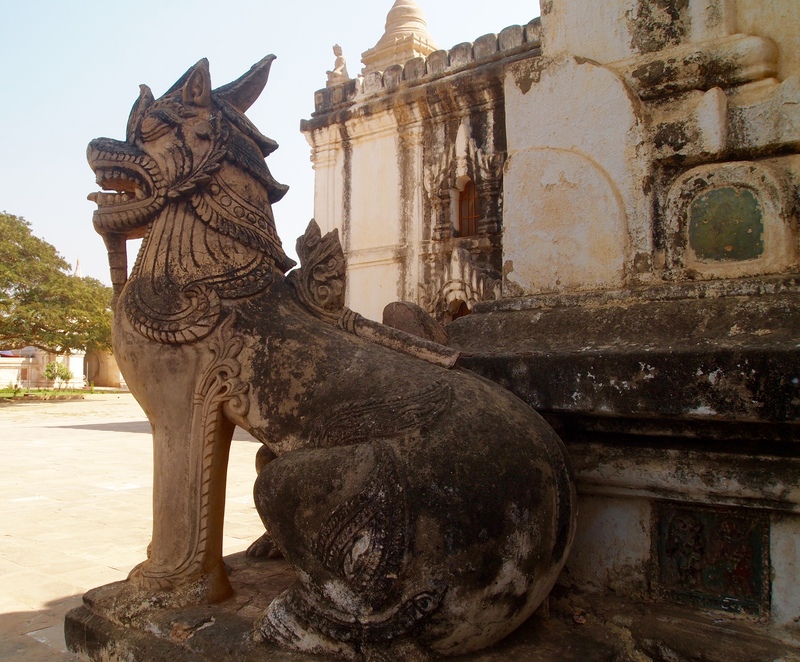 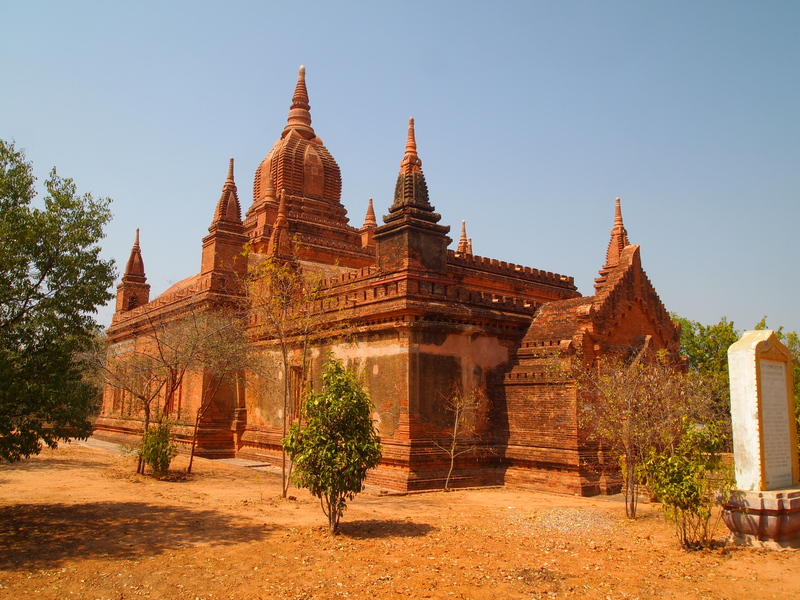 It is linguistically and historically significant because it shows the Pyu cultural influence on Bagan. 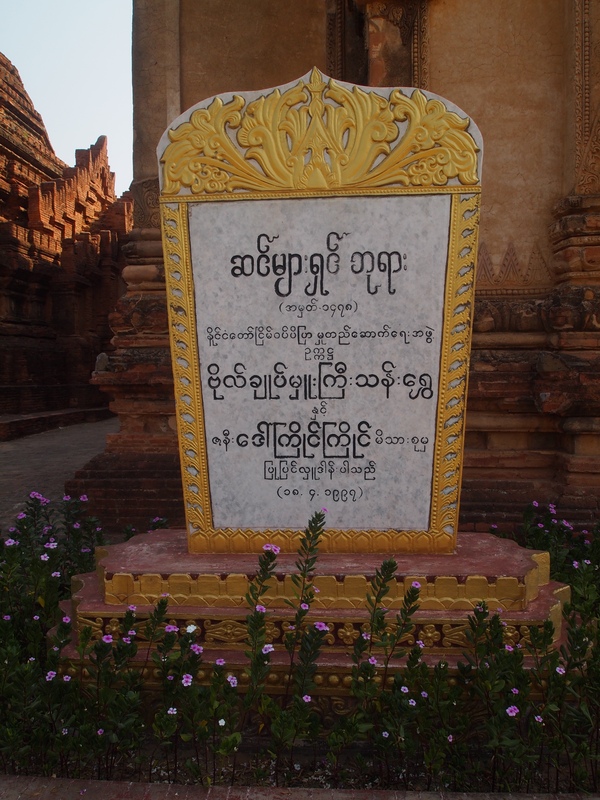 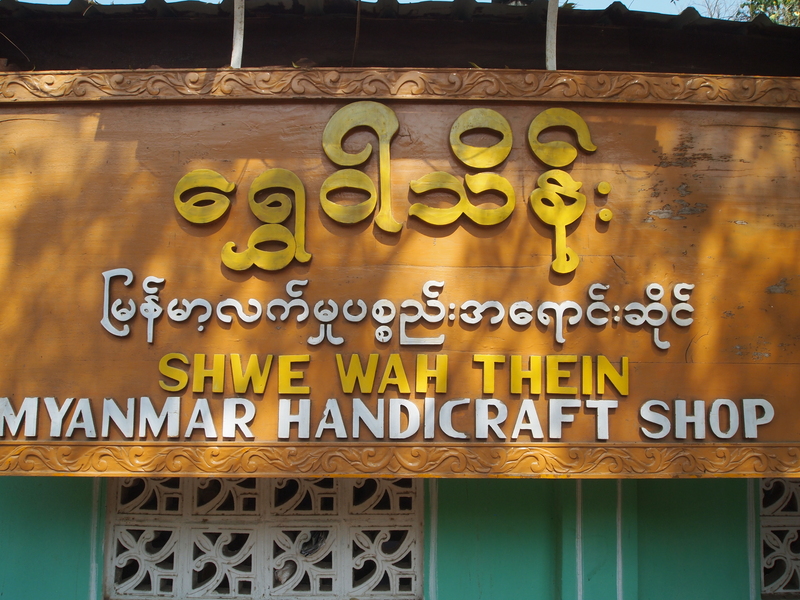 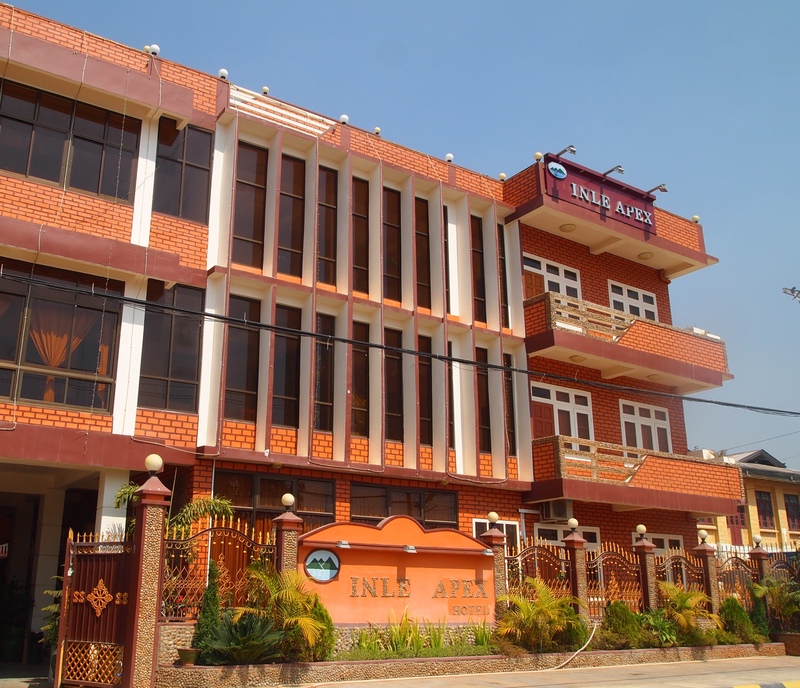 The Myazedi inscription serves as a kind of “Rosetta Stone,” allowing for the deciphering of the written Pyu language (Wikipedia: Myazedi Inscription and Lonely Planet Myanmar). 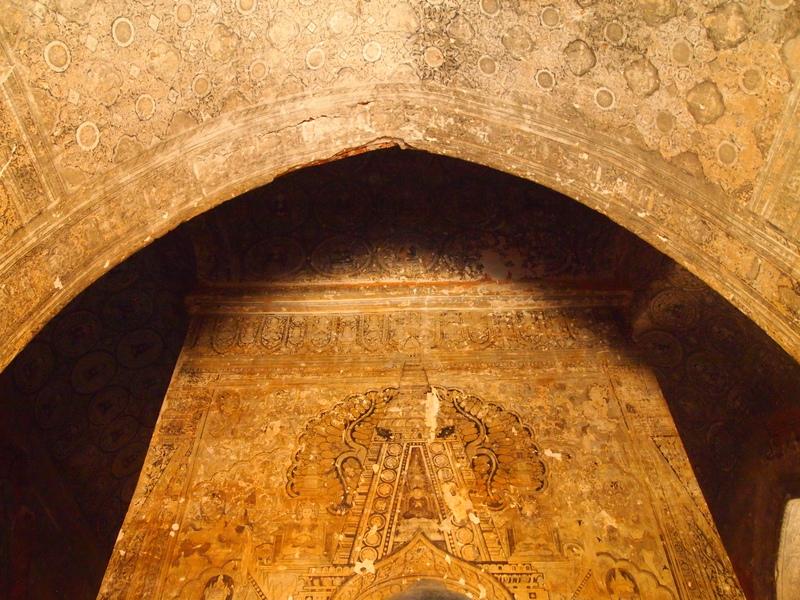 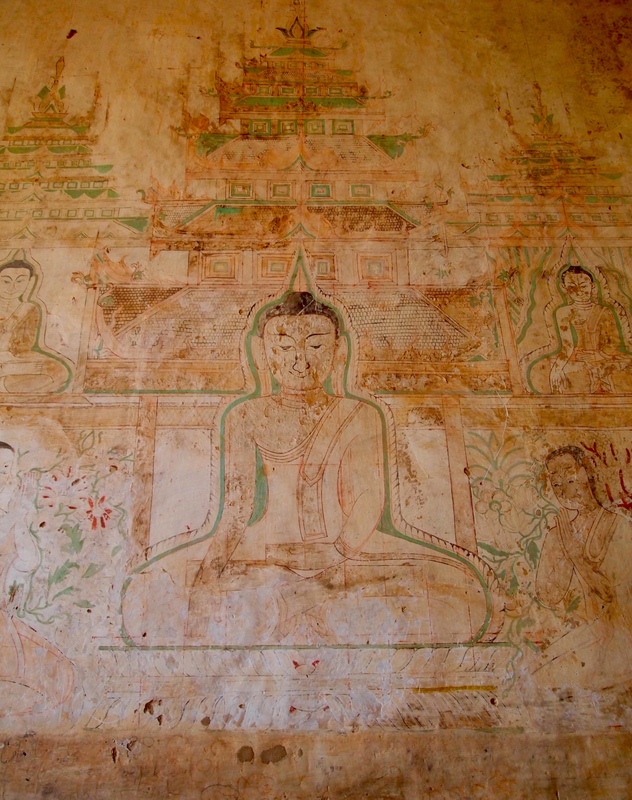 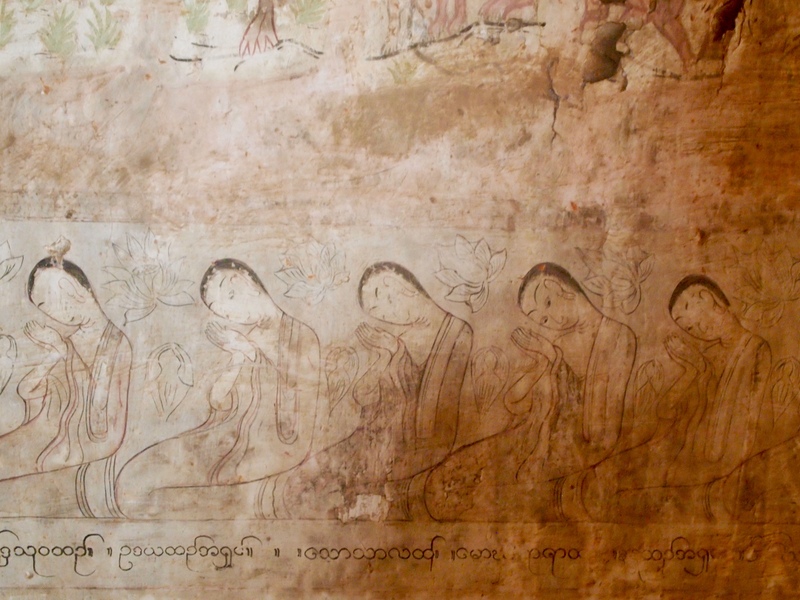 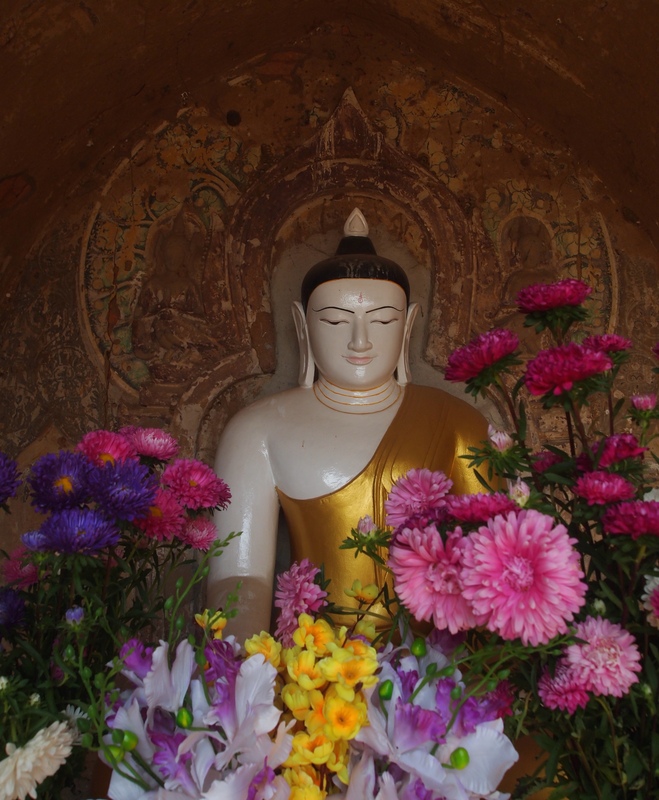 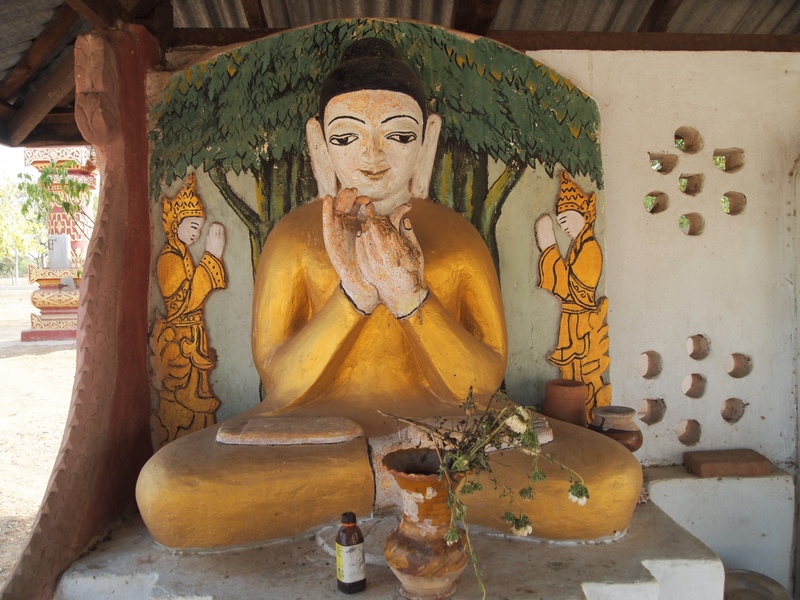 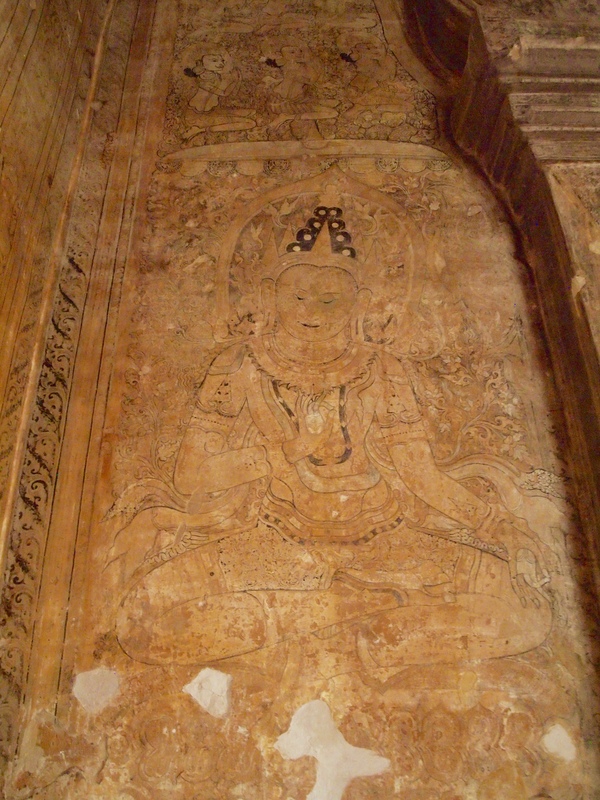 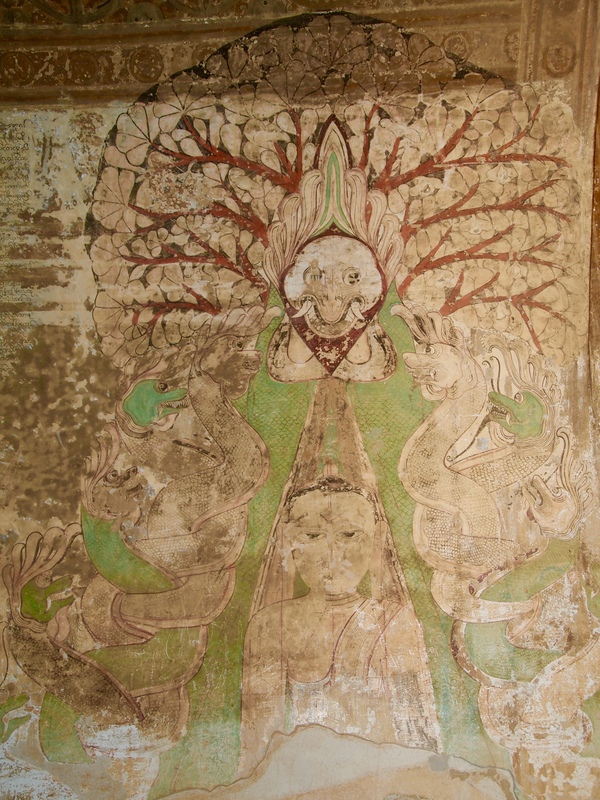 The man who has been explaining the murals’ and the Myazedi inscription’s significance shows me some Buddha images representing the seven days of the week. 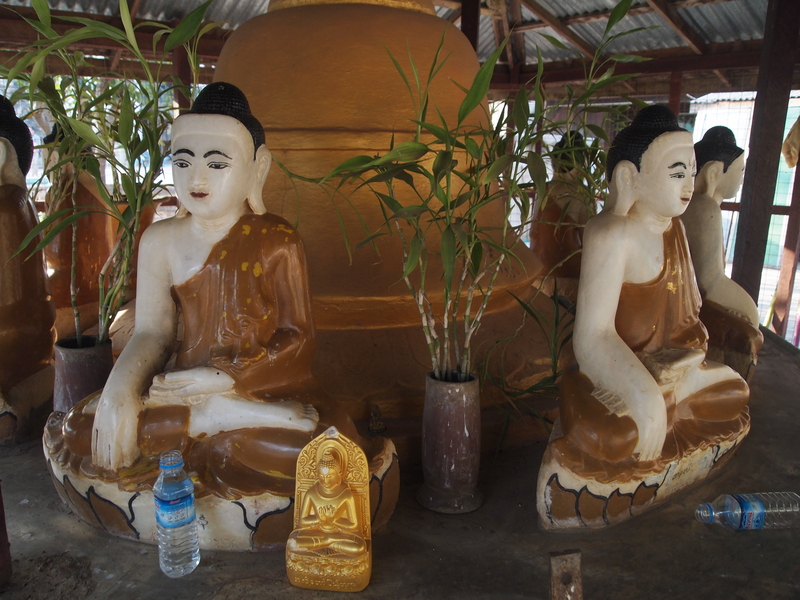 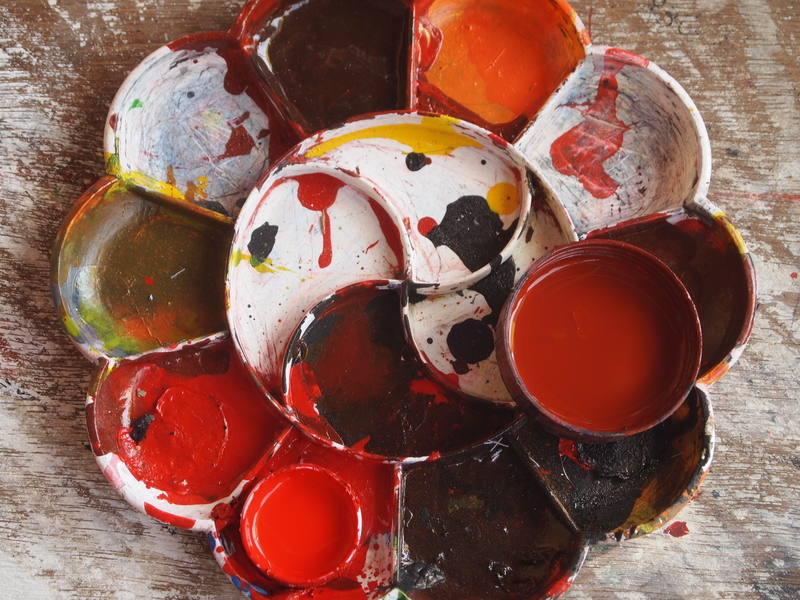 He tells me I should find the one representing my birthday and pour water over it, saying a prayer or a wish. 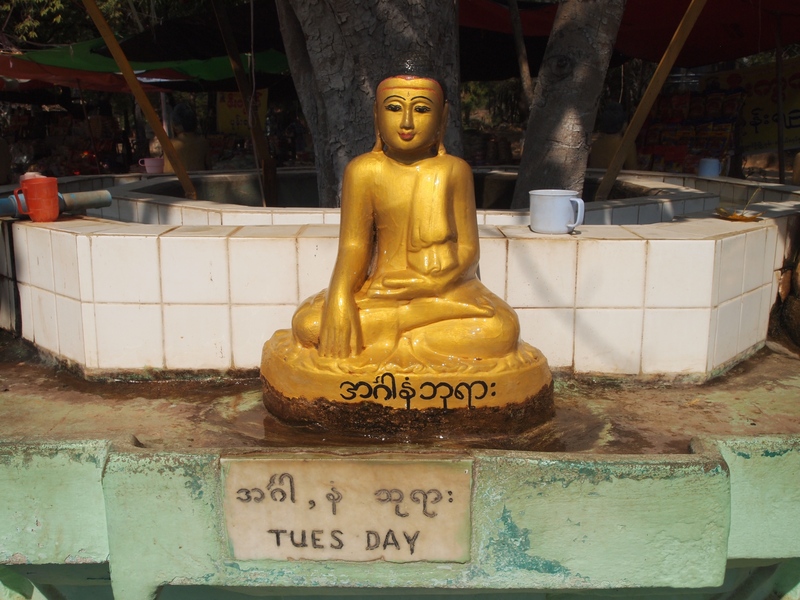 I pour water over the Tuesday Buddha. 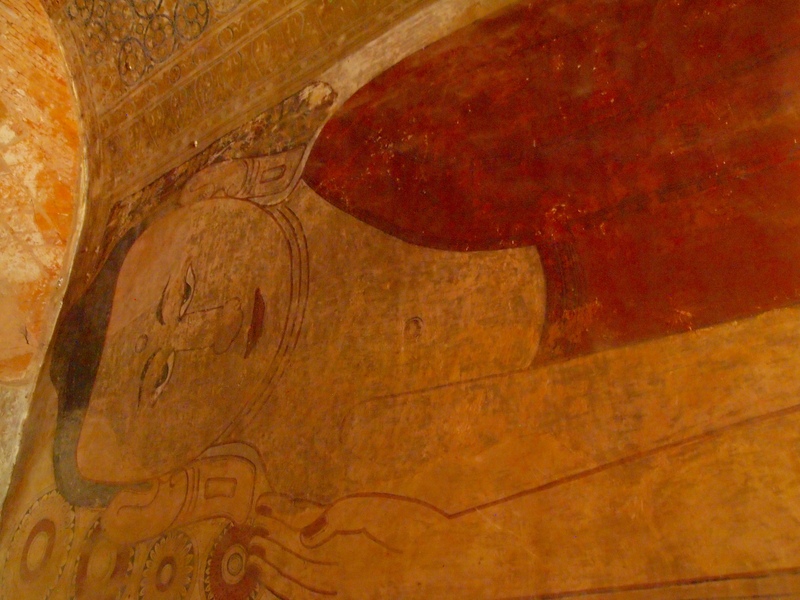 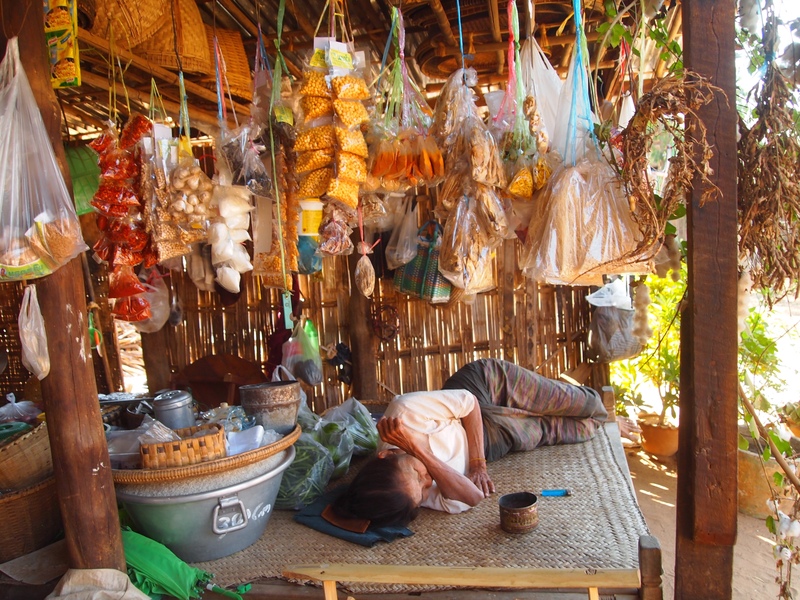 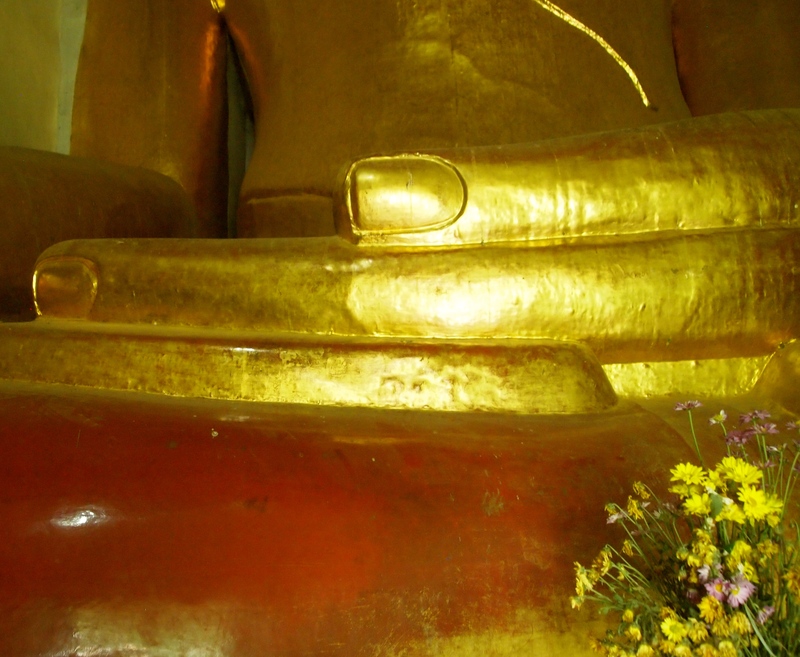 From what I’ve read about the seven Buddha images, the Tuesday image should be a reclining Buddha, but this one isn’t. 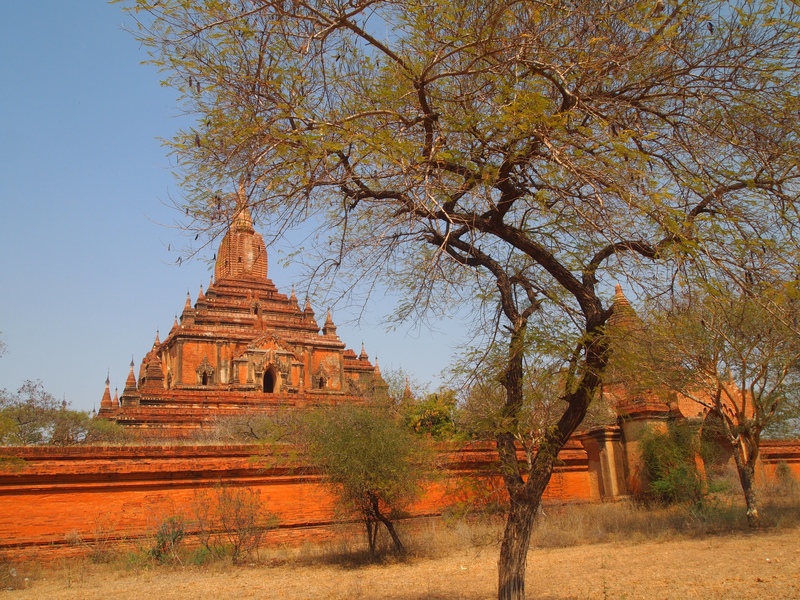 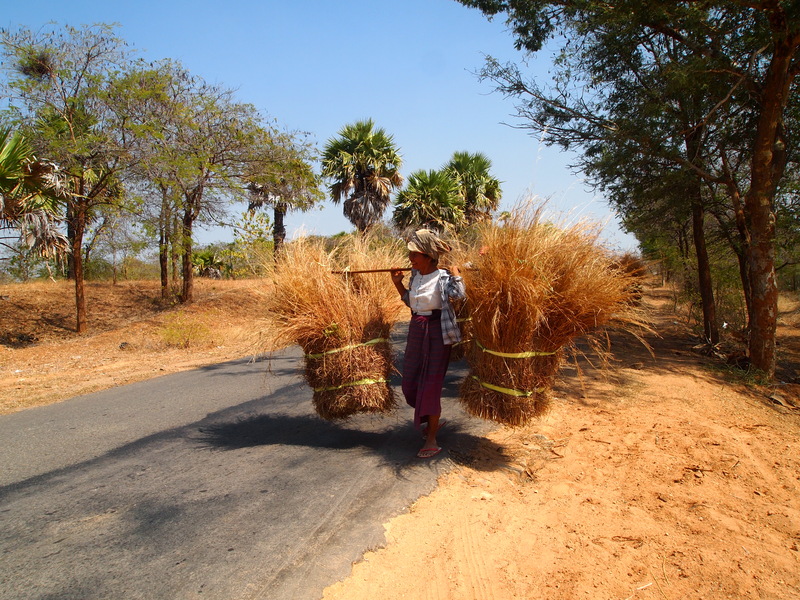 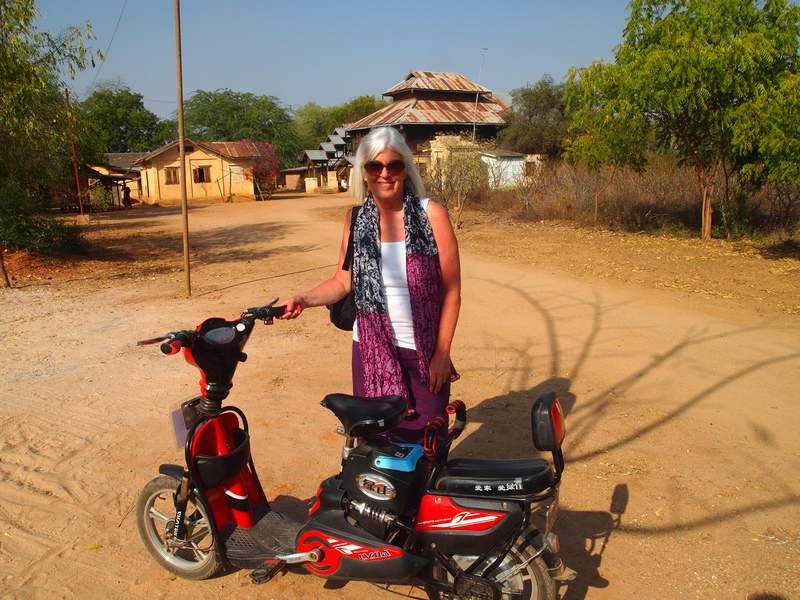 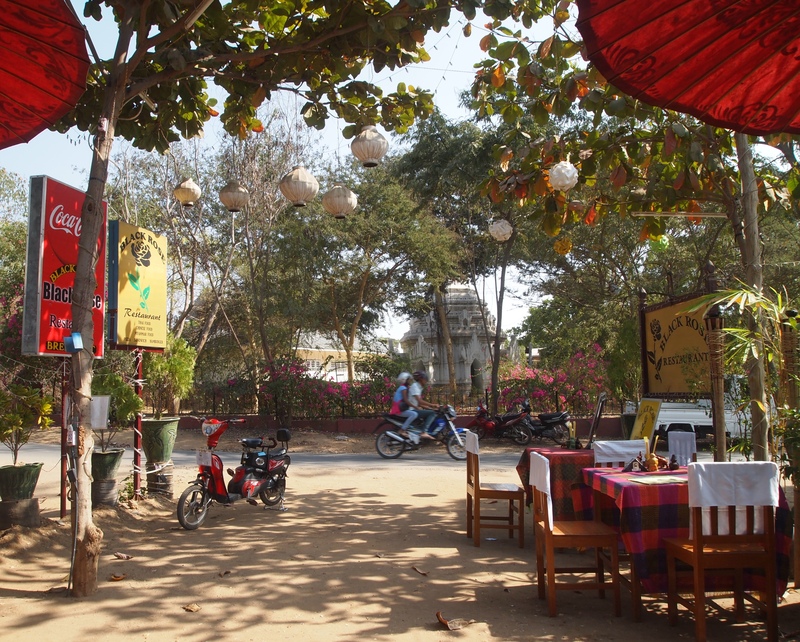 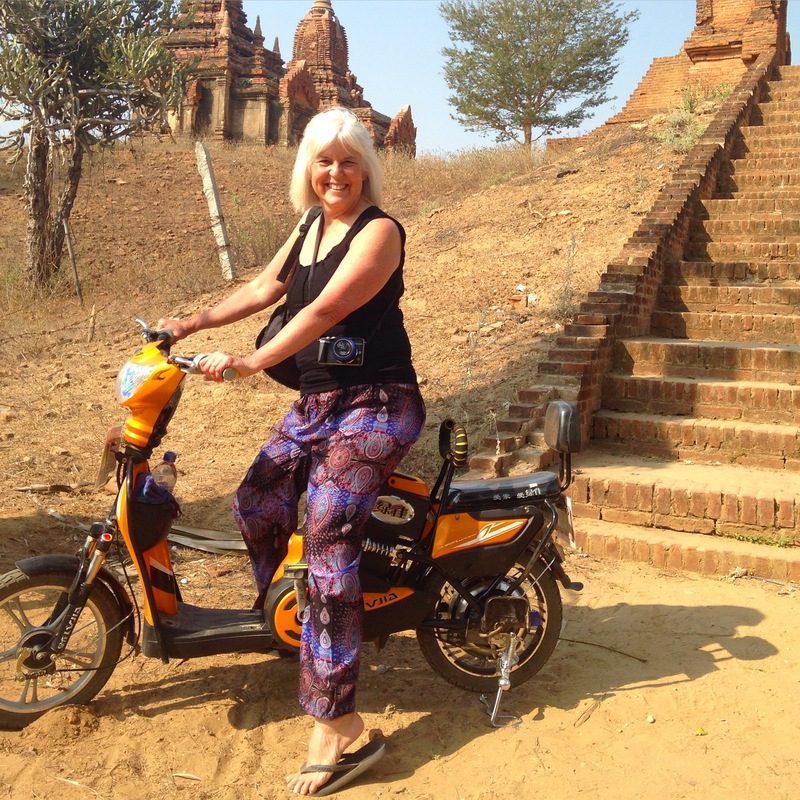 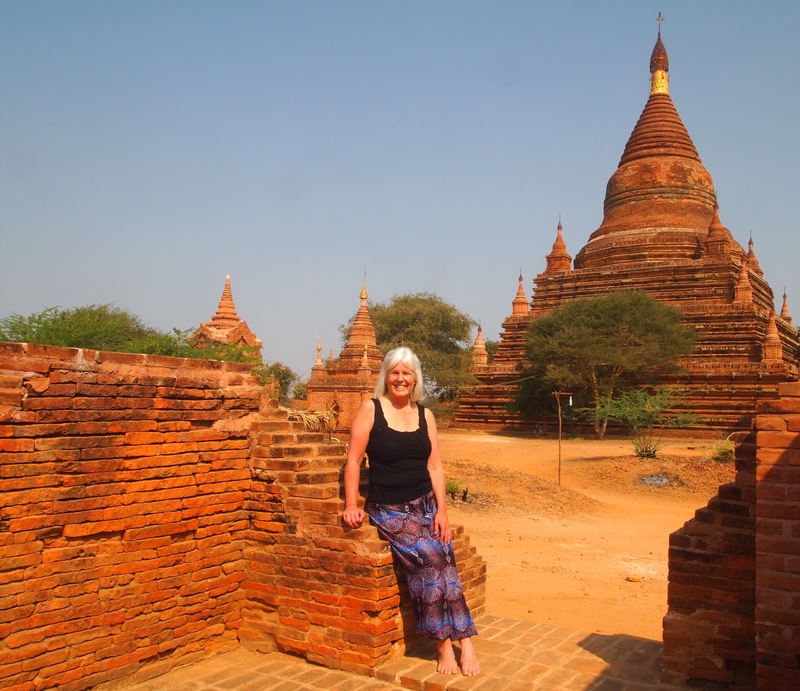 Now my driver takes me to Old Bagan to explore more of Bagan’s thousands of temples.